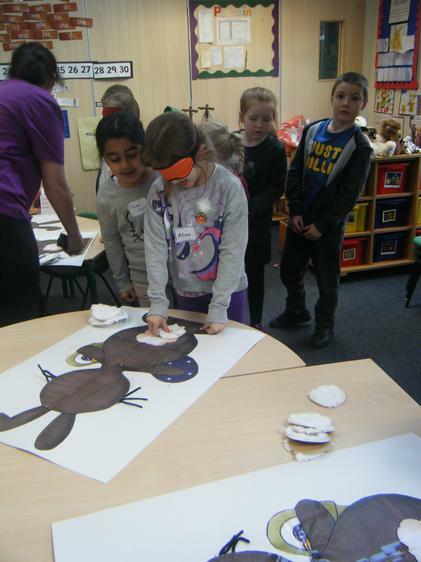 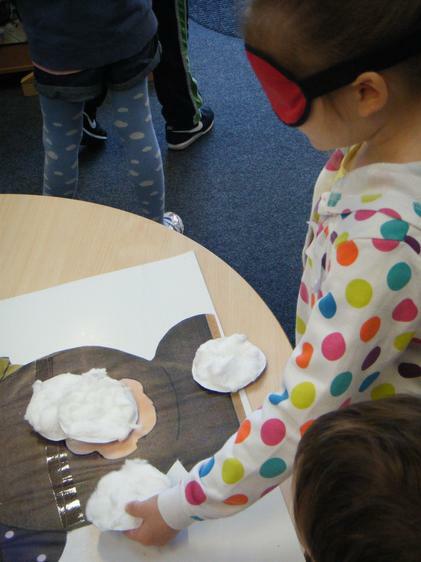 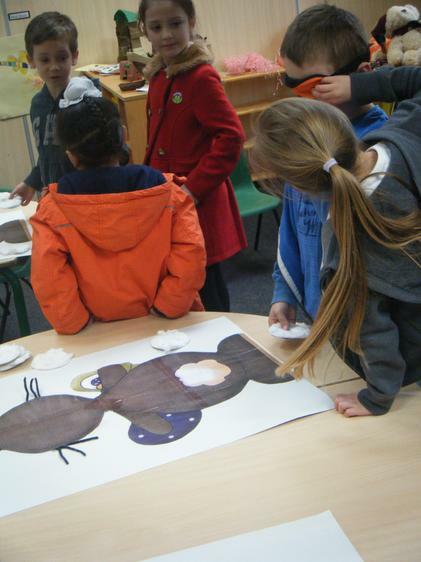 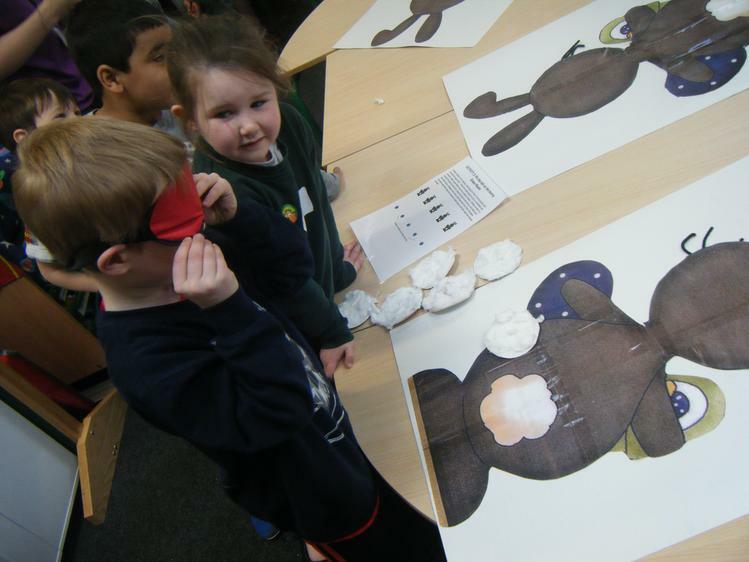 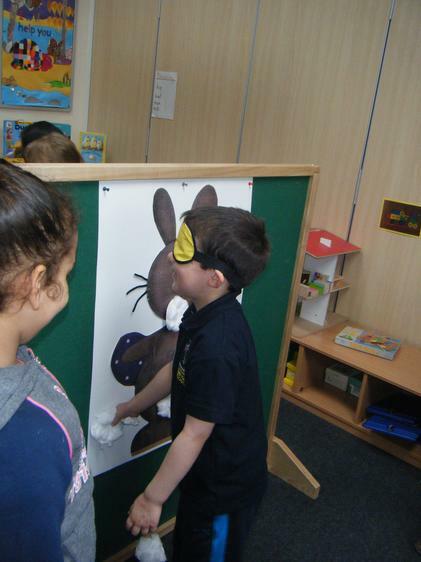 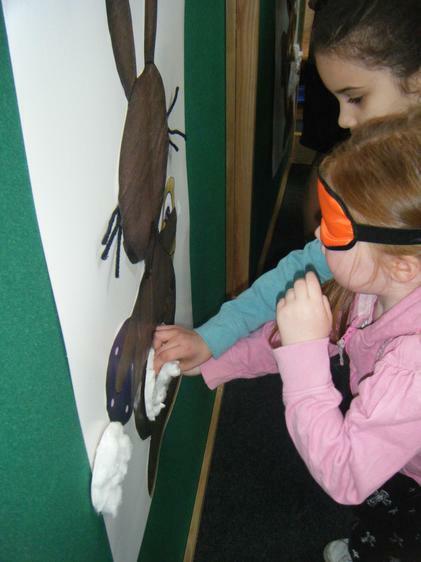 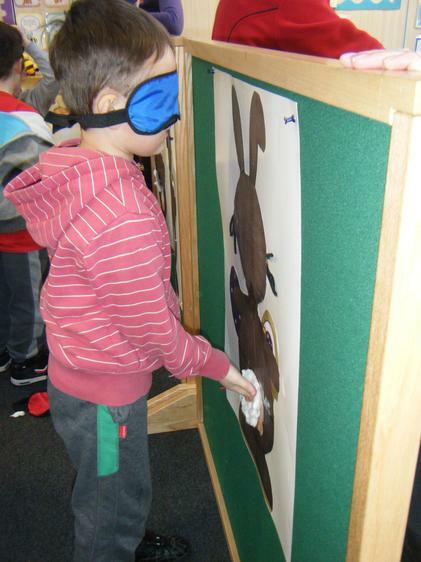 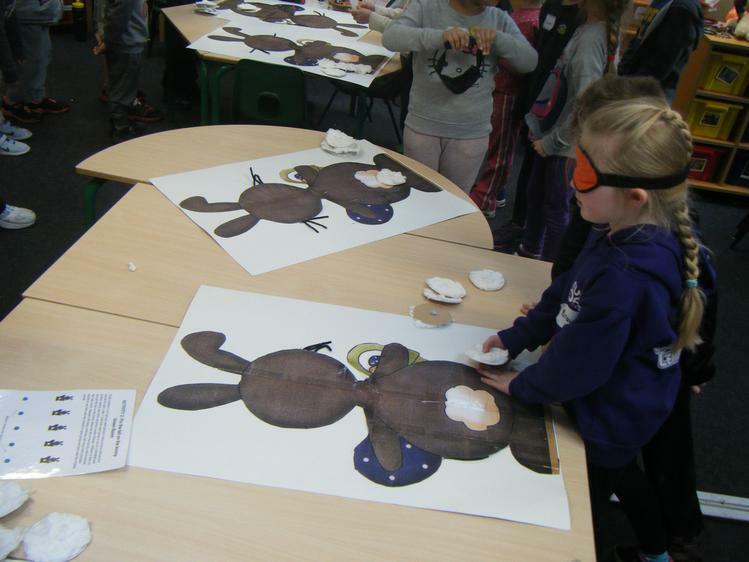 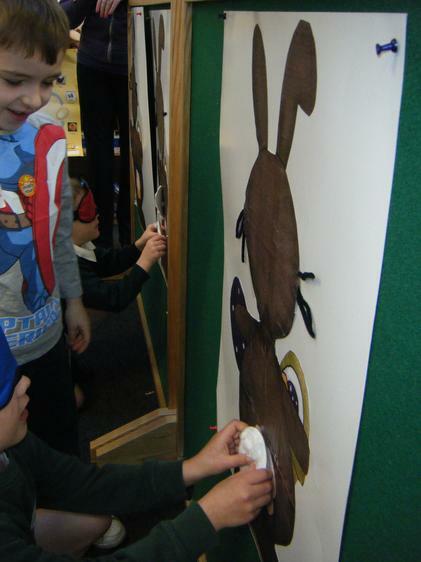 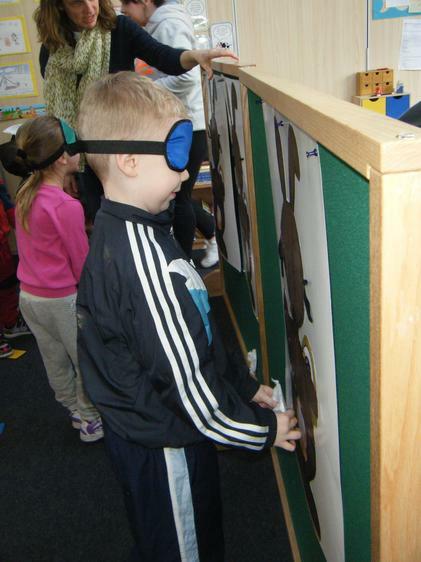 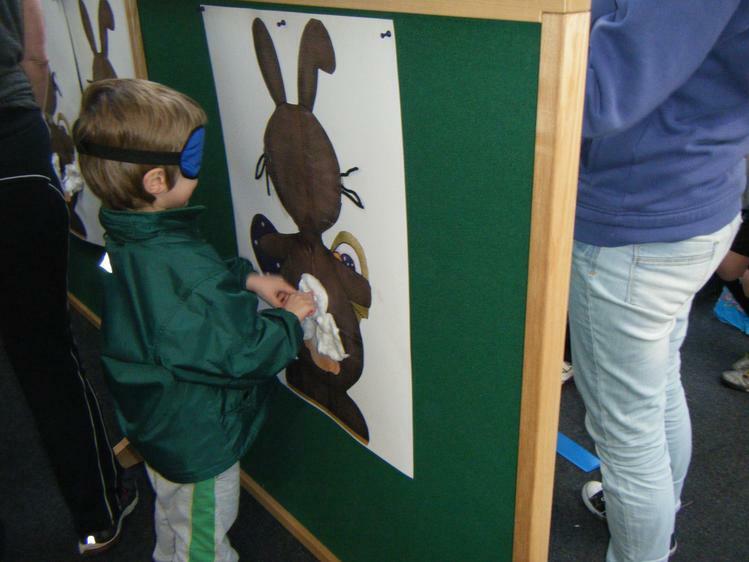 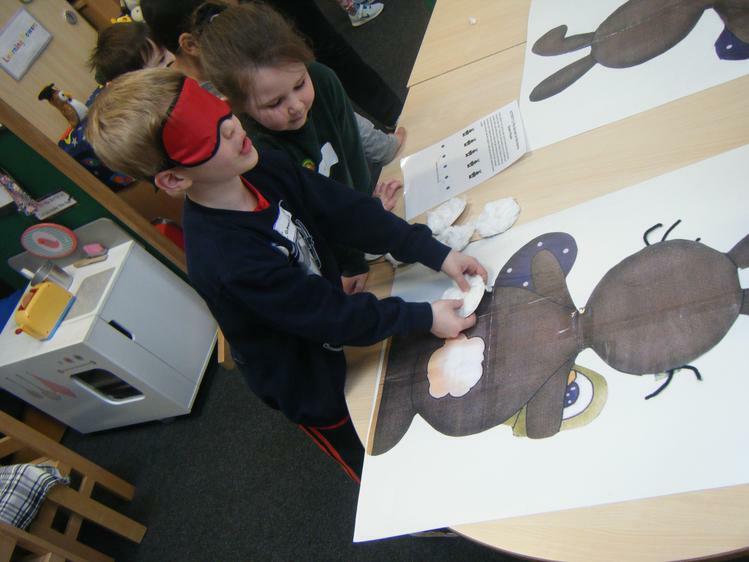 The children really enjoyed taking part in our spotty spotacular challenges! 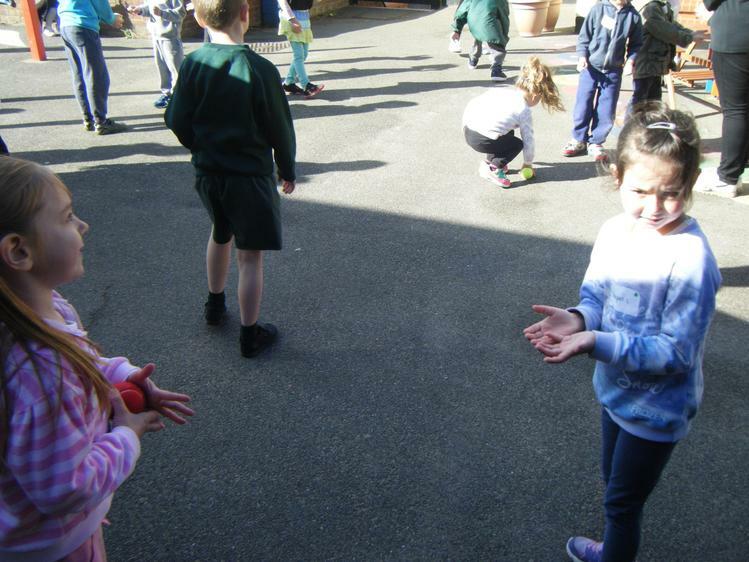 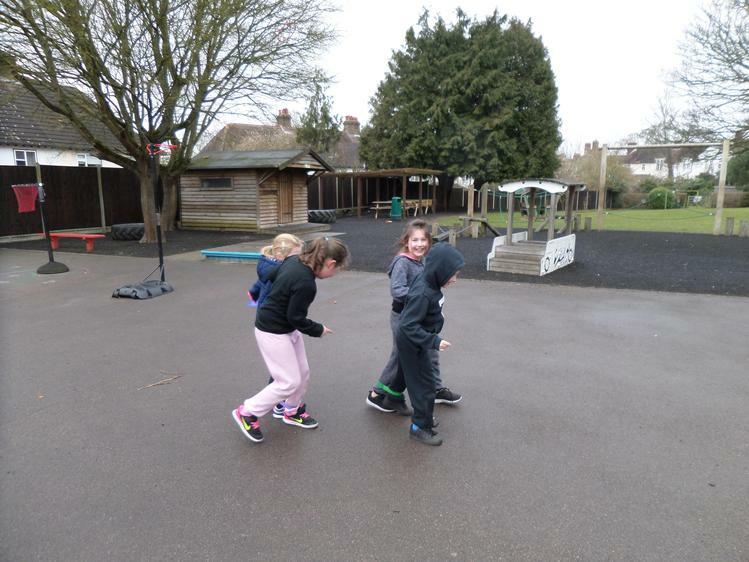 They worked in teams to score points for throwing bean bags at spots, completing a spotty trail while linked together as a team and jumping as far as they could between spots! 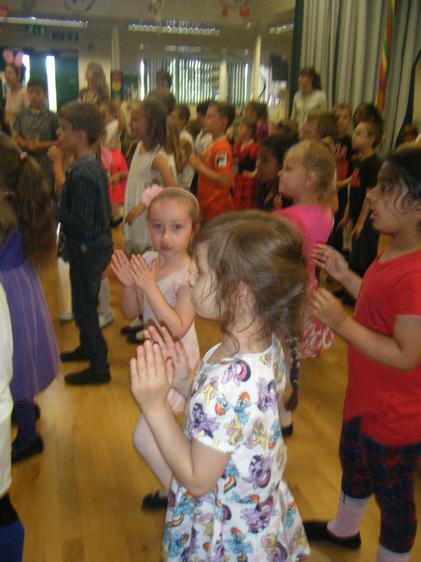 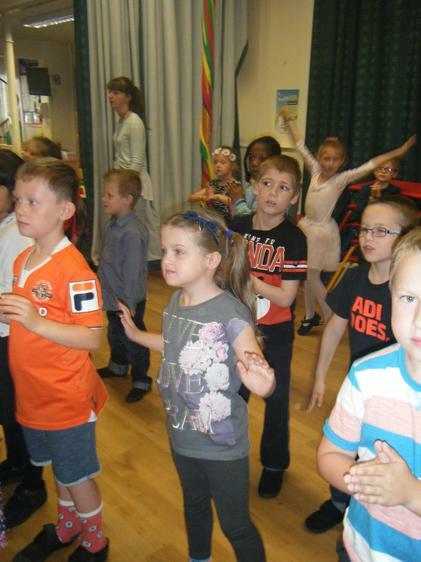 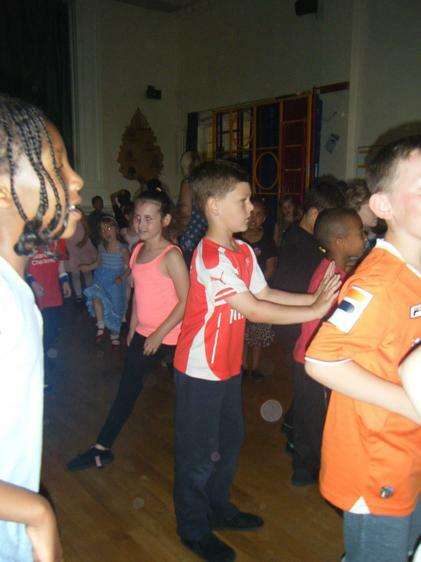 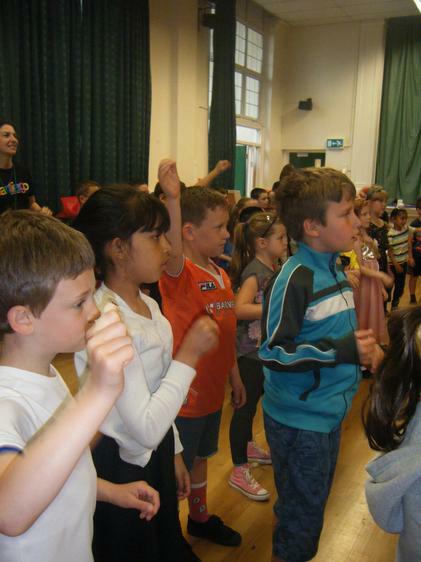 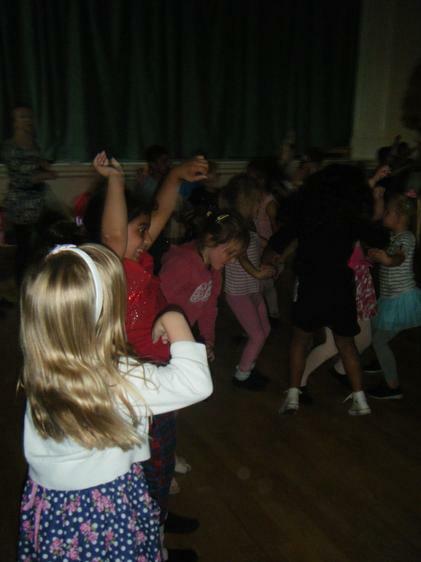 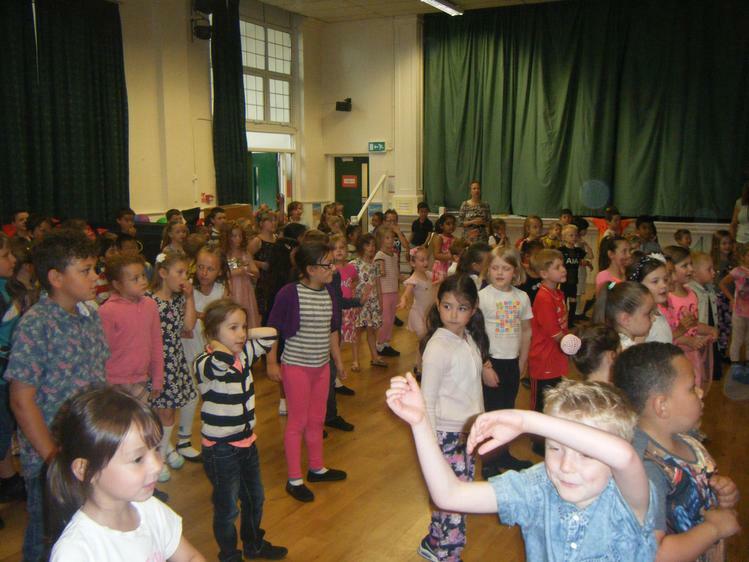 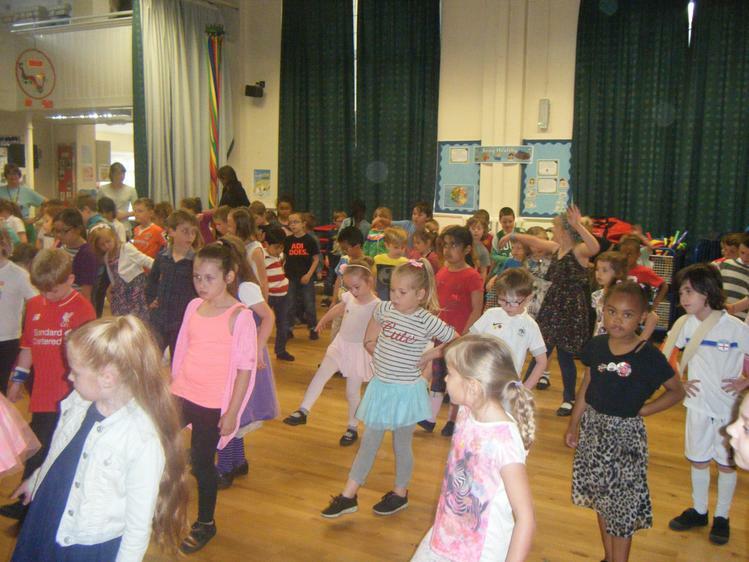 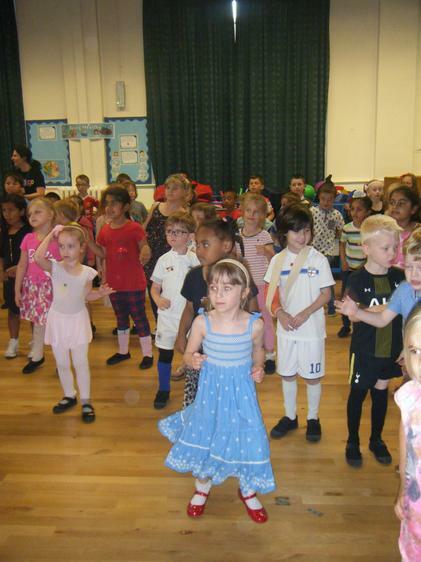 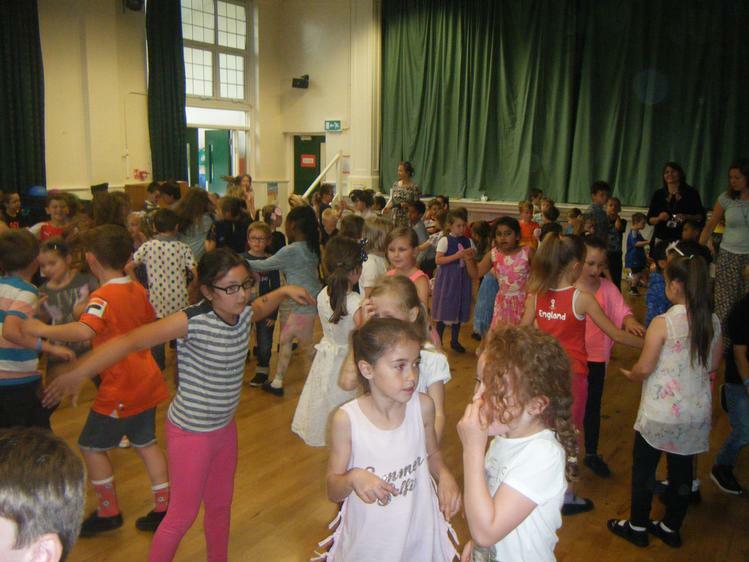 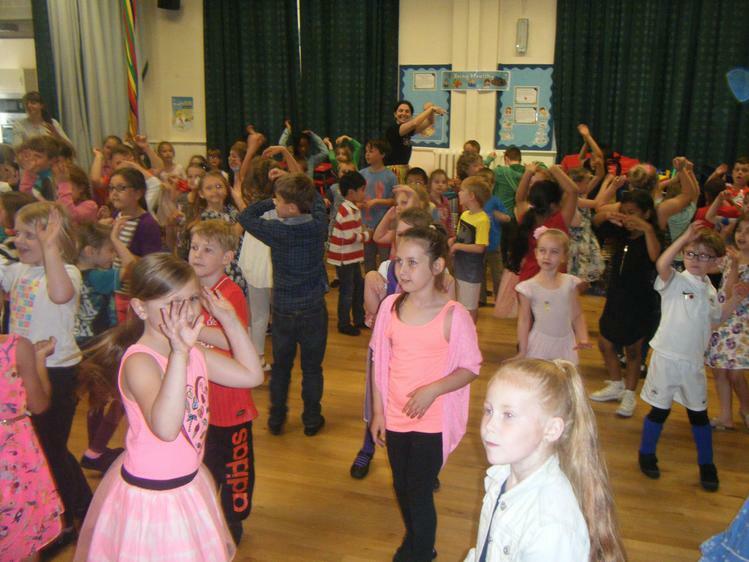 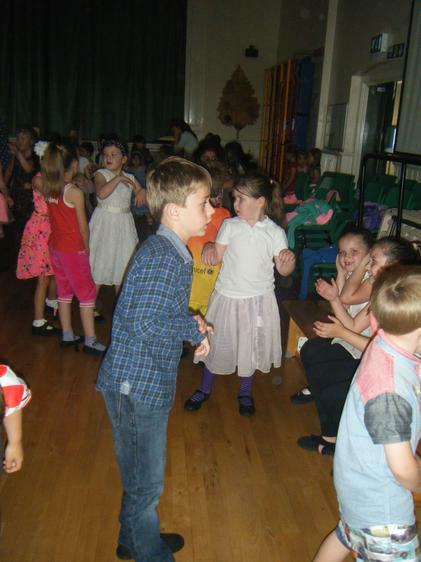 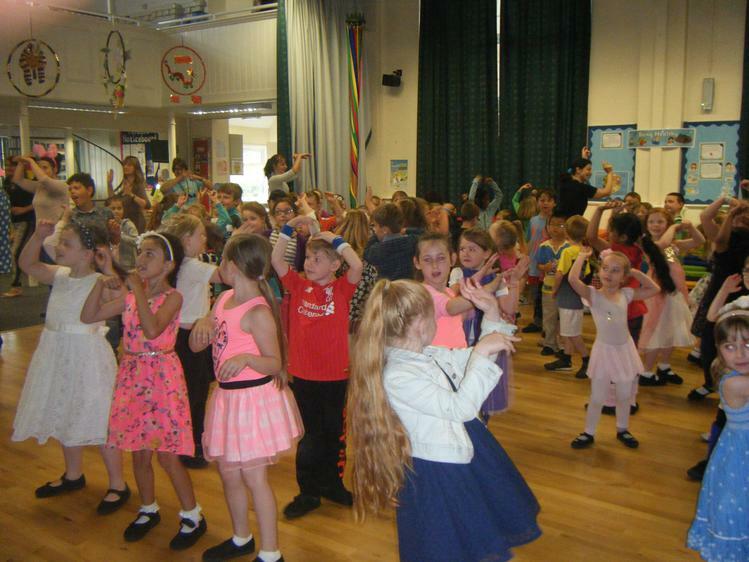 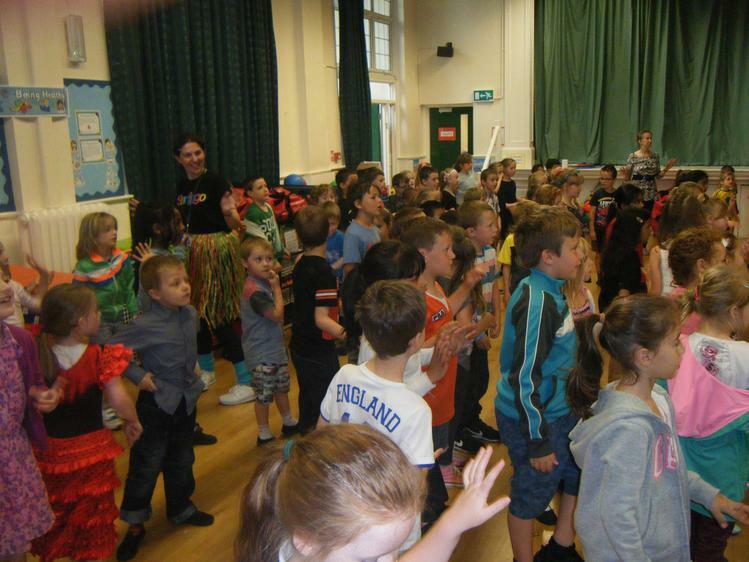 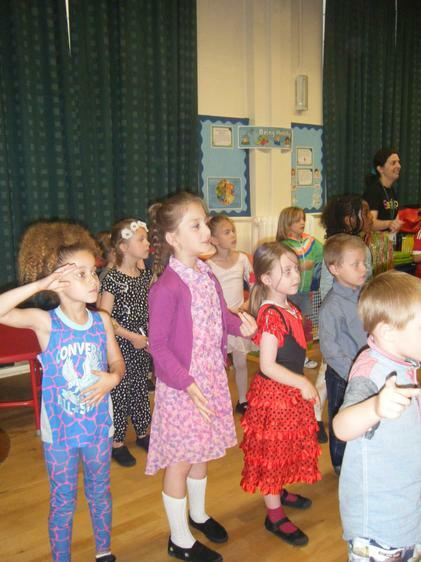 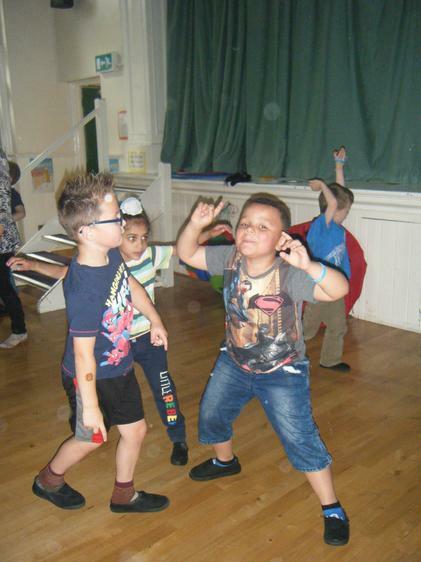 The children looked amazing in their brightly coloured clothes and had a great time singing and dancing along to the music in between challenges. 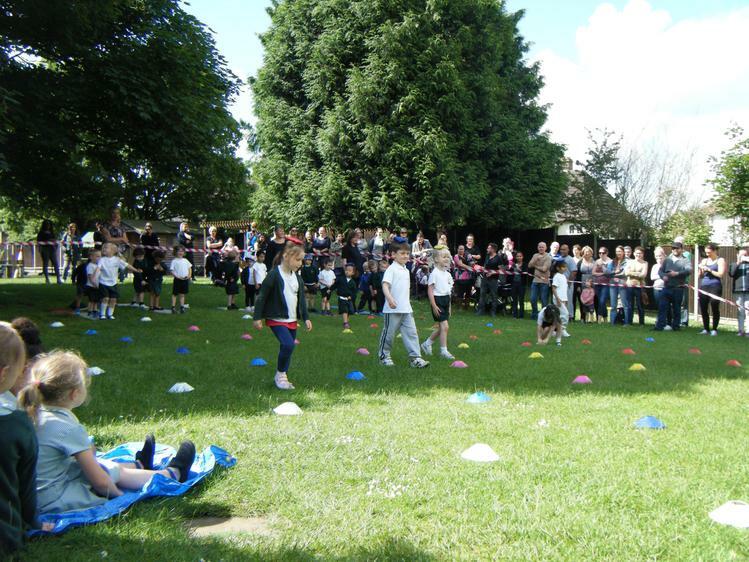 Thank you so much to everyone who was able to donate money towards such a fantastic cause! 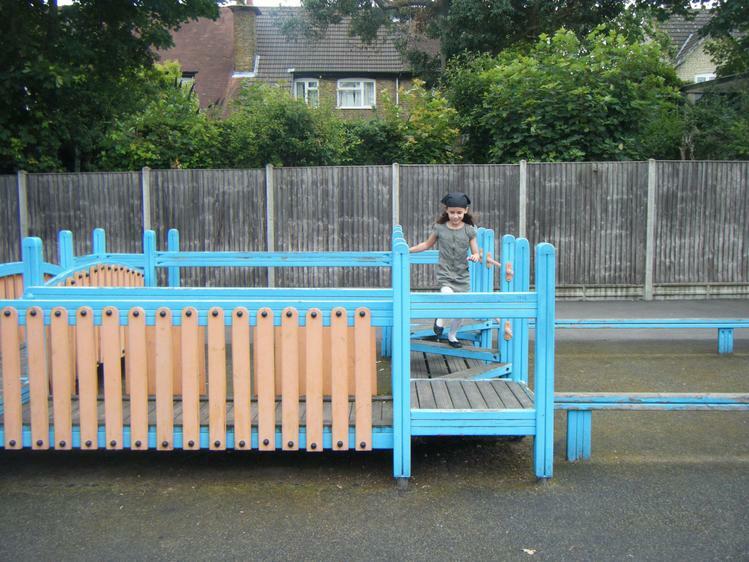 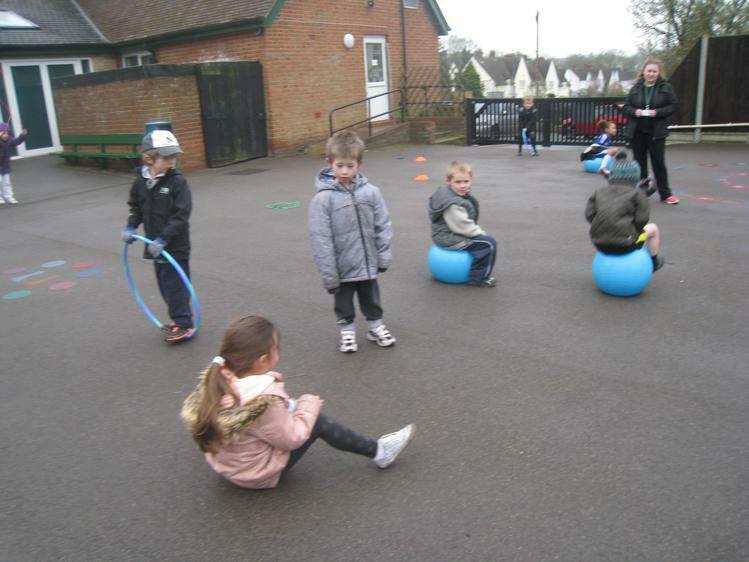 The children had great fun taking part in our sponsored bike and scooter ride. 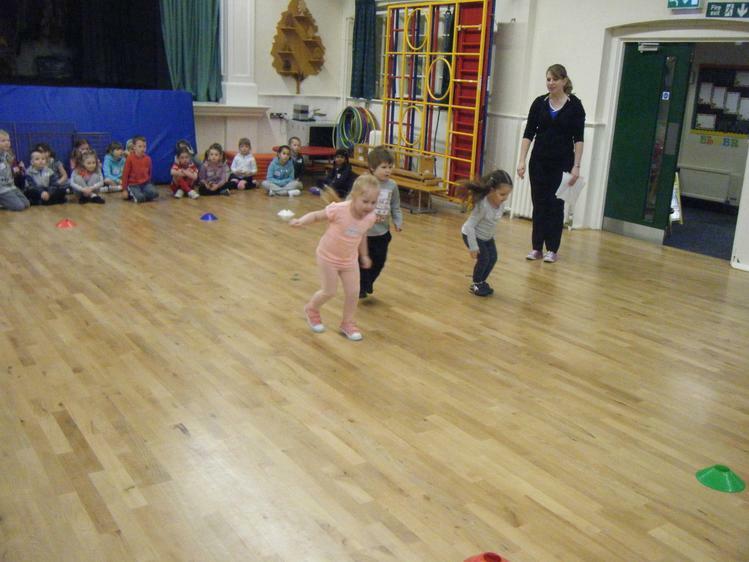 They were full of energy and impressed us with how long they were able to keep going around the track! 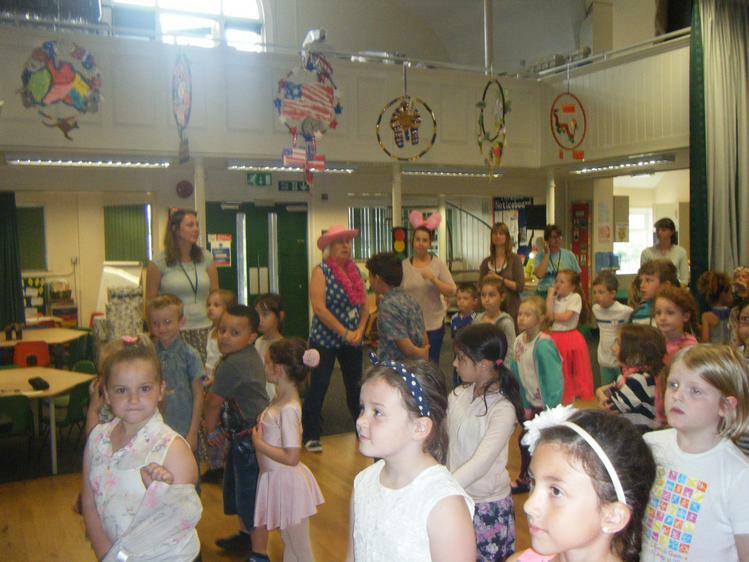 Every child who took part received a special certificate and prizes were awarded to children from each class for effort, enthusiasm and perseverance! 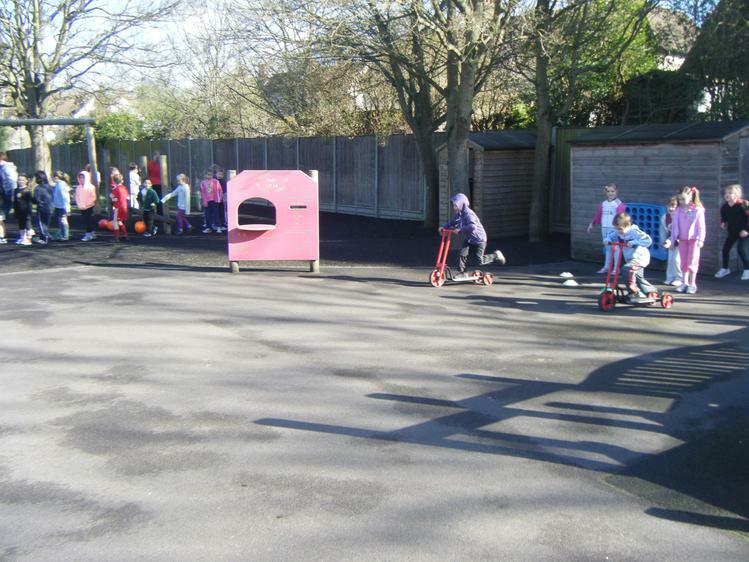 Thank you to all of our parents and carers for helping the children to bring their bikes and scooters to school and for helping to raise money for the Friends of Hillshott. 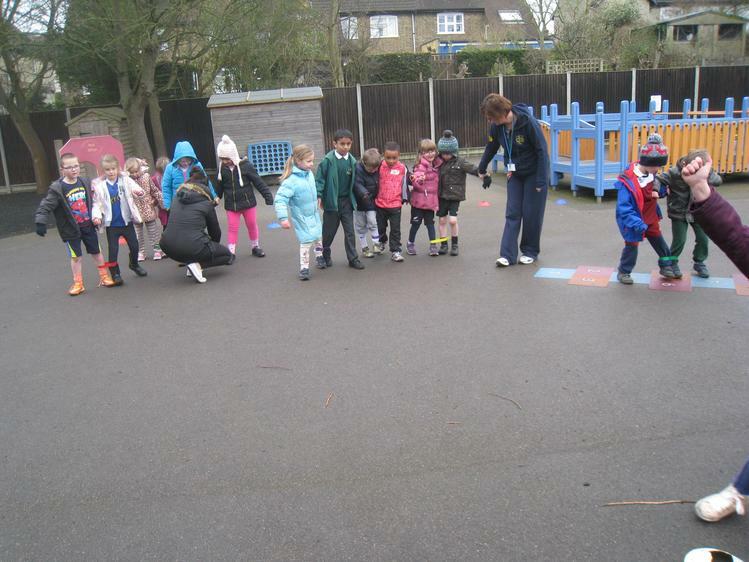 The children had a lot of fun taking part in our Sponsored Skip! 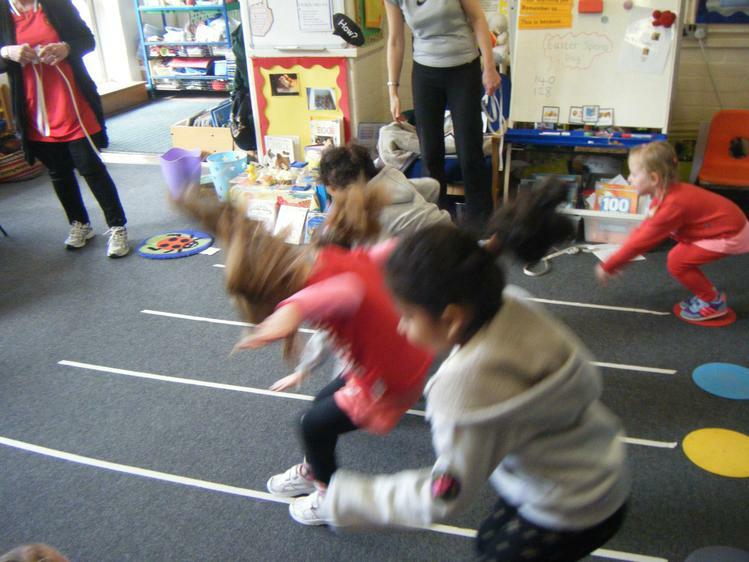 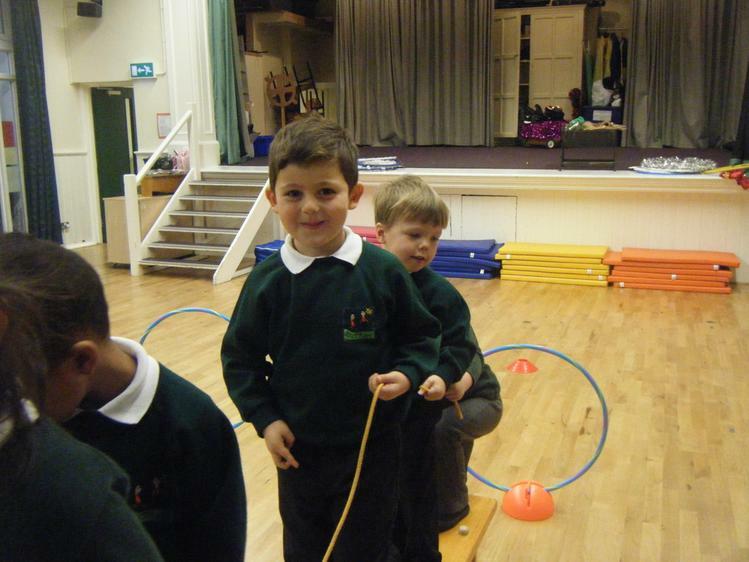 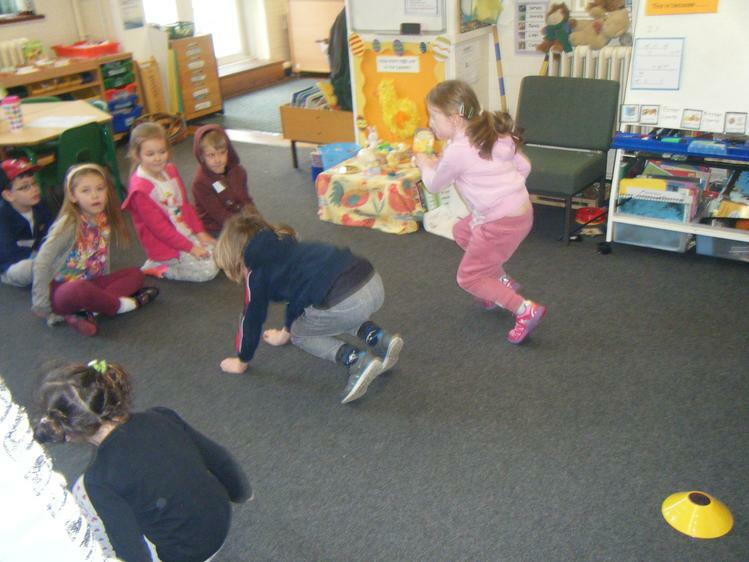 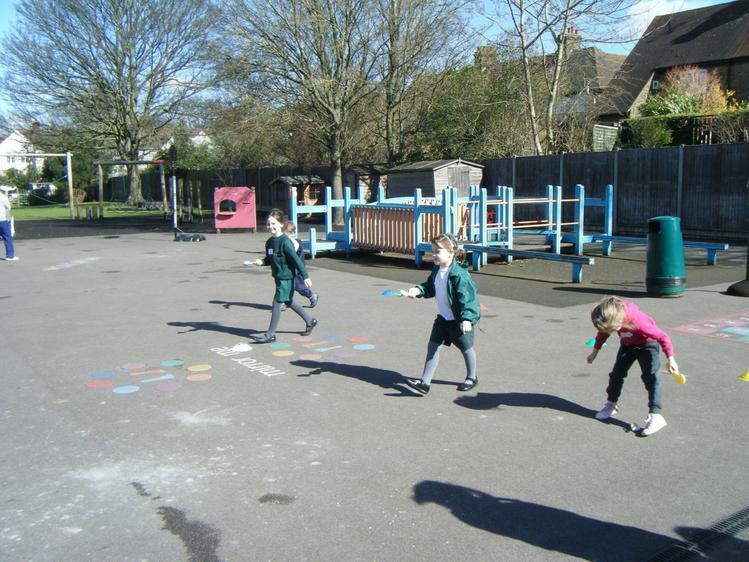 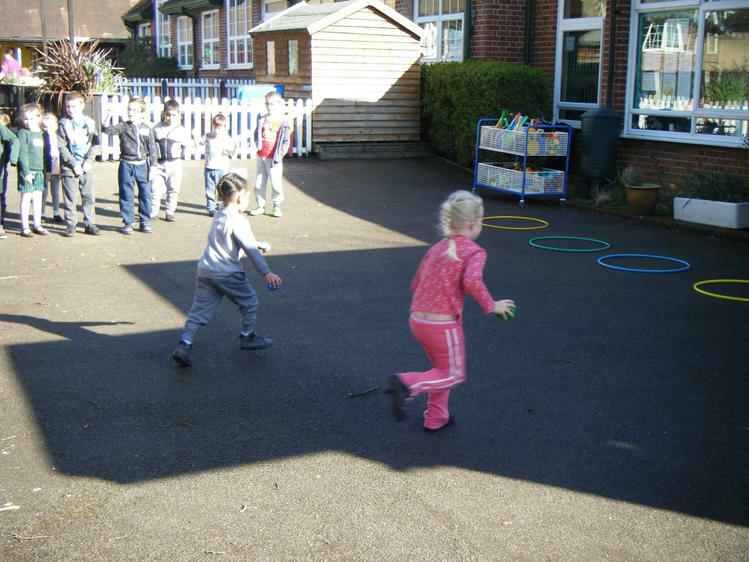 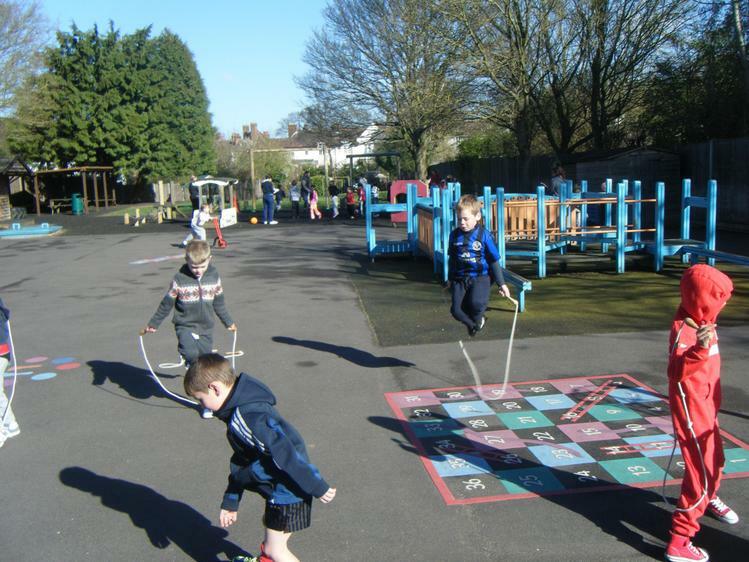 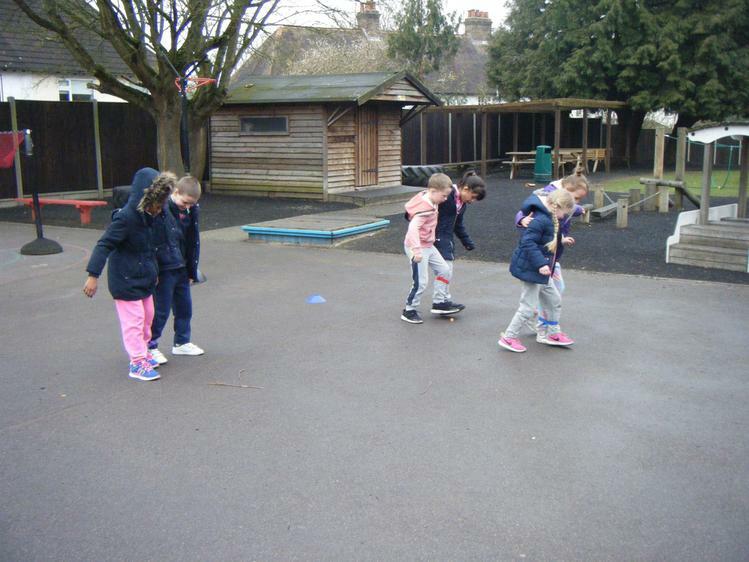 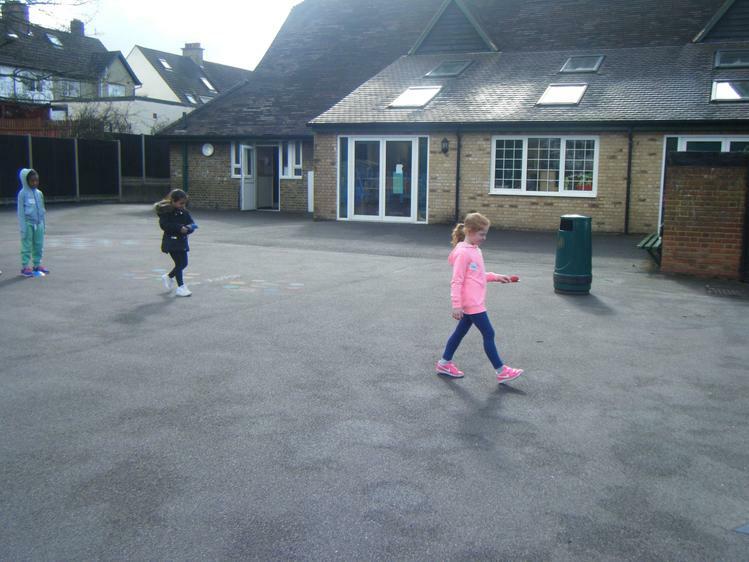 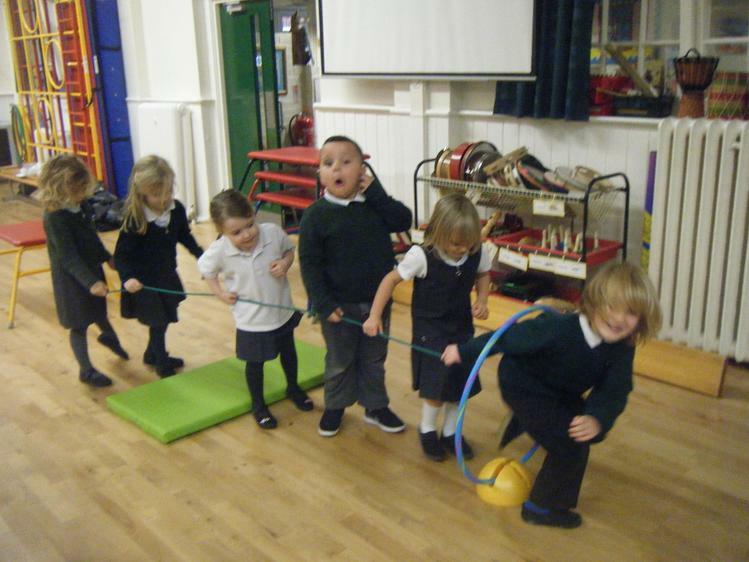 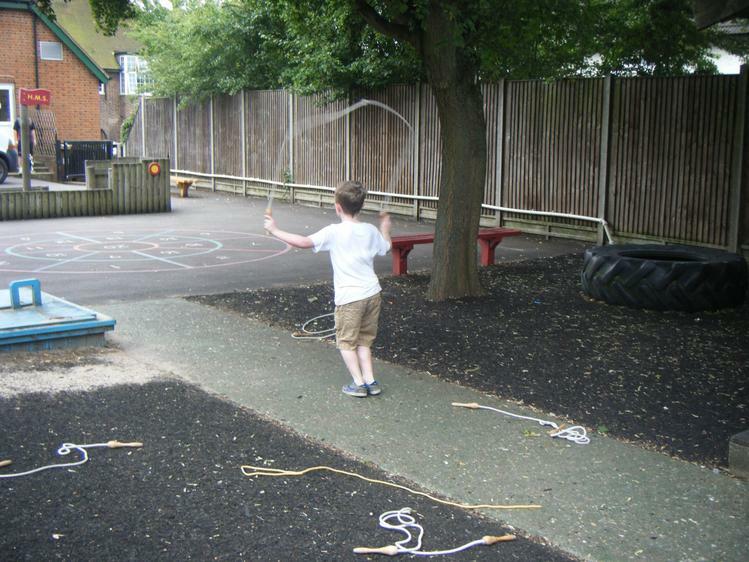 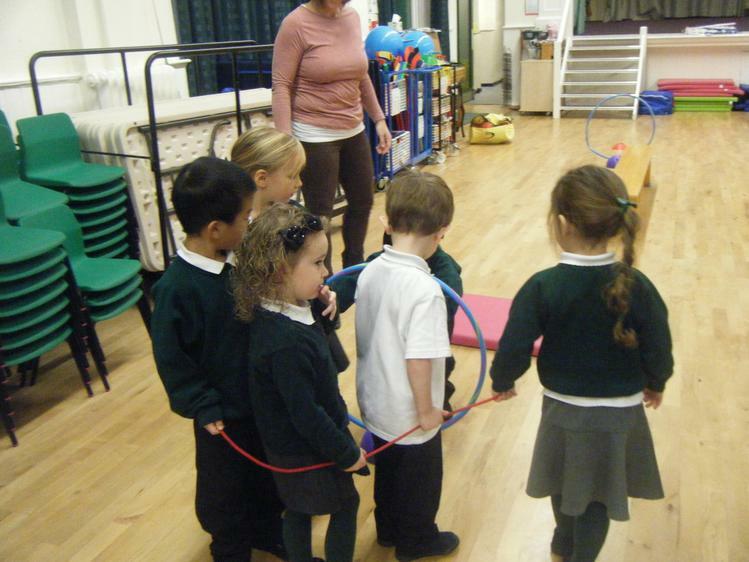 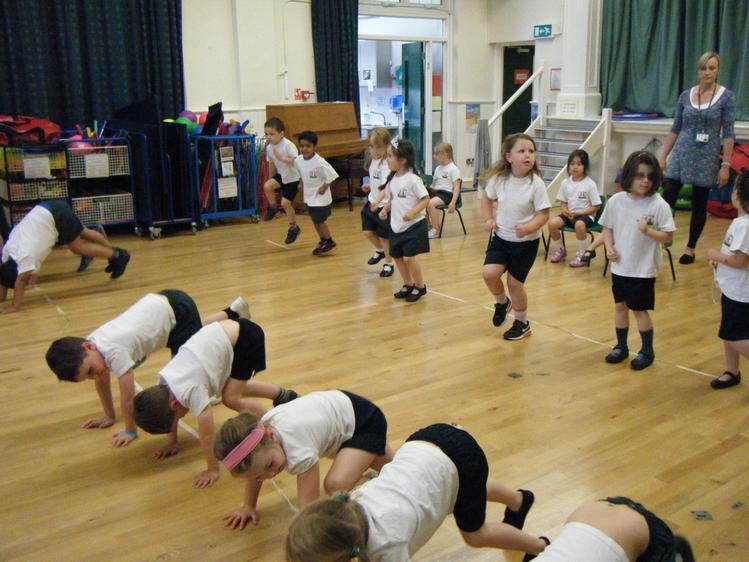 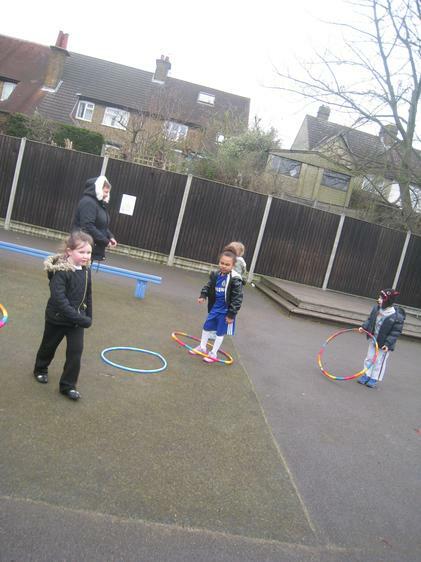 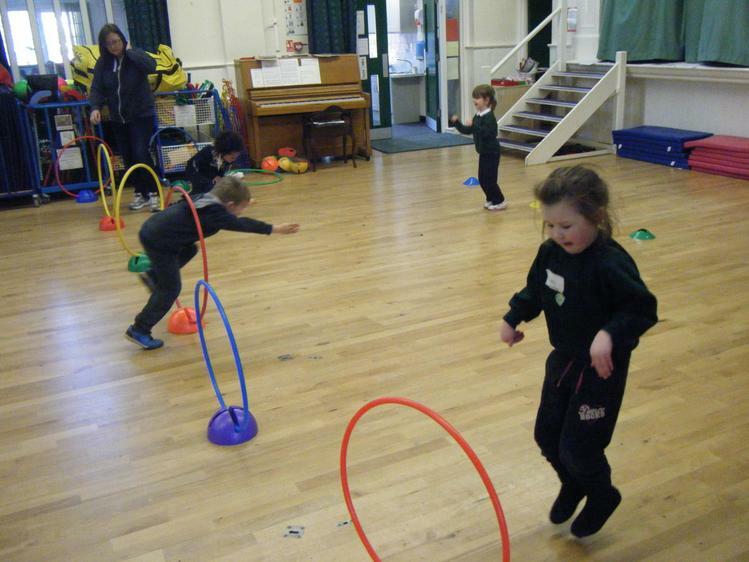 We practised different skills needed for skipping and incorporated them in to different challenges. 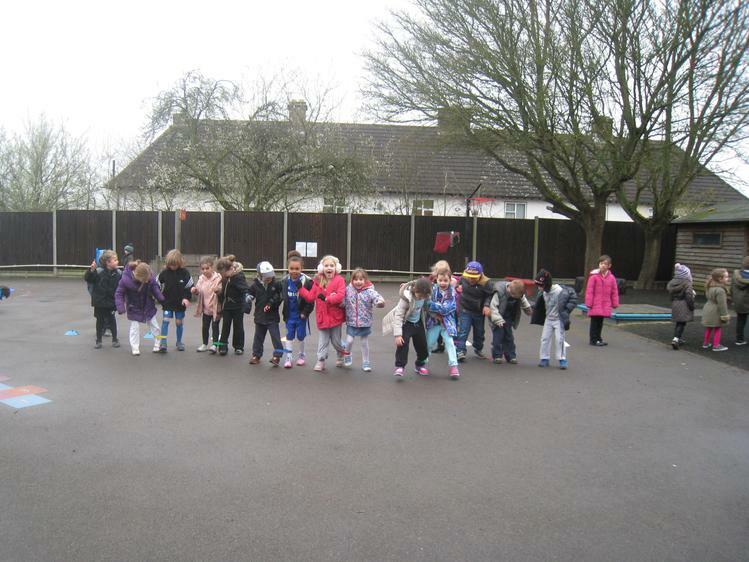 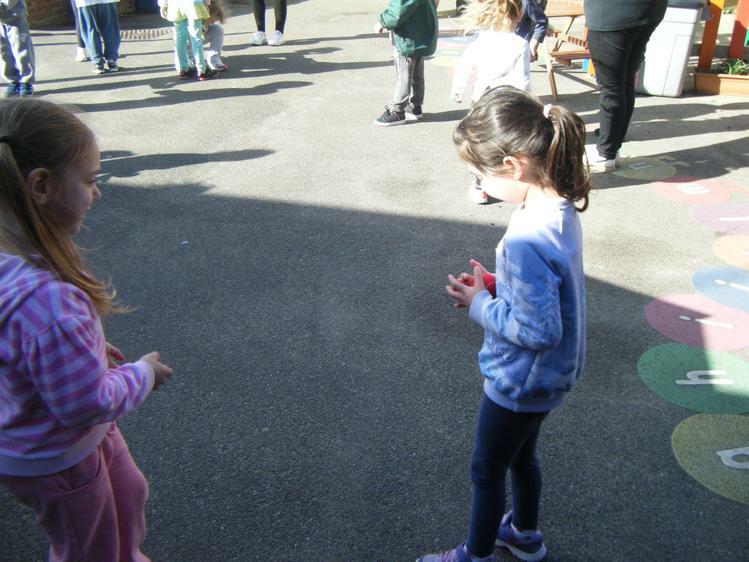 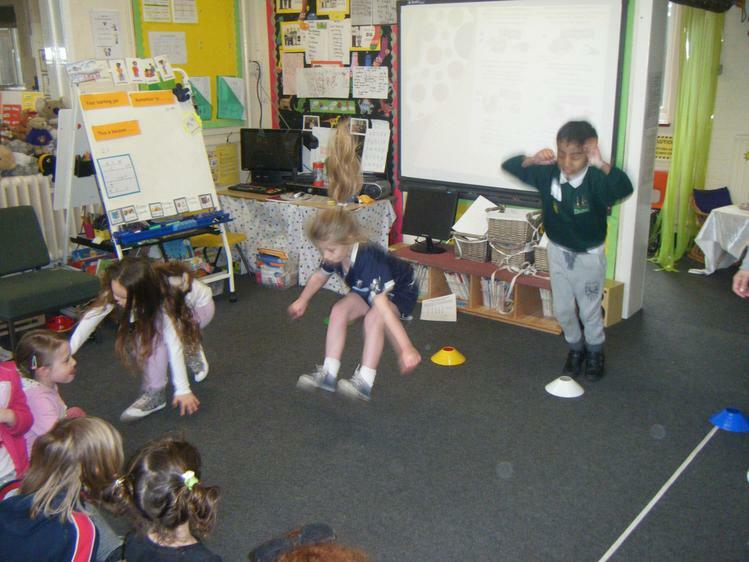 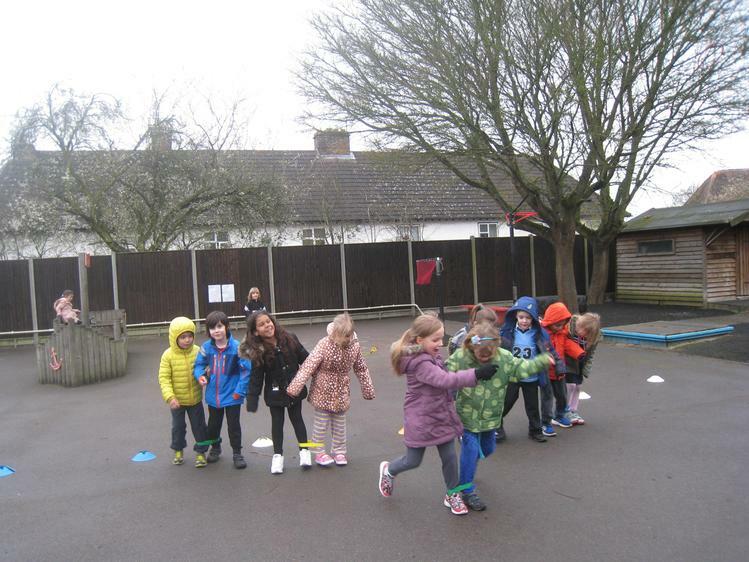 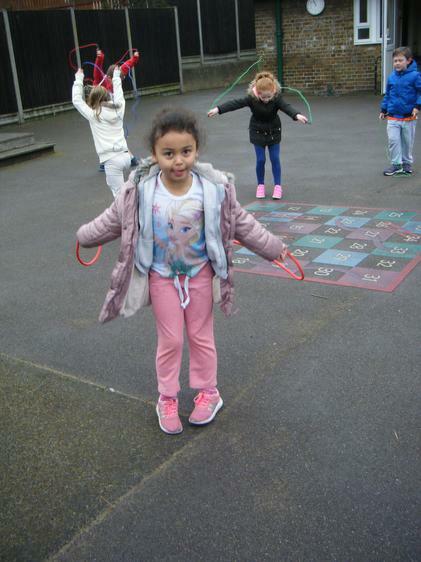 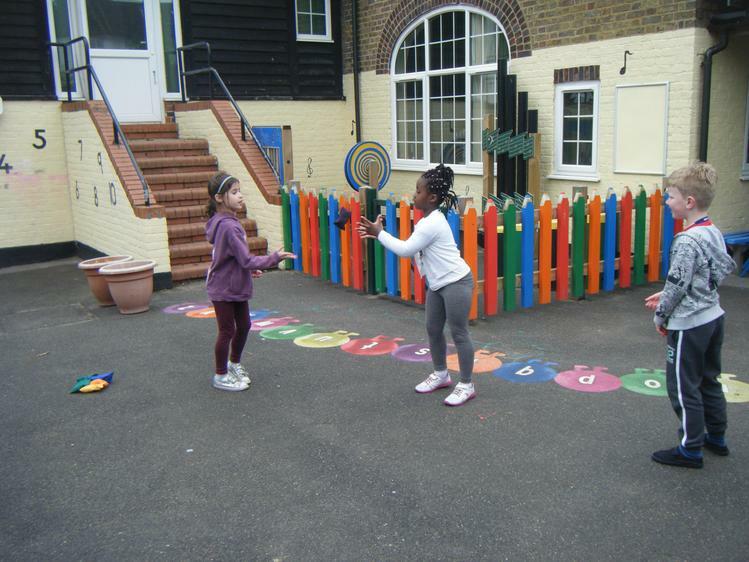 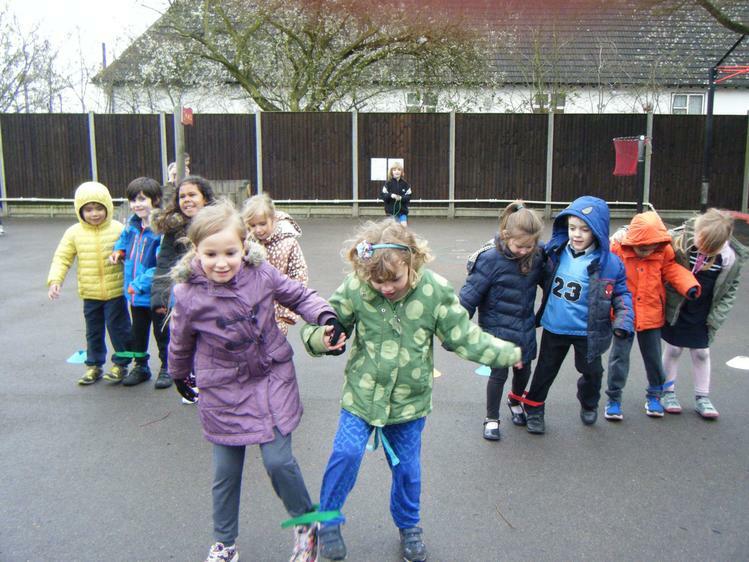 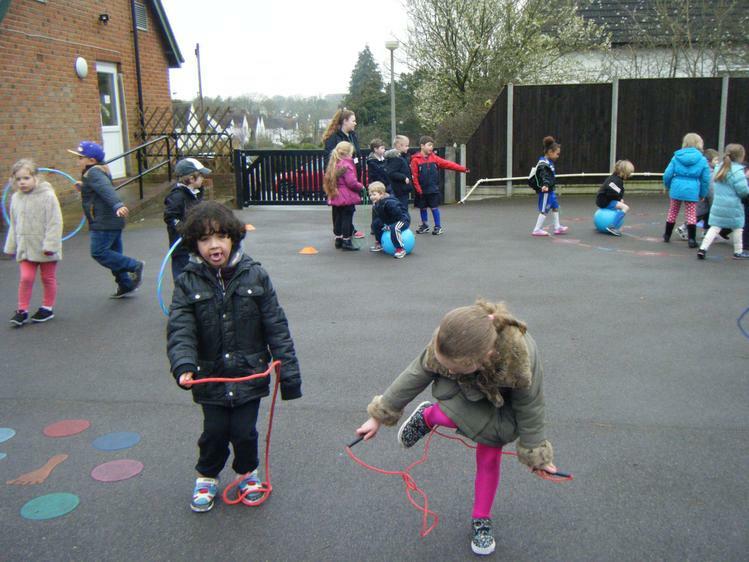 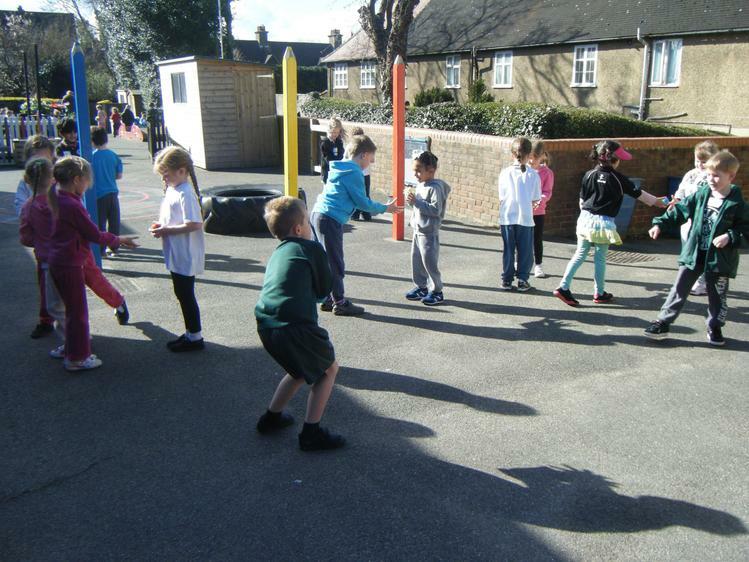 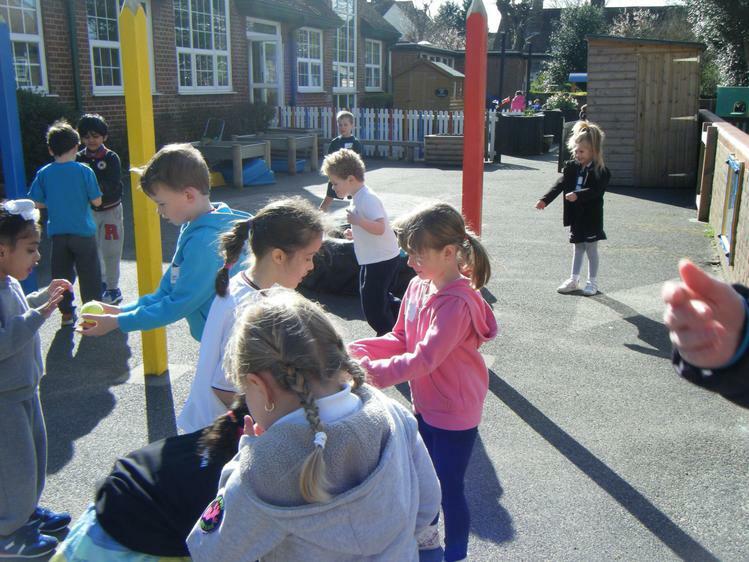 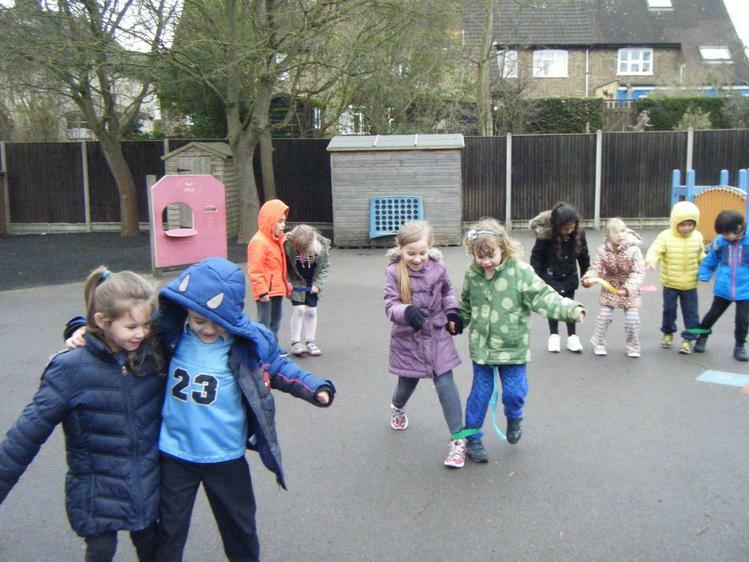 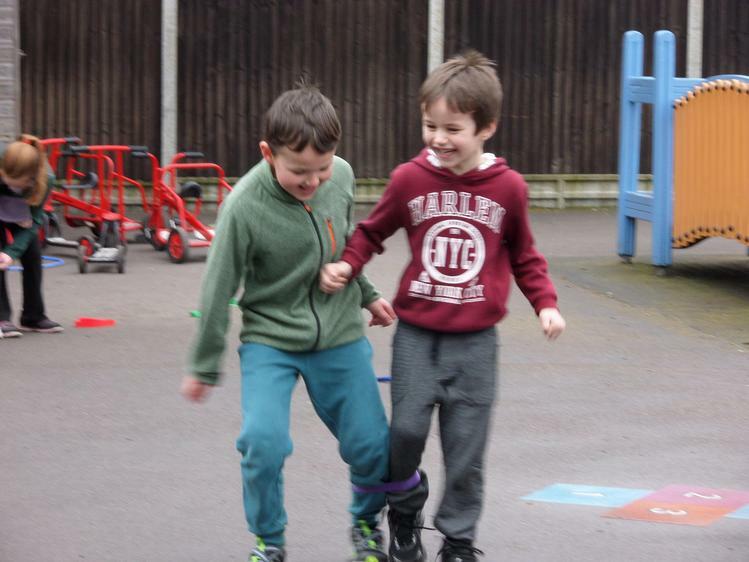 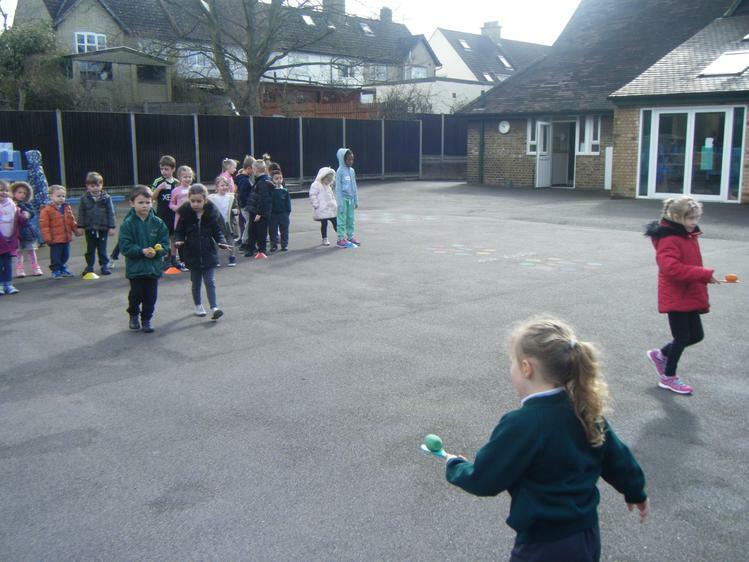 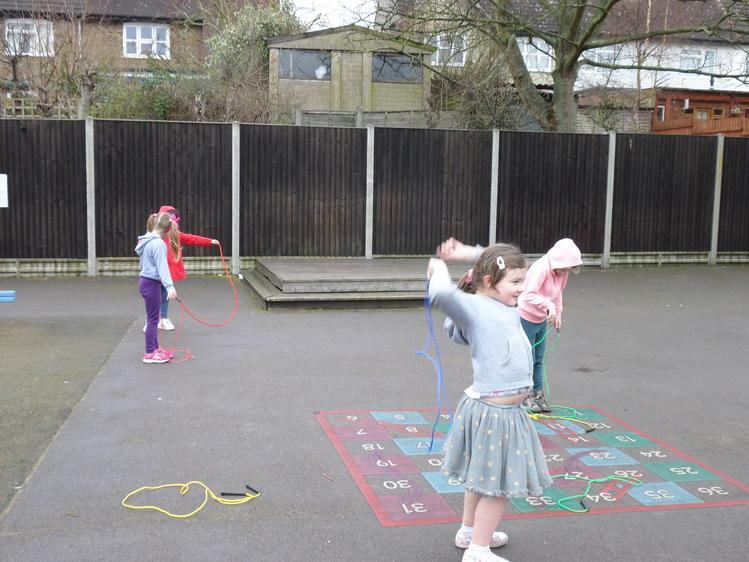 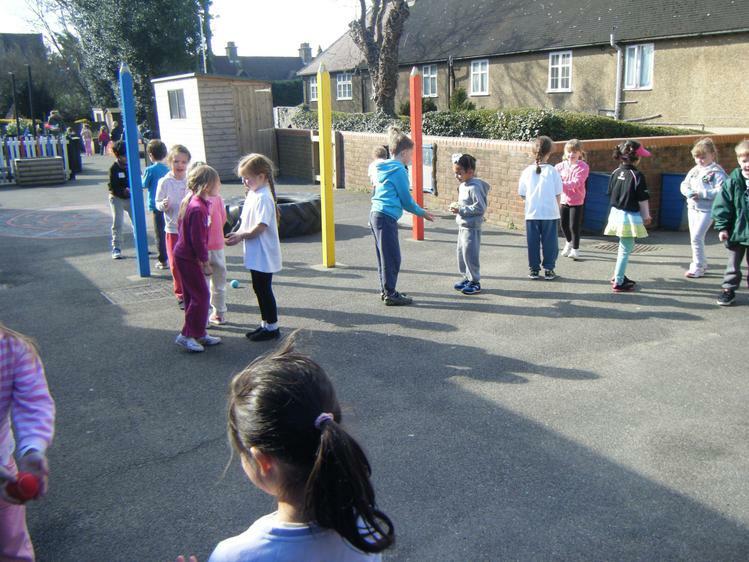 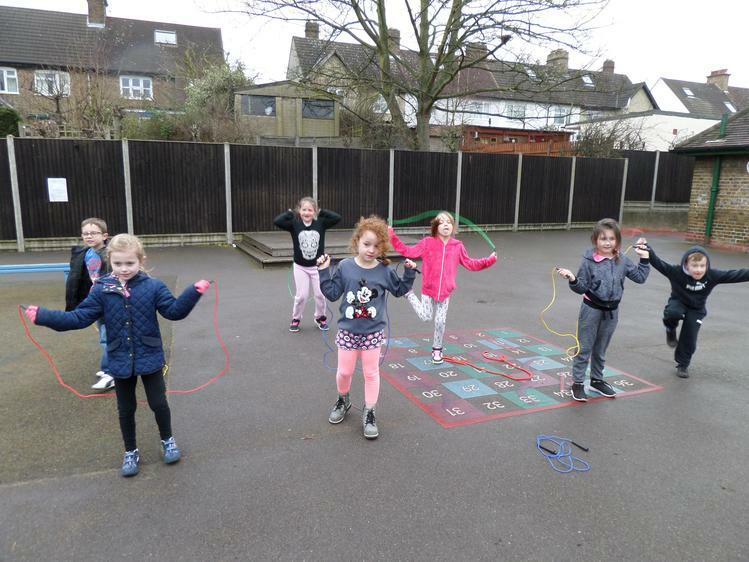 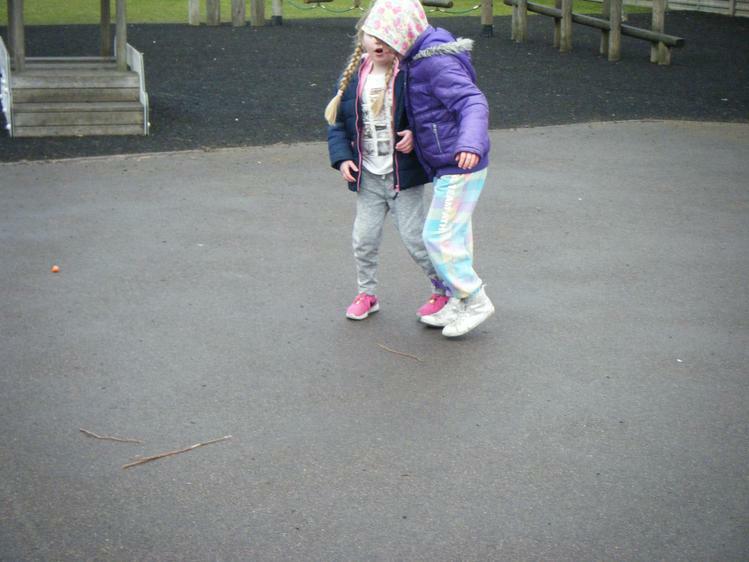 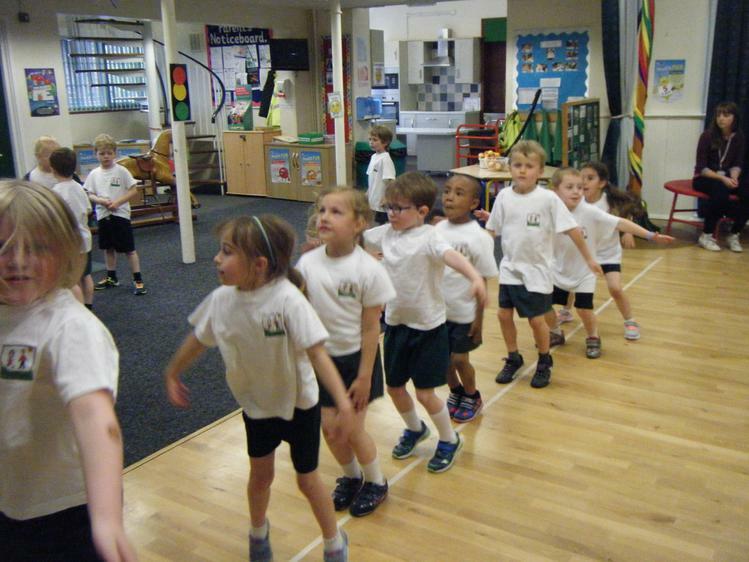 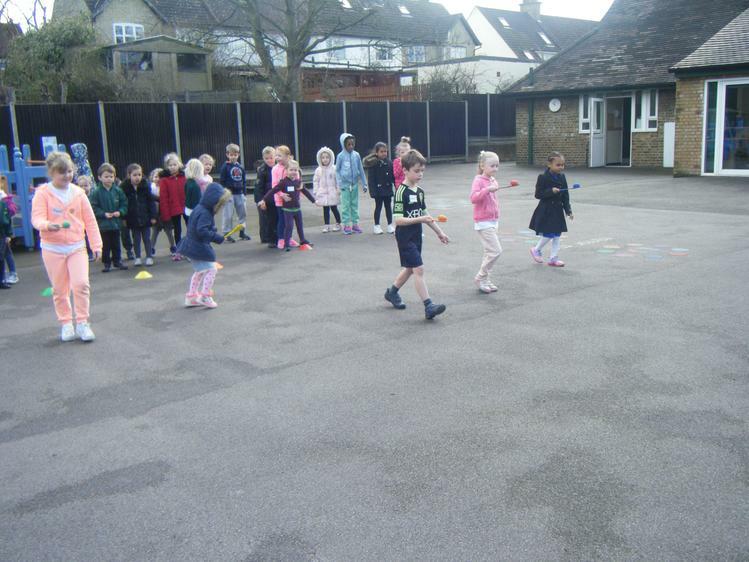 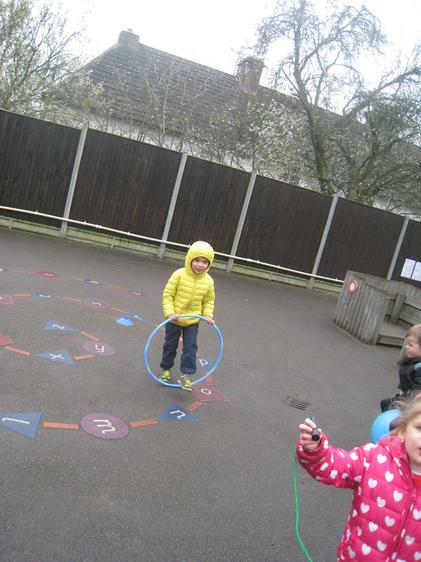 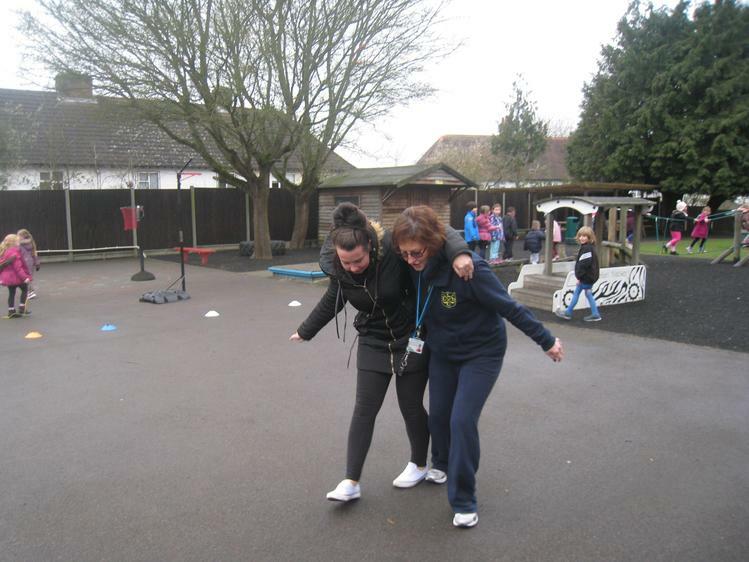 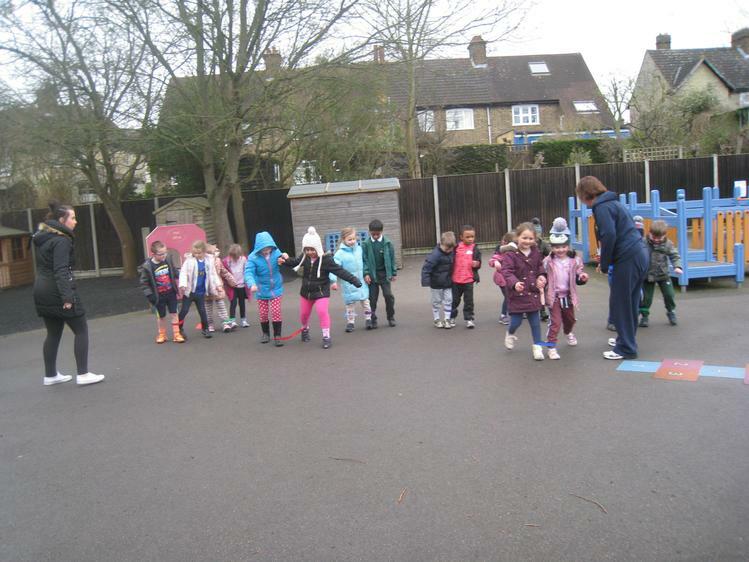 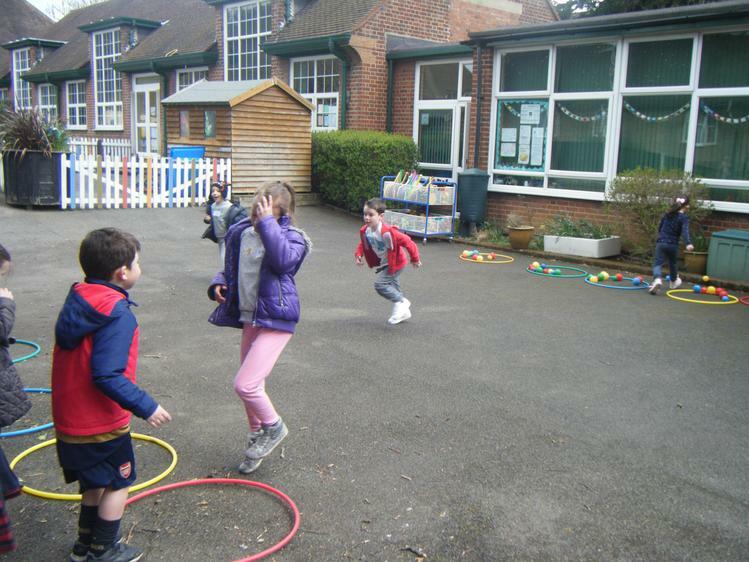 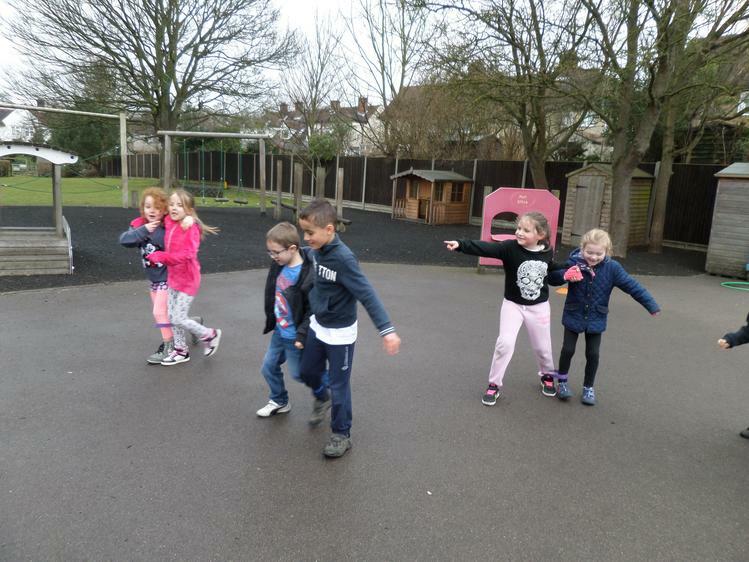 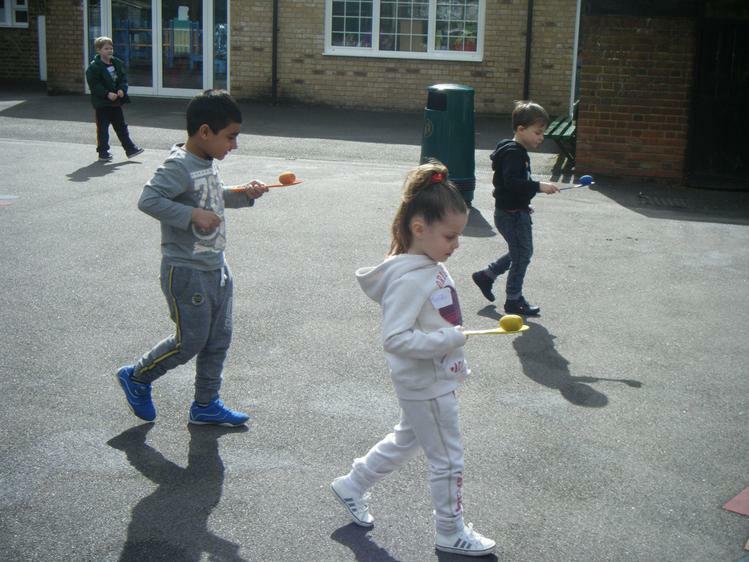 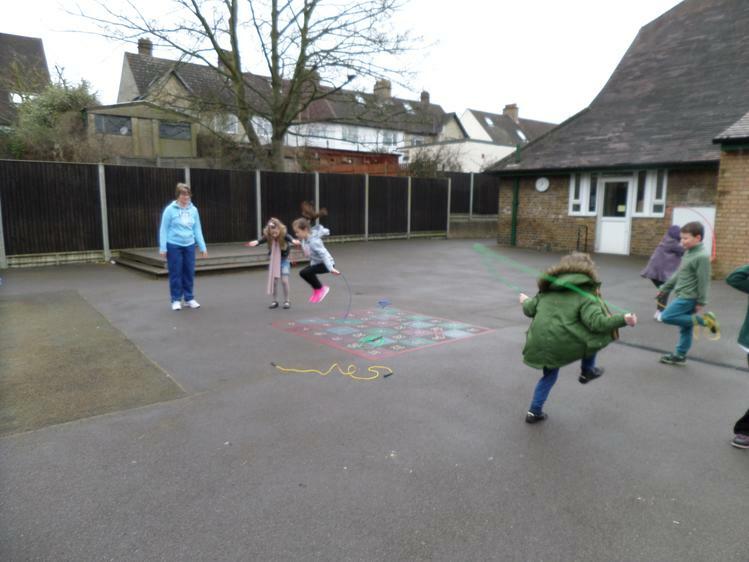 We also had a go at skipping in different ways with our friends. 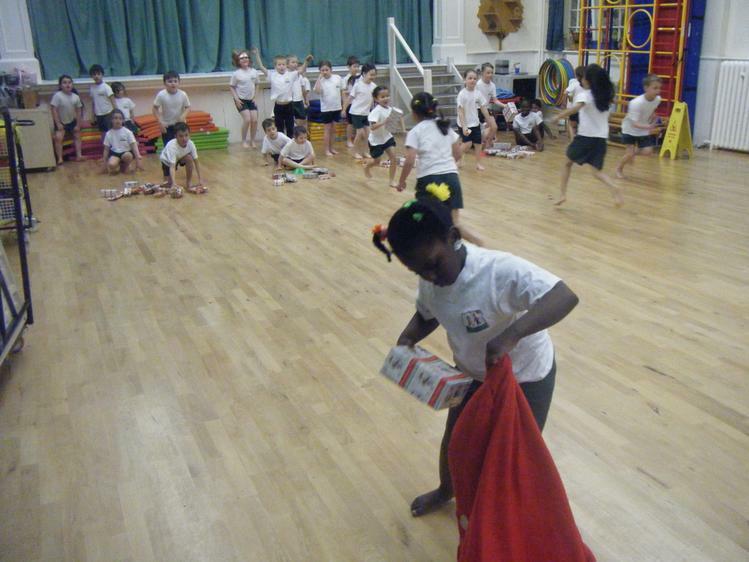 The children did a great job and managed to raise an amazing £400 for the British Heart Foundation! 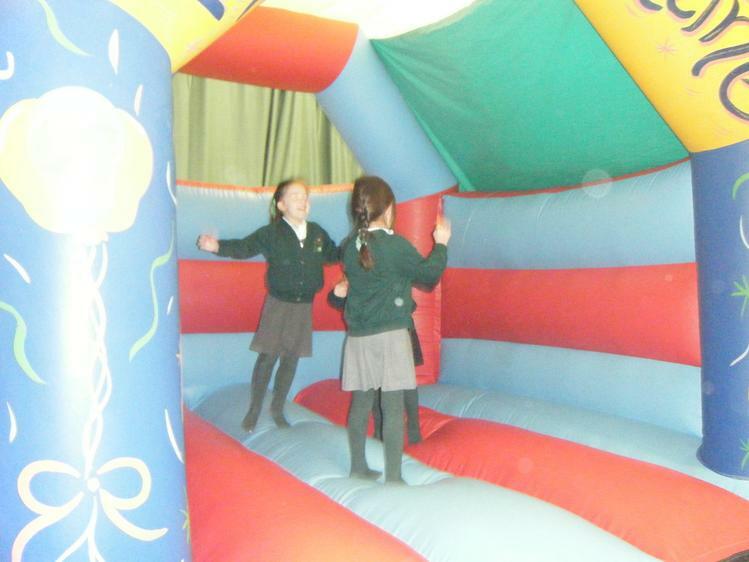 Thank you to everyone who kindly sponsored the children. 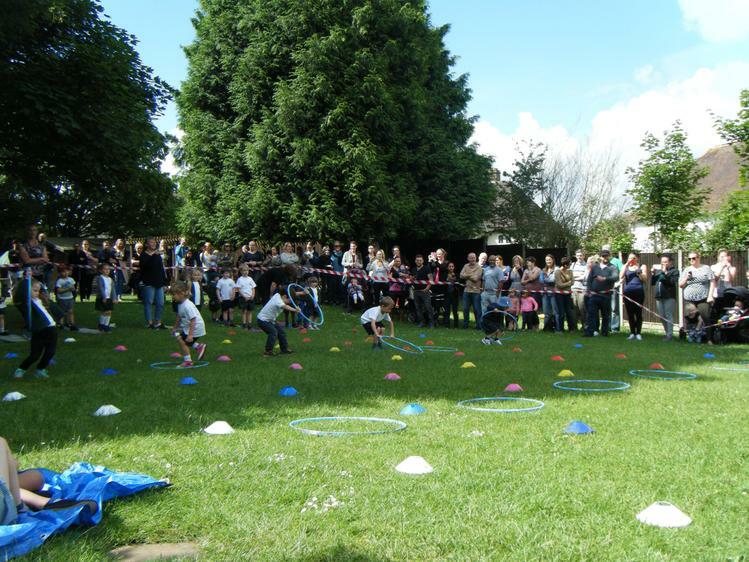 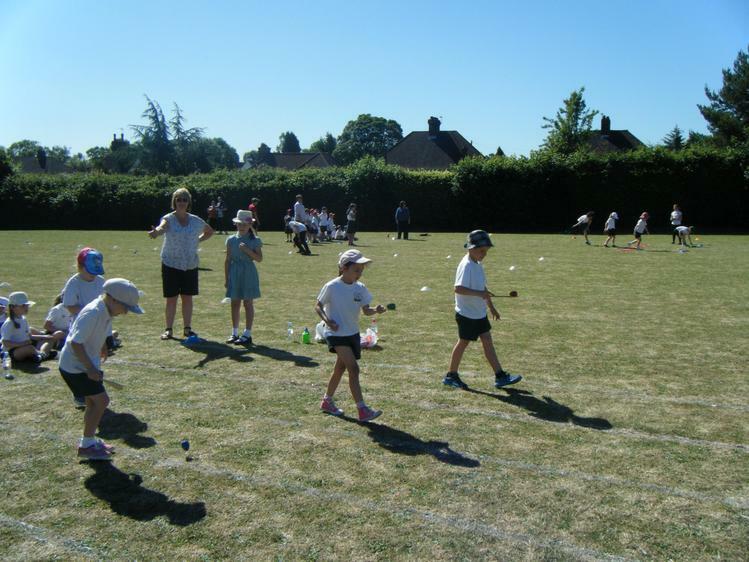 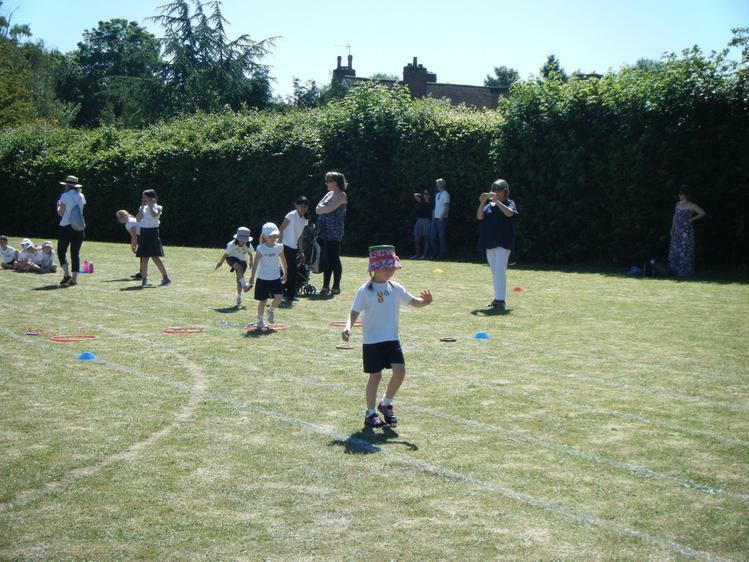 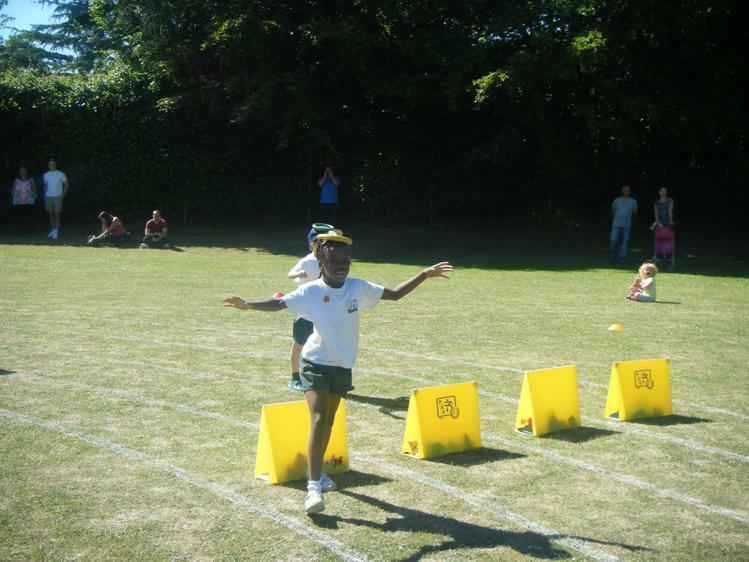 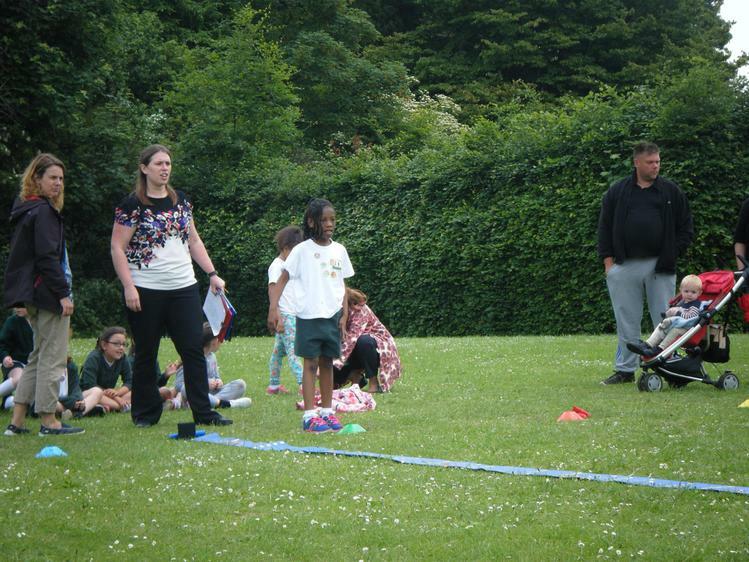 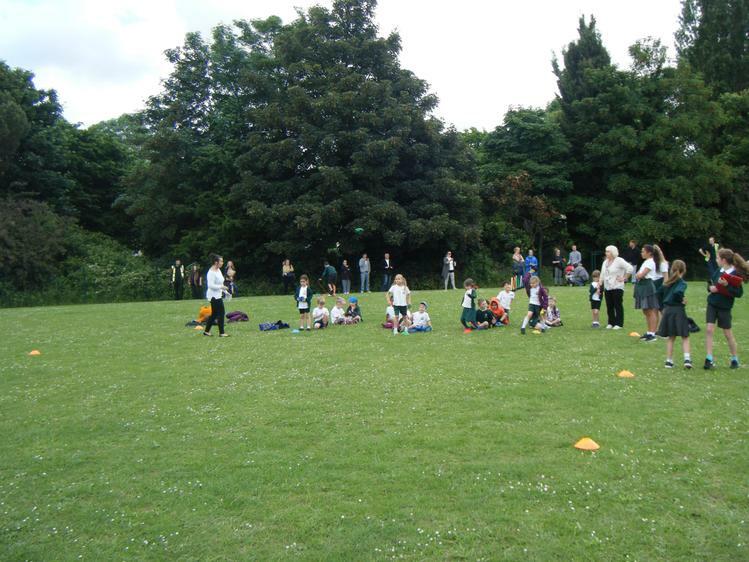 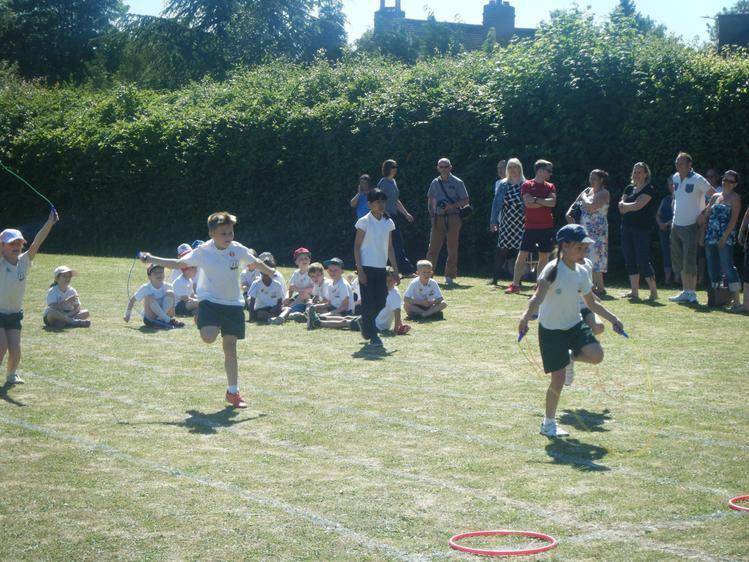 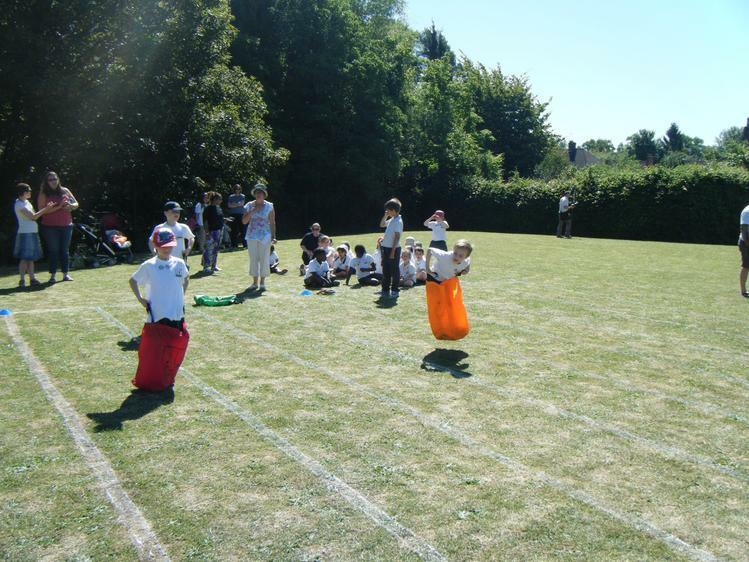 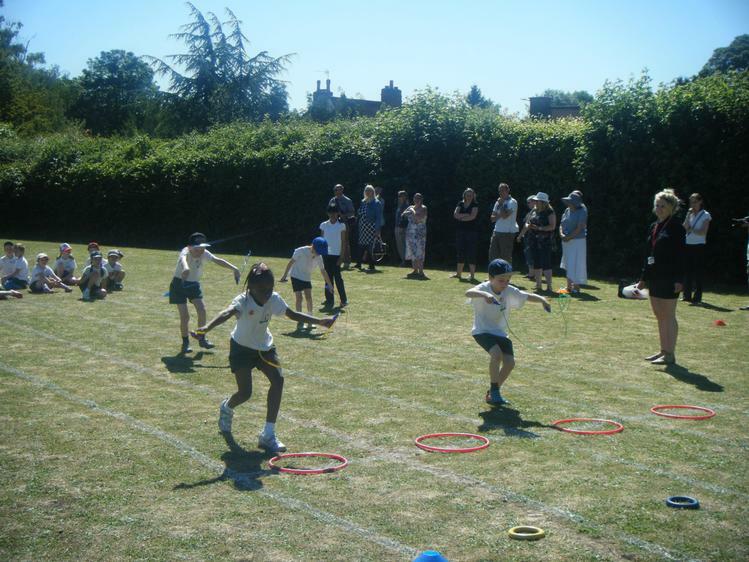 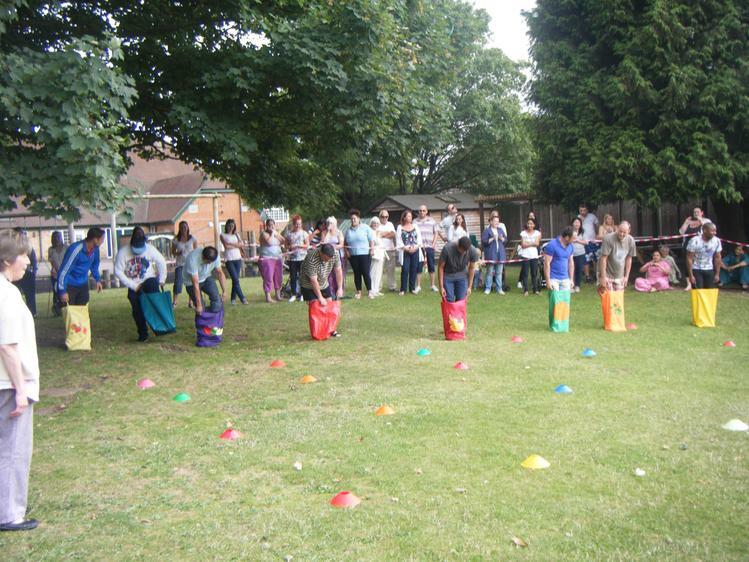 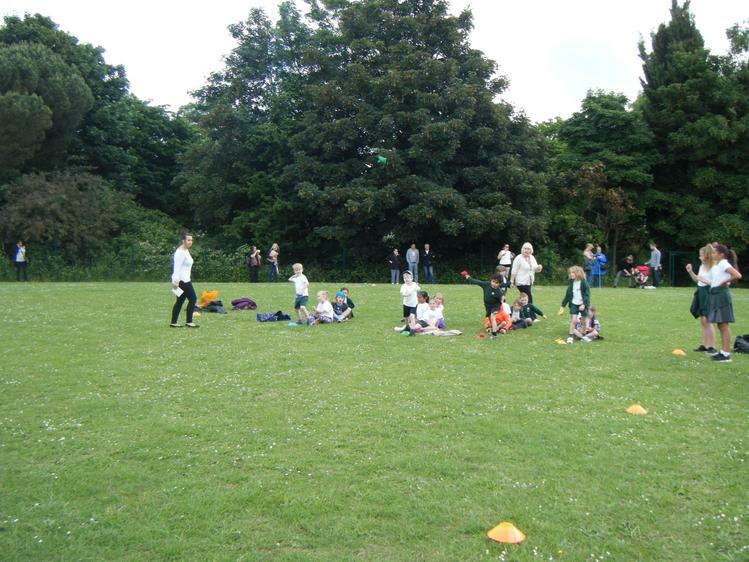 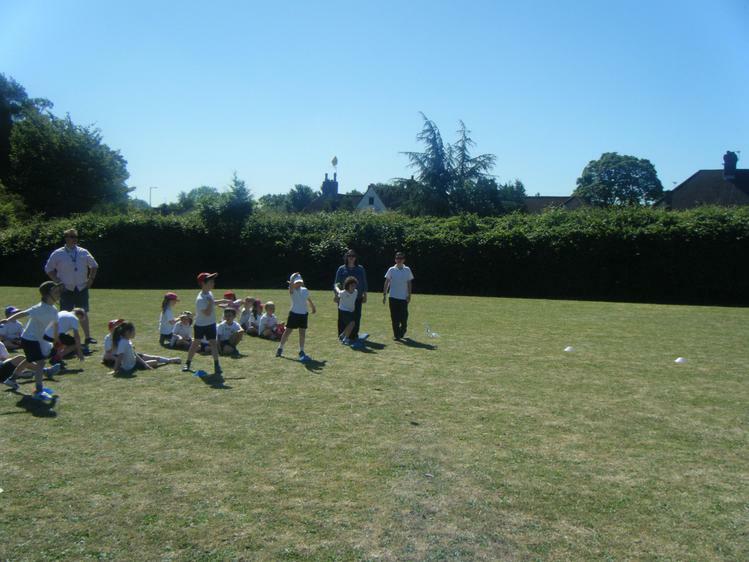 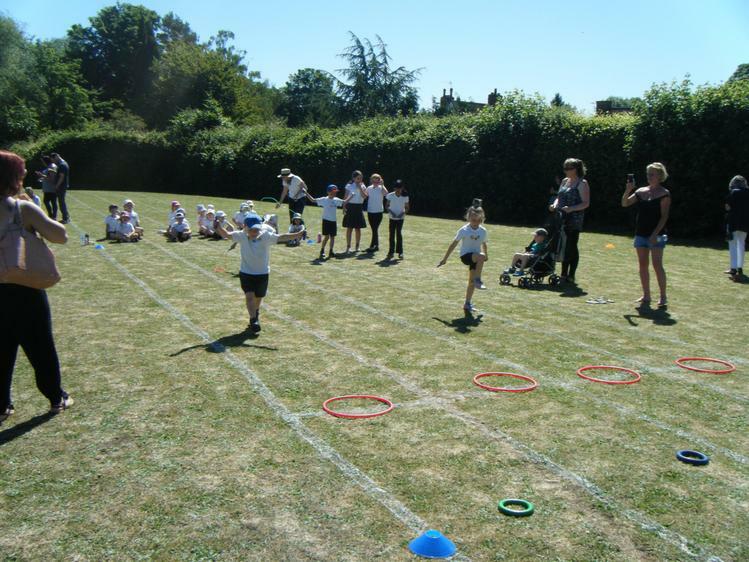 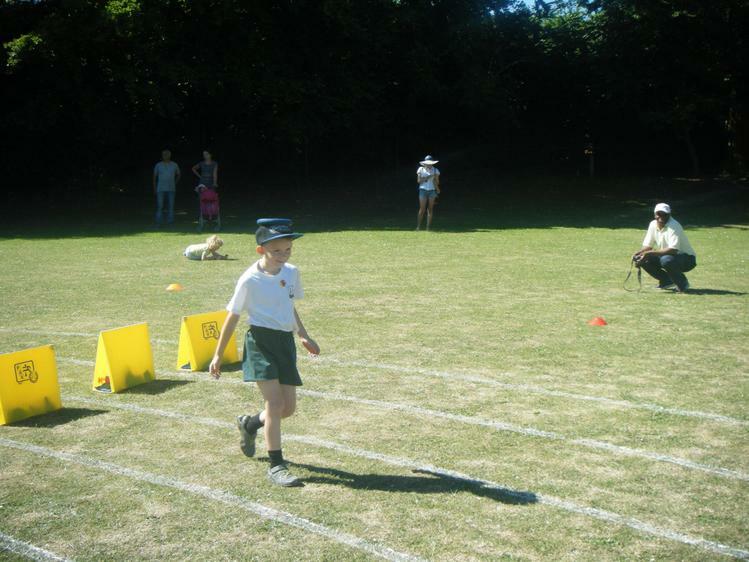 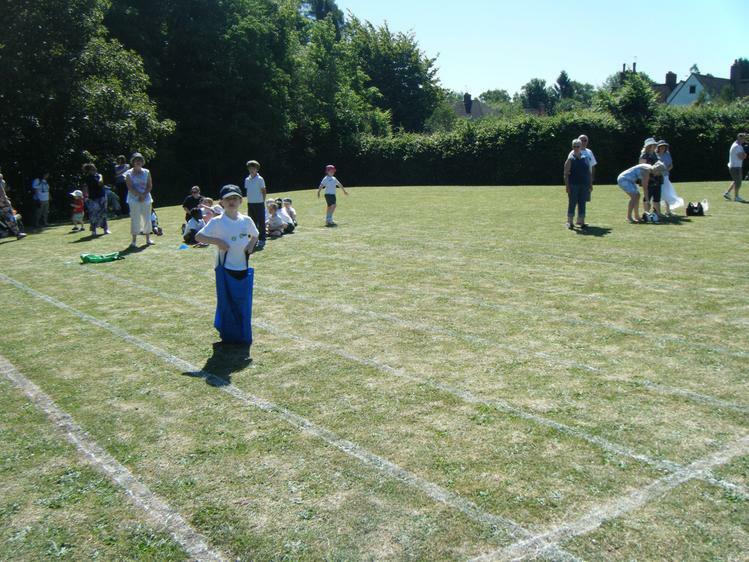 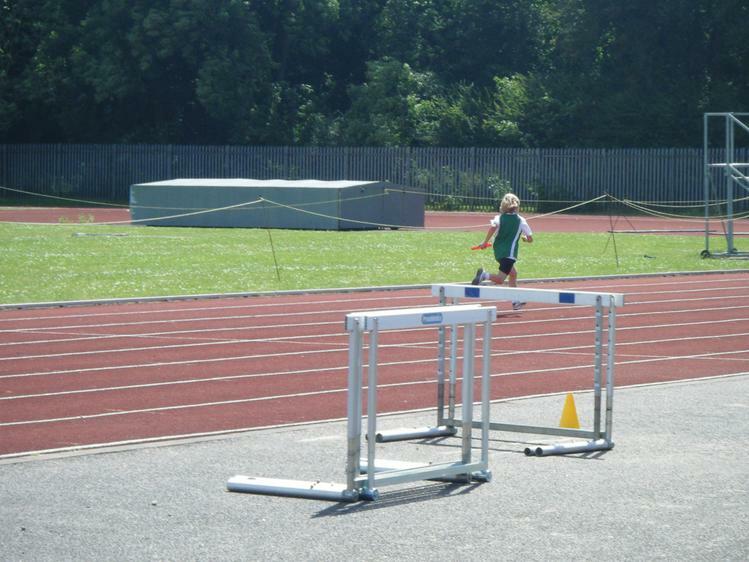 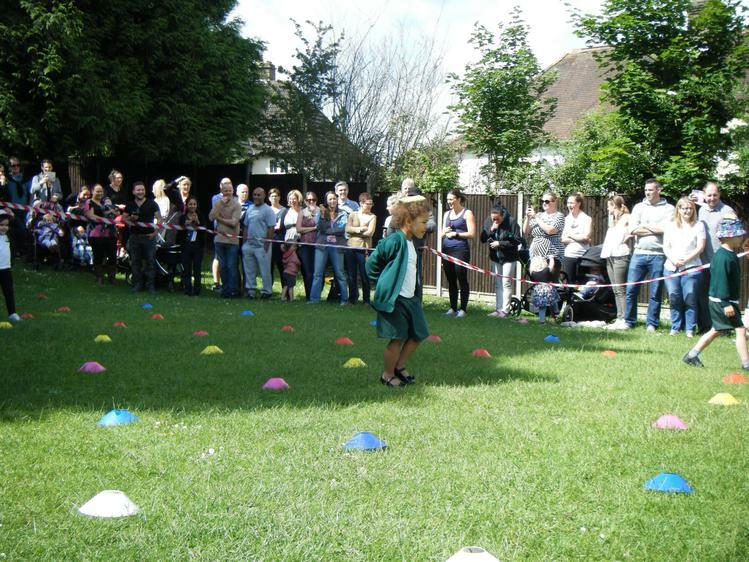 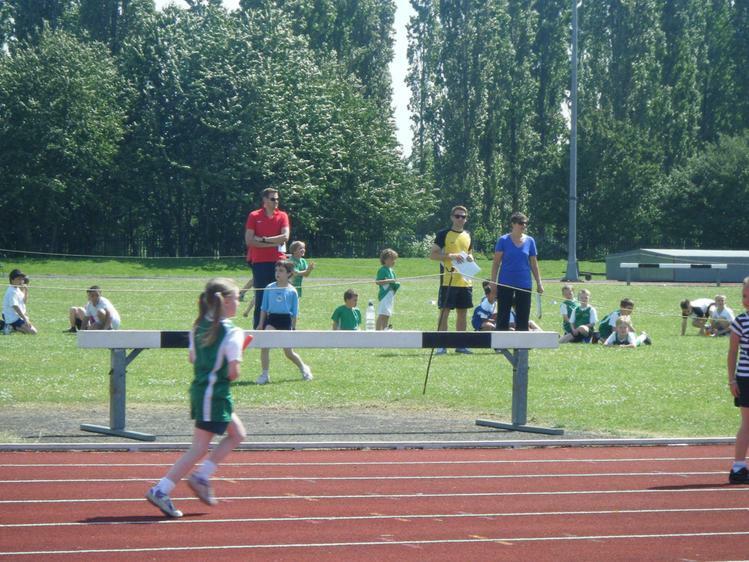 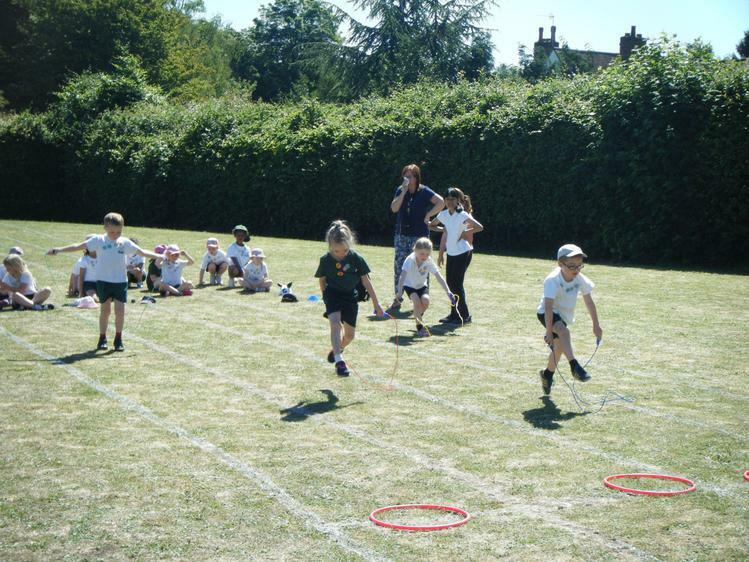 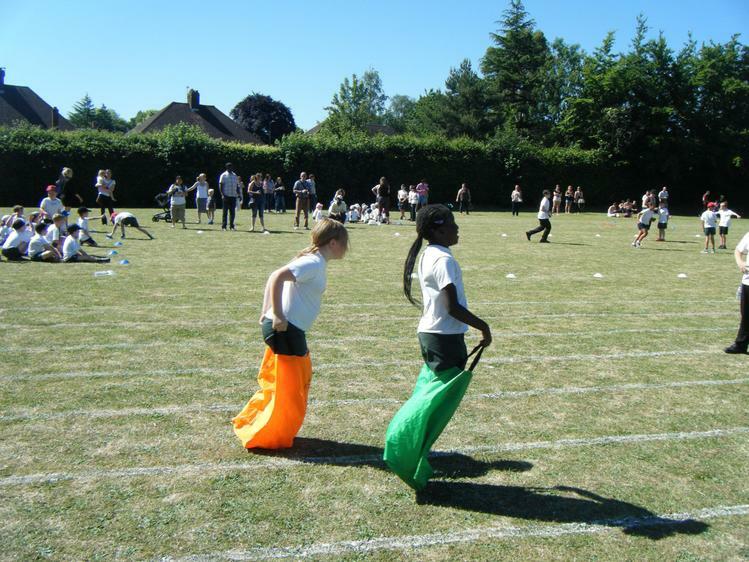 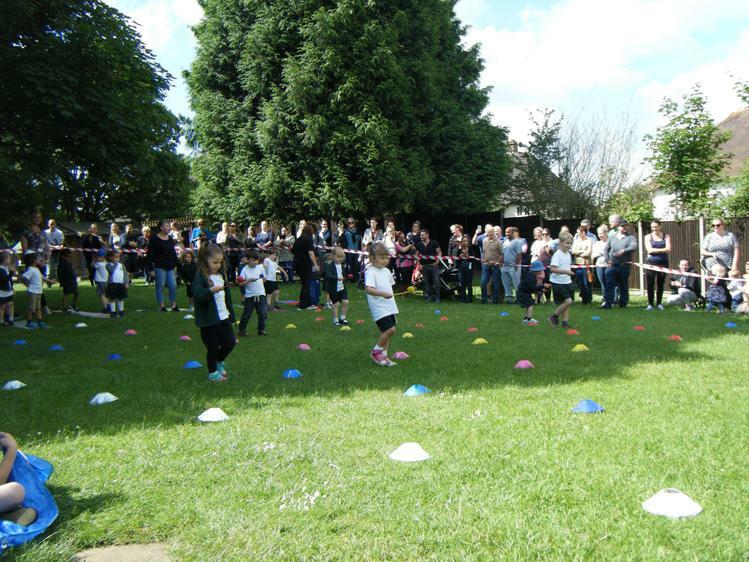 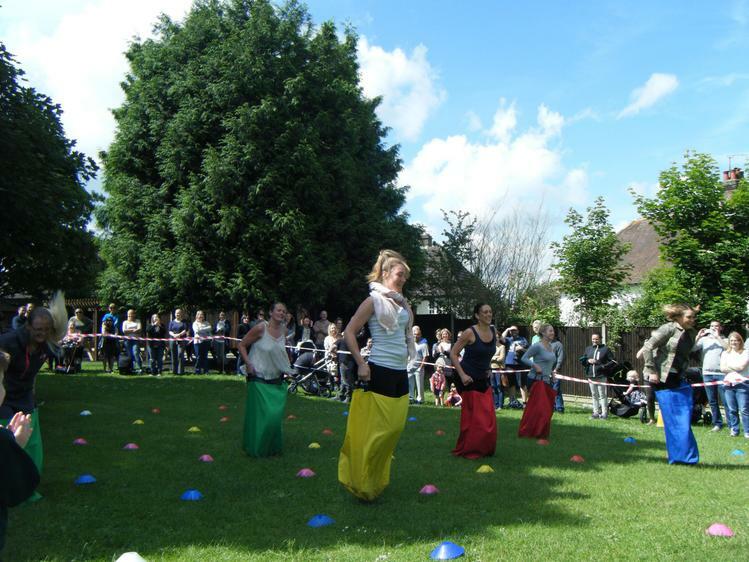 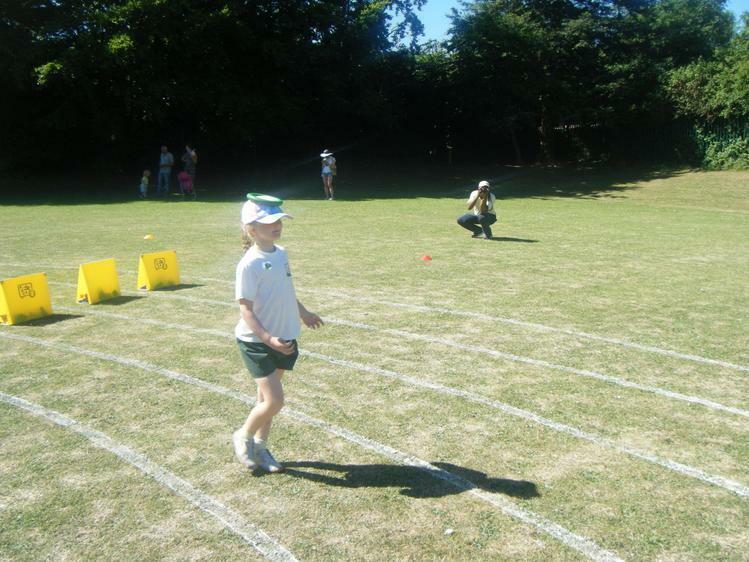 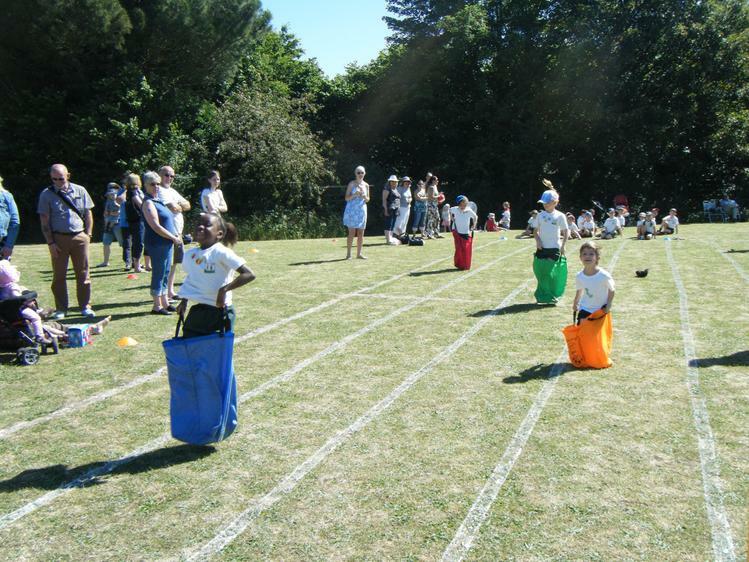 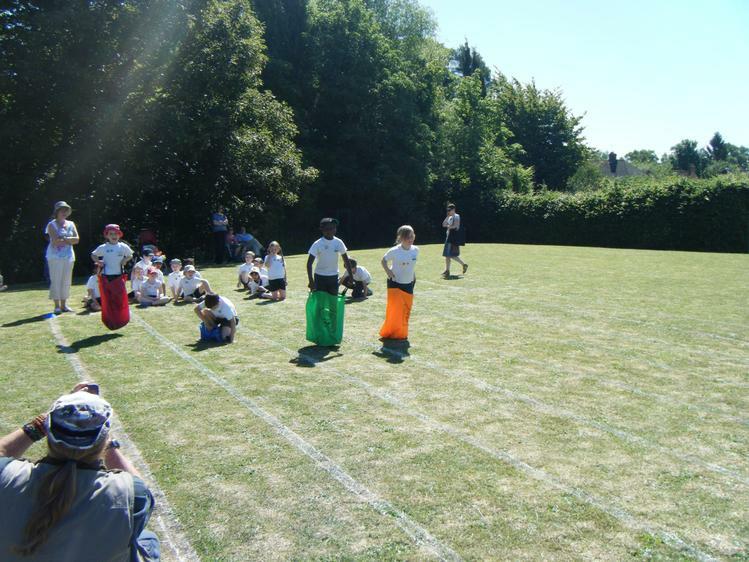 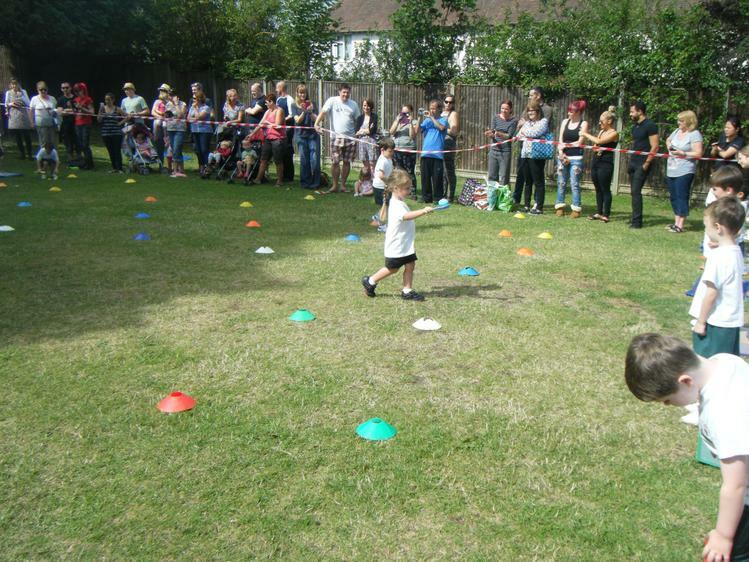 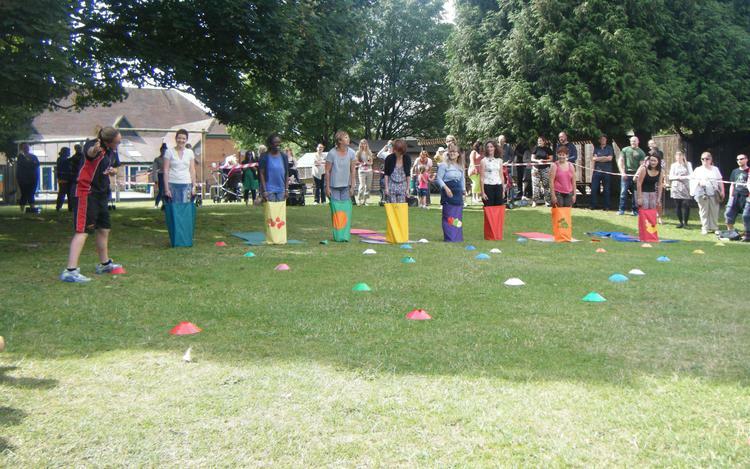 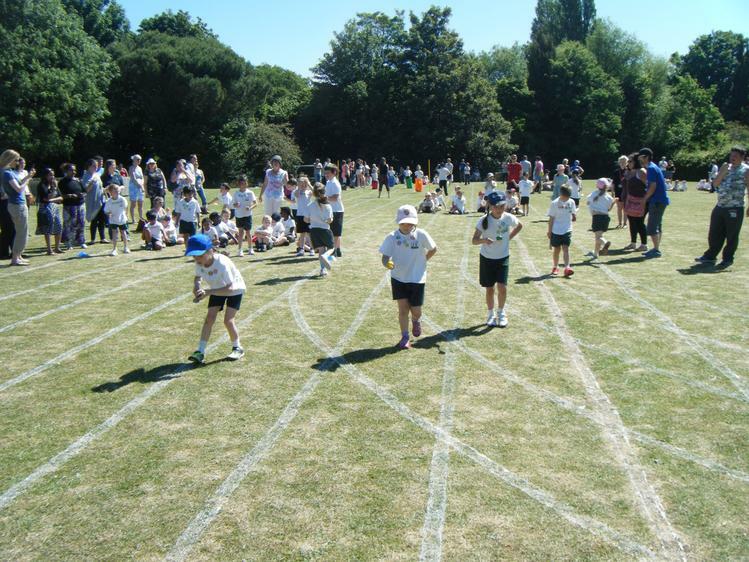 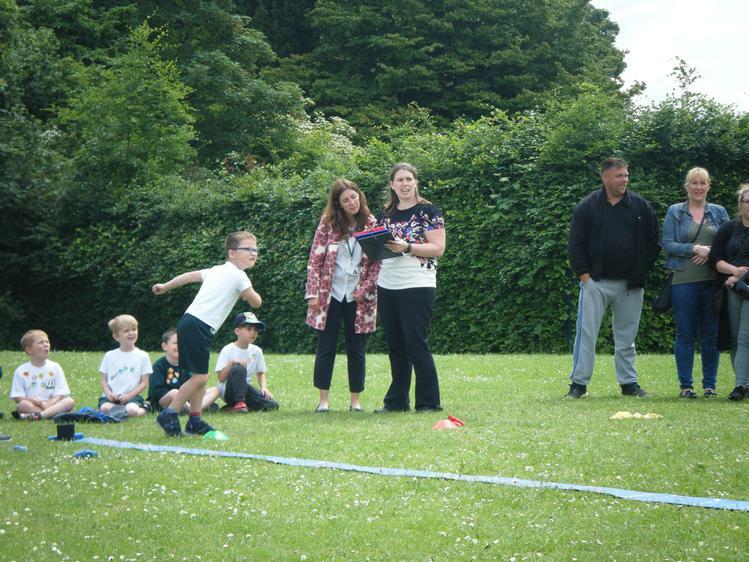 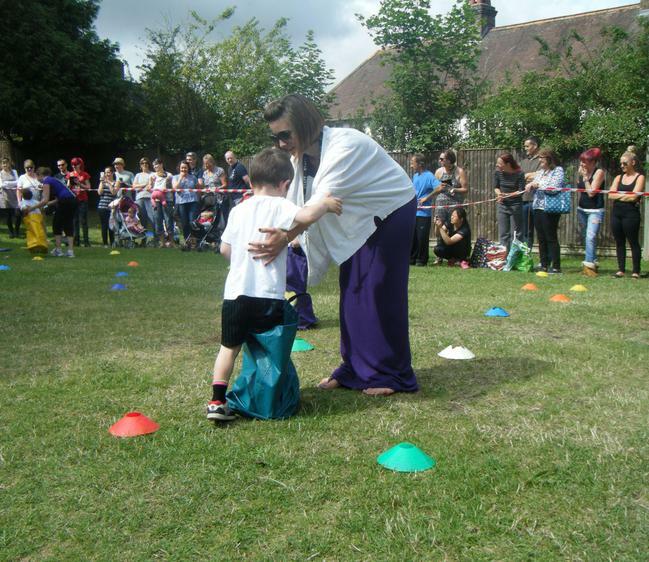 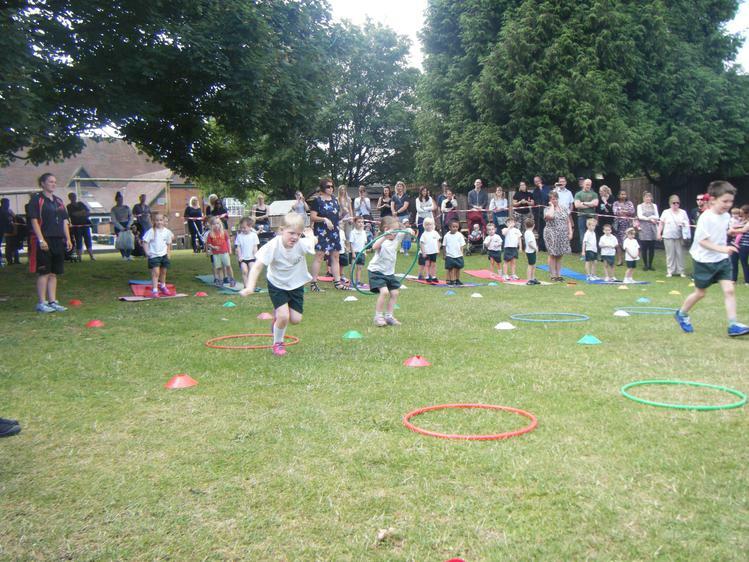 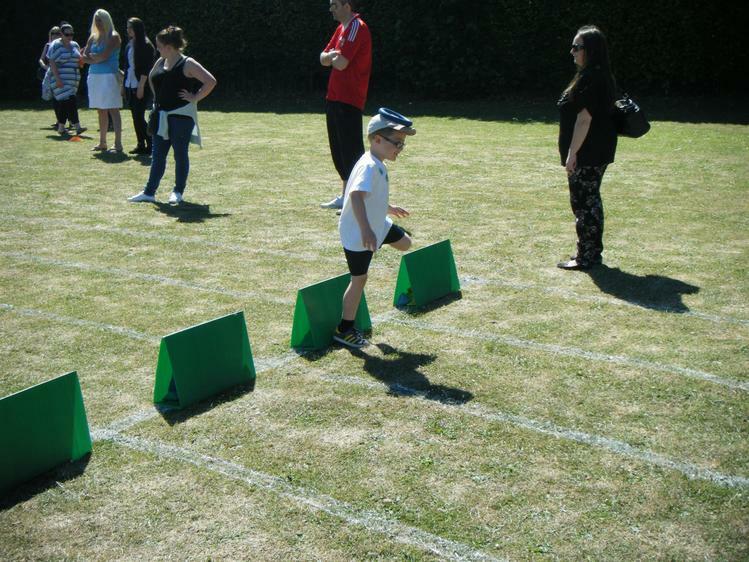 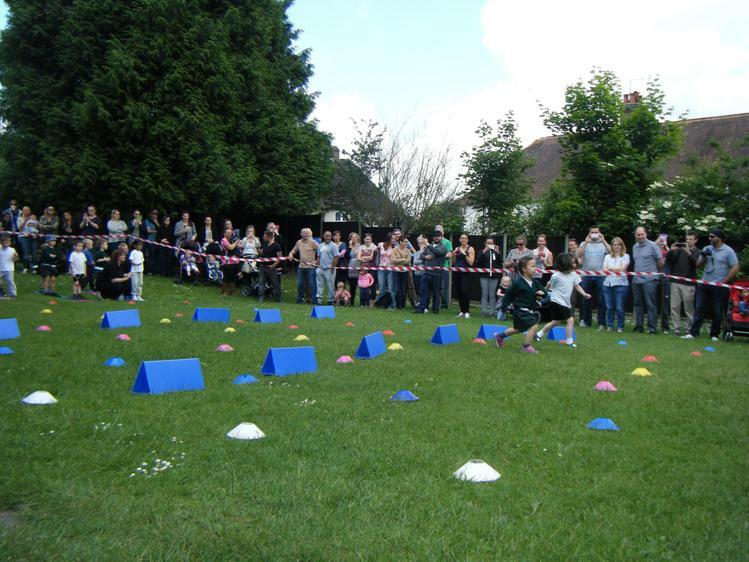 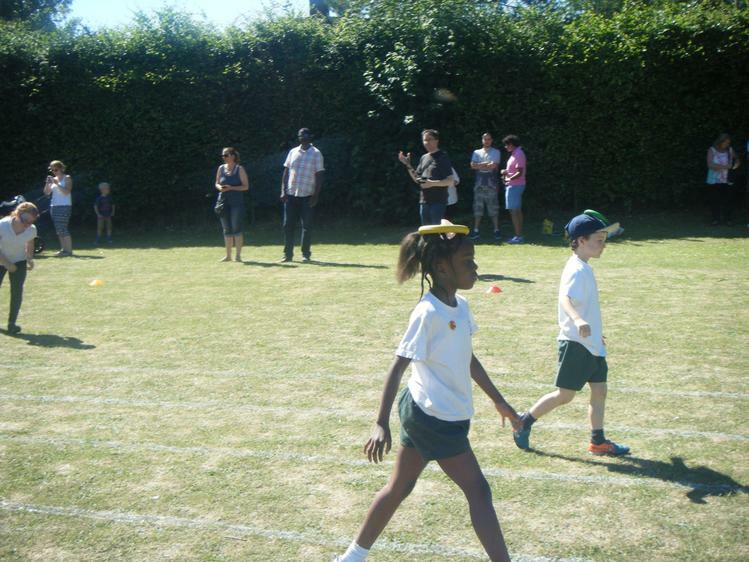 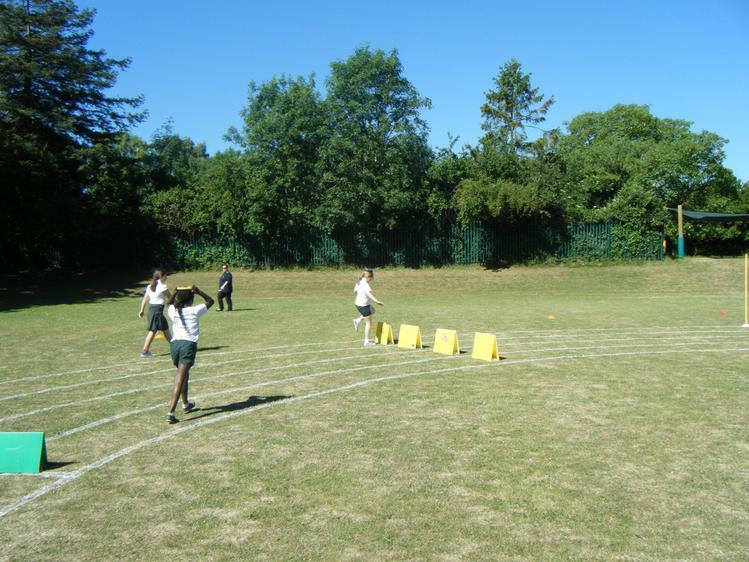 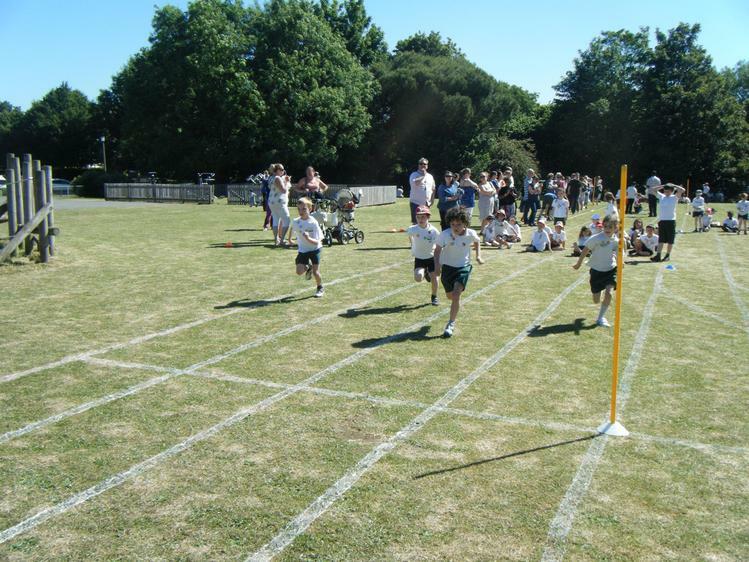 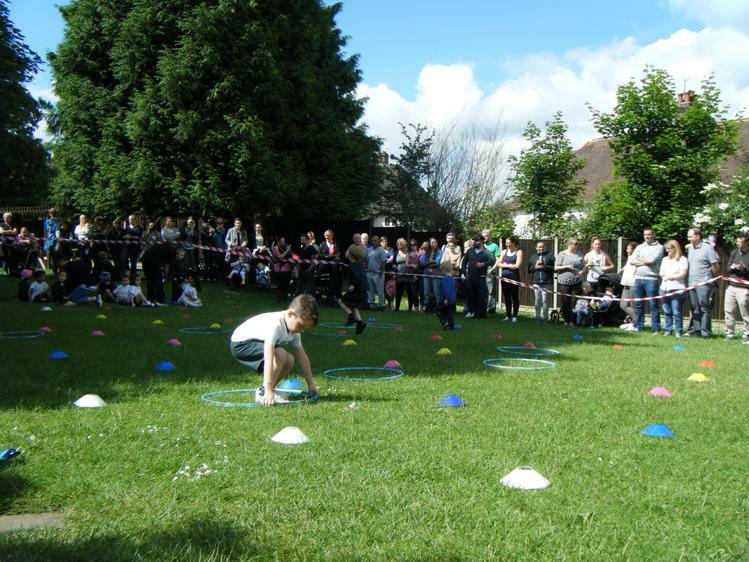 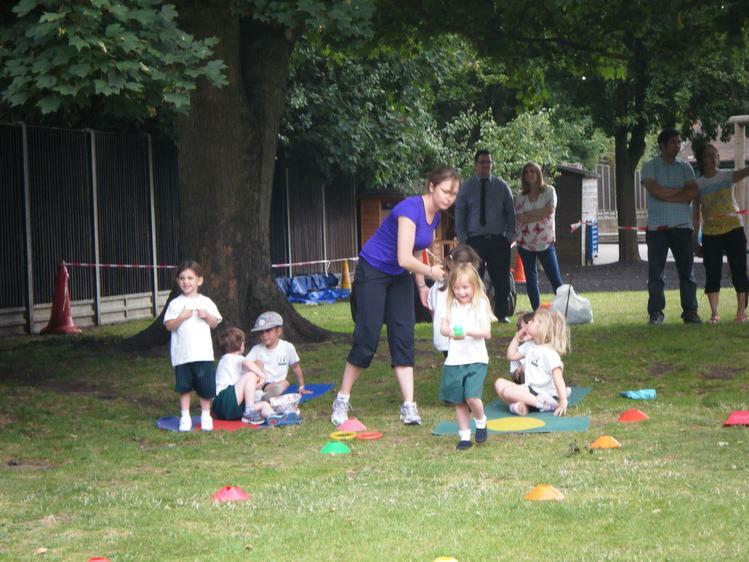 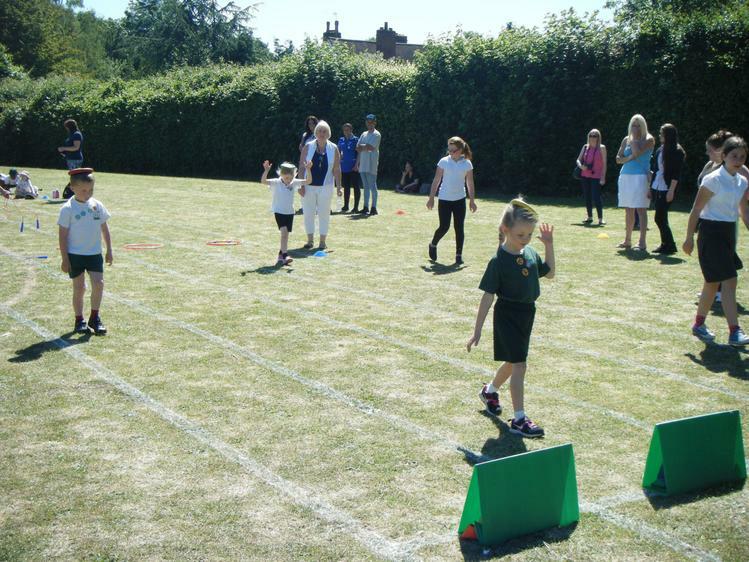 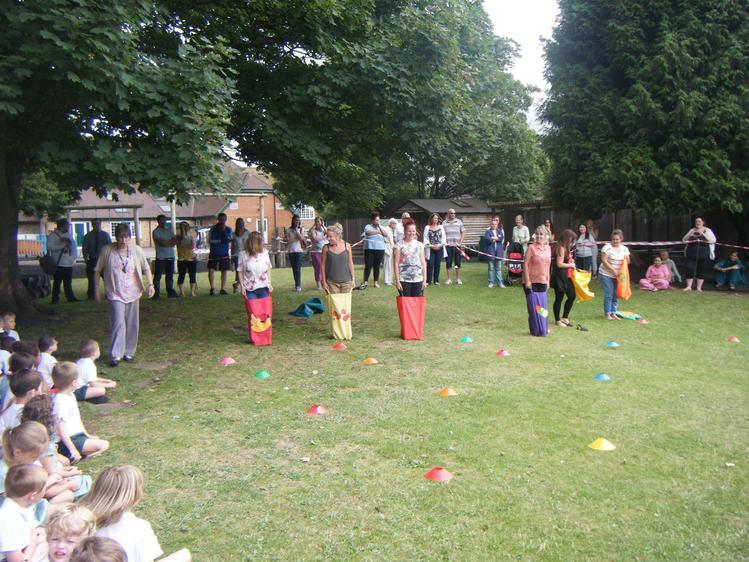 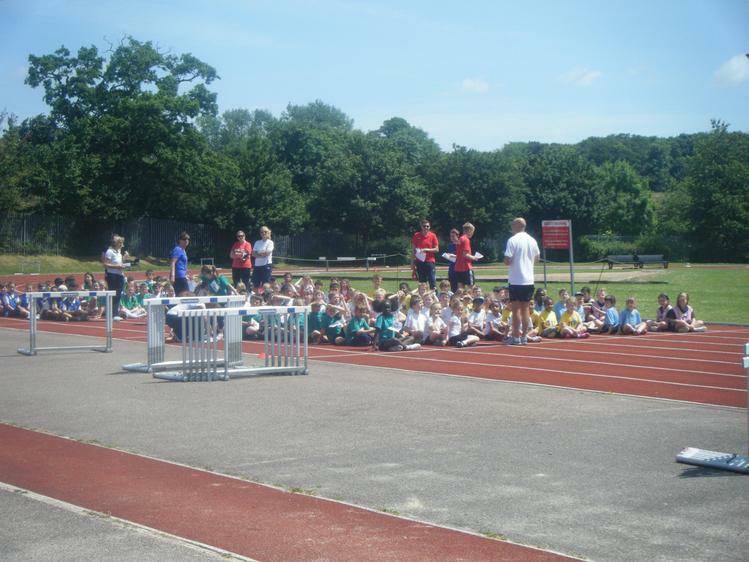 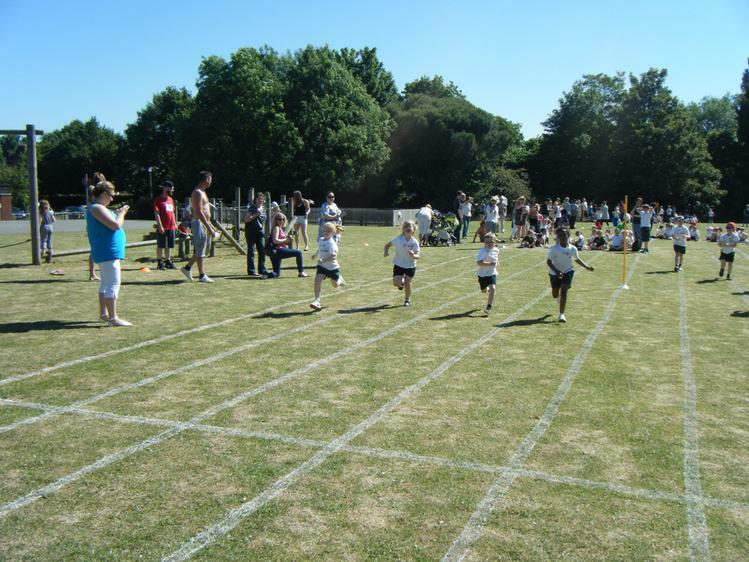 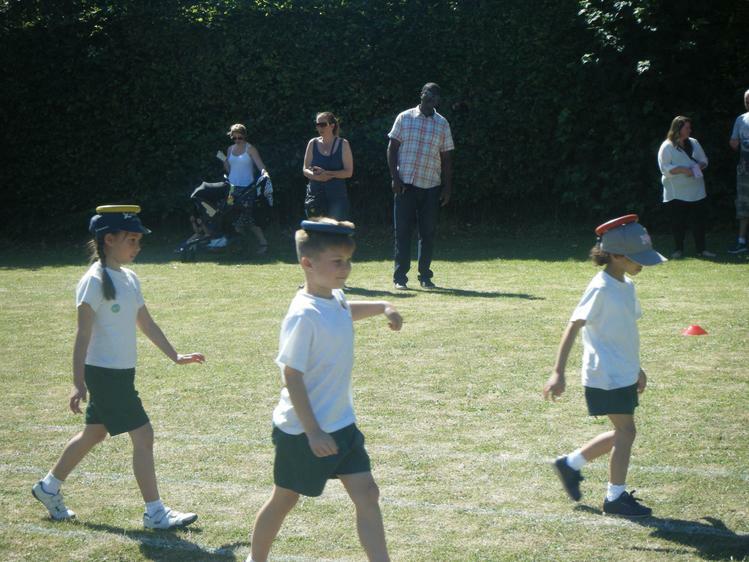 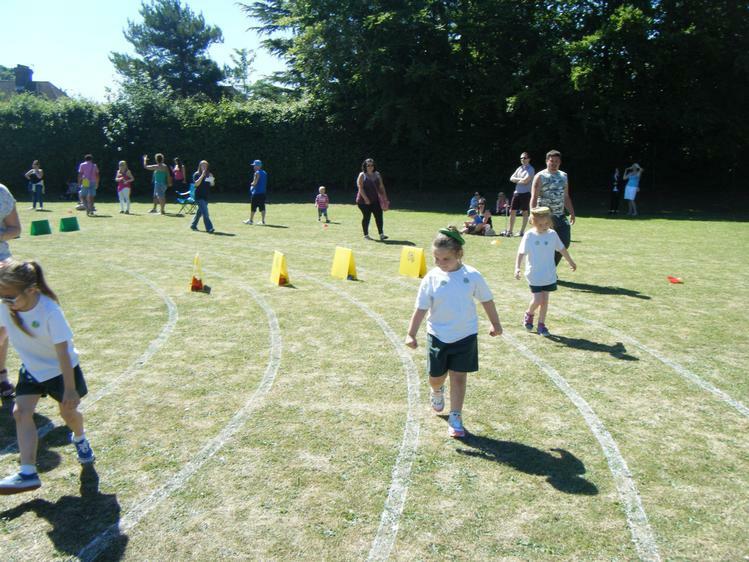 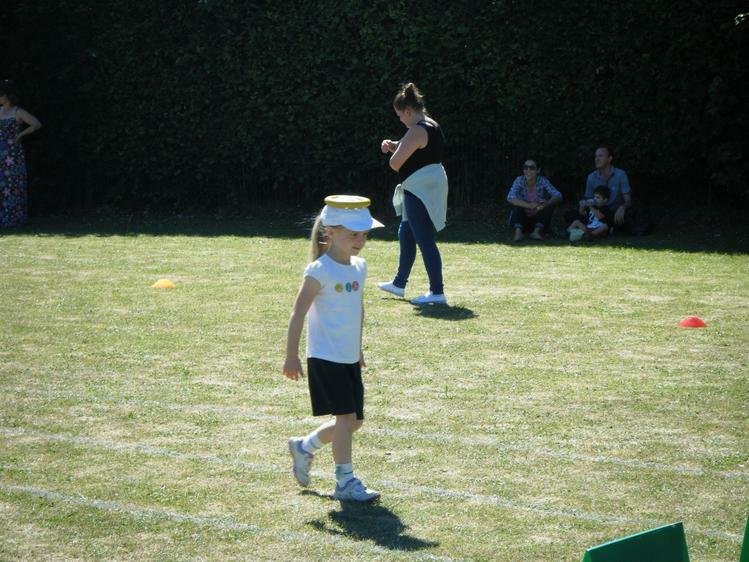 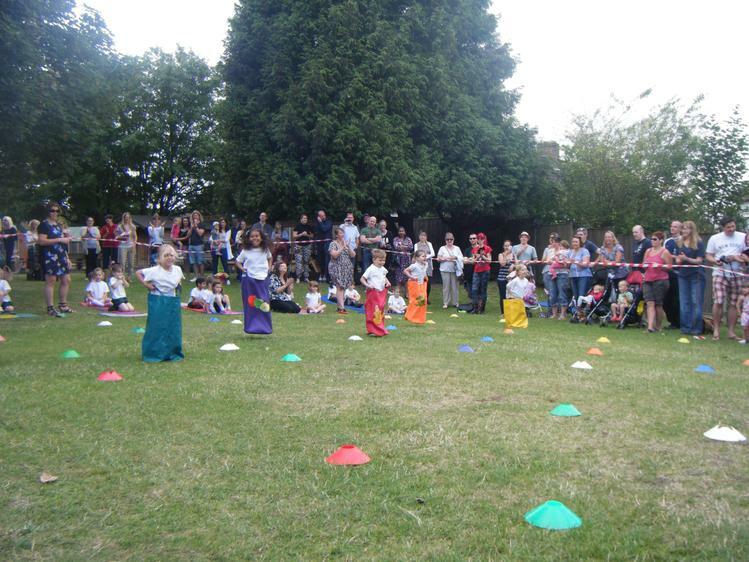 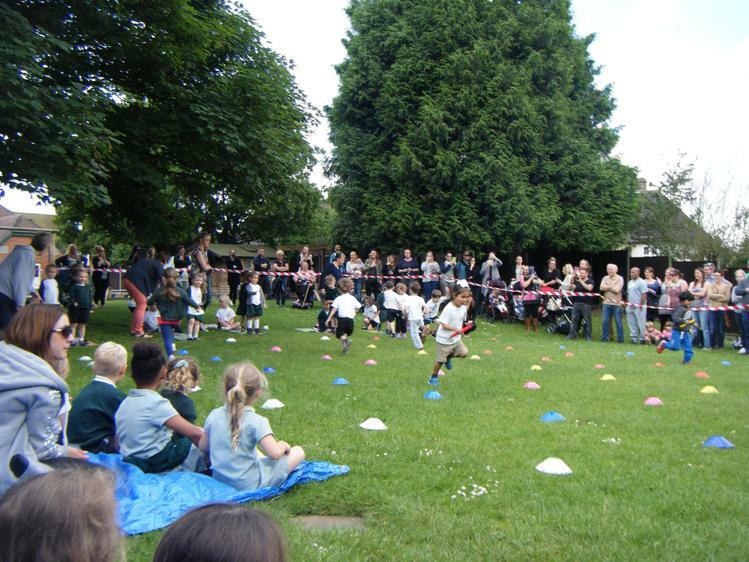 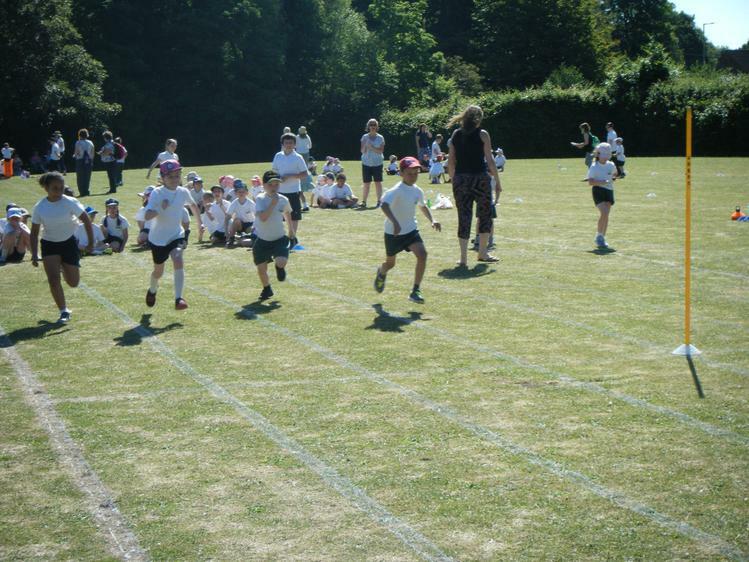 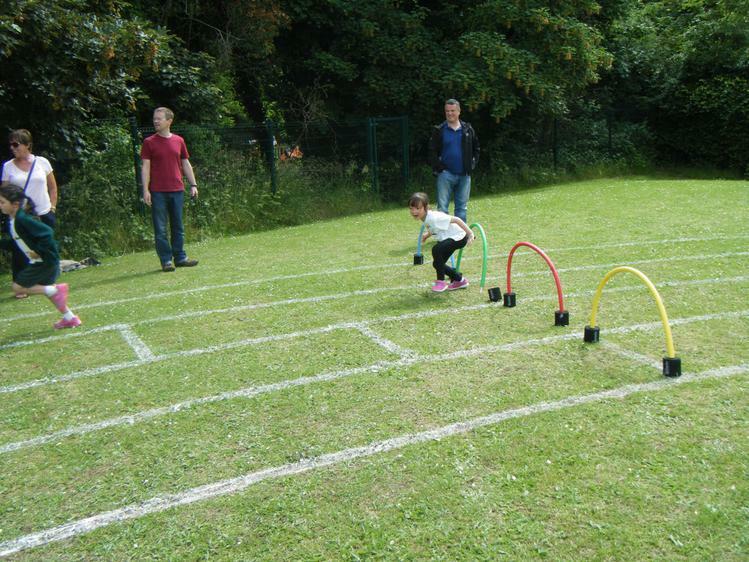 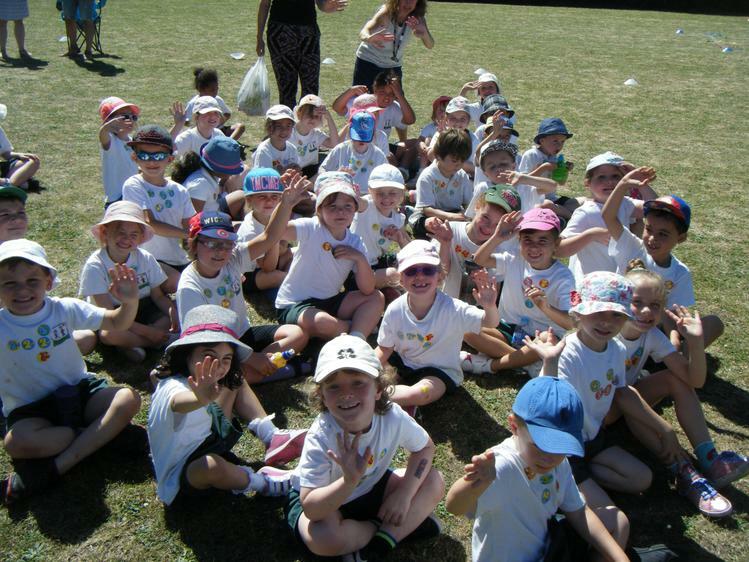 The sun was certainly shining for our KS1 Summer sports day this year! 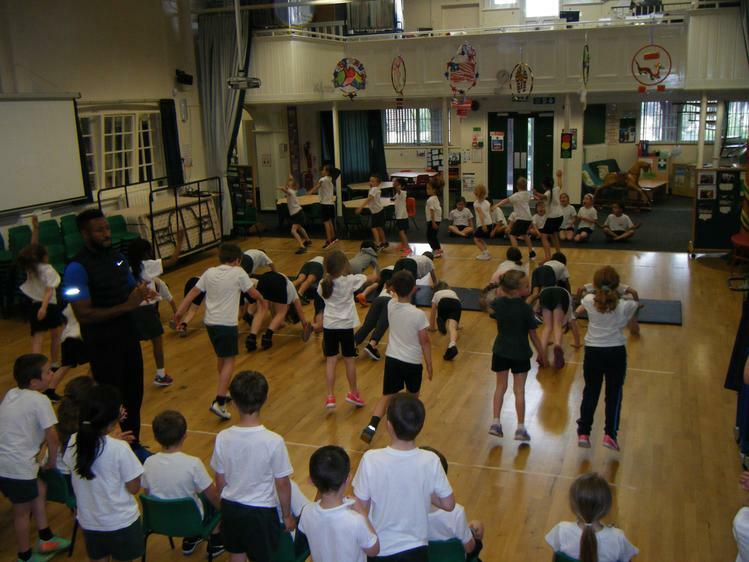 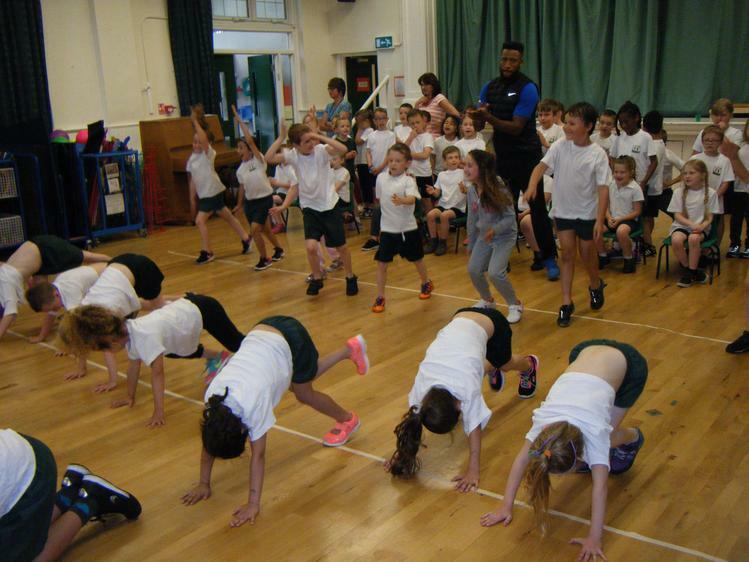 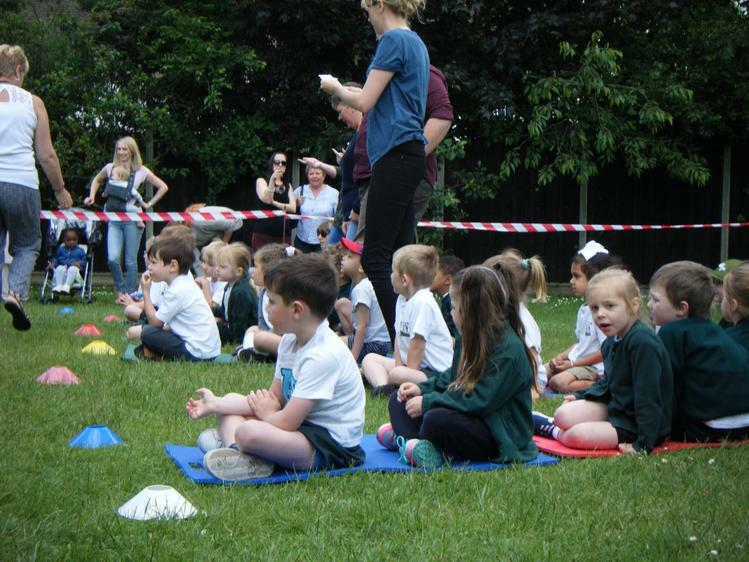 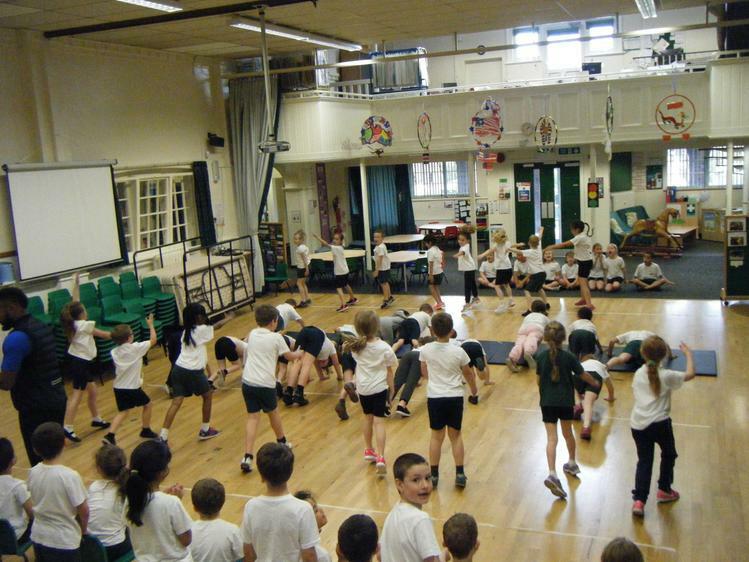 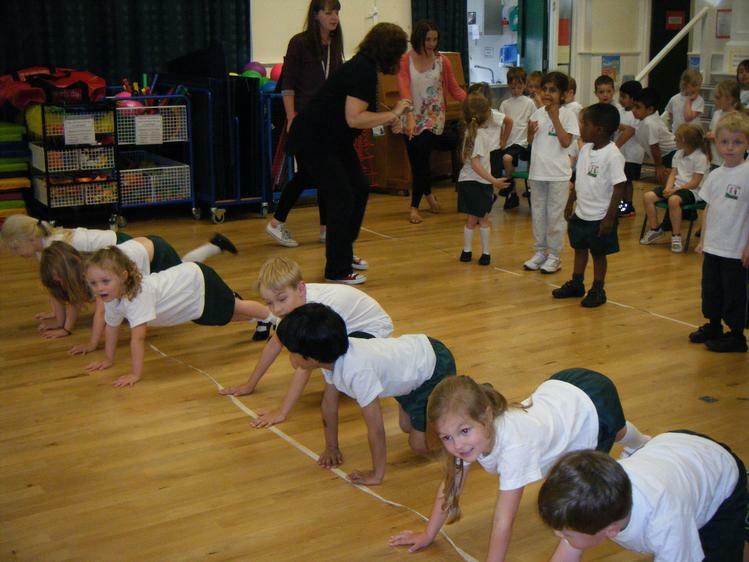 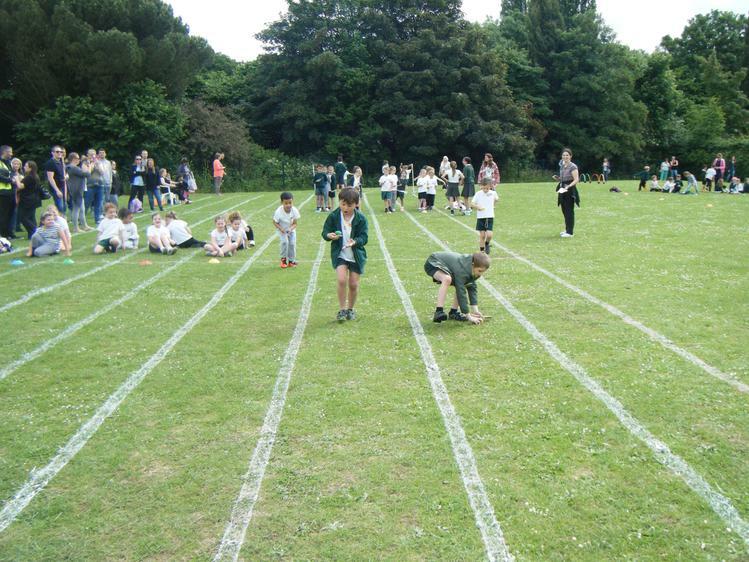 Our Year 1 and Year 2 children had a great morning at Pixmore Junior School taking part in lots of races organised by Mr Willard and his Year 6 helpers. 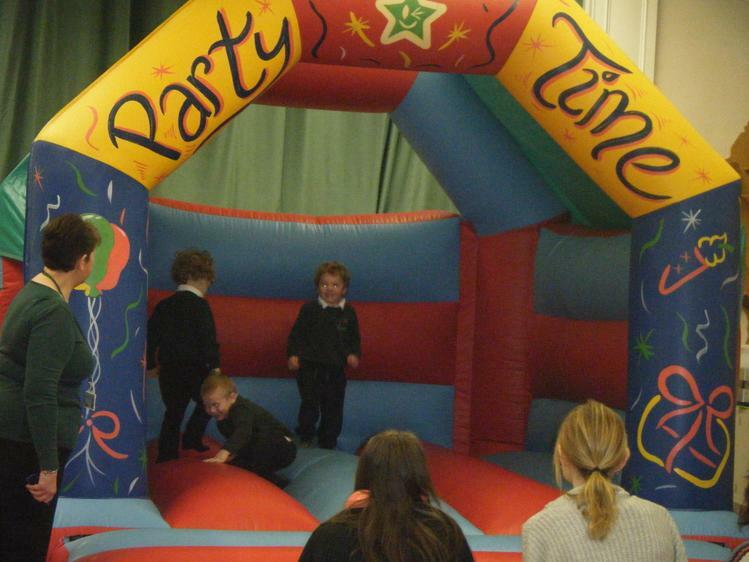 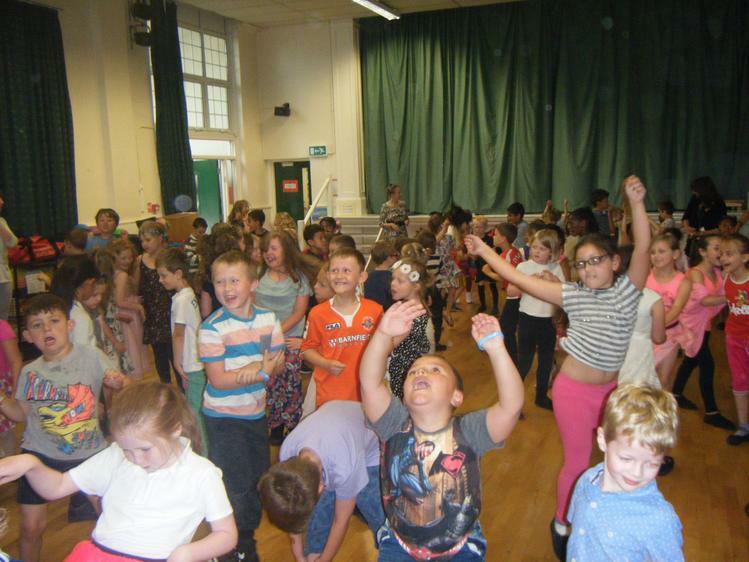 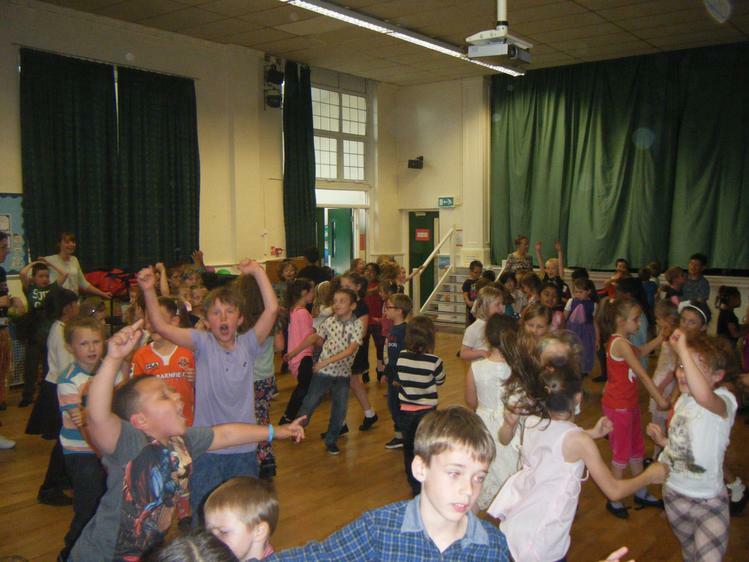 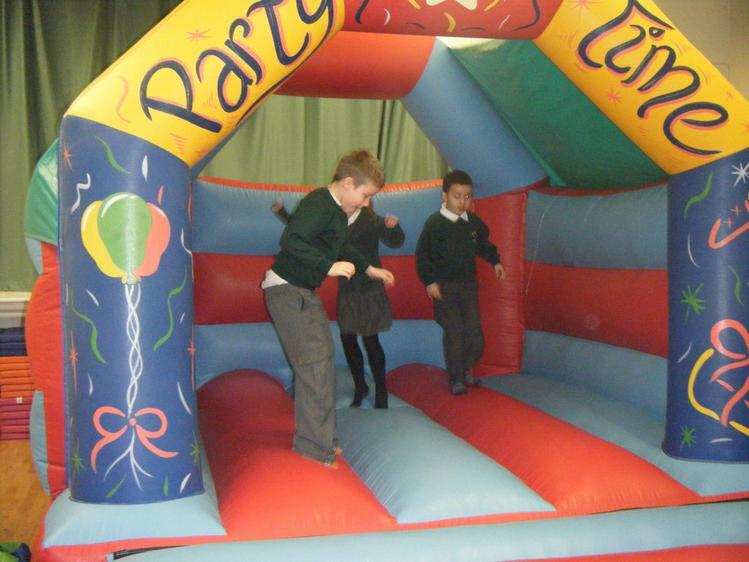 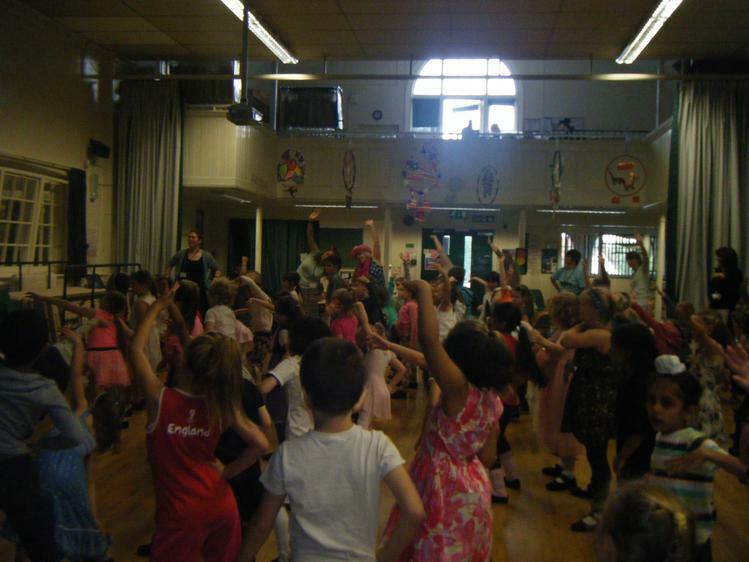 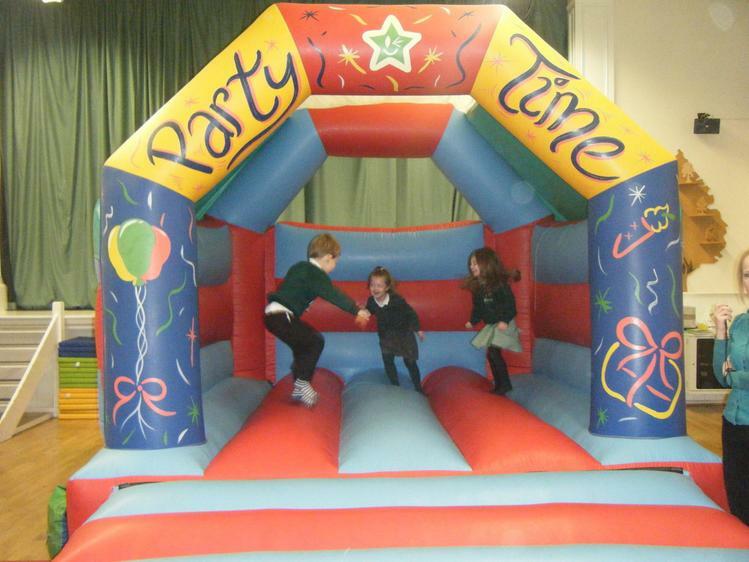 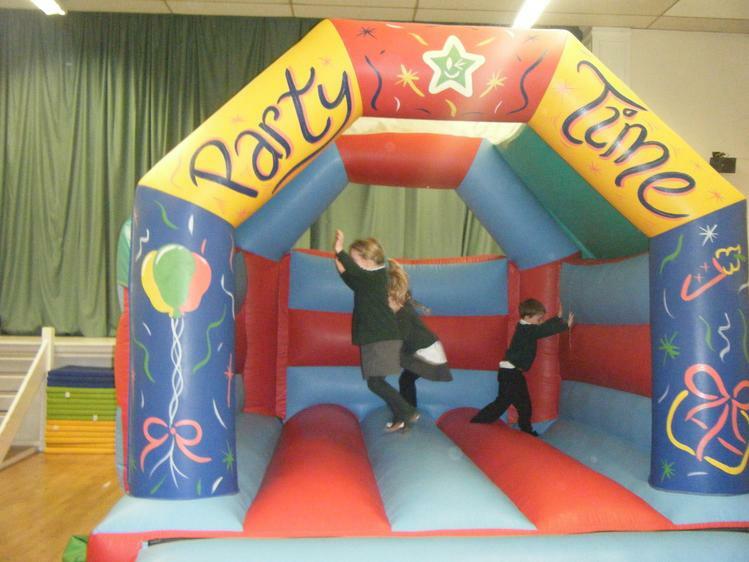 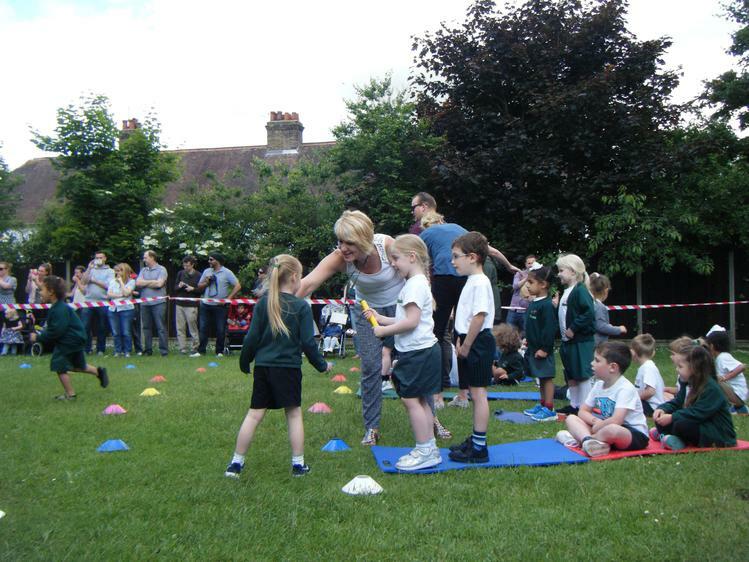 It was lovely to see the children taking part so enthusiastically and celebrating their achievements with each other! 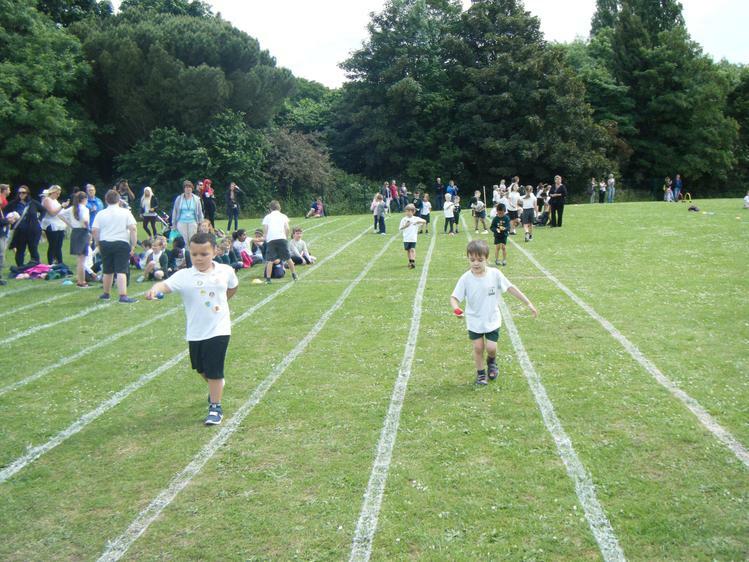 A total of 720 stickers were awarded for fantastic sportsmanship and speedy racing – we are so proud of all of the children! 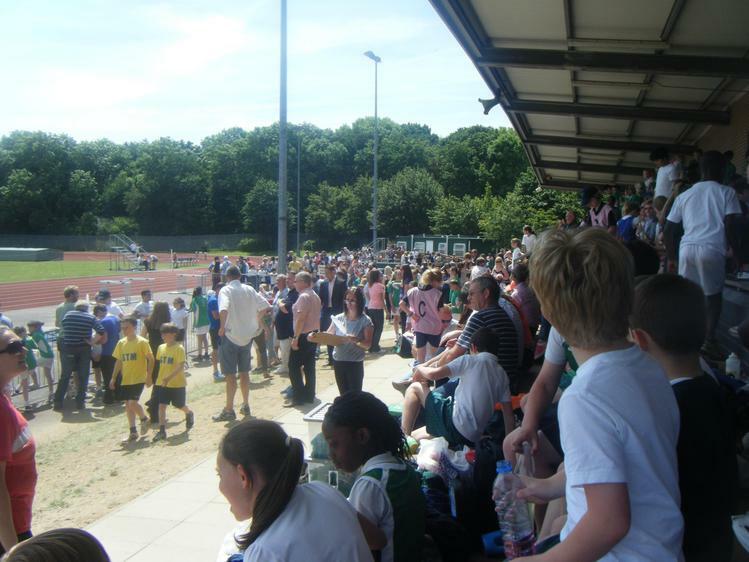 Thank you to all of the grown-ups who were able to come and watch the events and cheer the children on, there was a great atmosphere and we hope that you all enjoyed it! 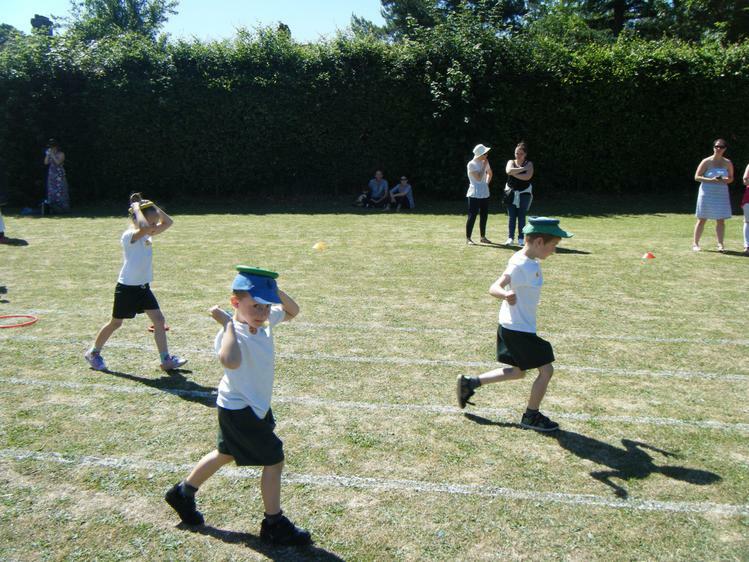 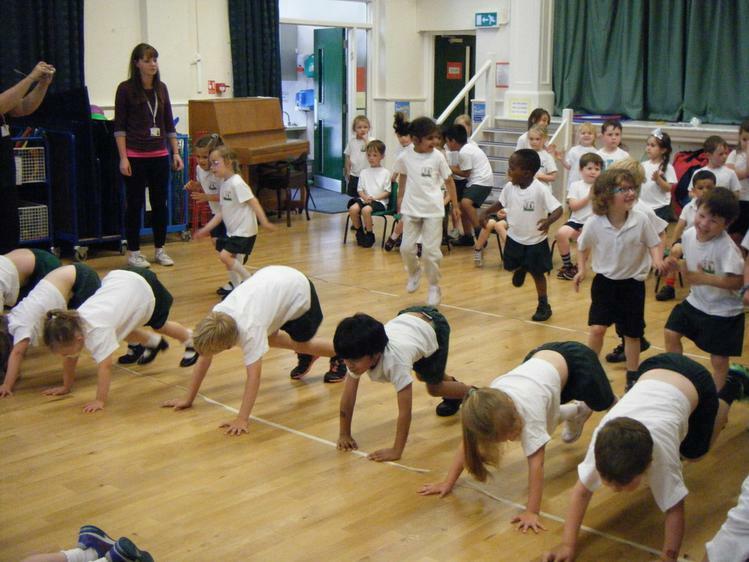 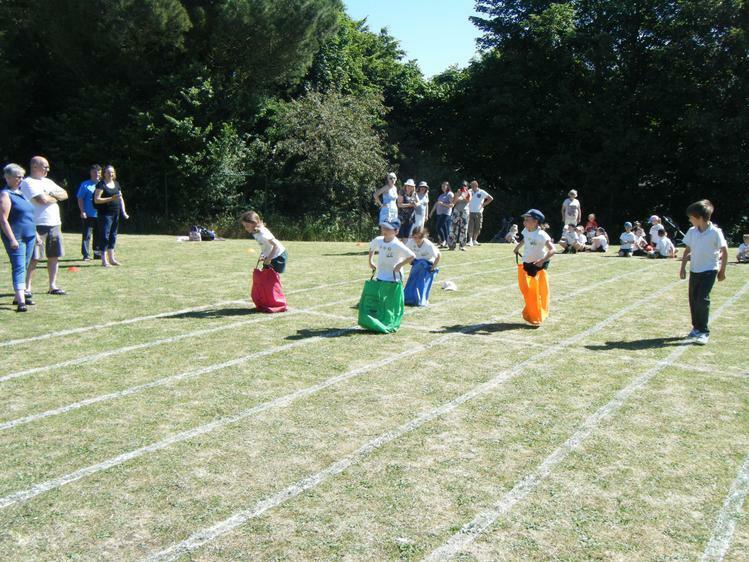 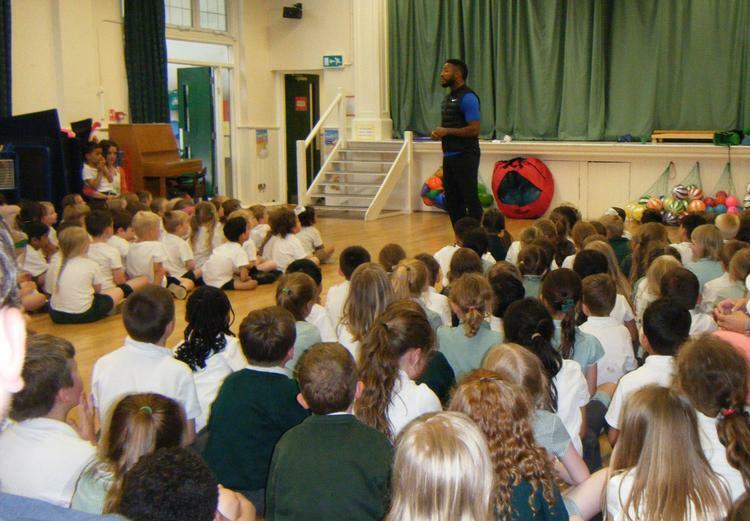 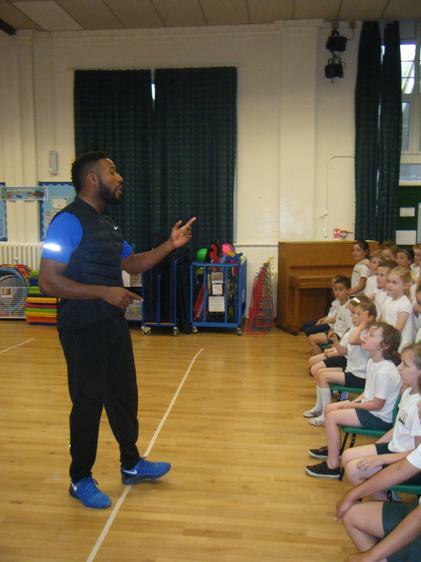 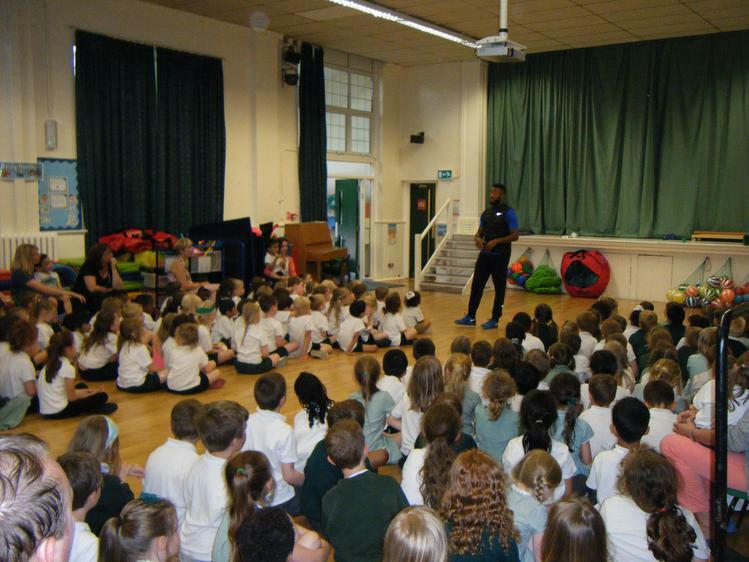 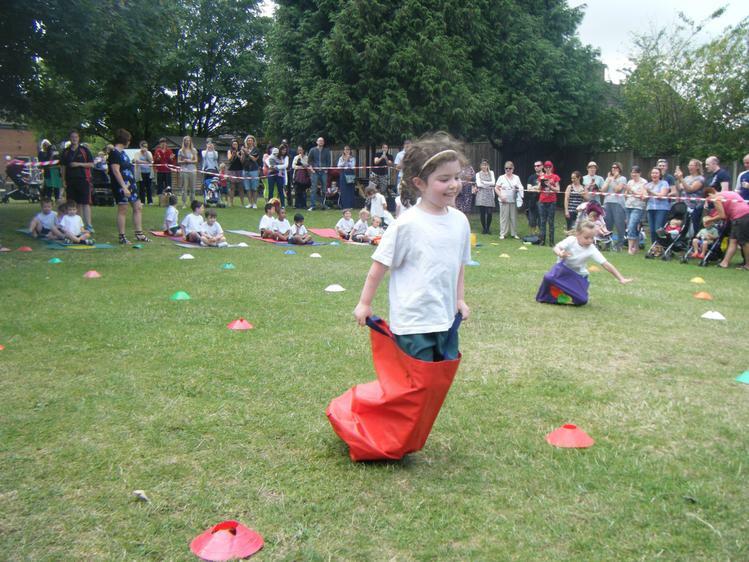 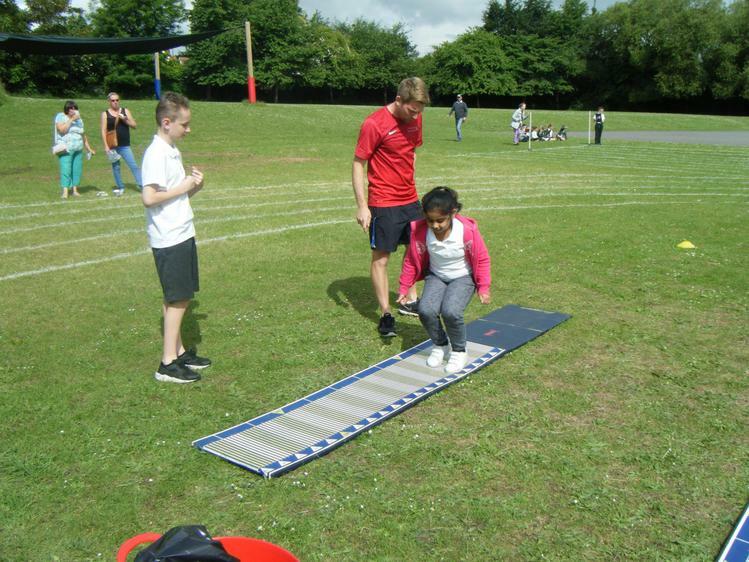 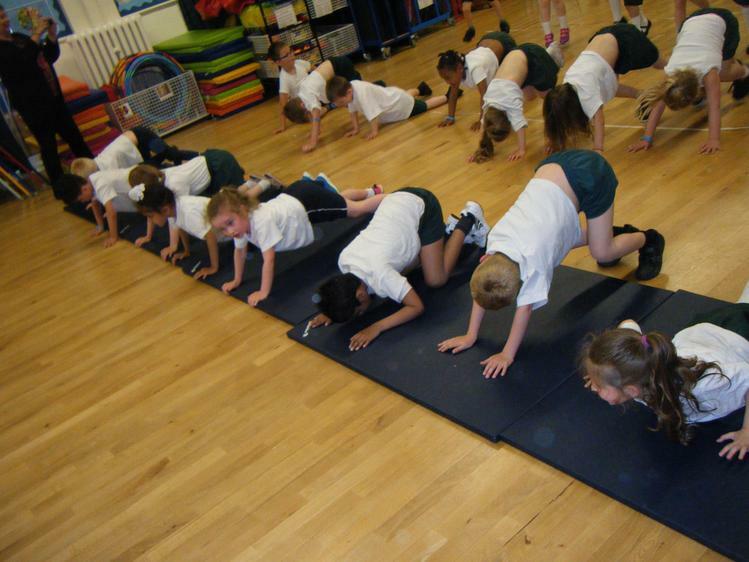 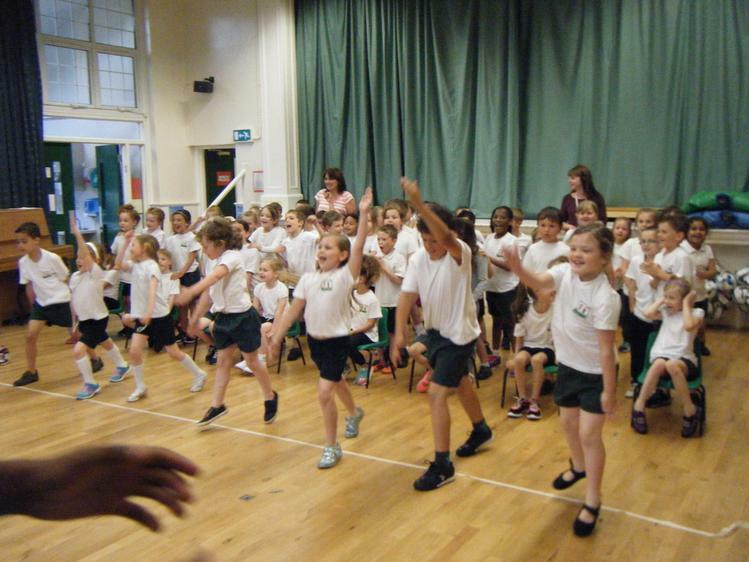 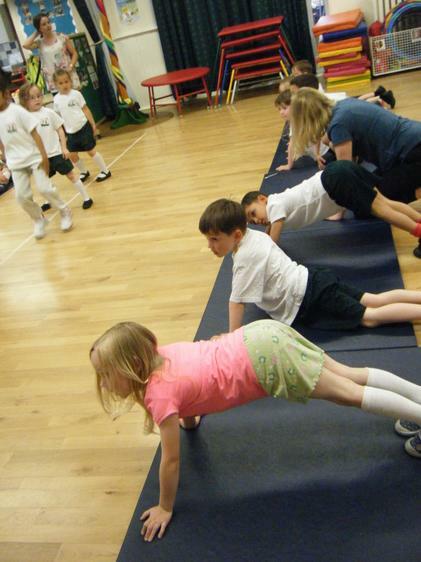 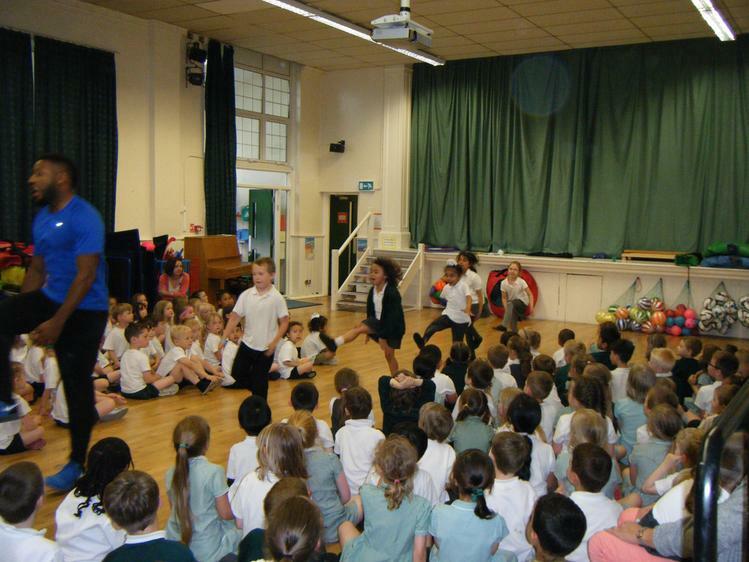 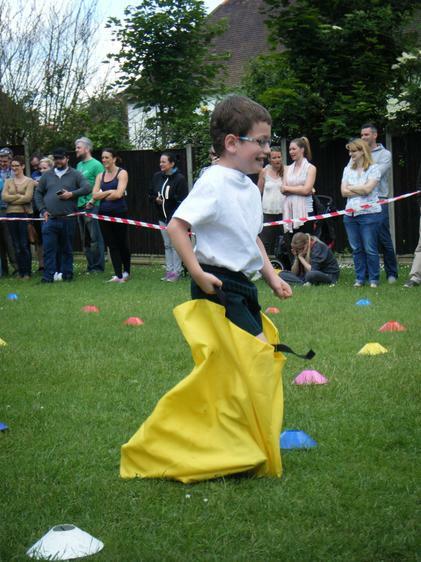 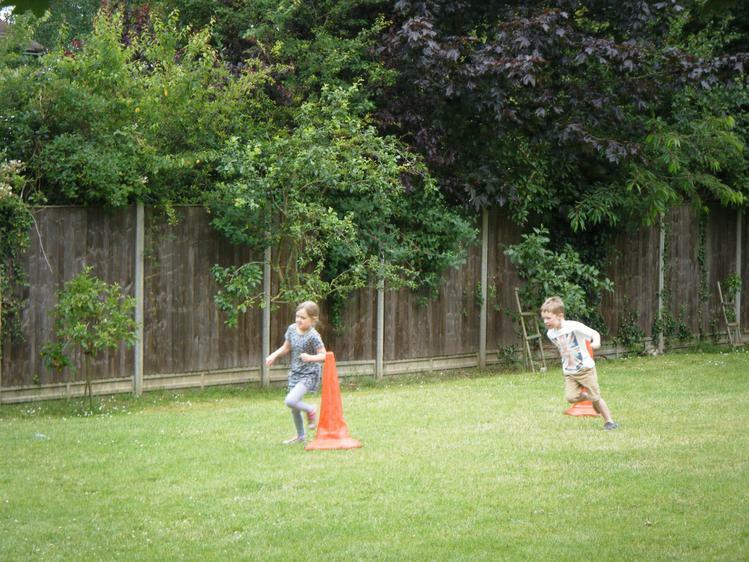 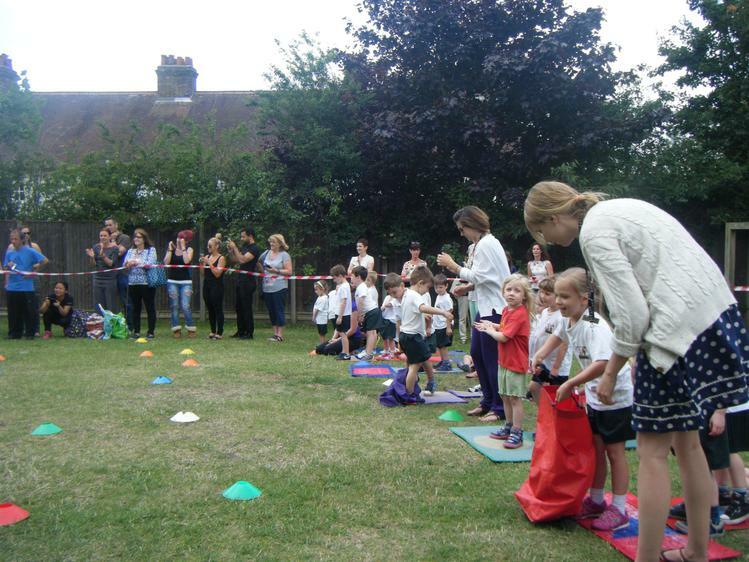 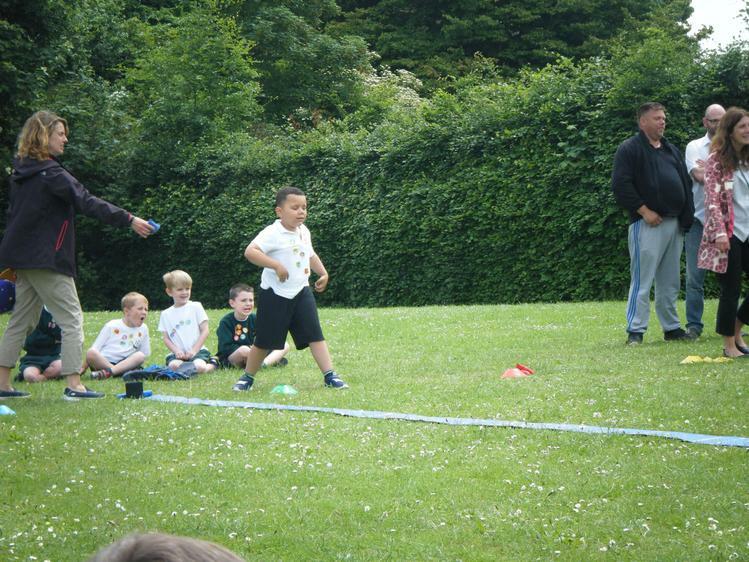 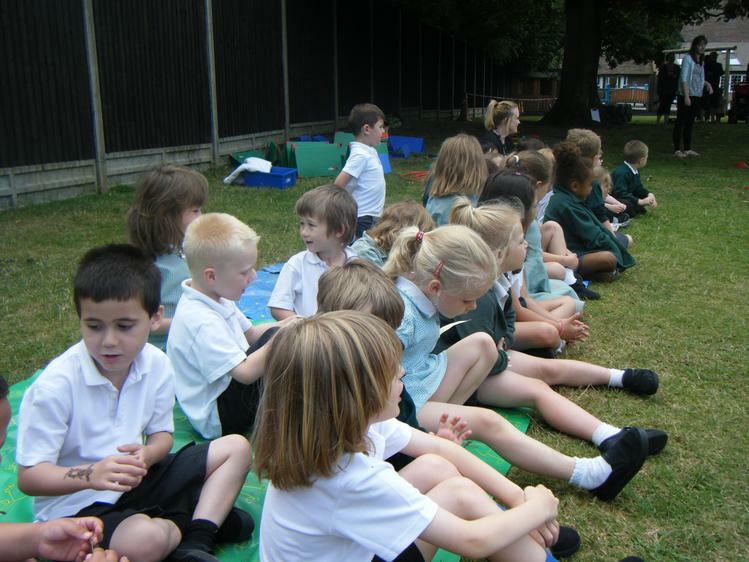 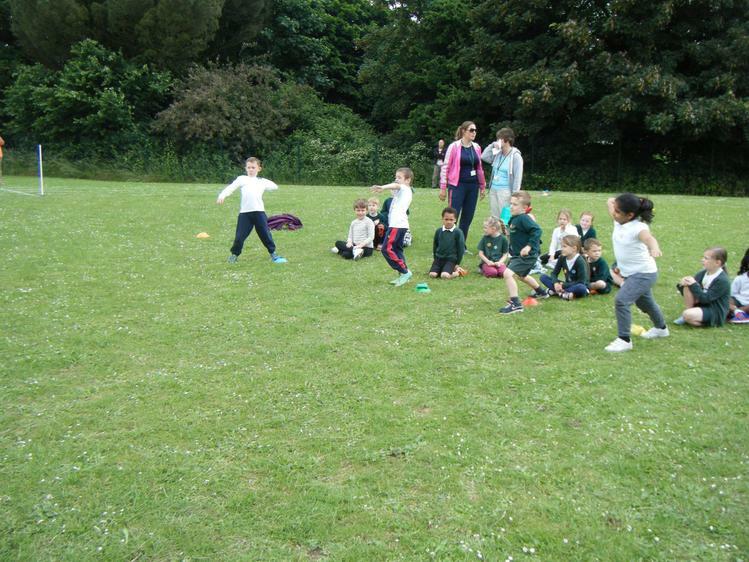 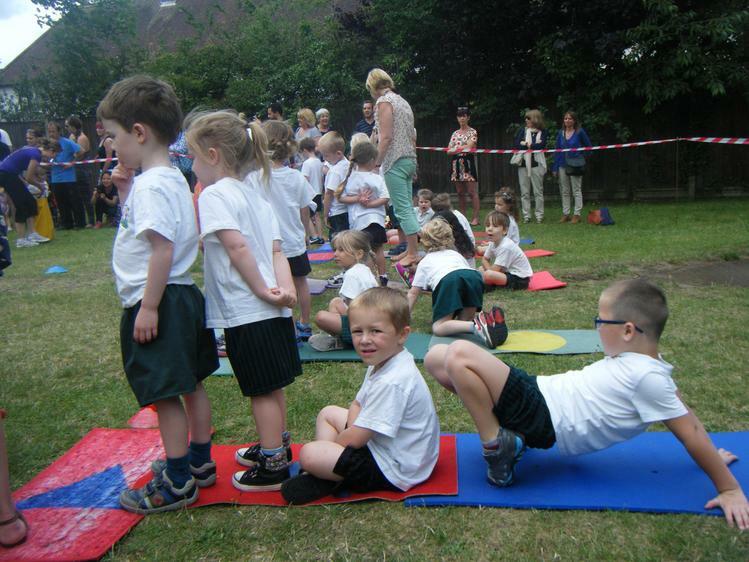 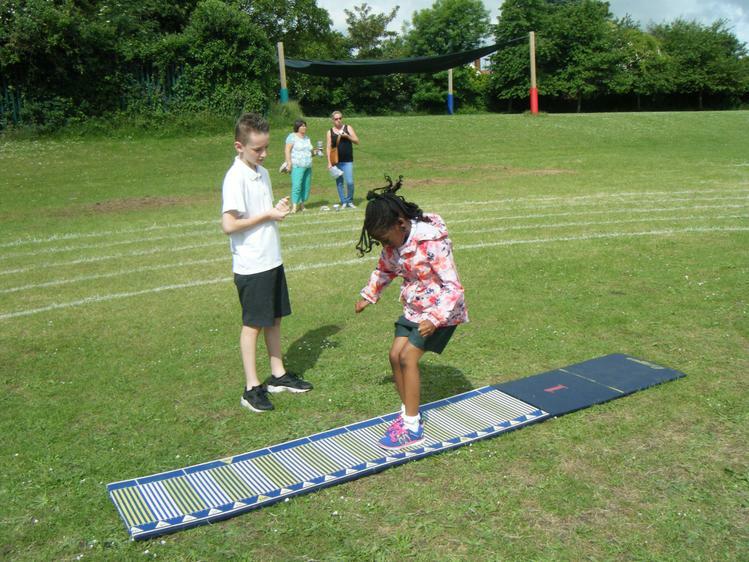 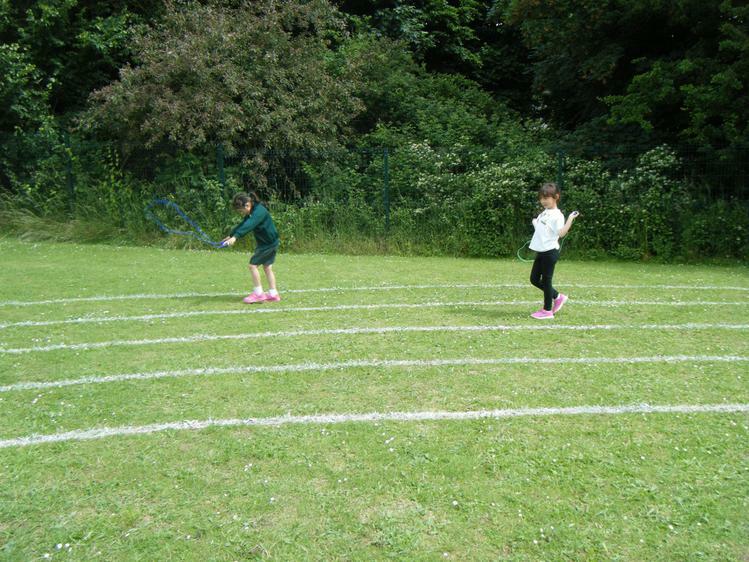 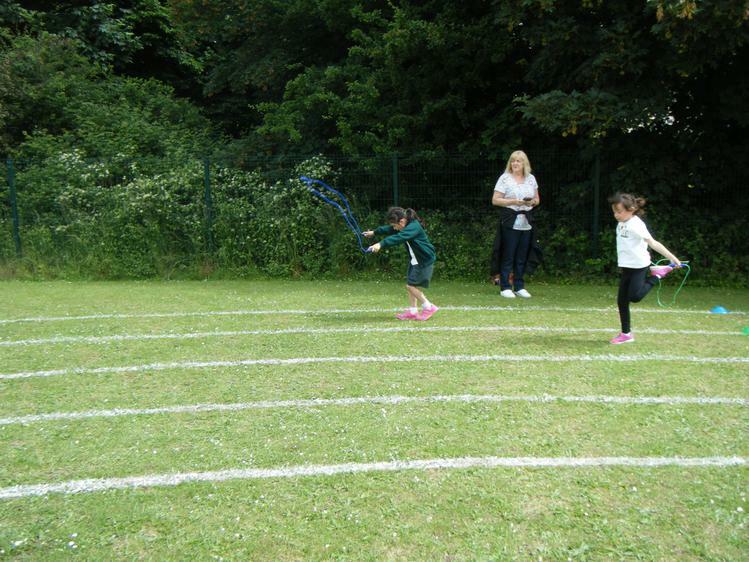 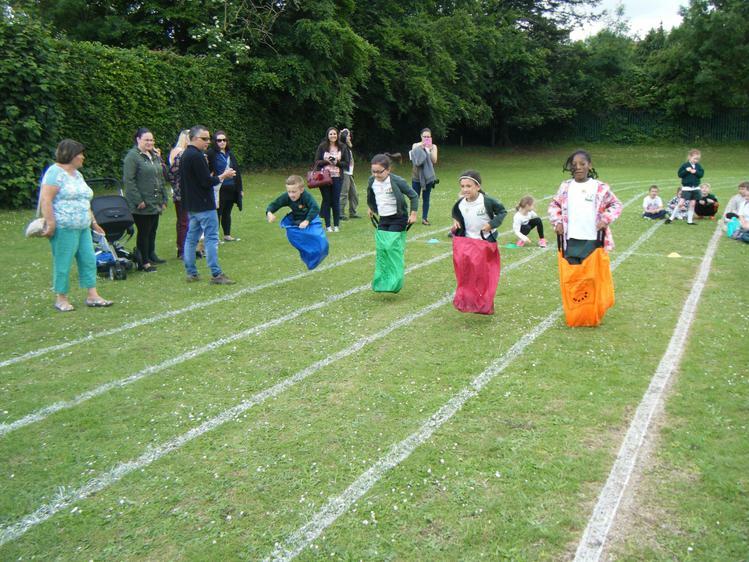 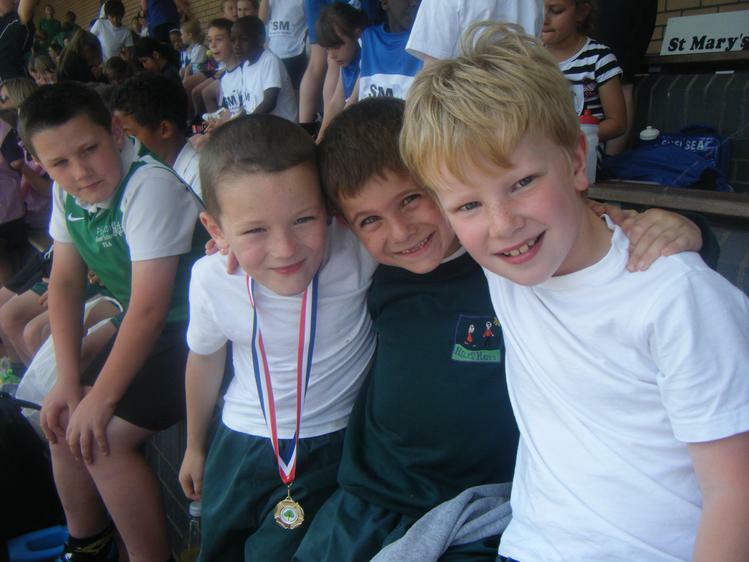 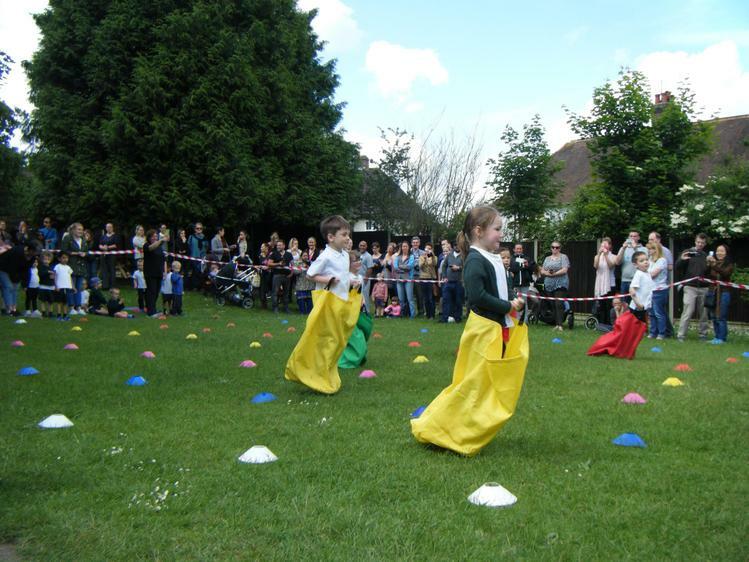 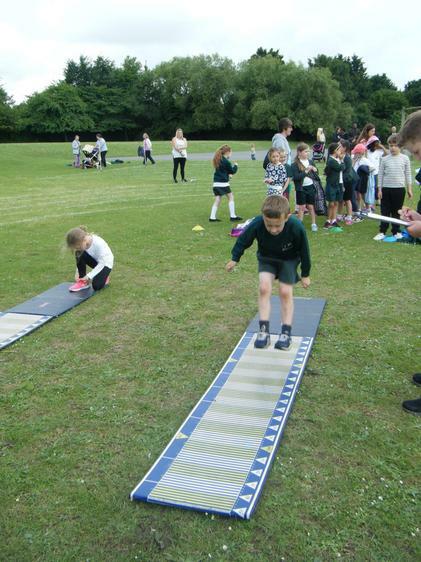 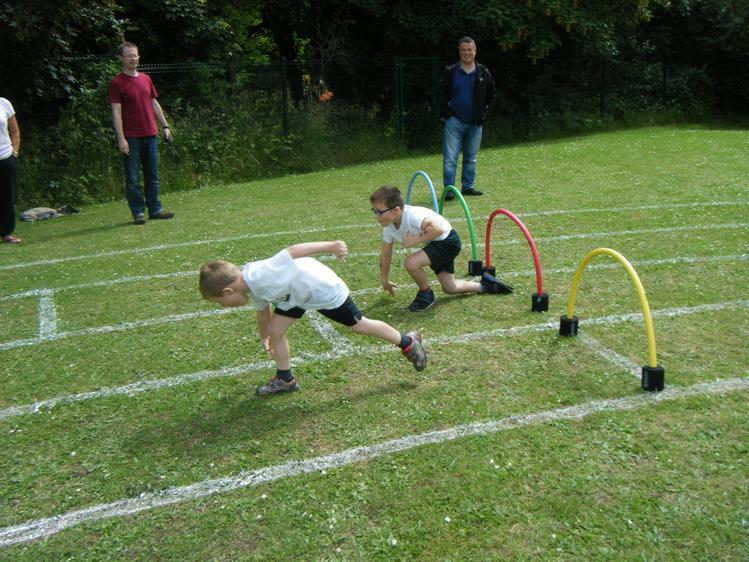 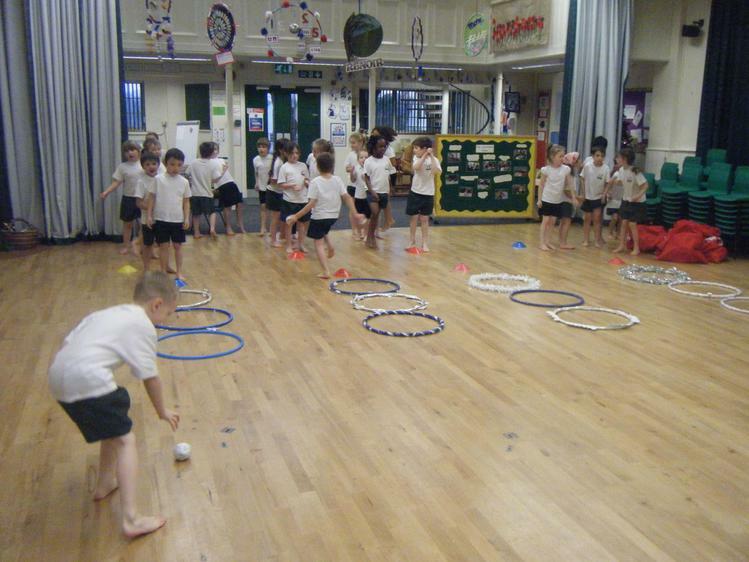 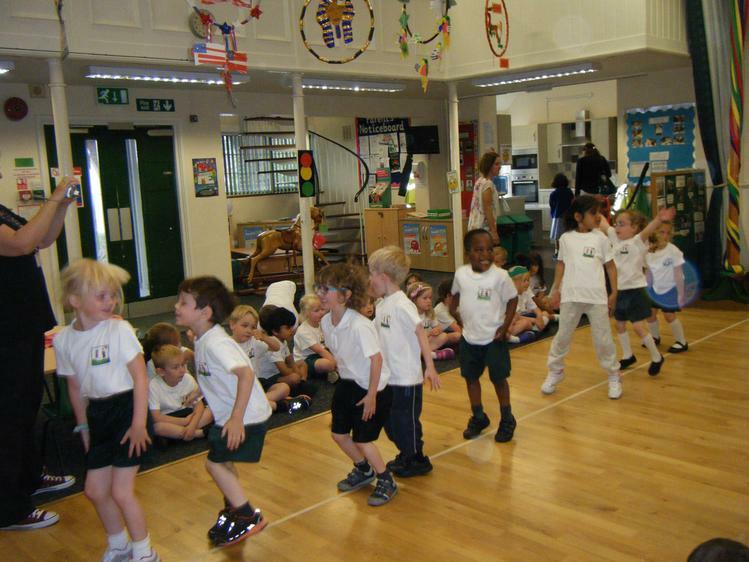 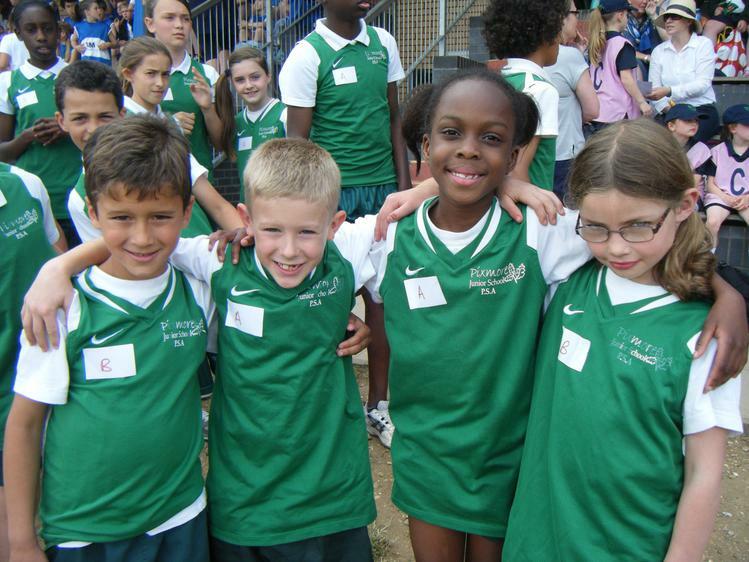 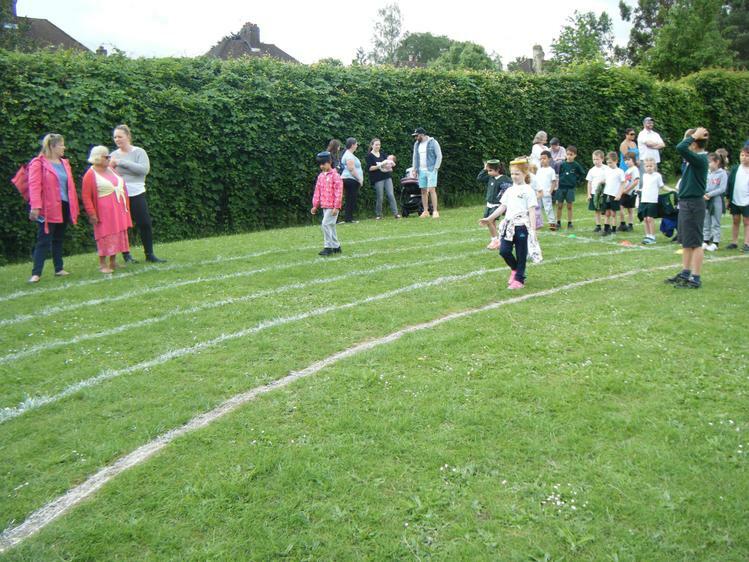 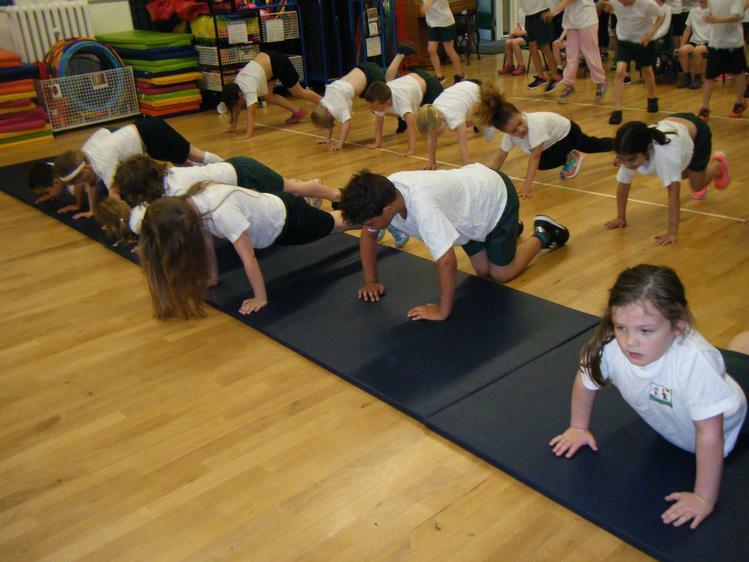 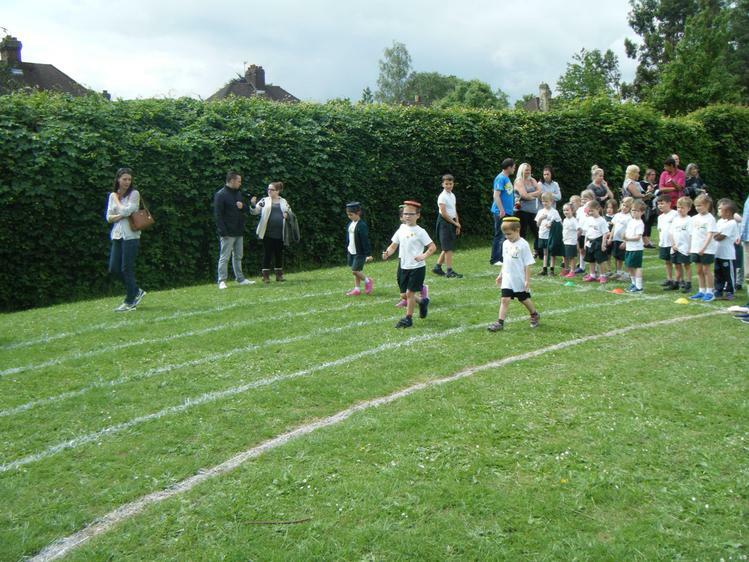 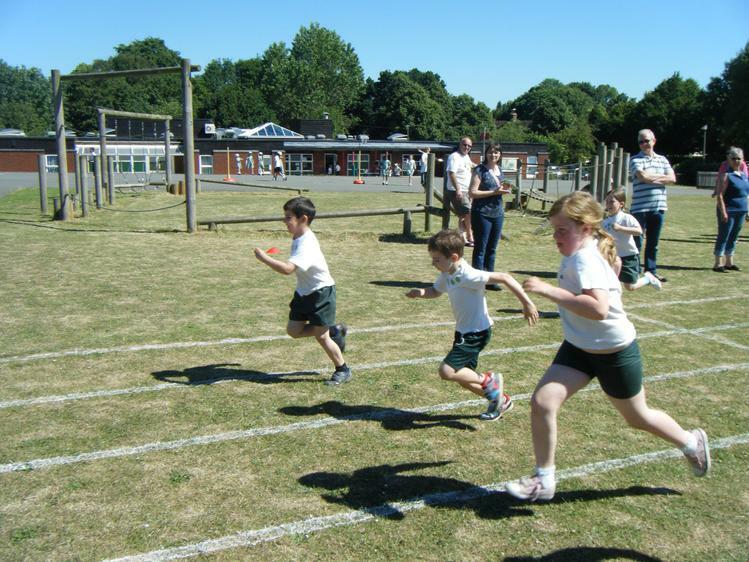 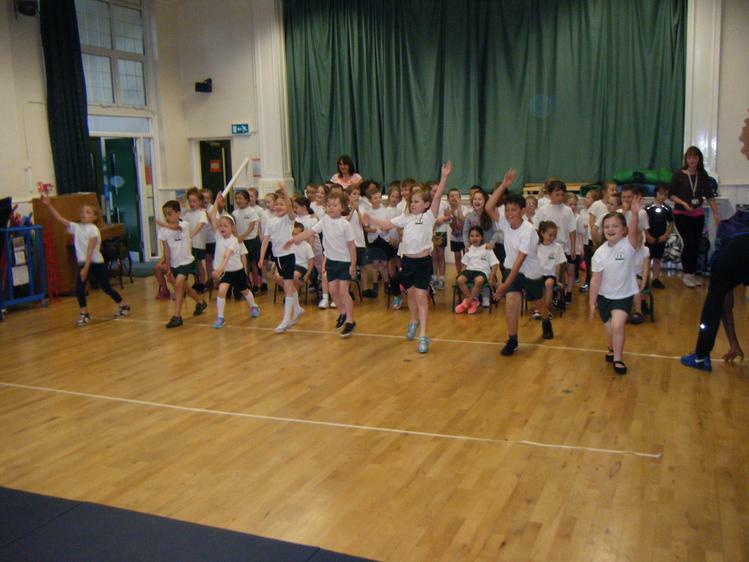 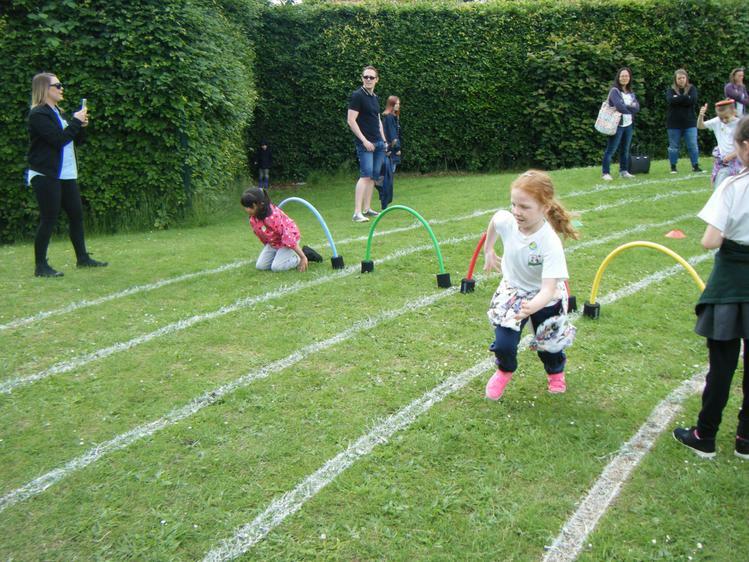 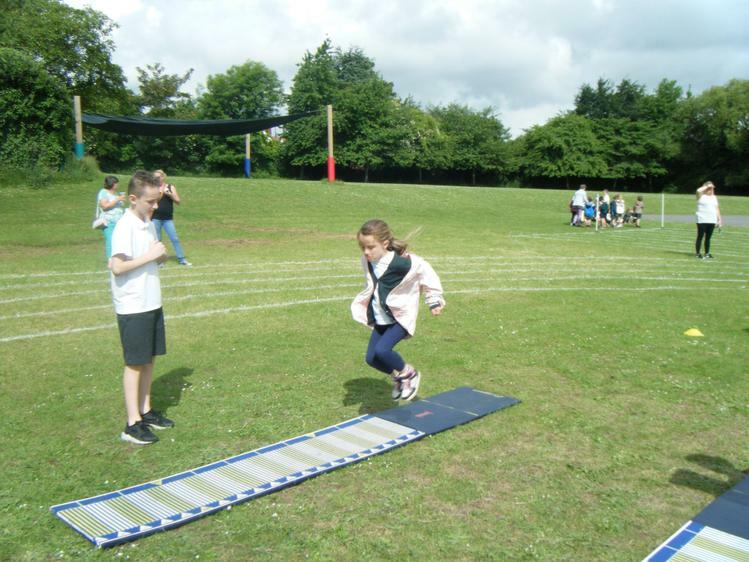 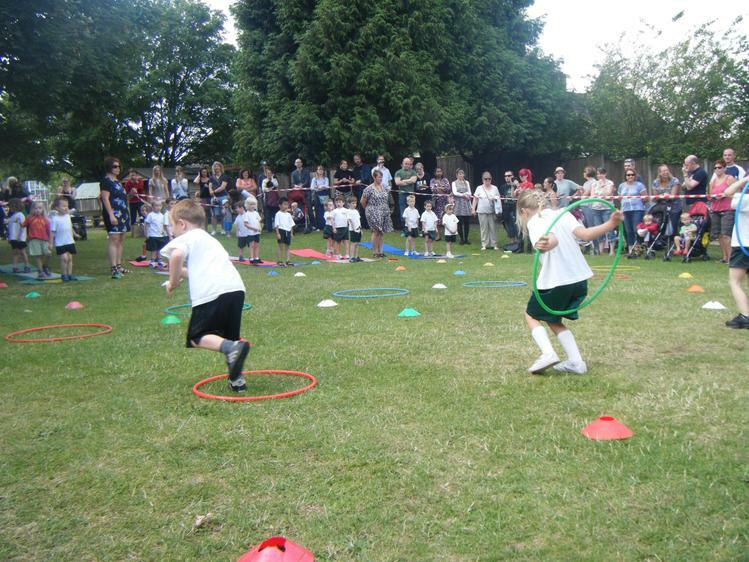 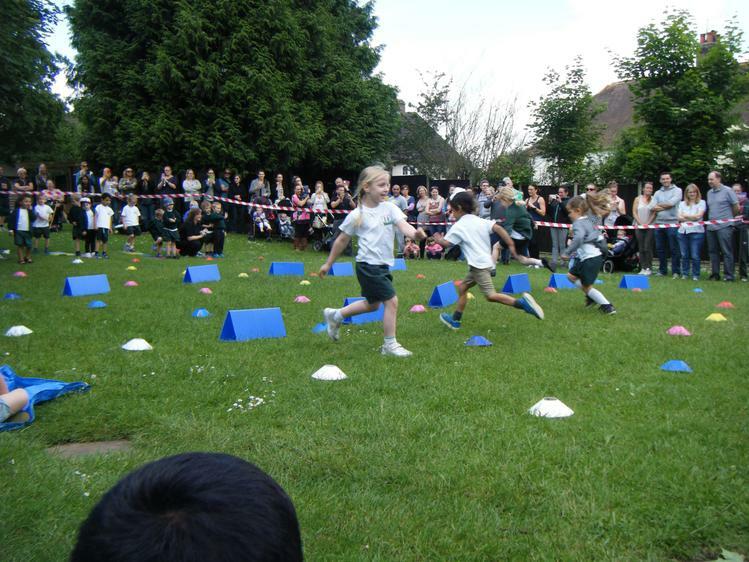 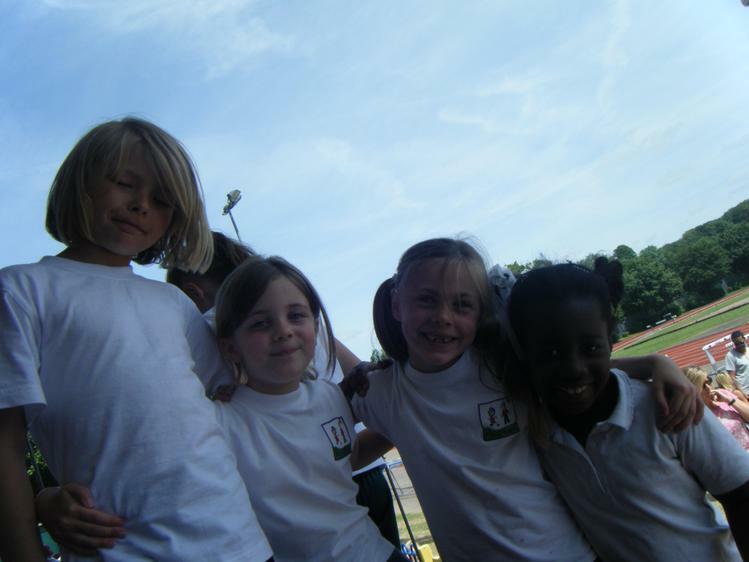 The children had a great time taking part in our Foundation Stage Sports Day this year! 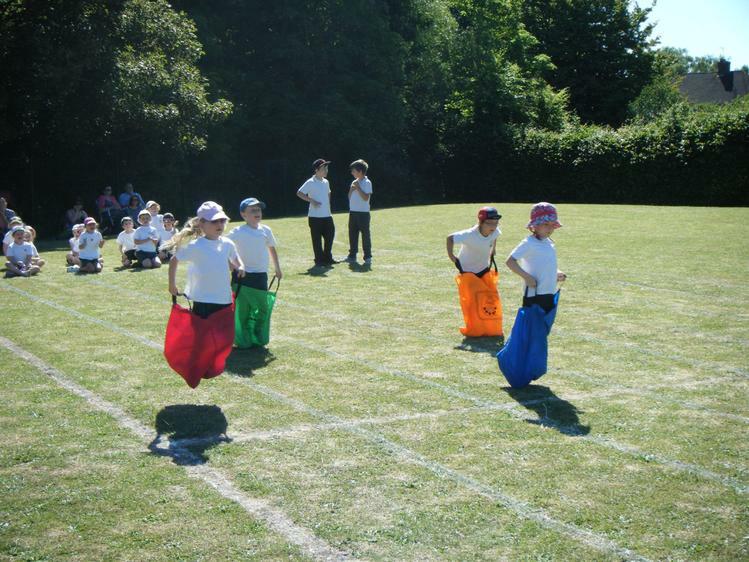 They completed all of the races with so much enthusiasm and it was lovely to see them having fun with their friends. 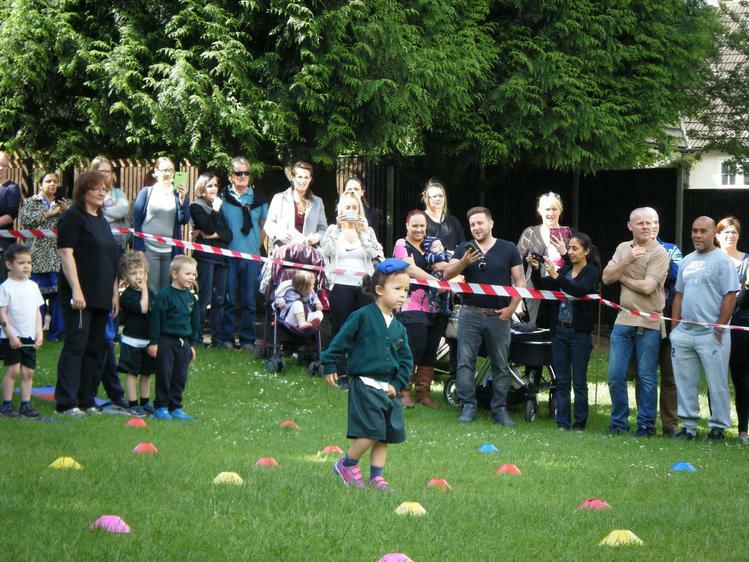 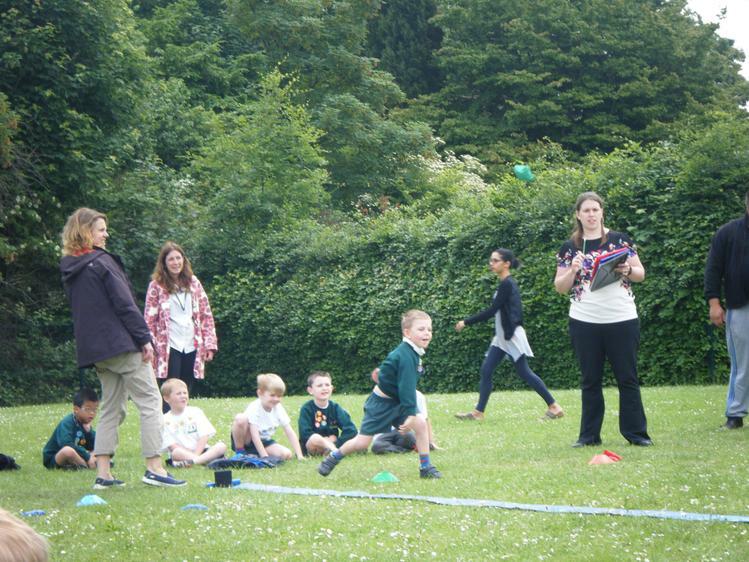 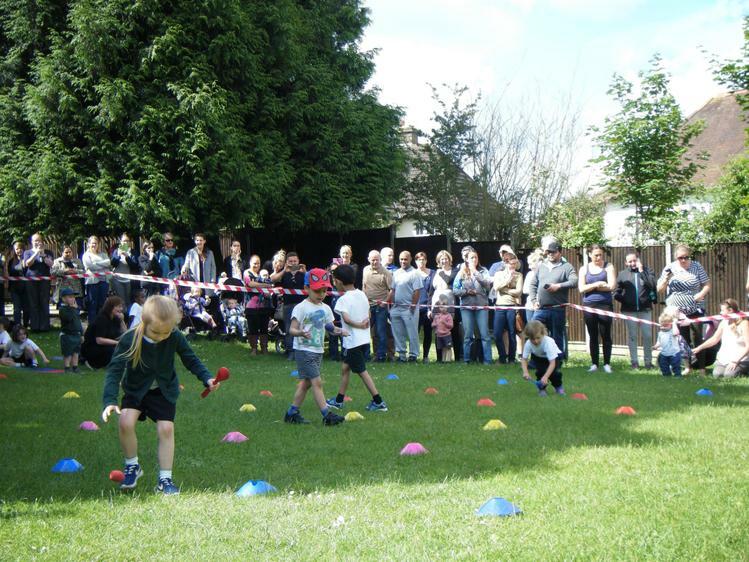 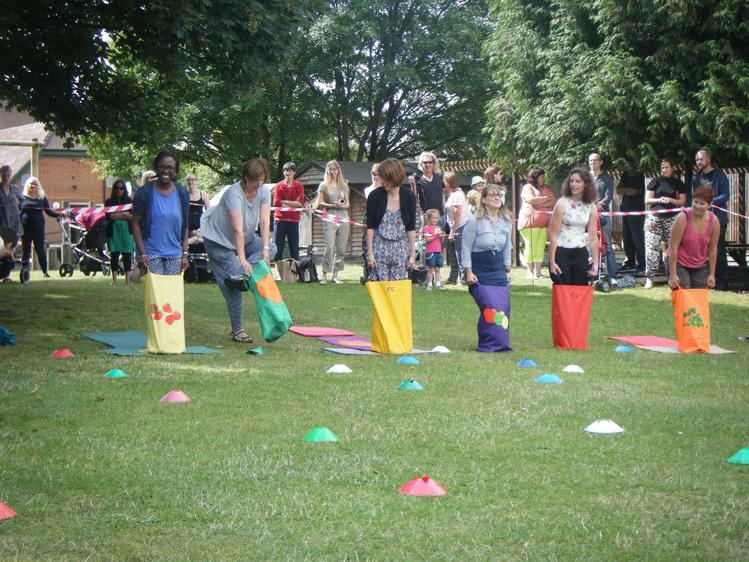 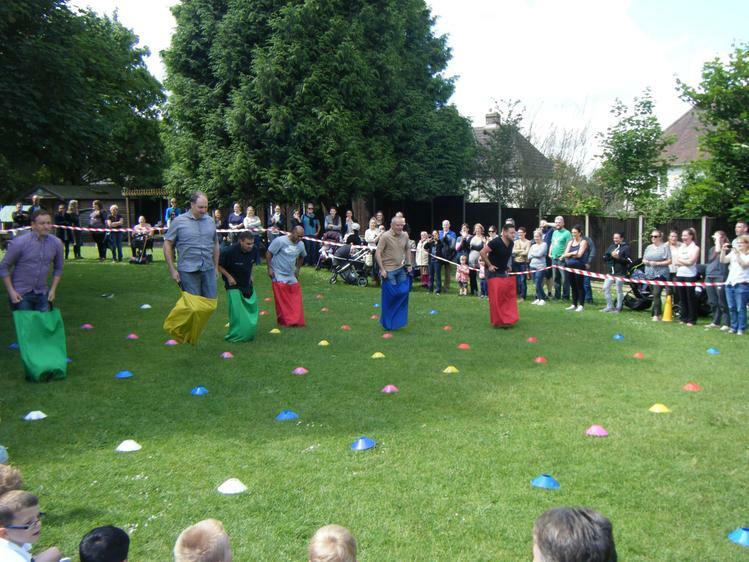 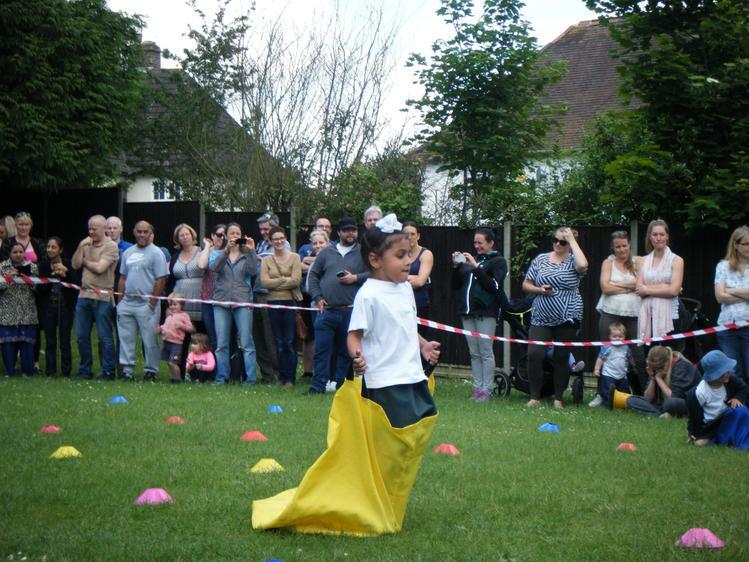 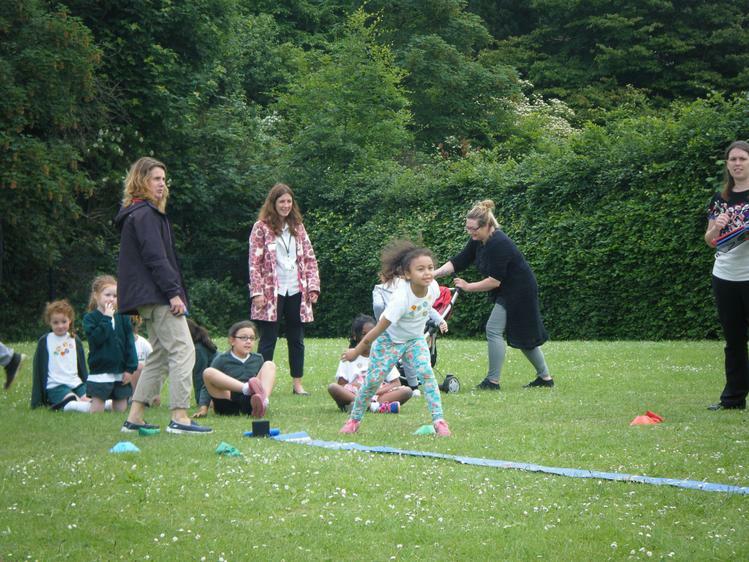 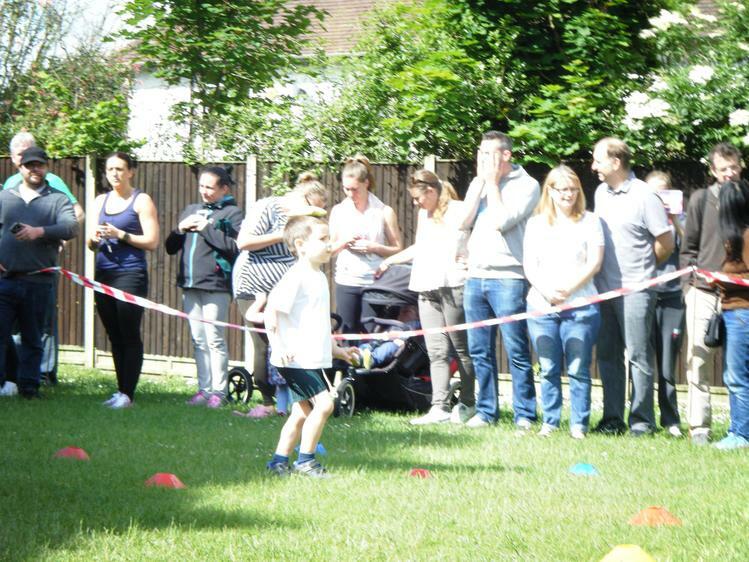 Thank you to all of the grown-ups who were able to come and watch the races and cheer the children on, it was a great opportunity to introduce the children to sporting competition! 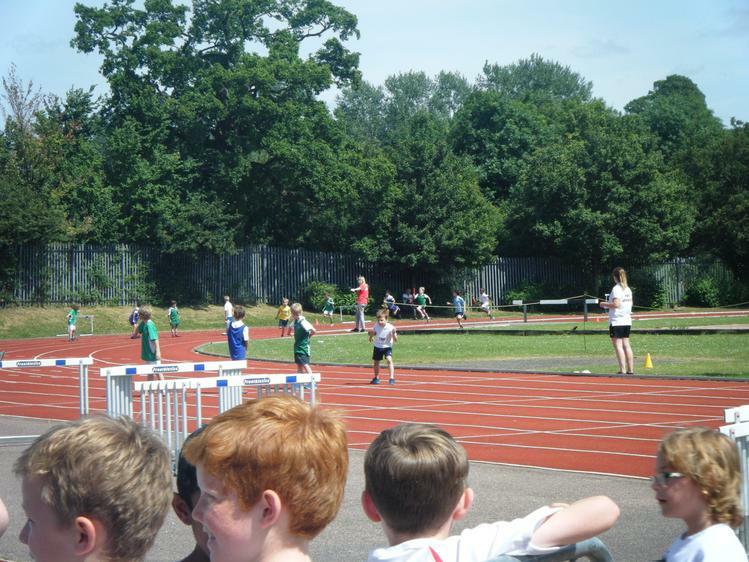 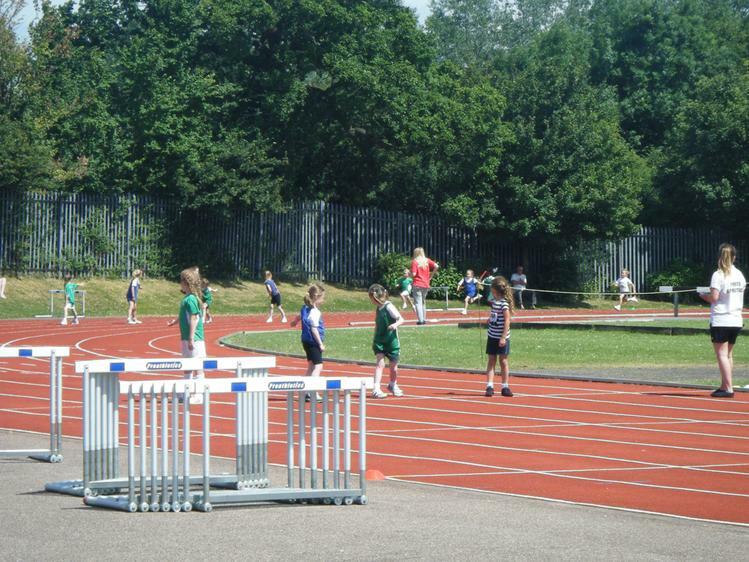 Some of our Year 2 children went with Miss Horsman to join Pixmore Junior School at the District Athletics Day at Ridlins Athletics Track in Stevenage. 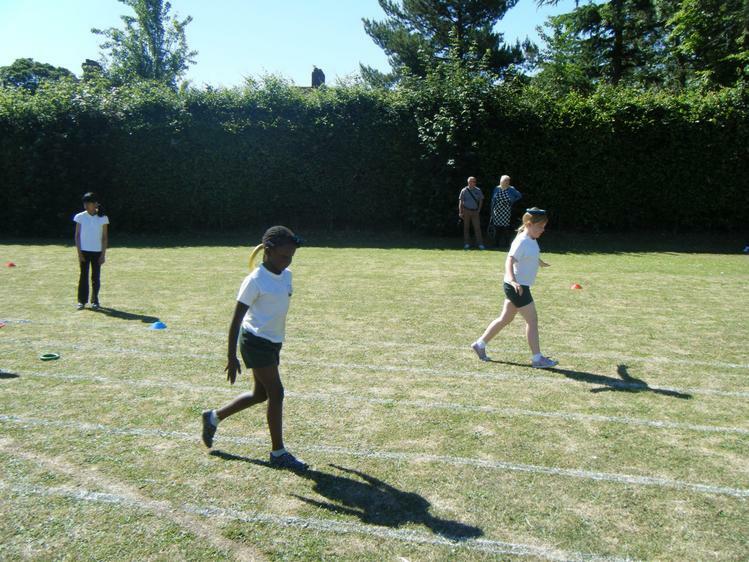 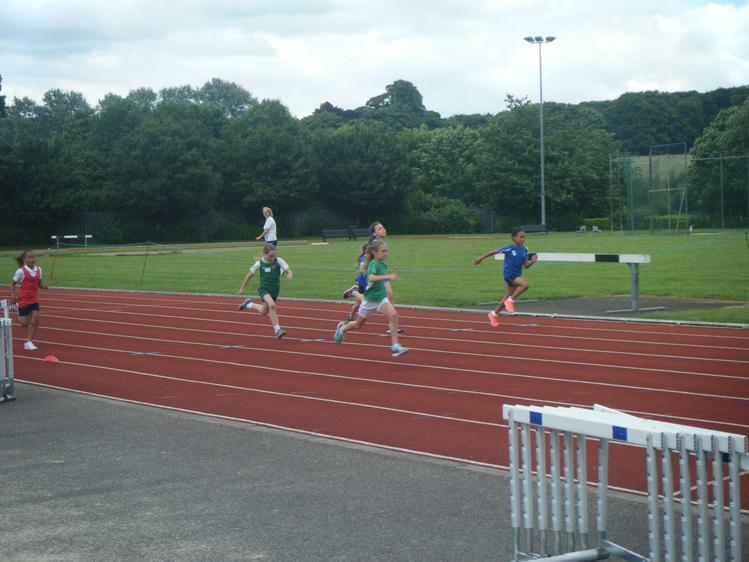 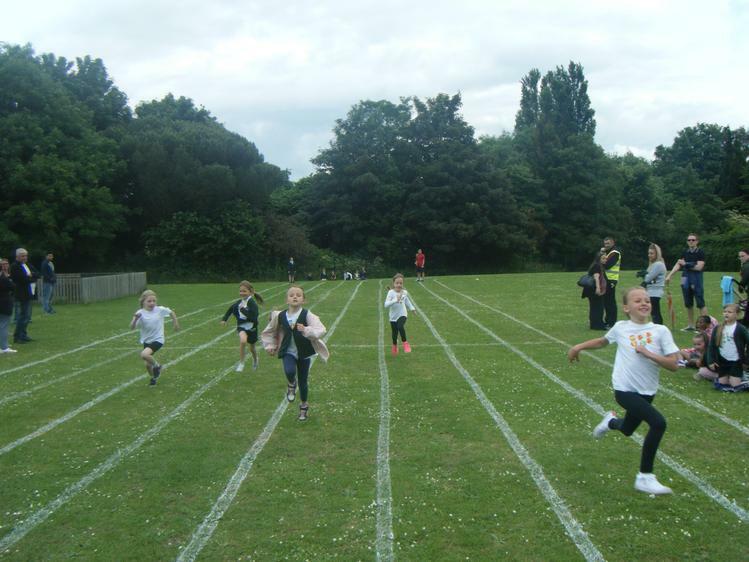 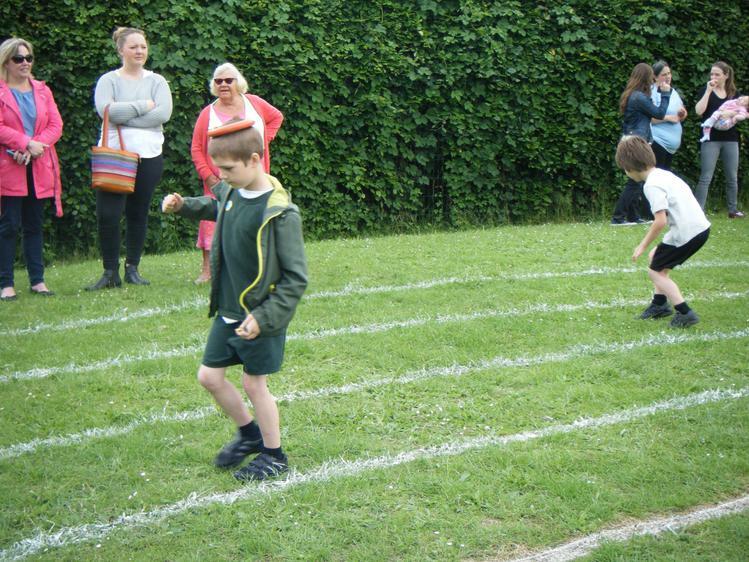 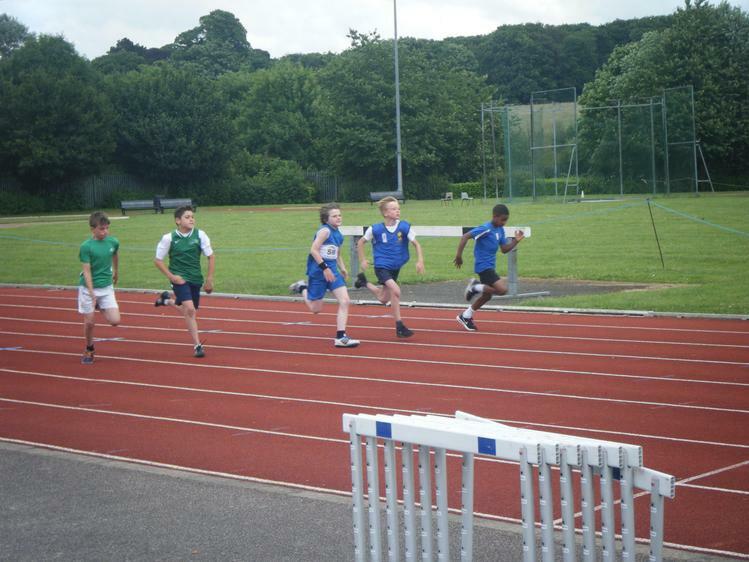 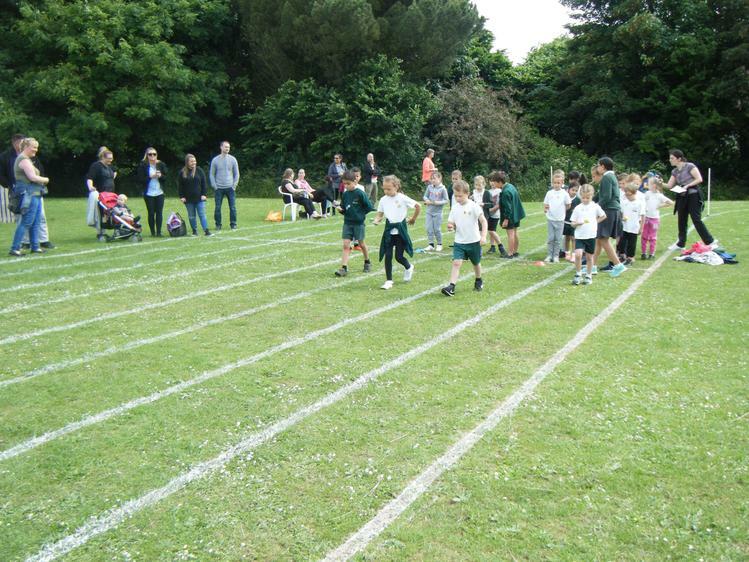 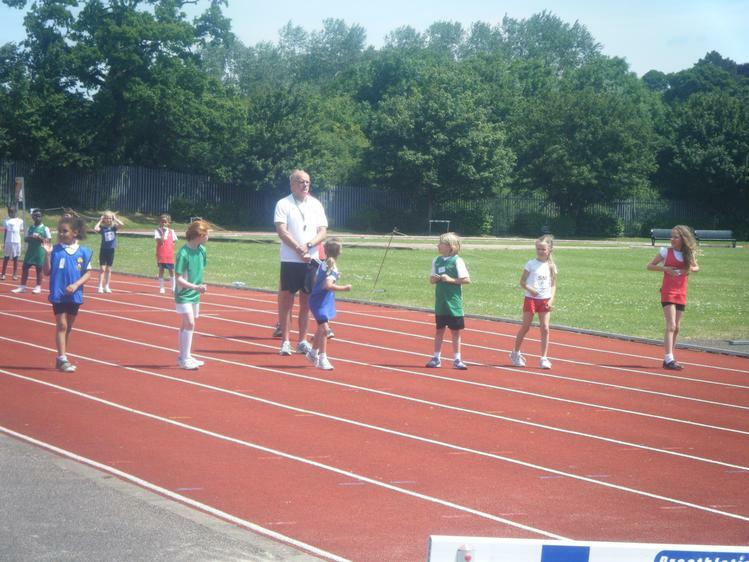 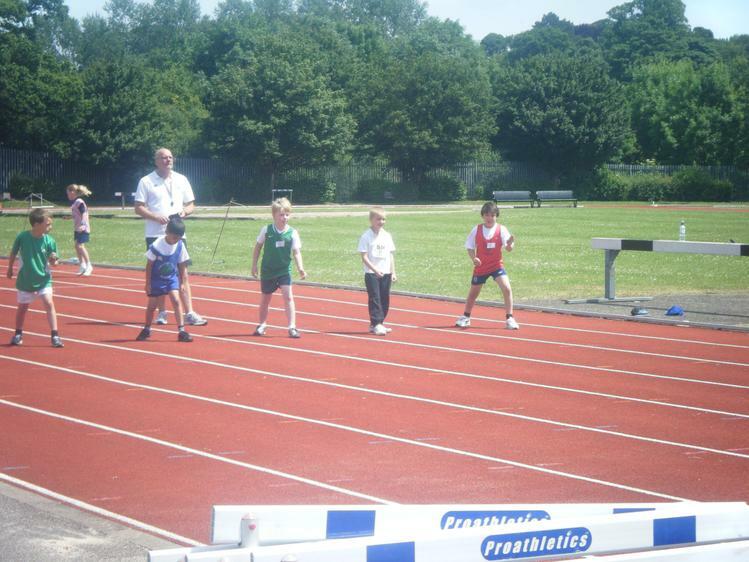 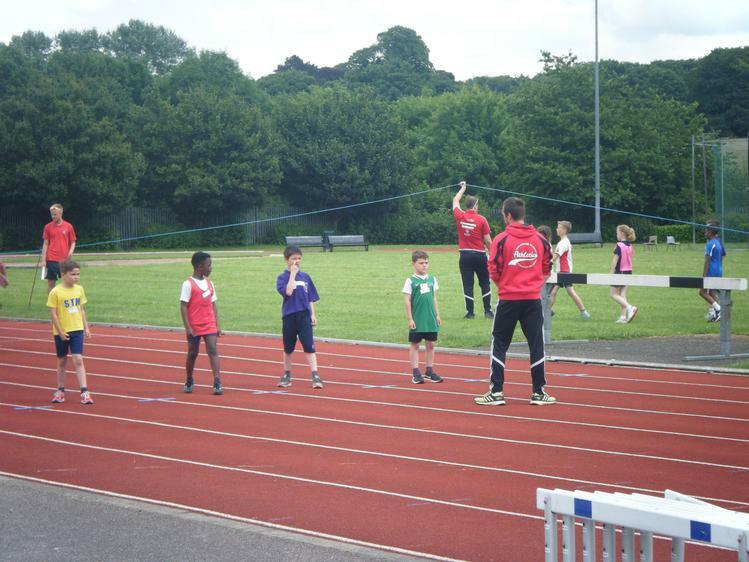 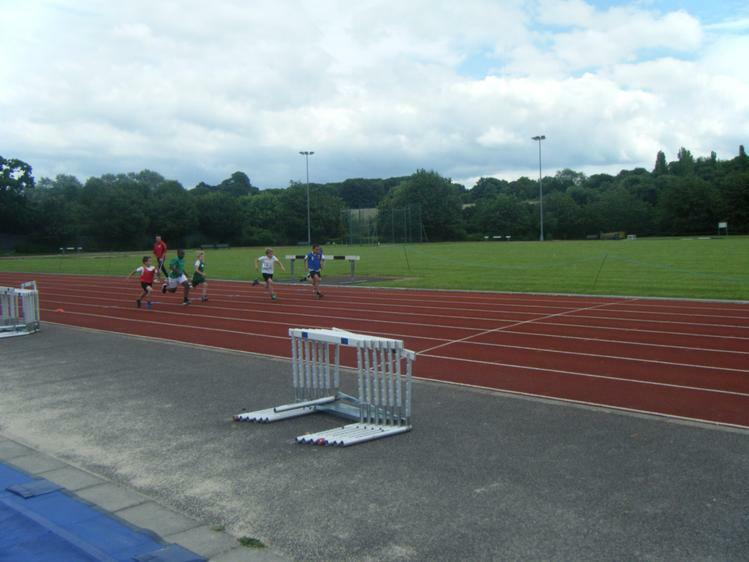 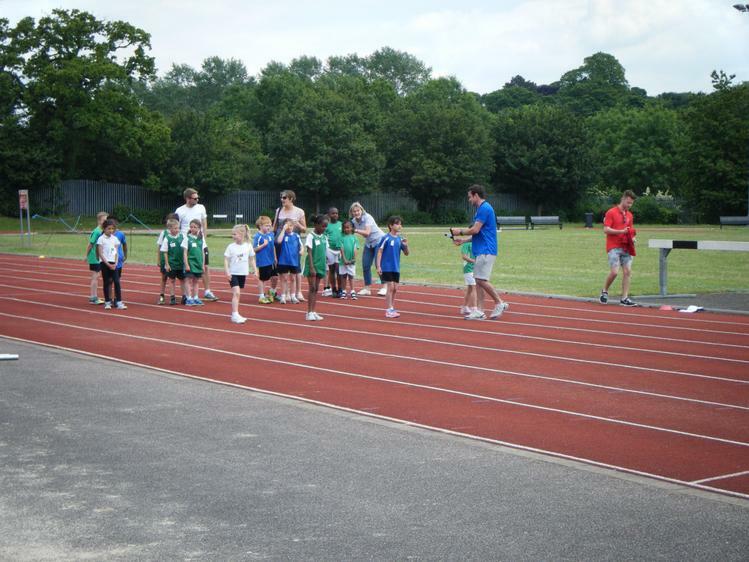 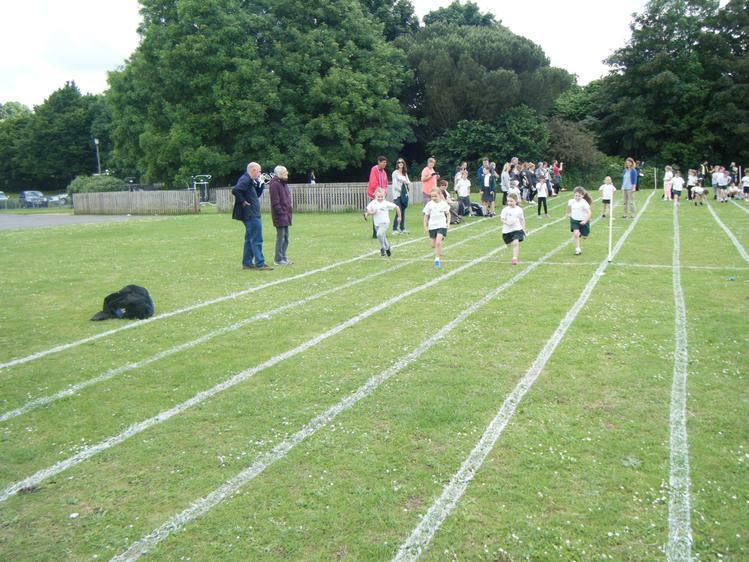 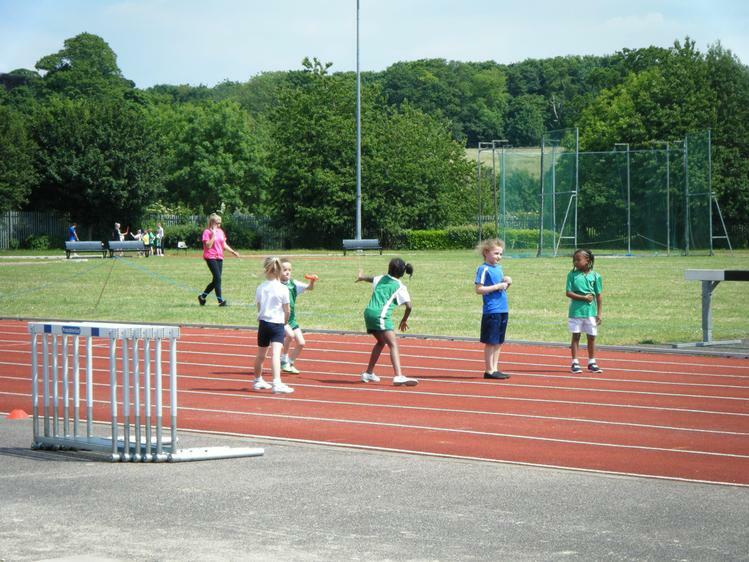 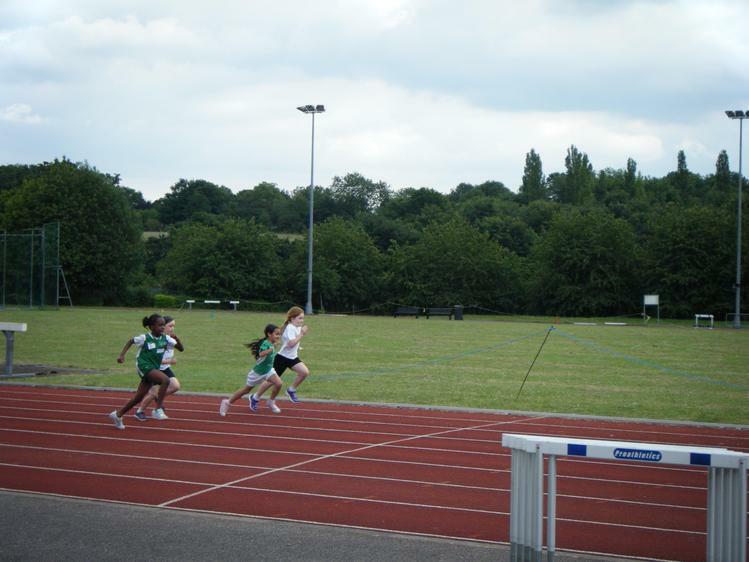 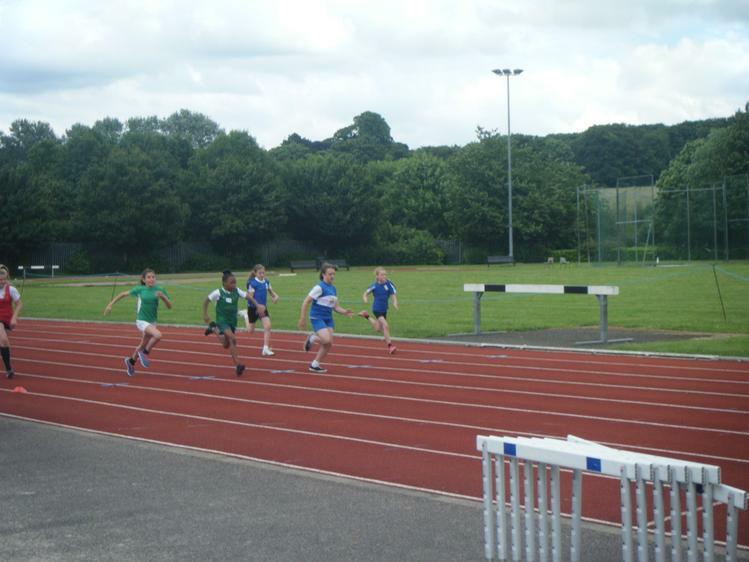 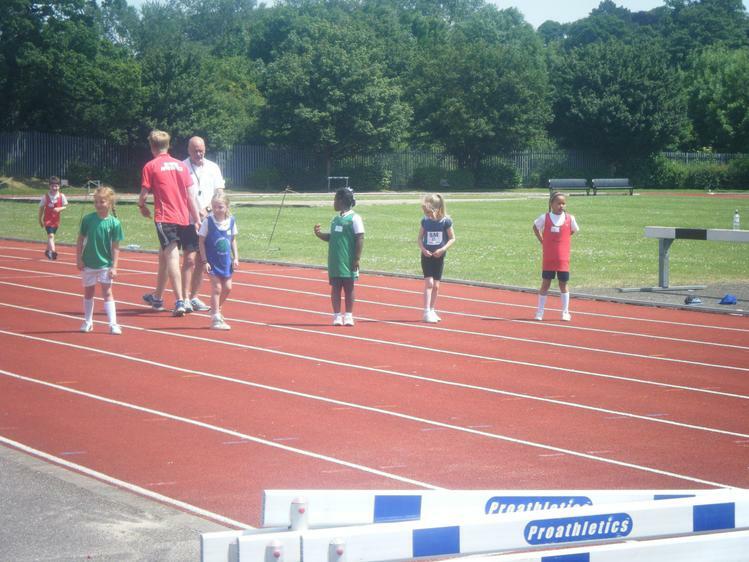 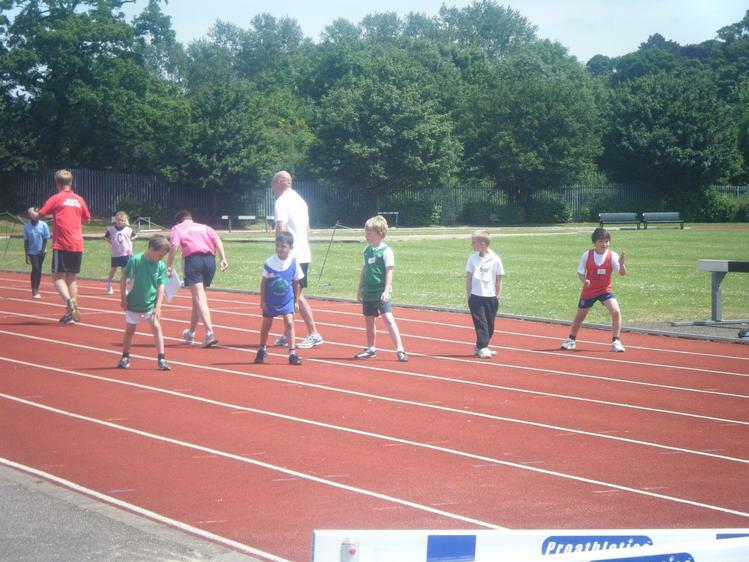 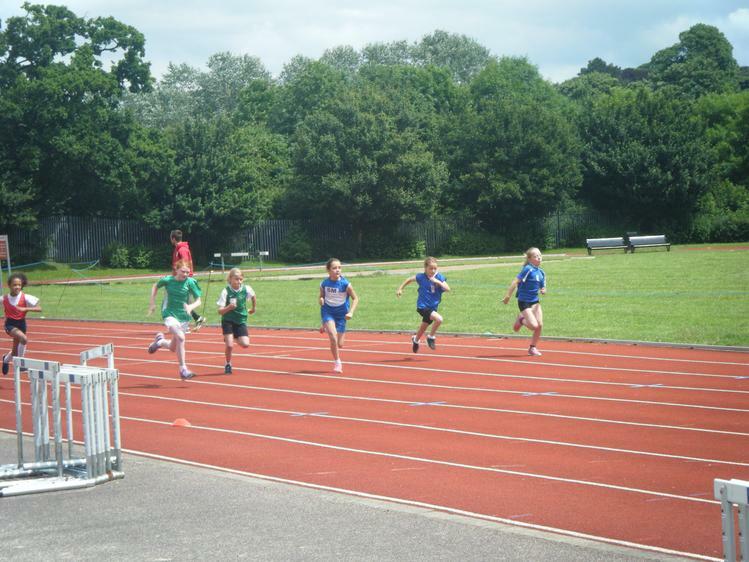 The children took part in the 200m sprint and the 800m relay and showed great sportsmanship and team work throughout. 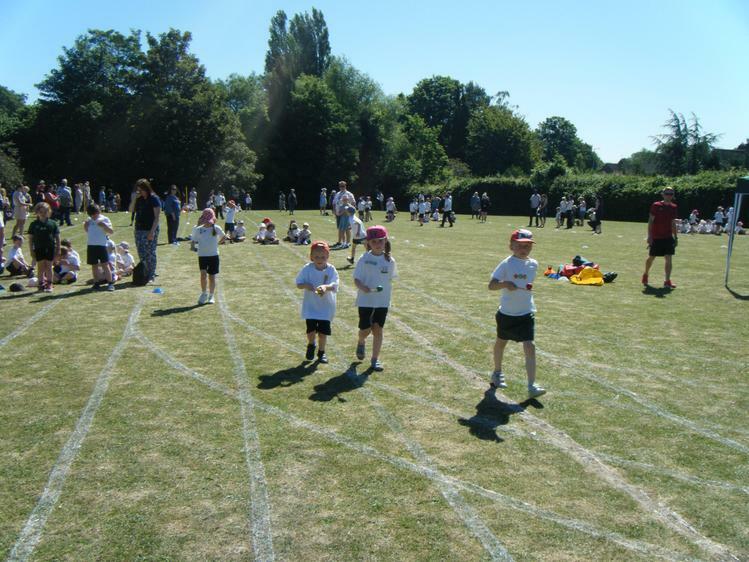 We were lucky to have another warm, sunny day and the children had a great time cheering on their friends during each race. 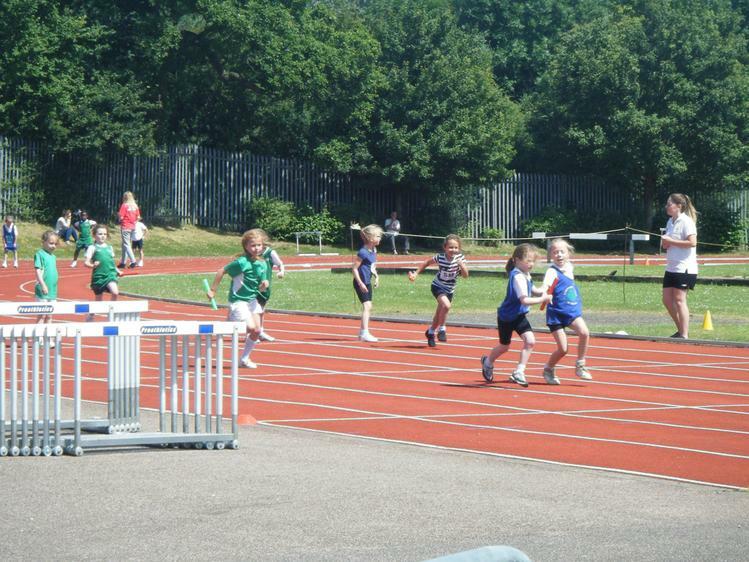 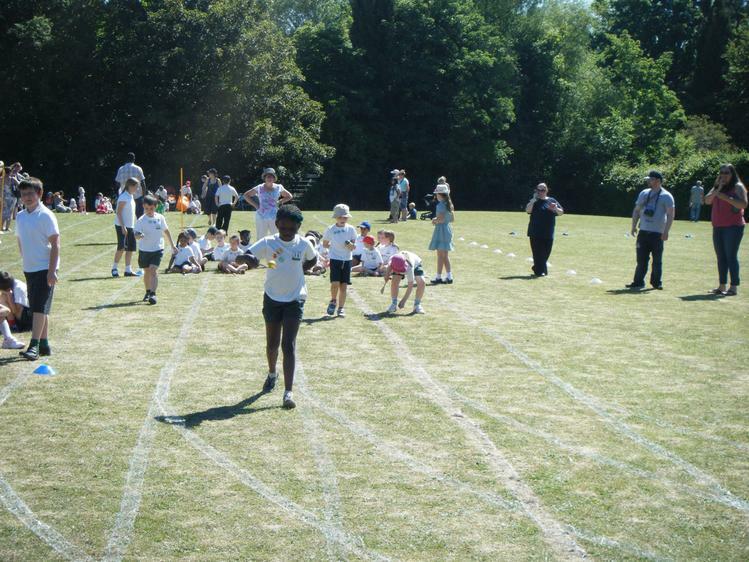 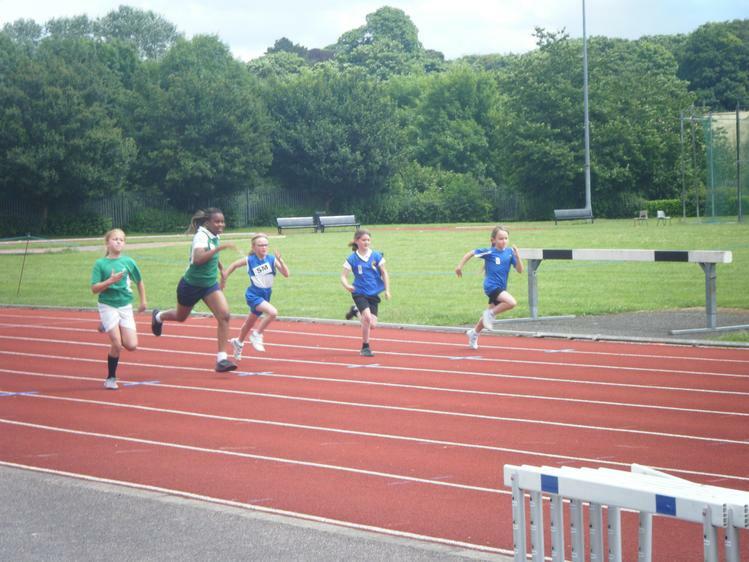 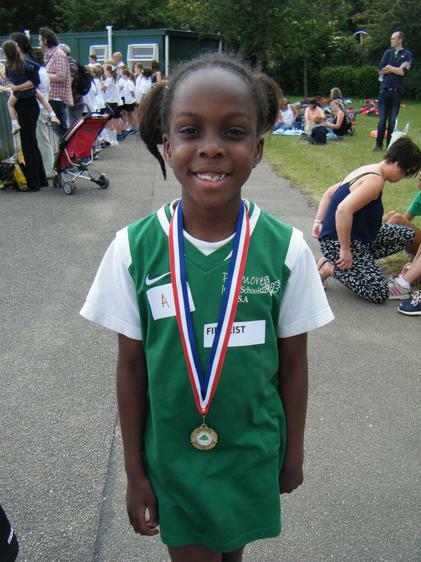 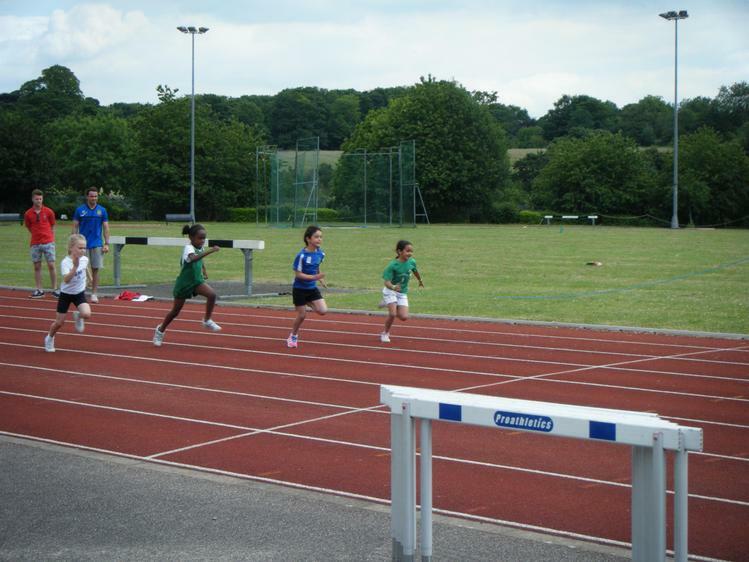 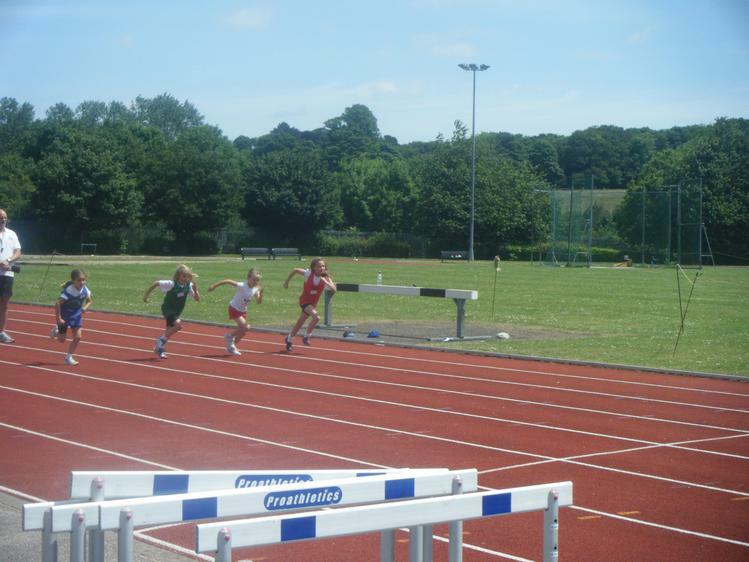 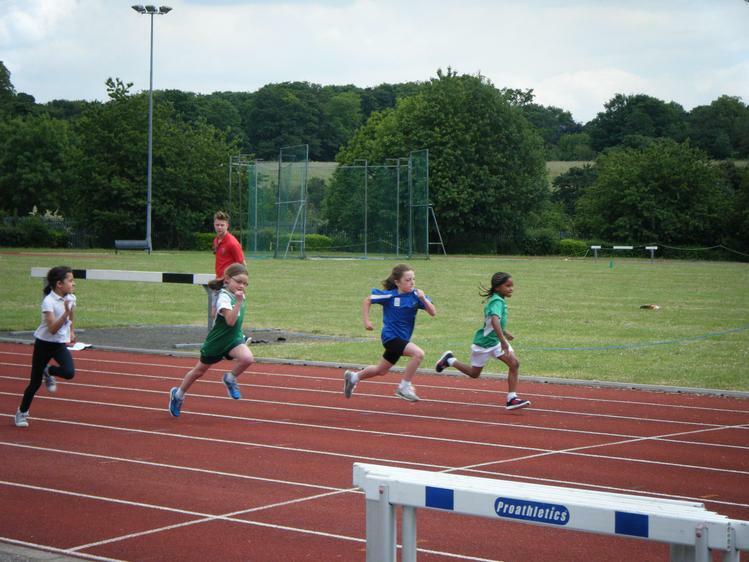 We are very proud of the children for being great ambassadors for Hillshott and we are pleased to say that Nana is now the District Champion in the Year 2 Girls’ 200m Sprint! 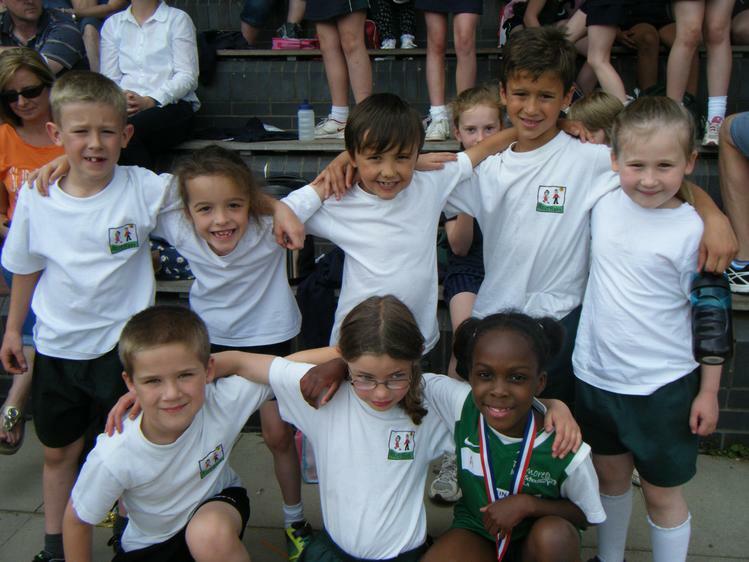 We had lots of fun completing another successful Easter Sports Day! 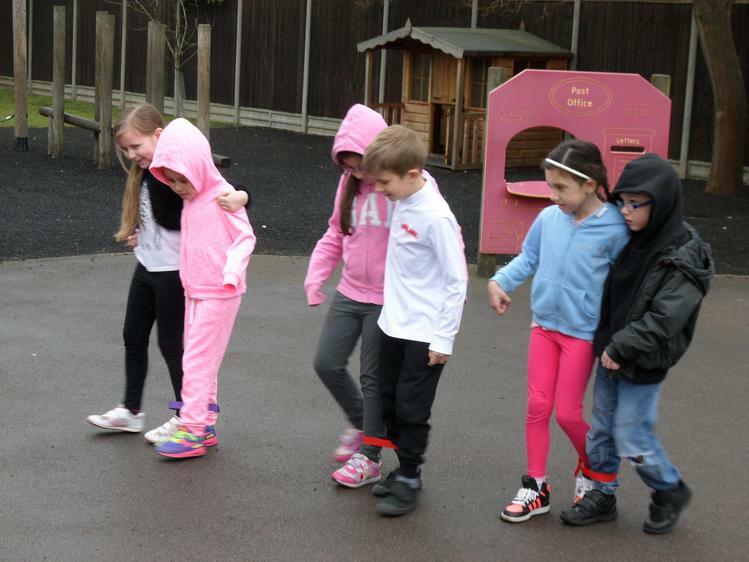 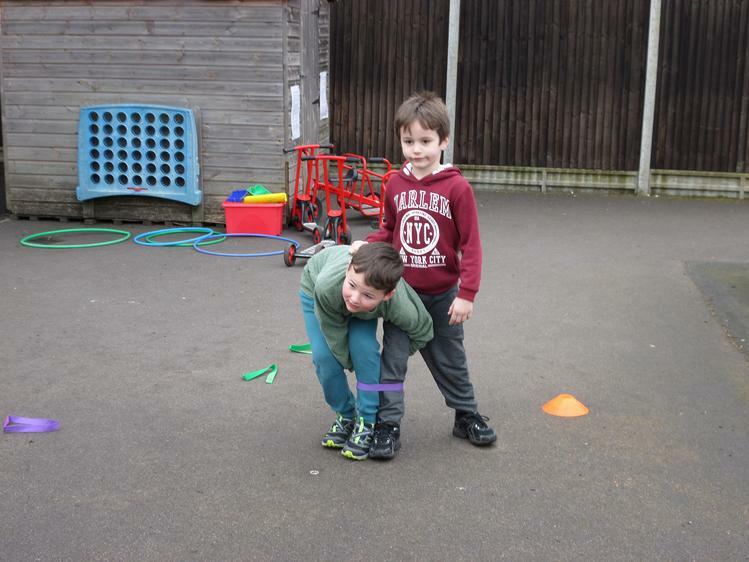 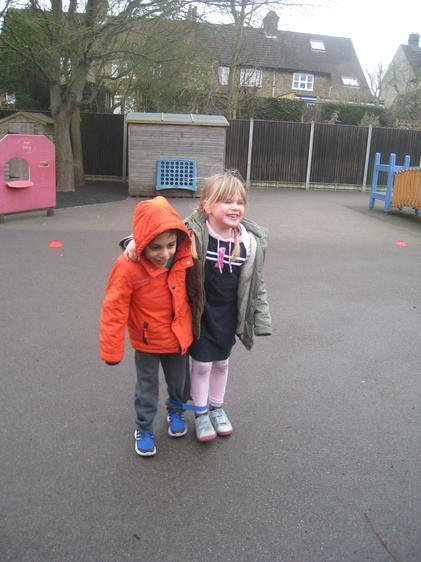 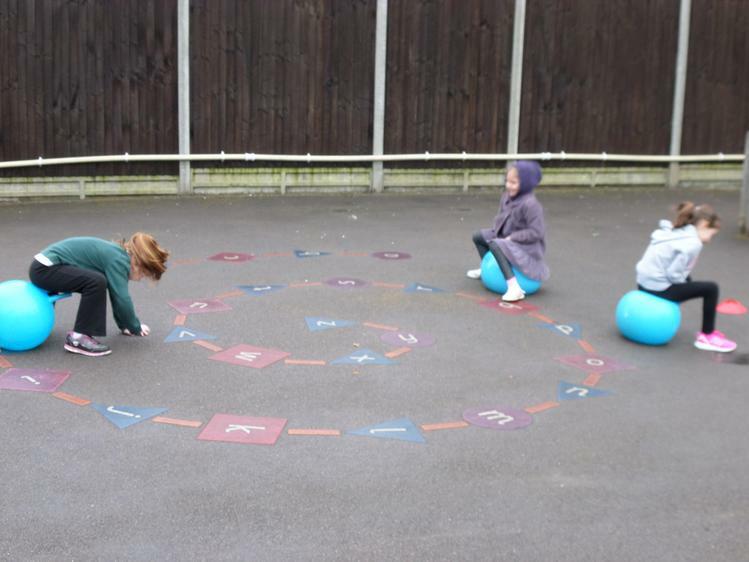 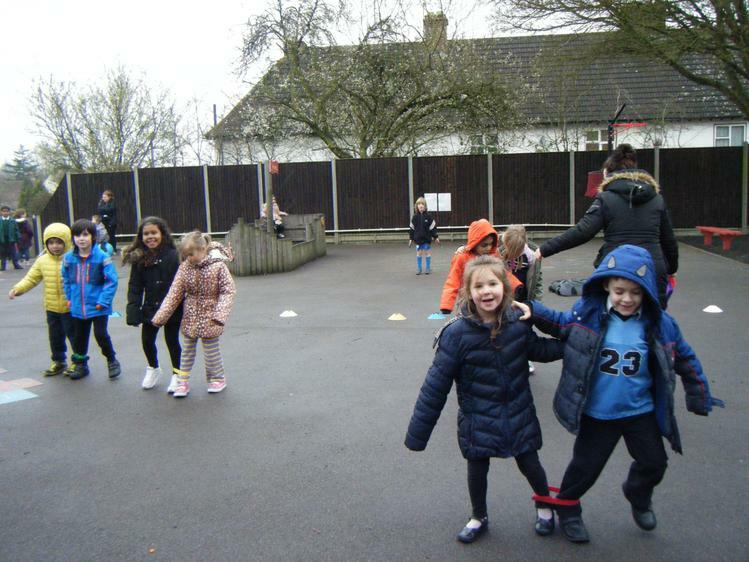 The children loved working in mixed year group teams throughout the day and it was great to see our older children supporting our younger children in all of the activities! 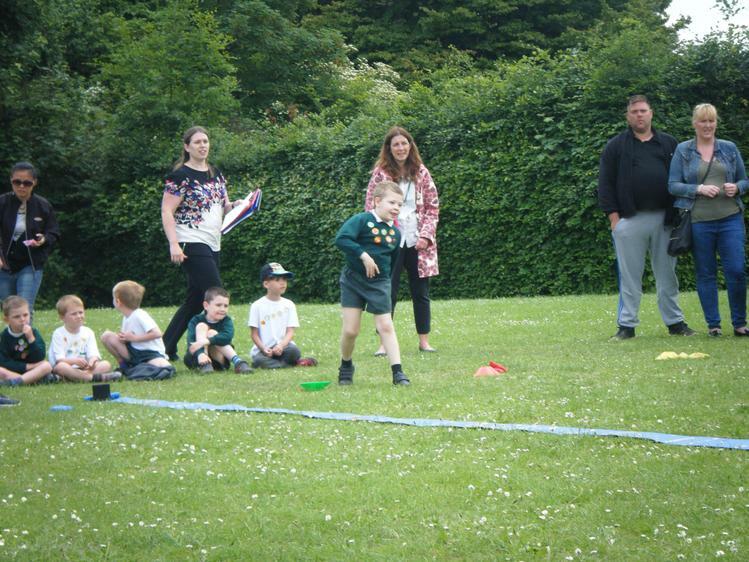 All of the adults were really proud of all of the children for taking part in every activity and trying their best, even if they found some of them tricky at first. 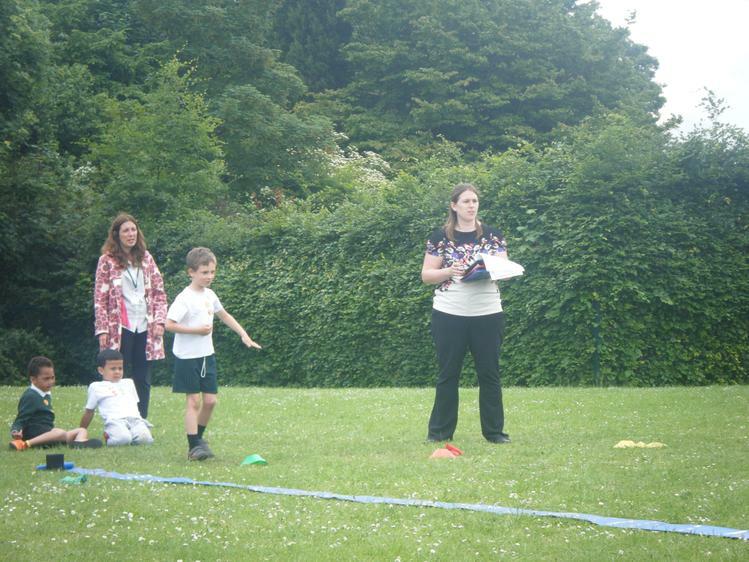 At the end of the day Mrs Wilson awarded 16 children with certificates for showing excellent sportsmanship. 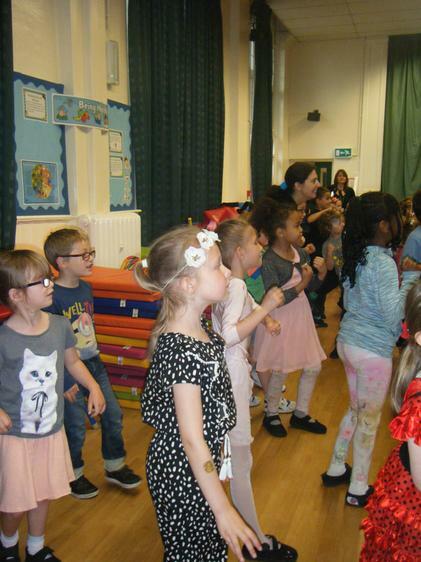 These children showed perseverance, they helped their friends and they celebrated other people’s achievements with smiles and clapping! 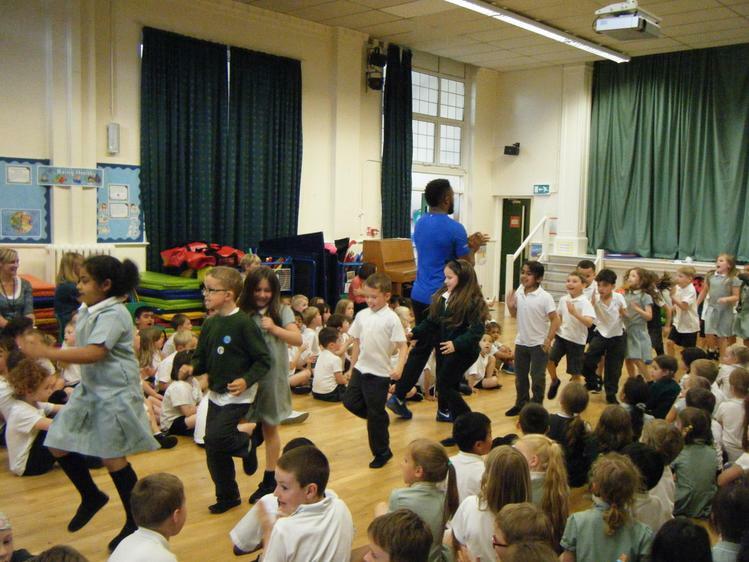 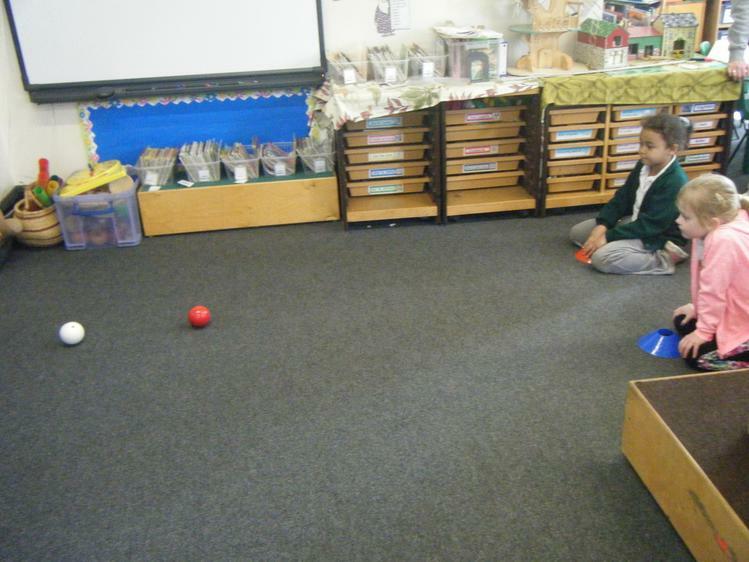 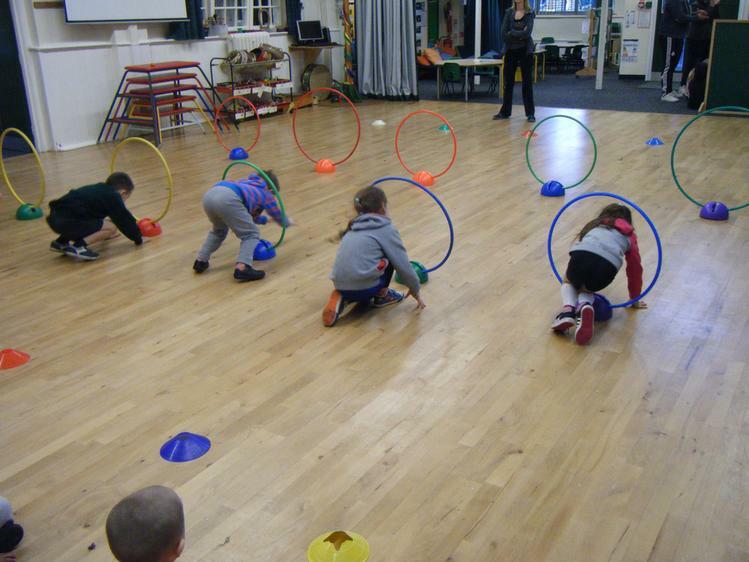 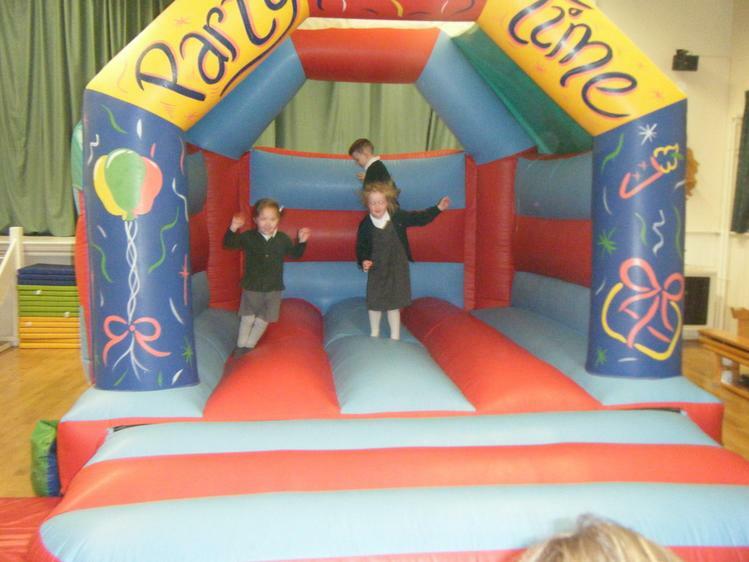 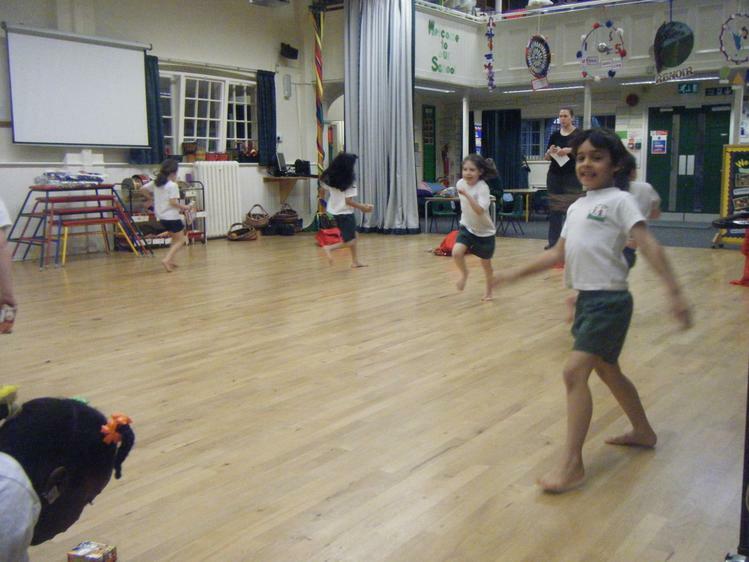 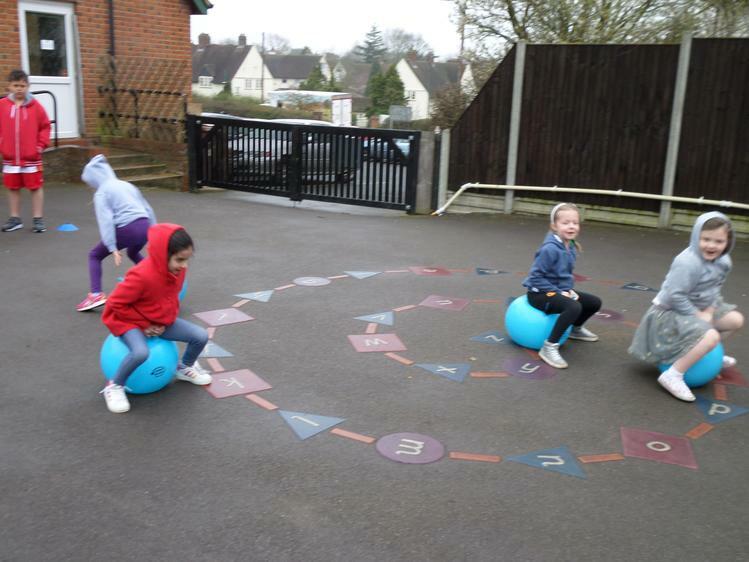 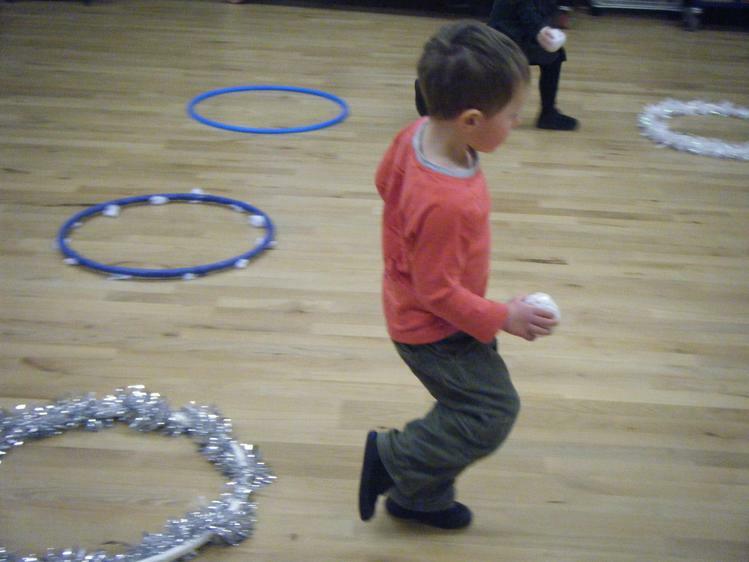 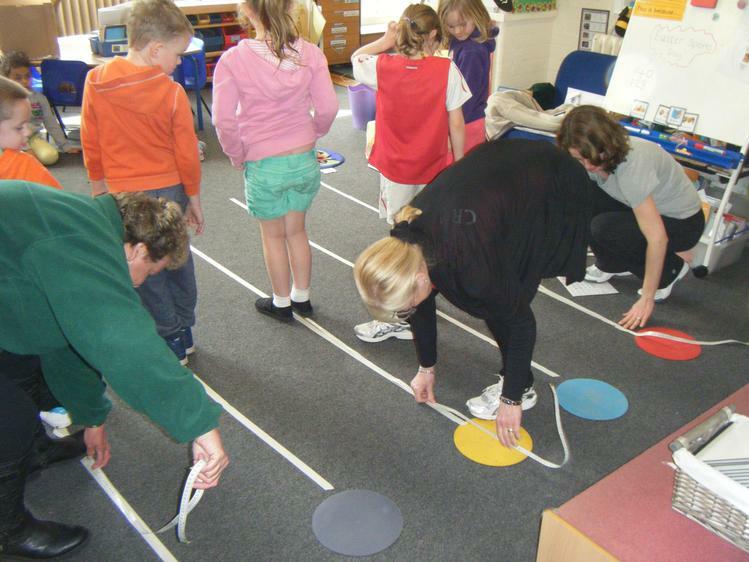 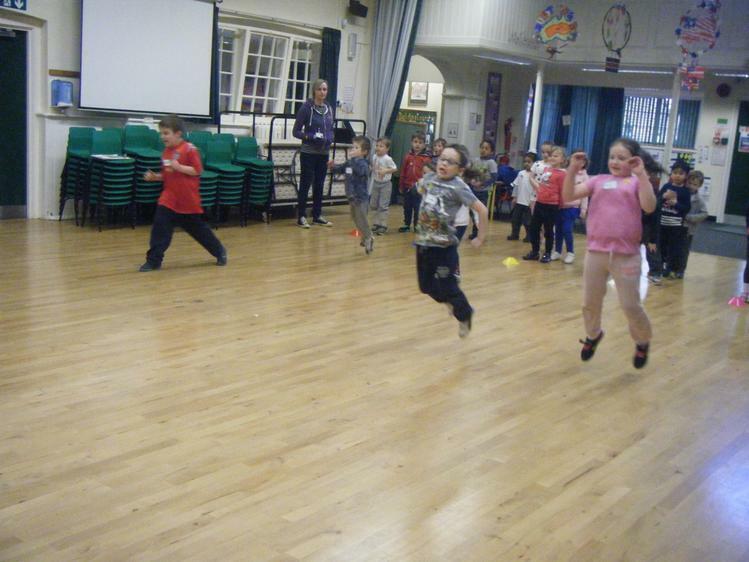 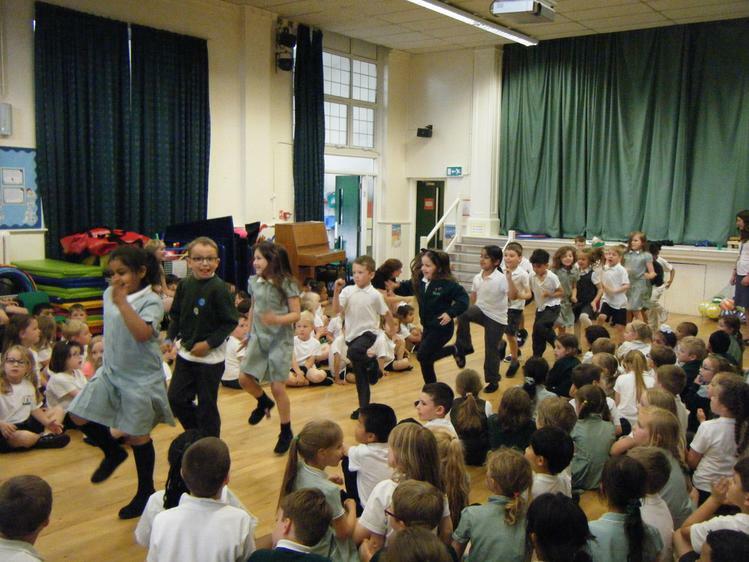 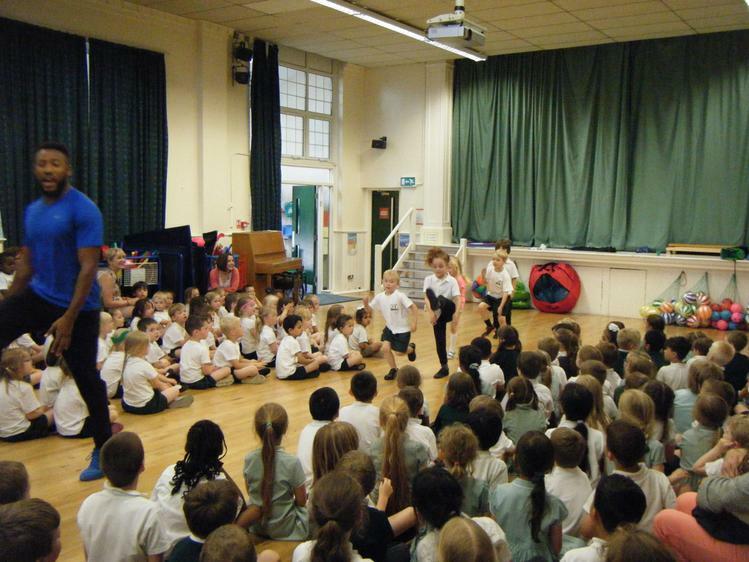 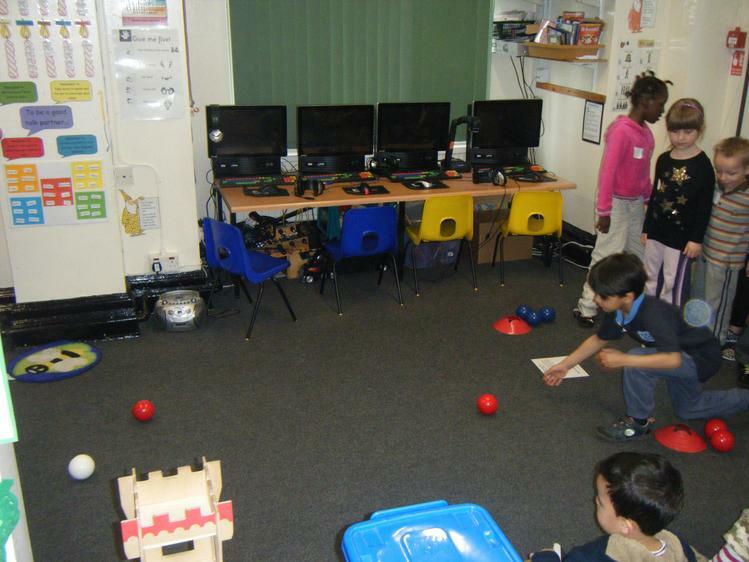 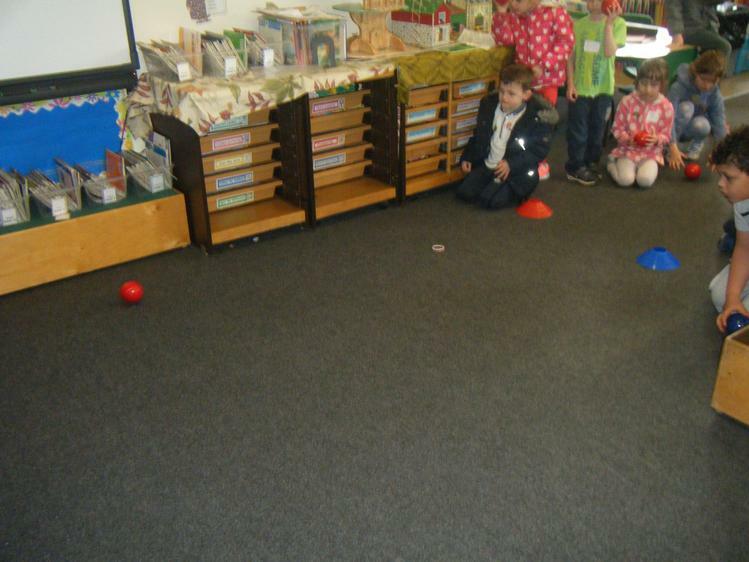 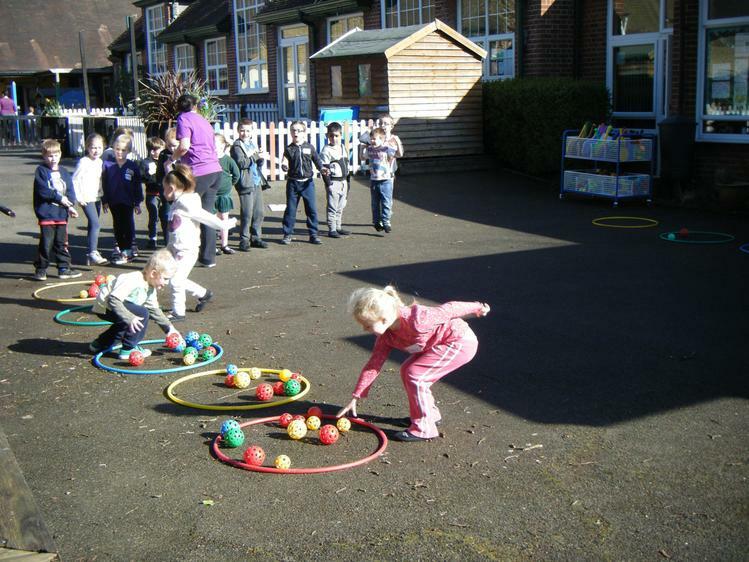 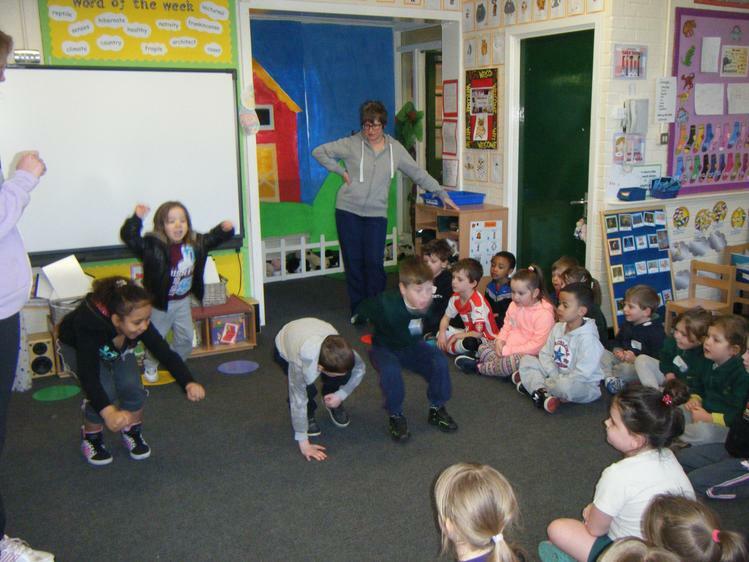 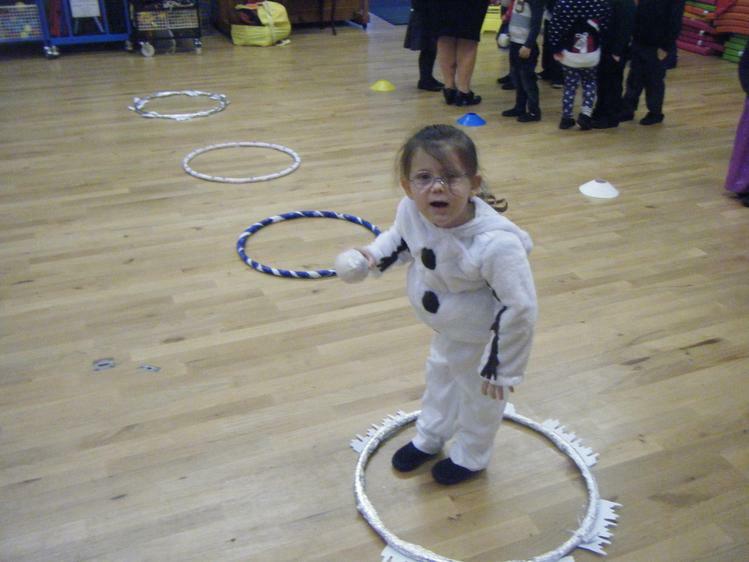 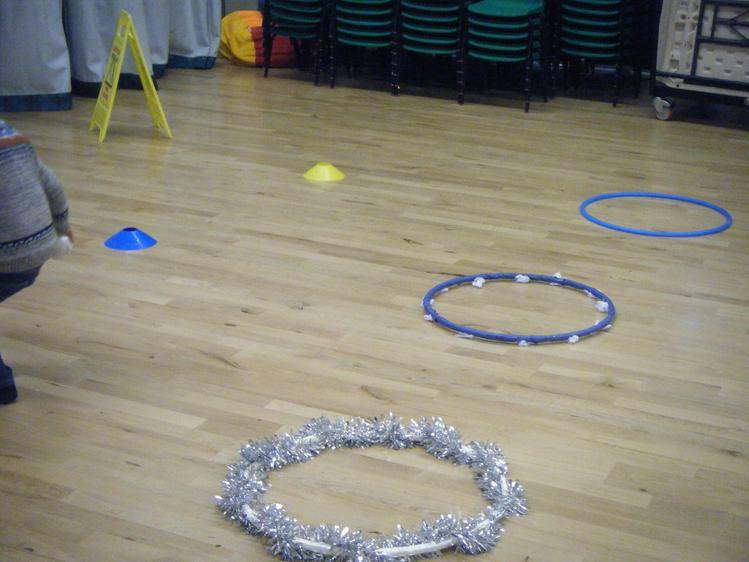 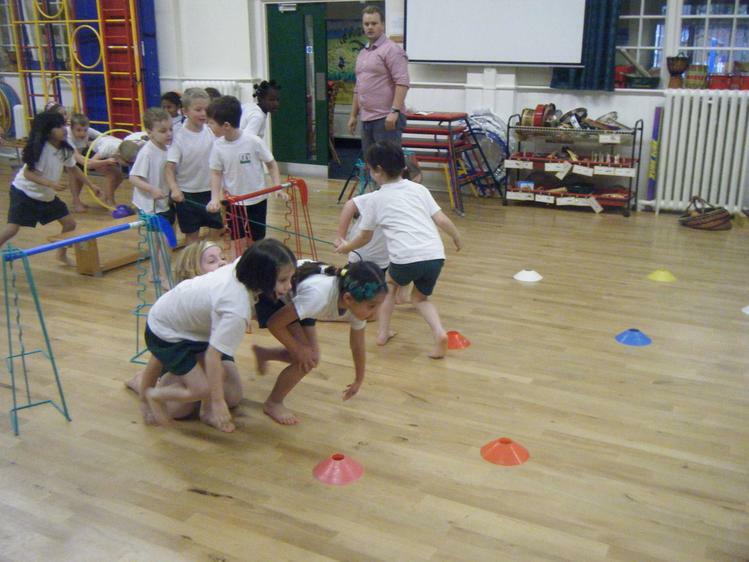 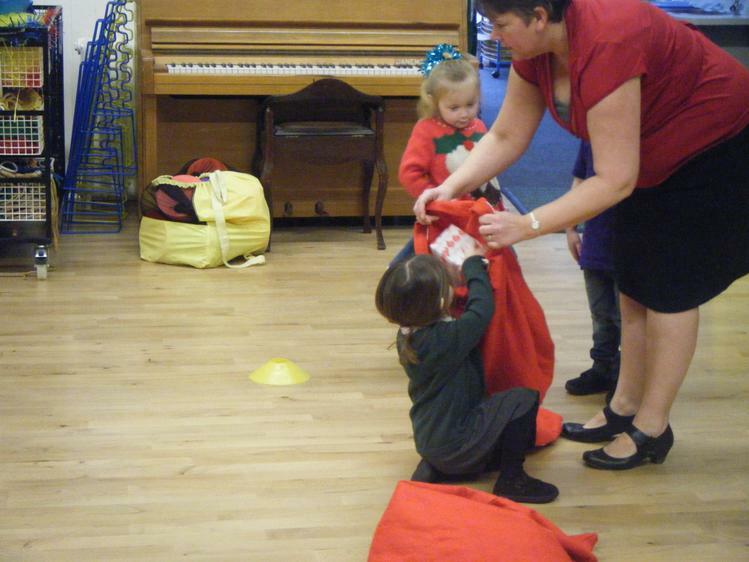 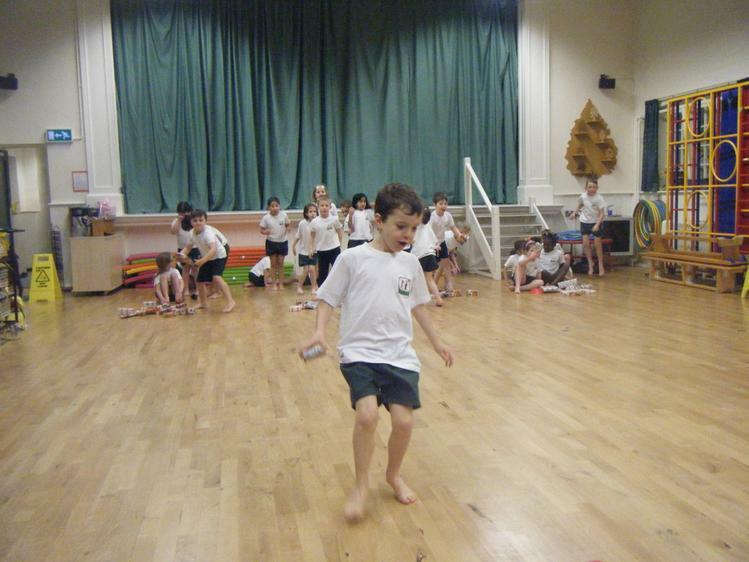 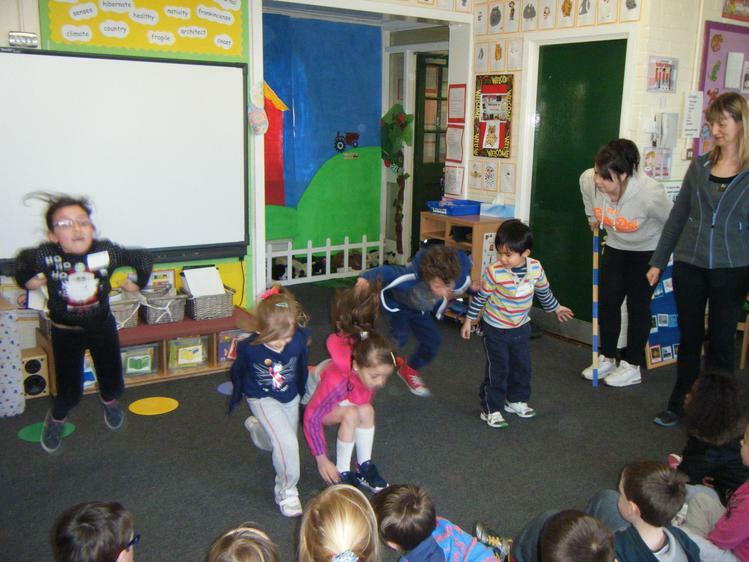 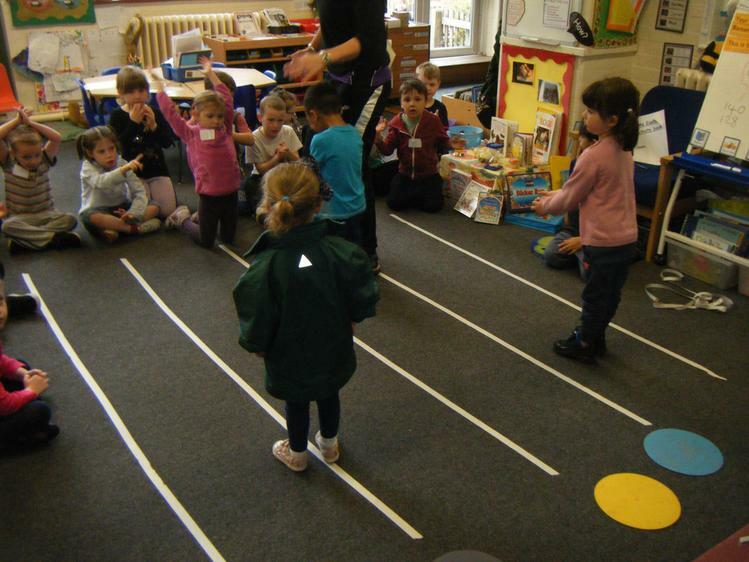 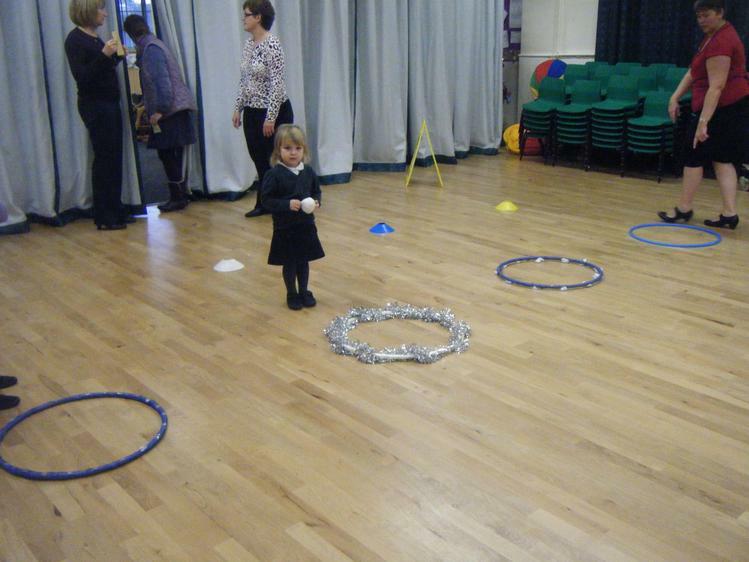 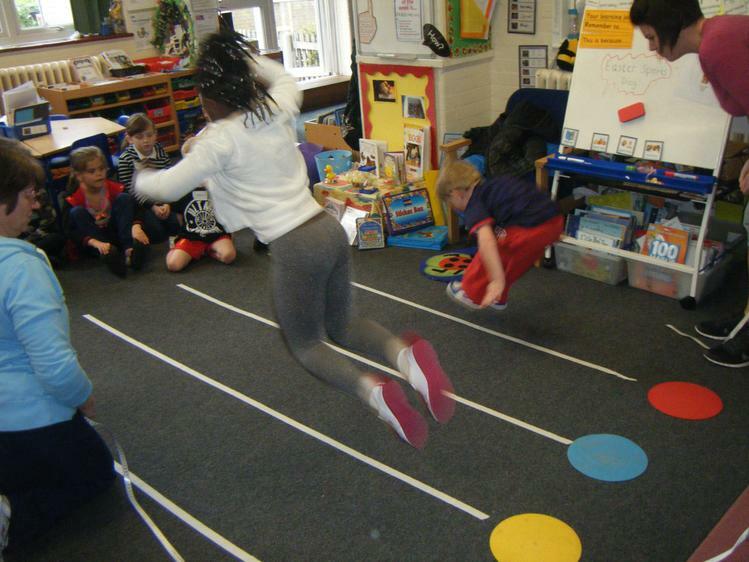 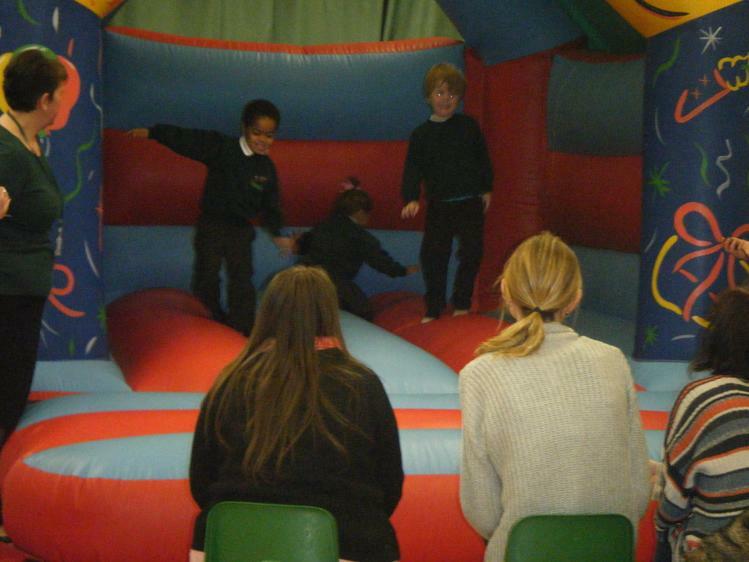 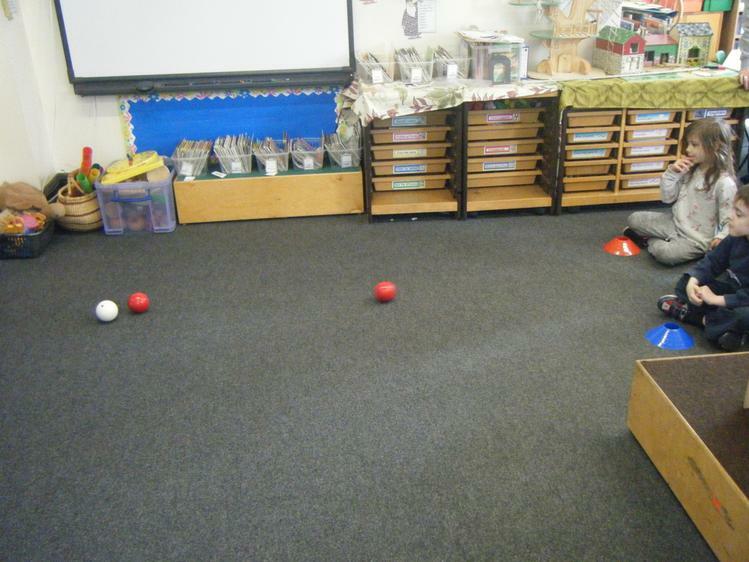 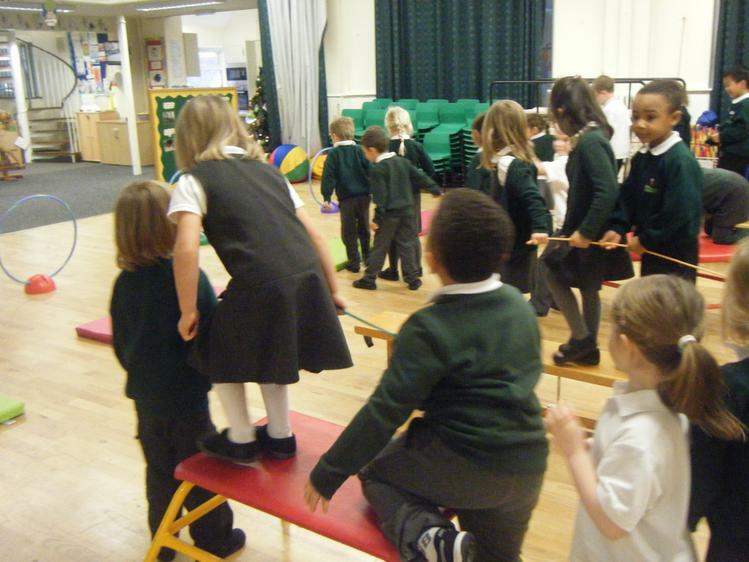 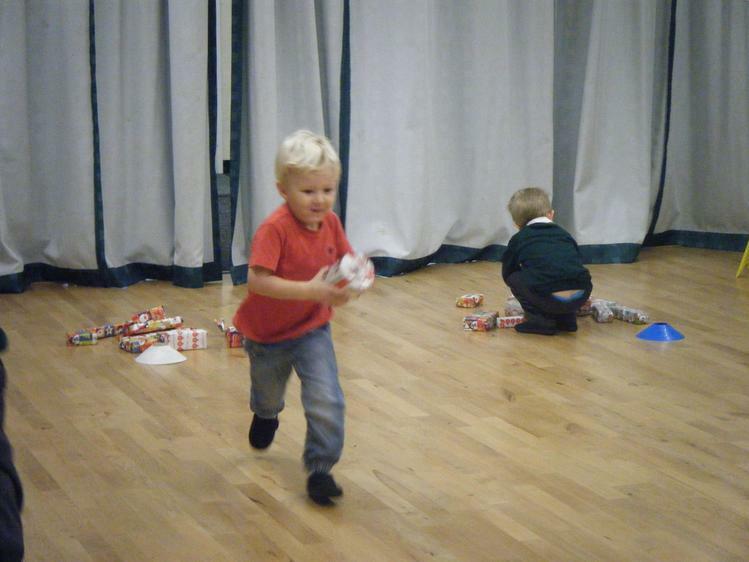 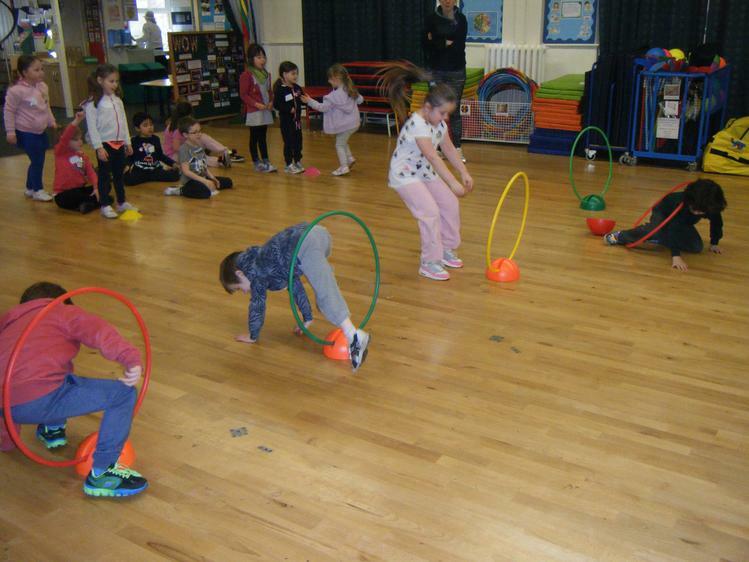 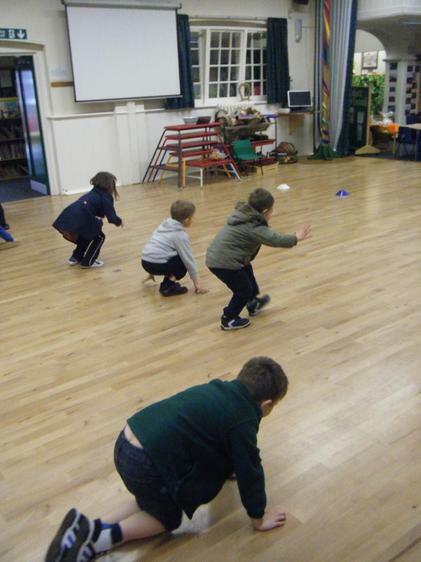 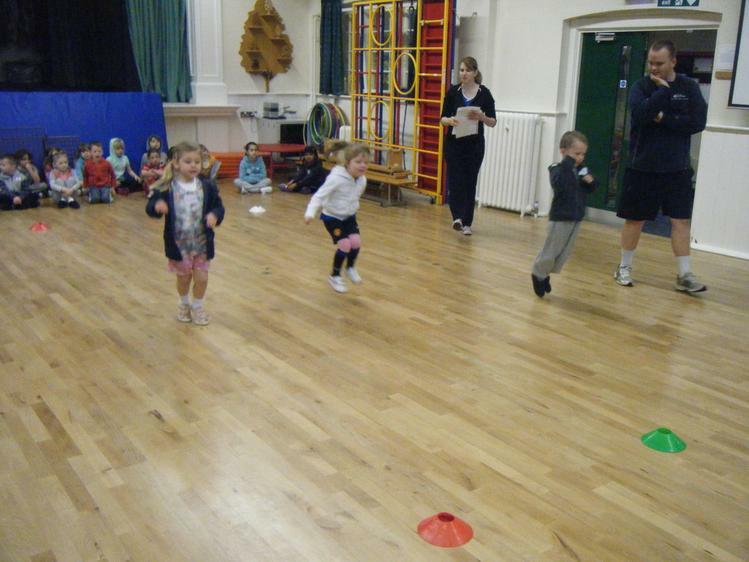 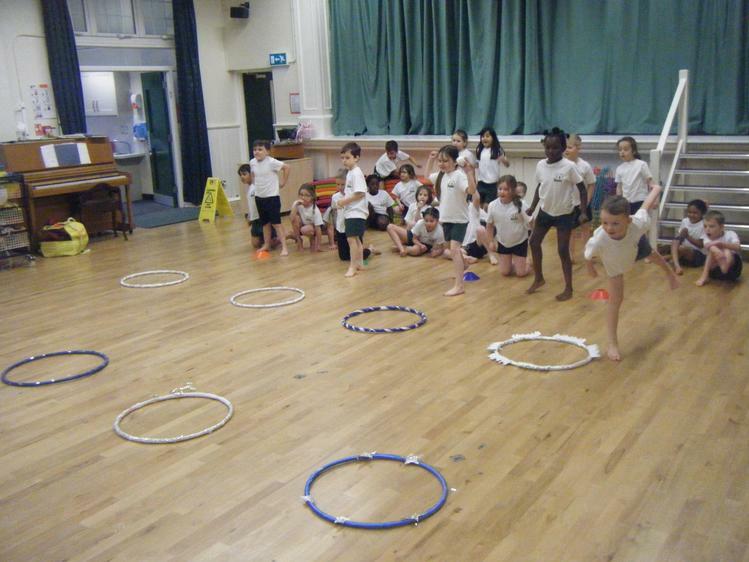 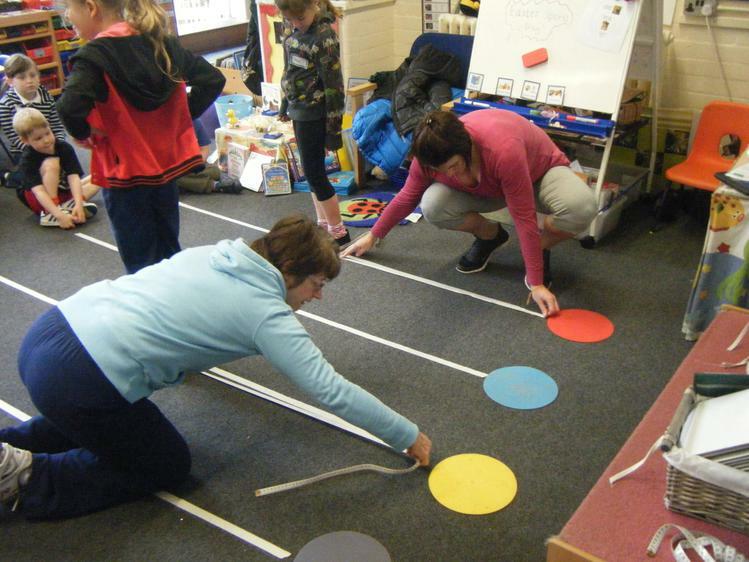 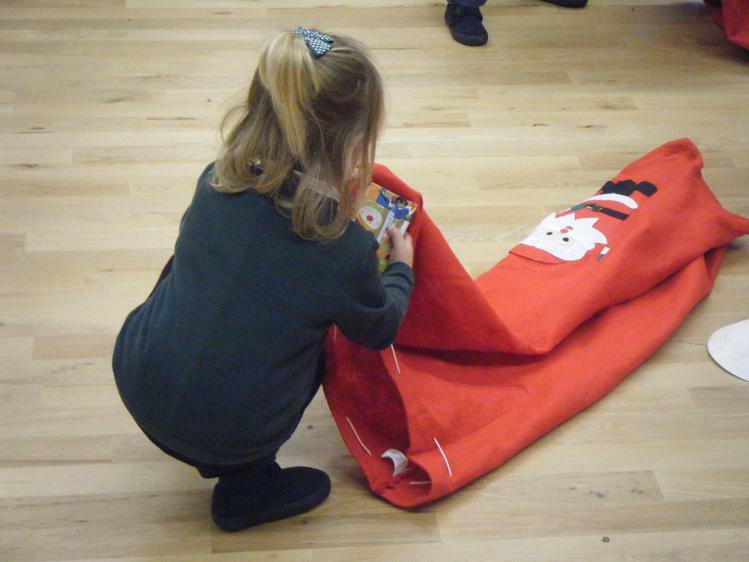 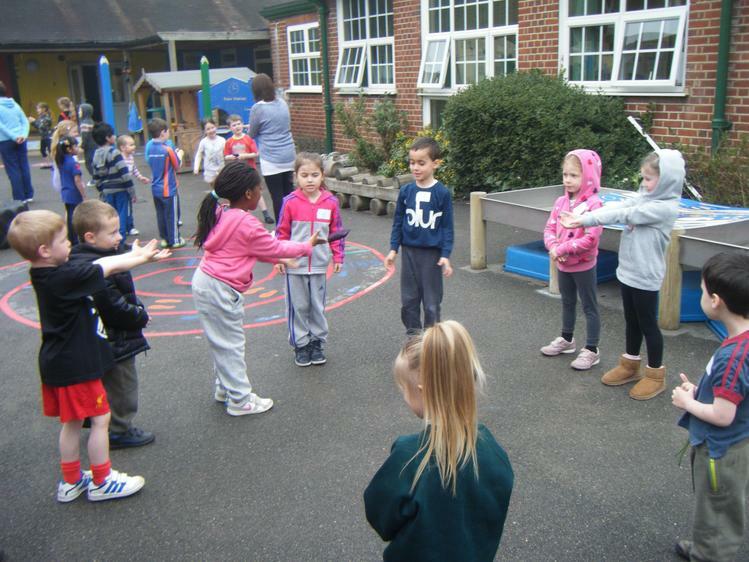 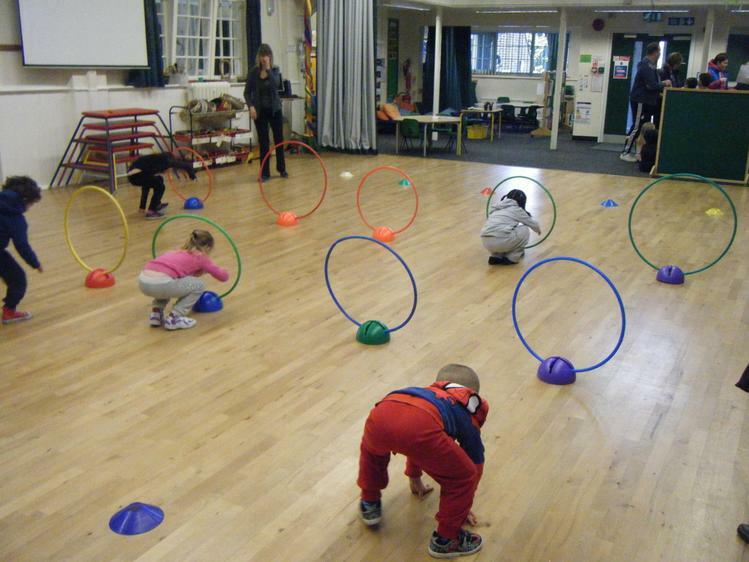 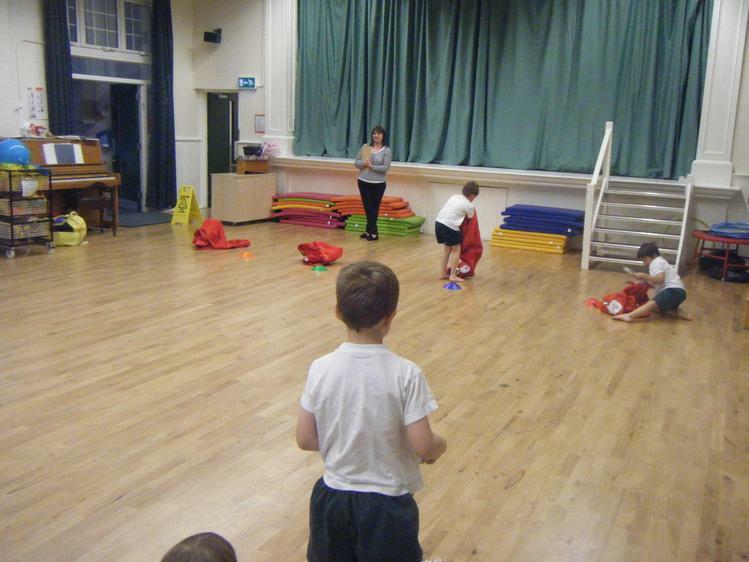 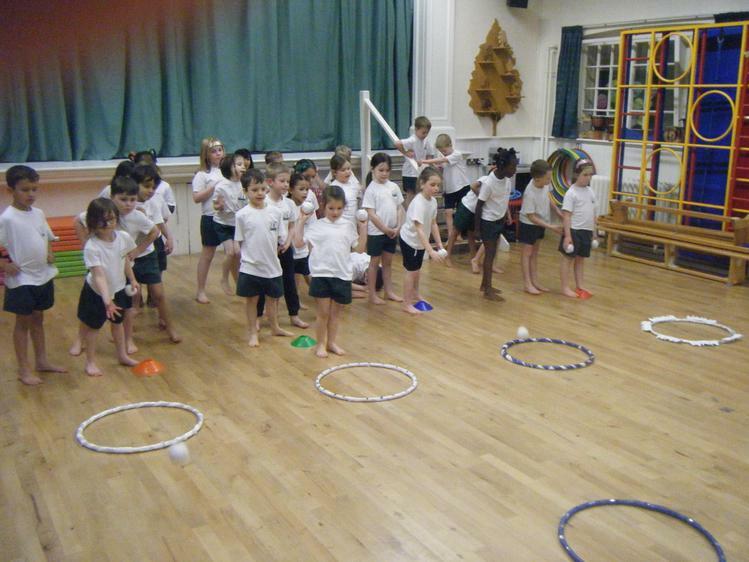 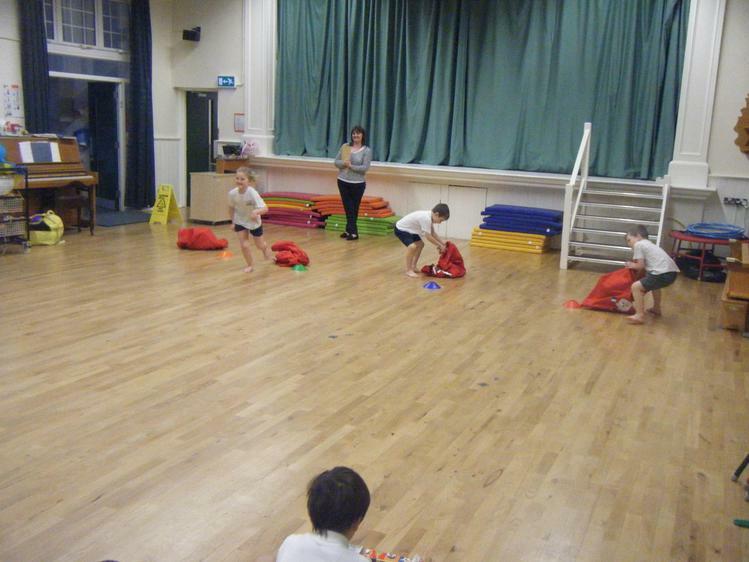 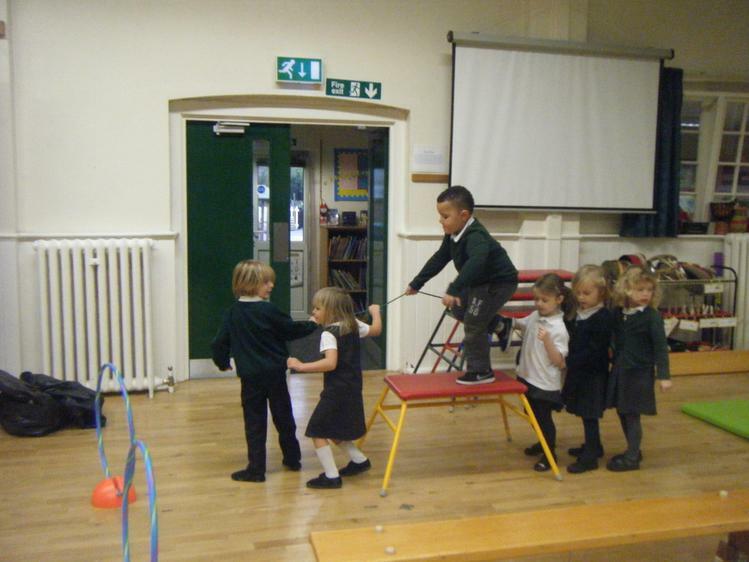 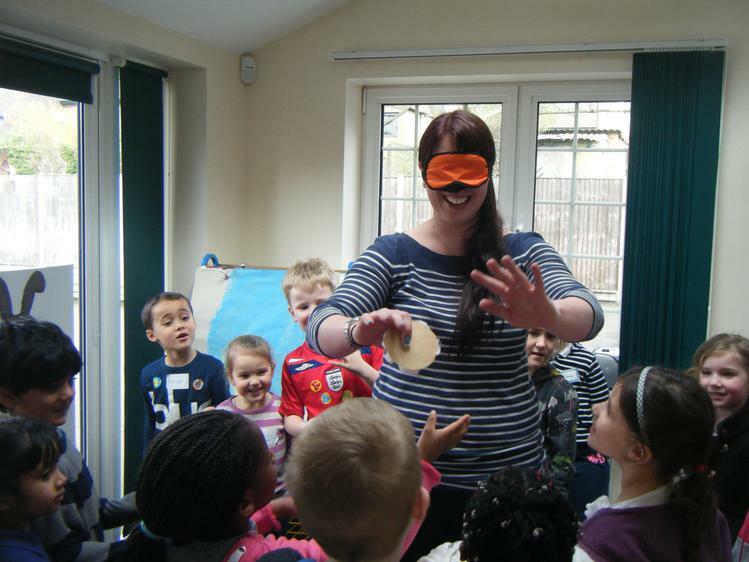 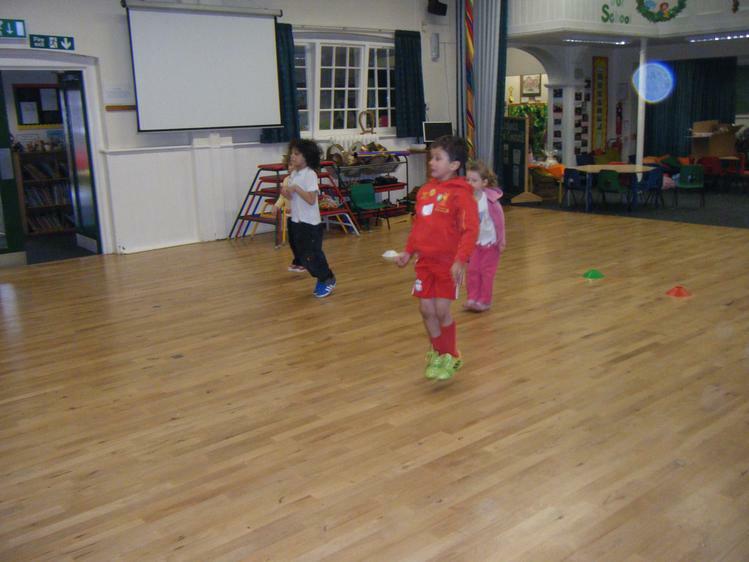 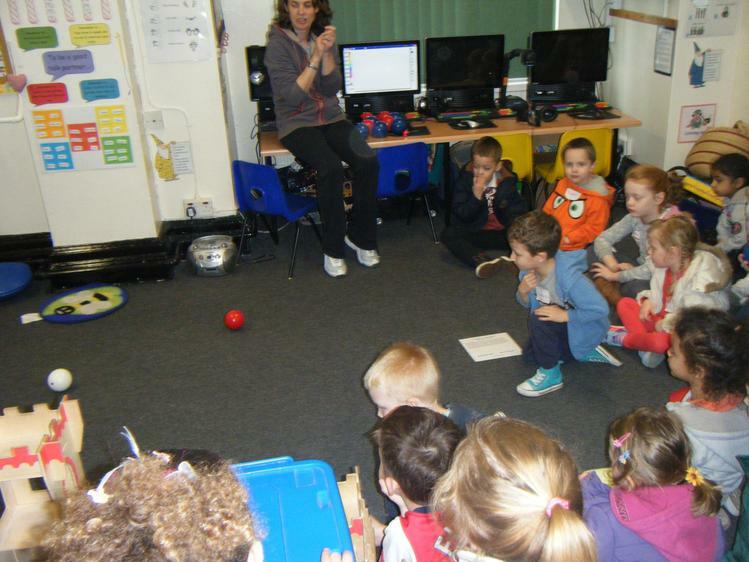 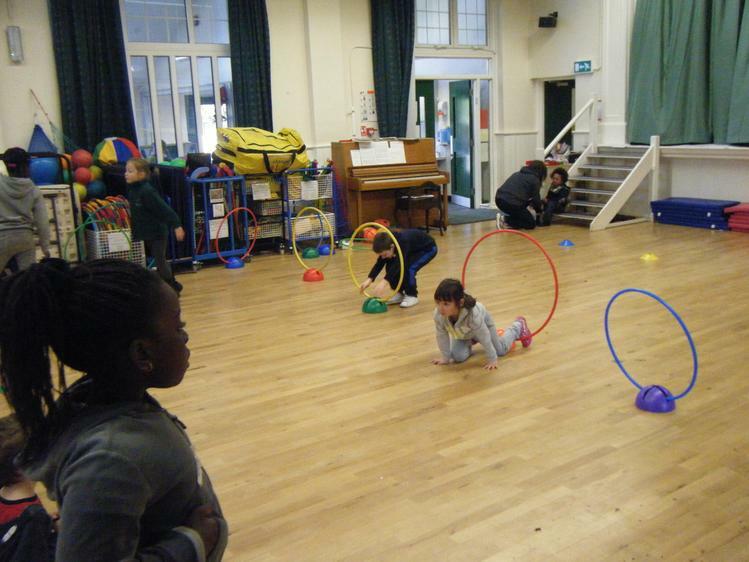 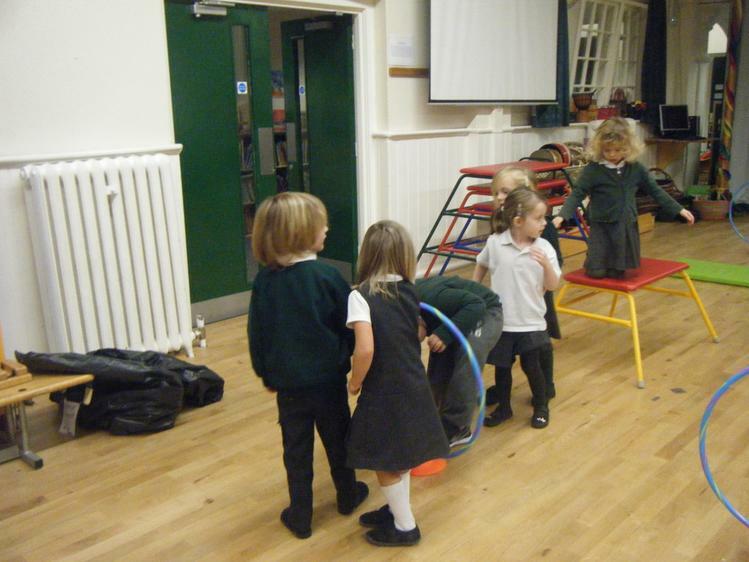 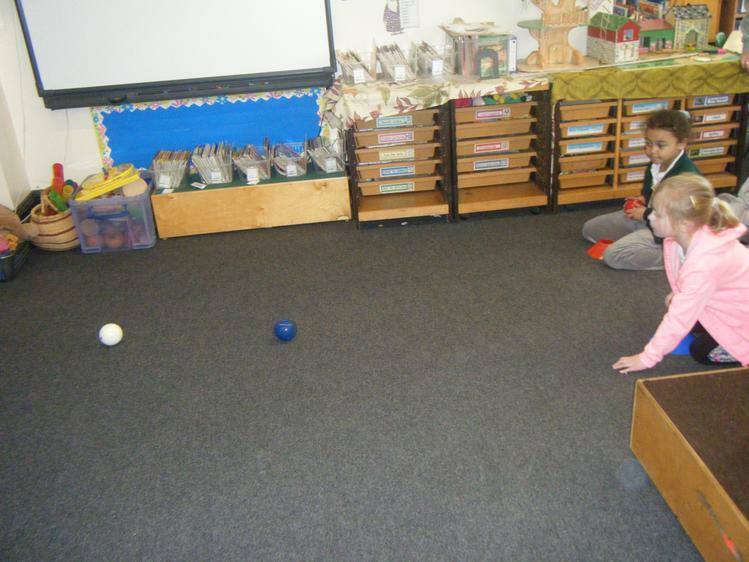 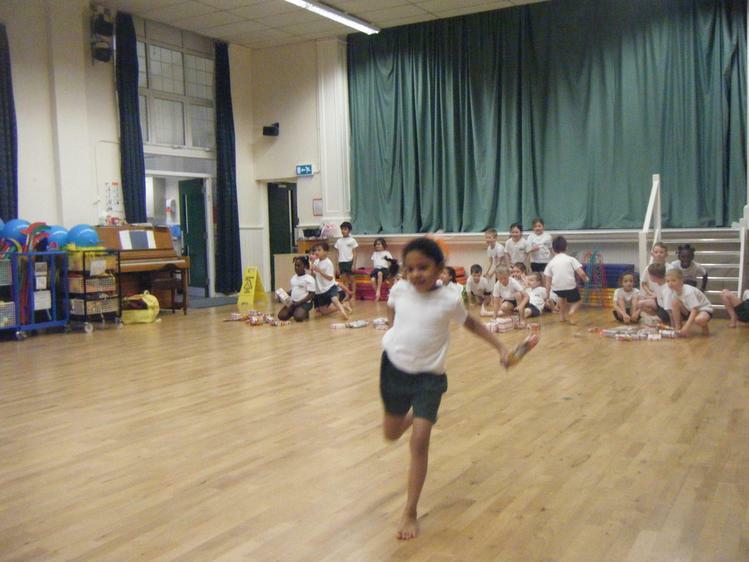 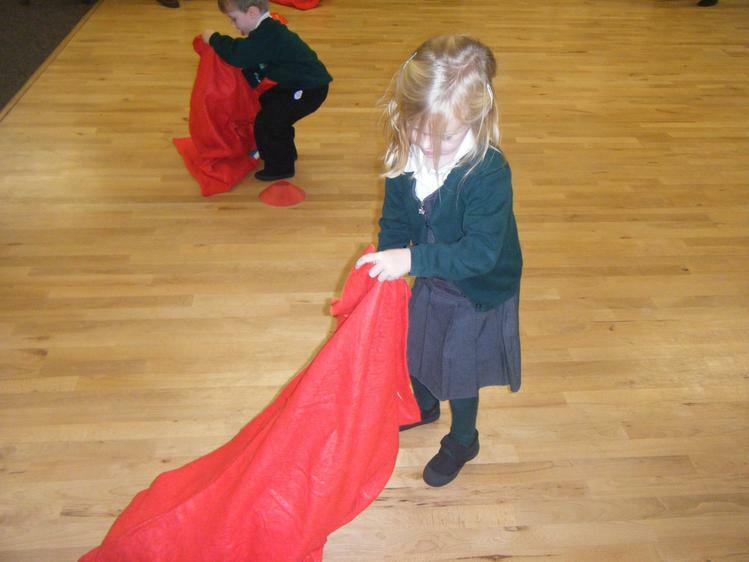 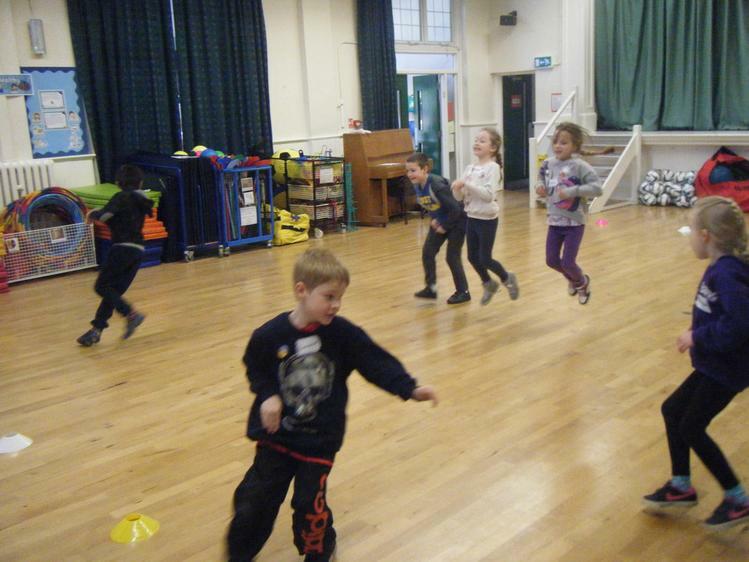 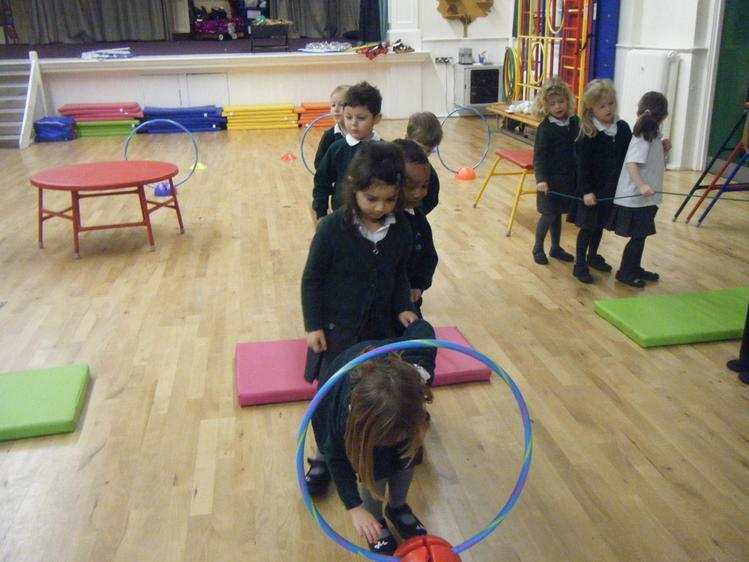 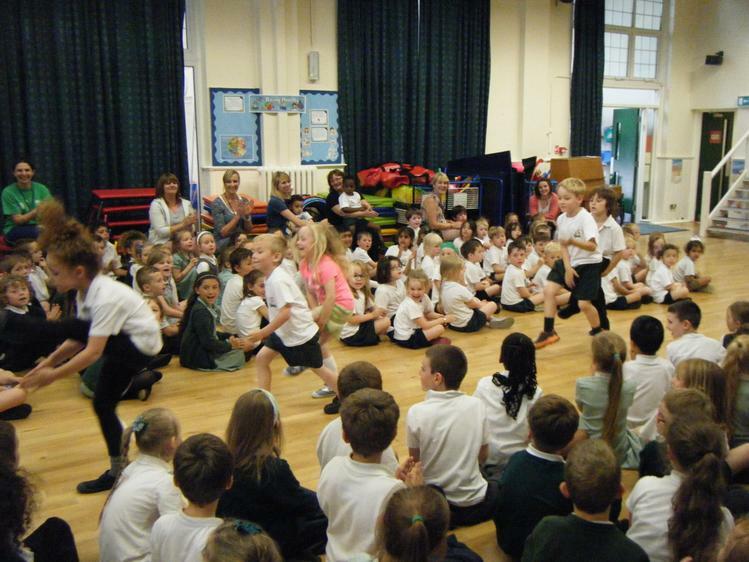 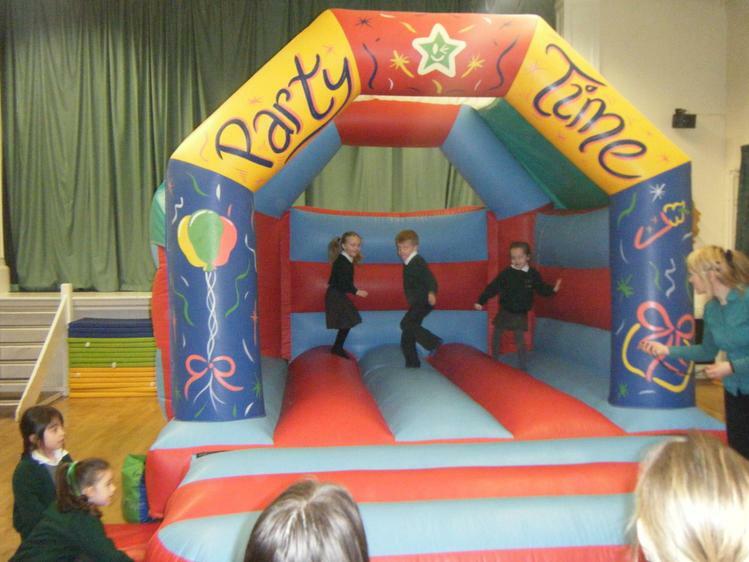 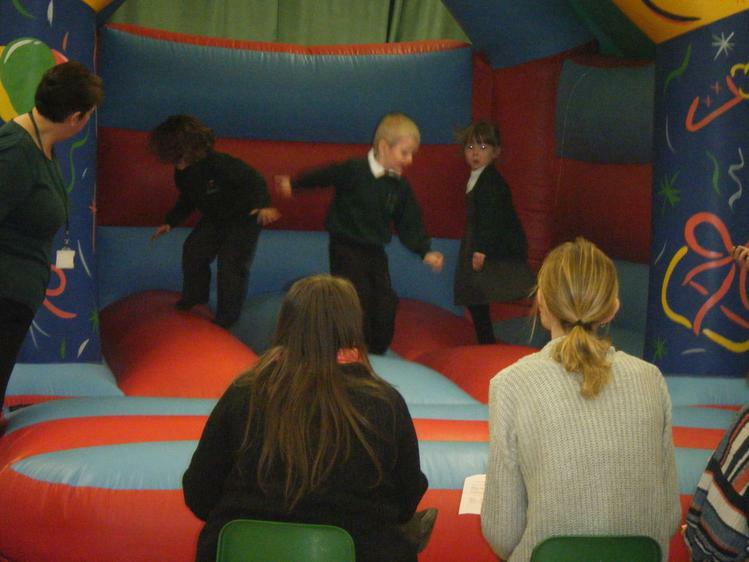 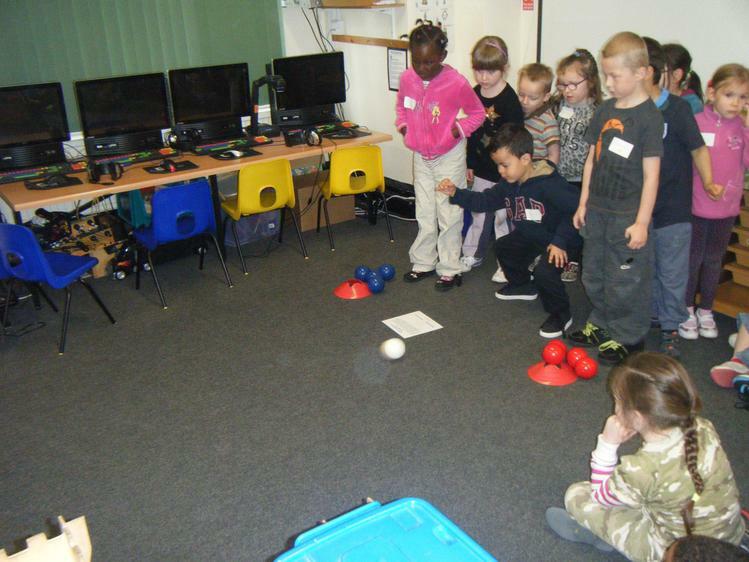 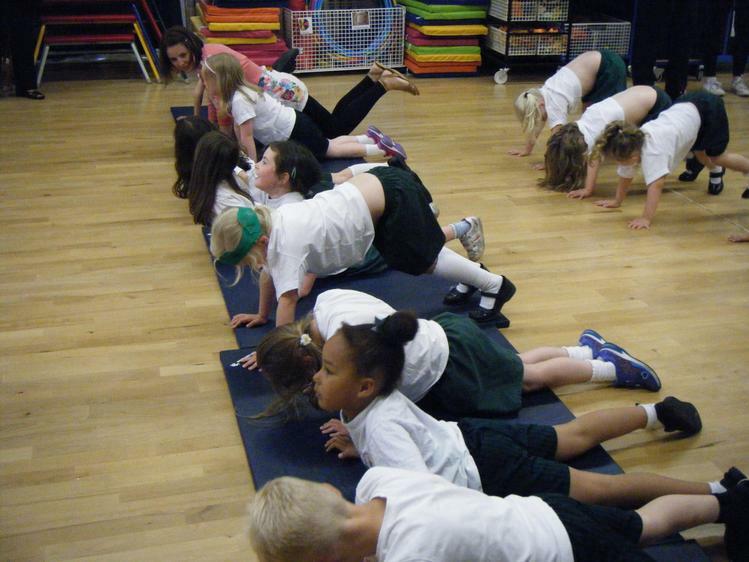 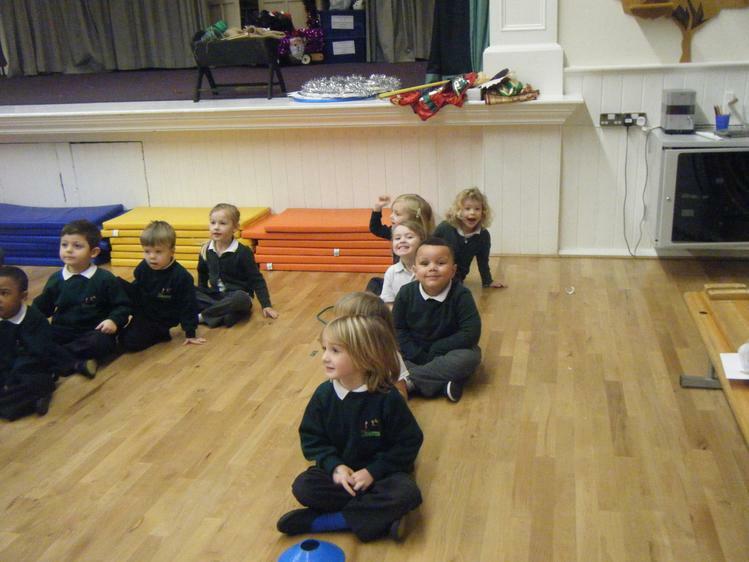 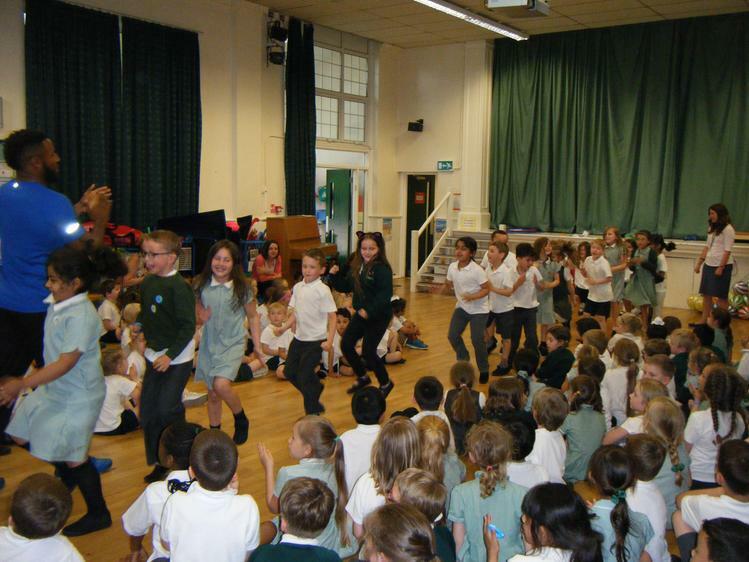 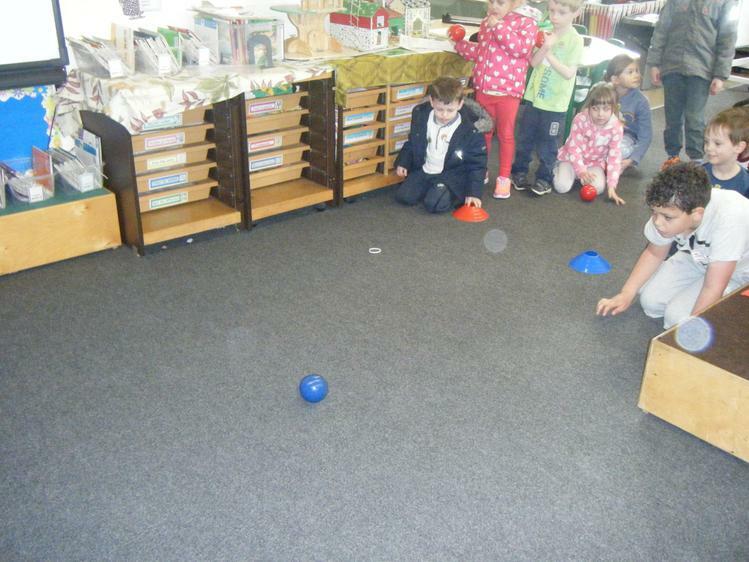 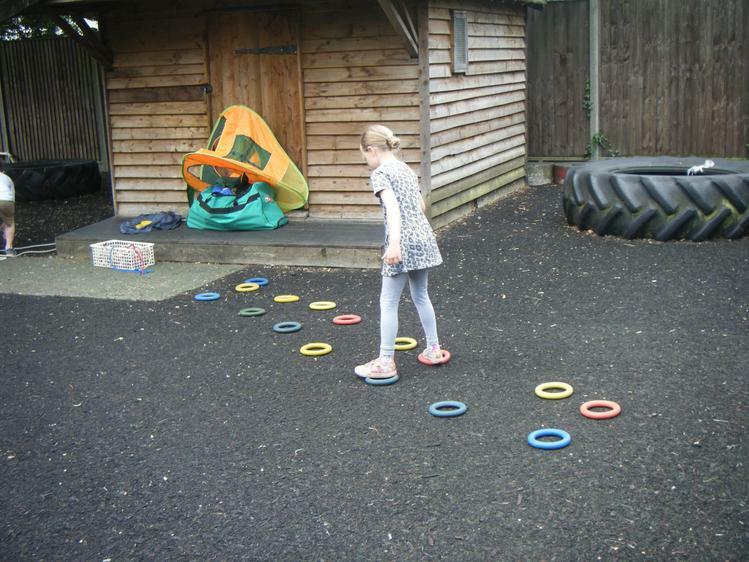 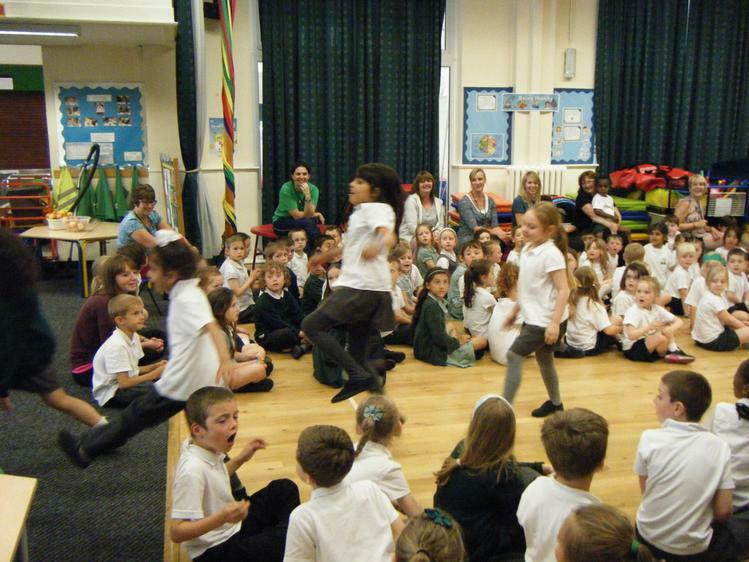 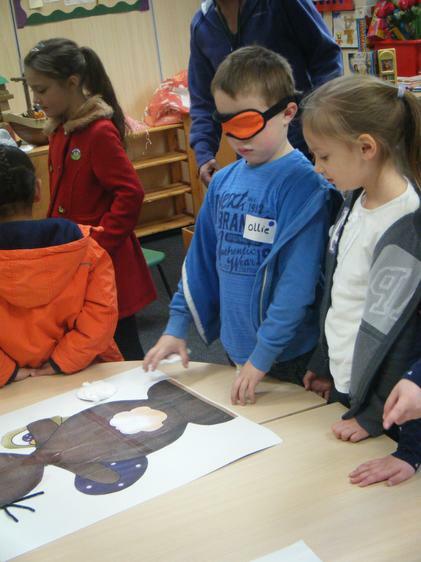 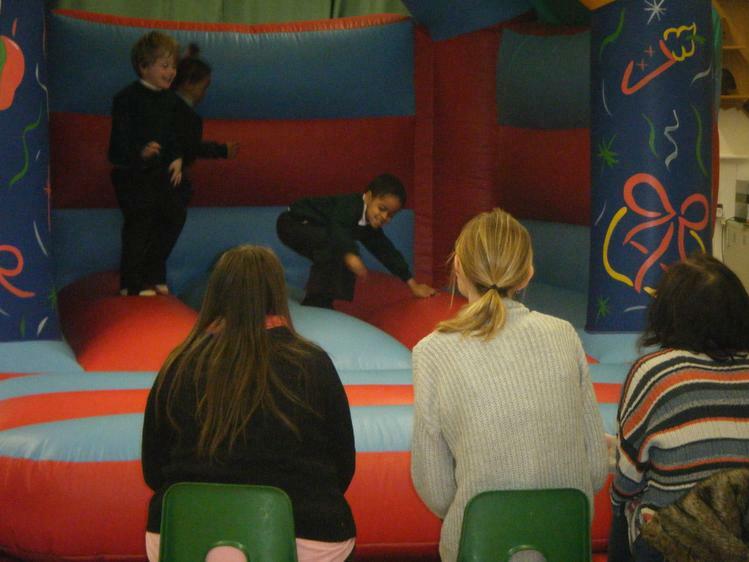 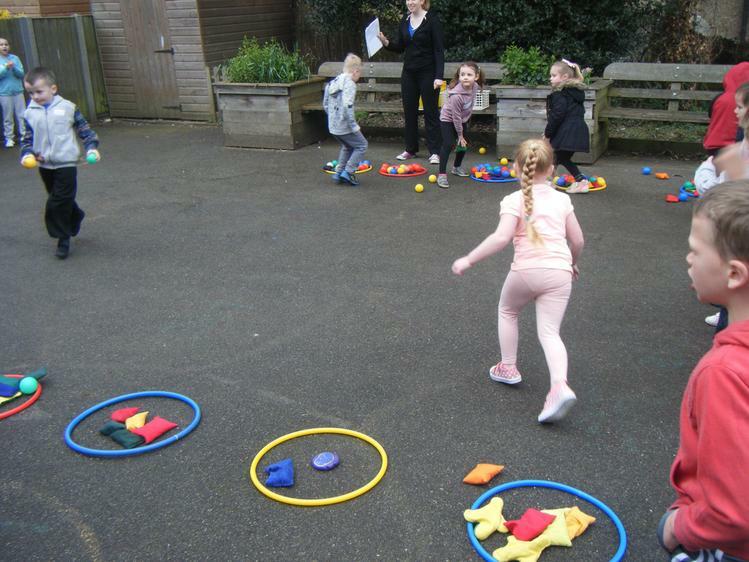 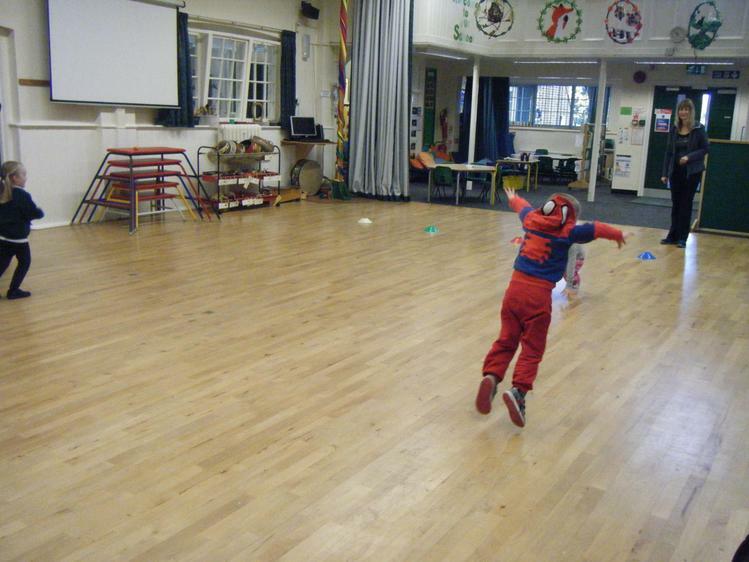 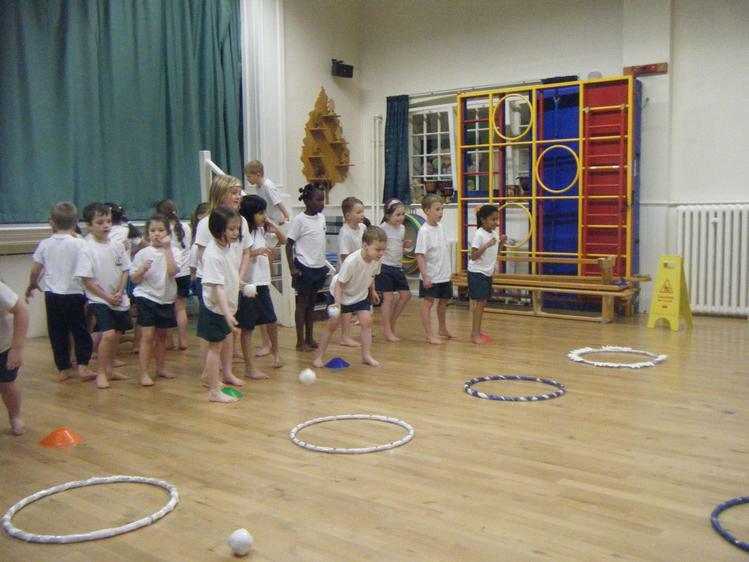 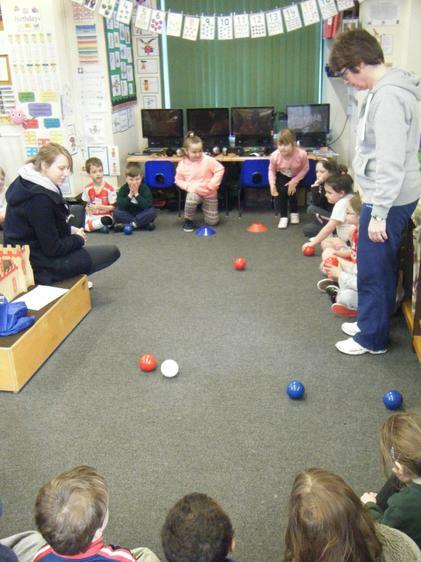 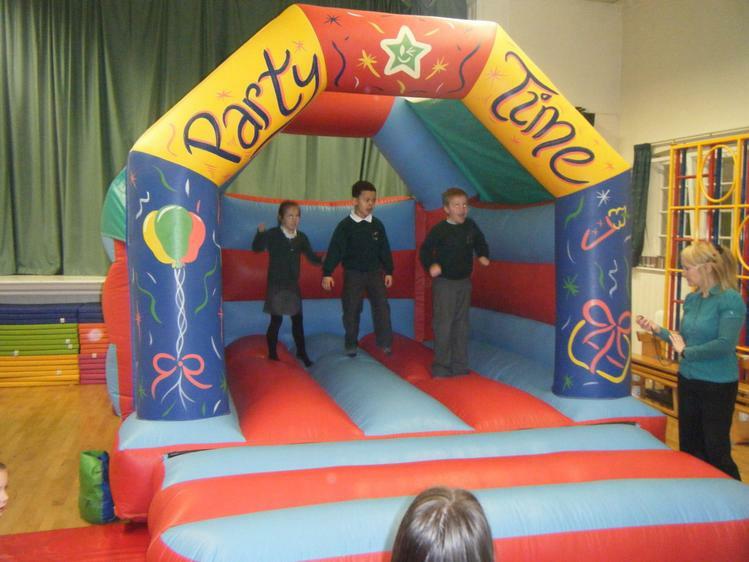 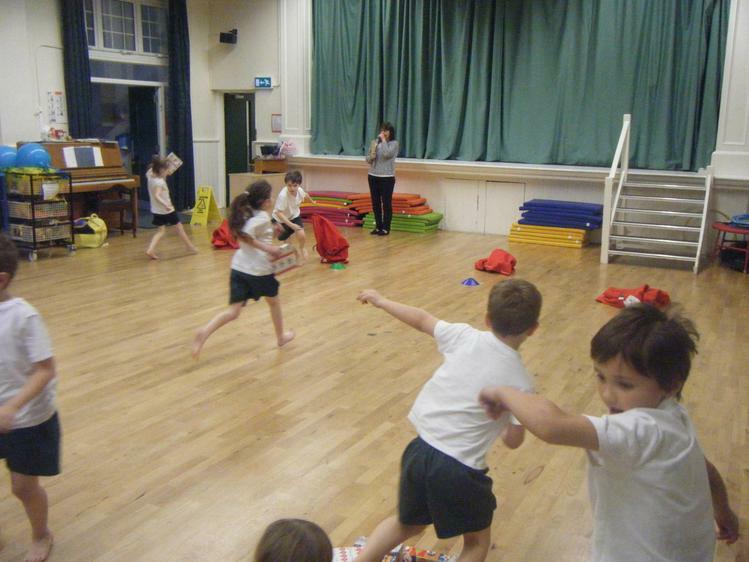 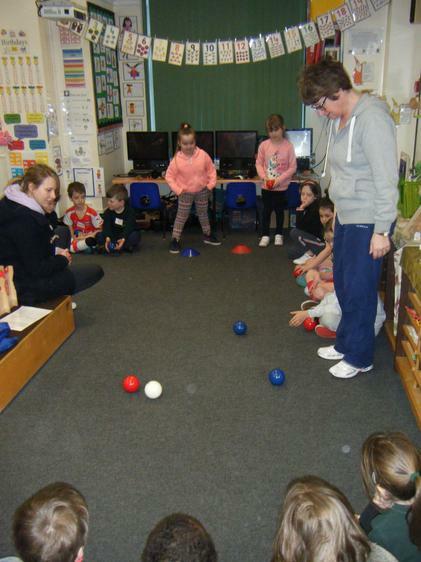 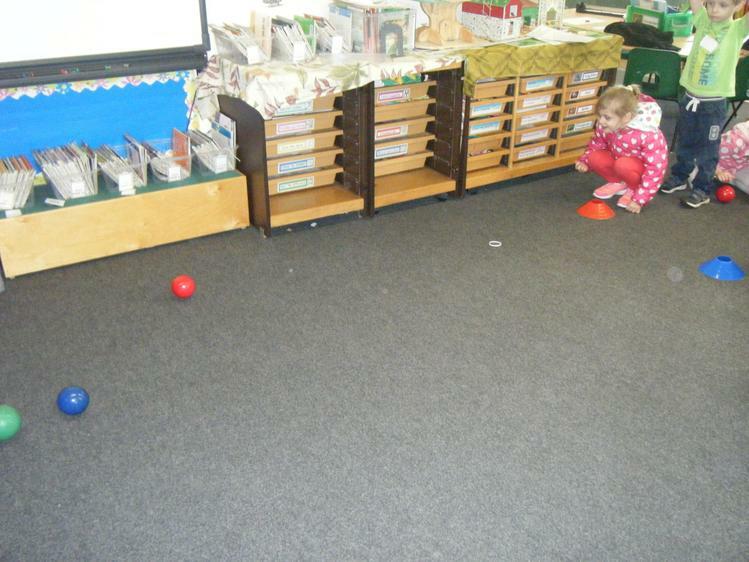 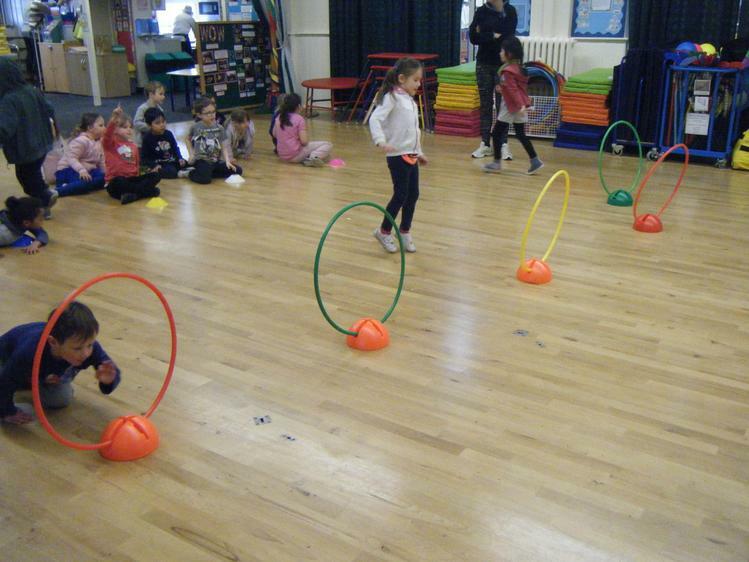 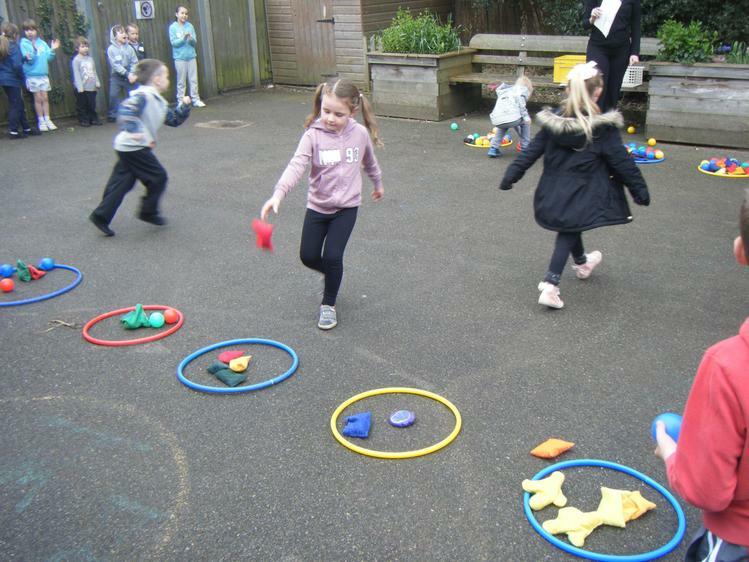 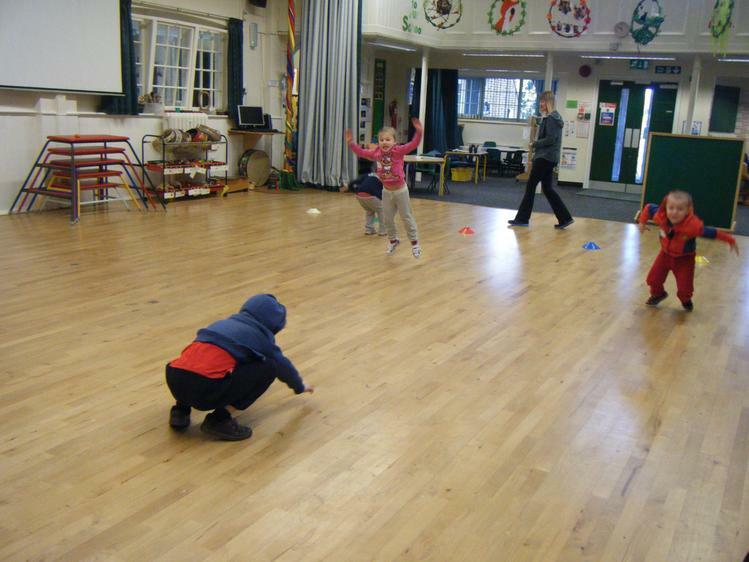 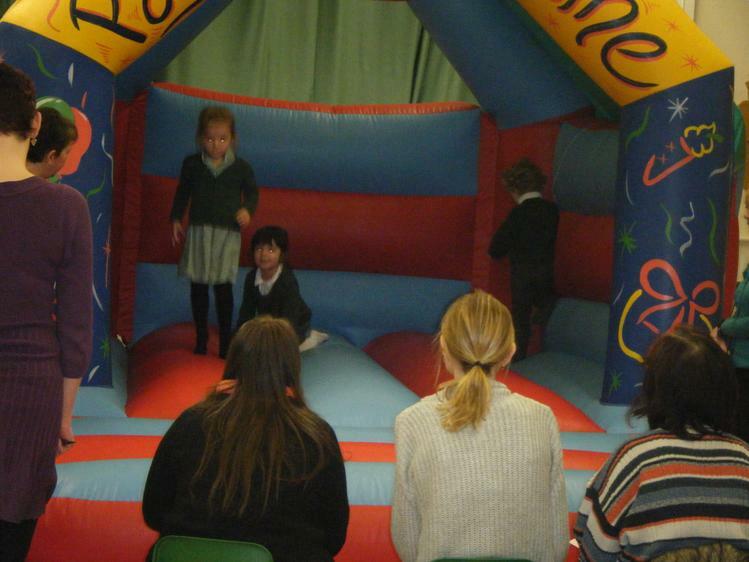 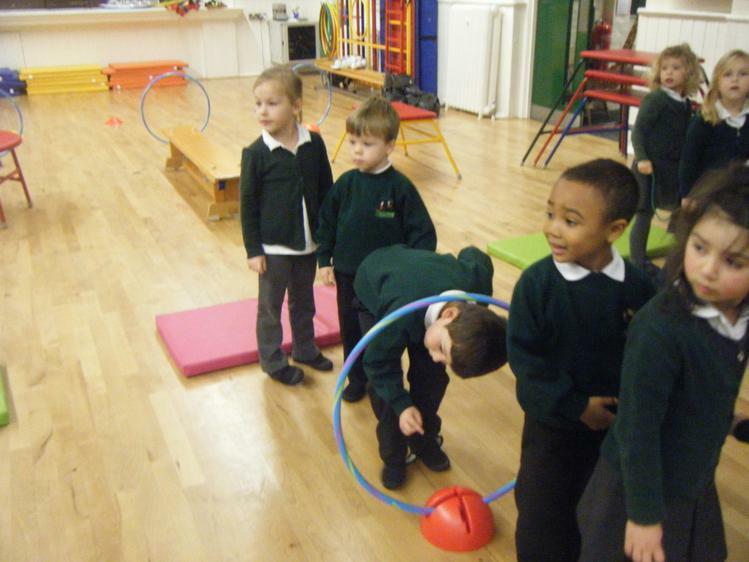 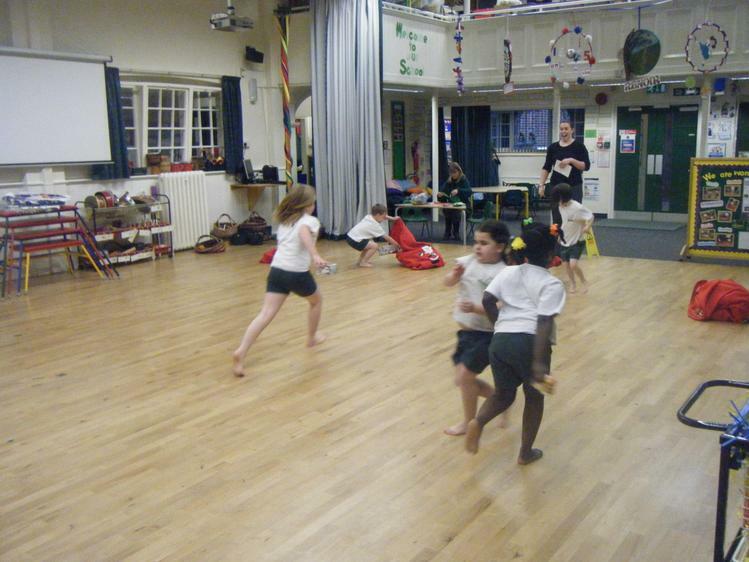 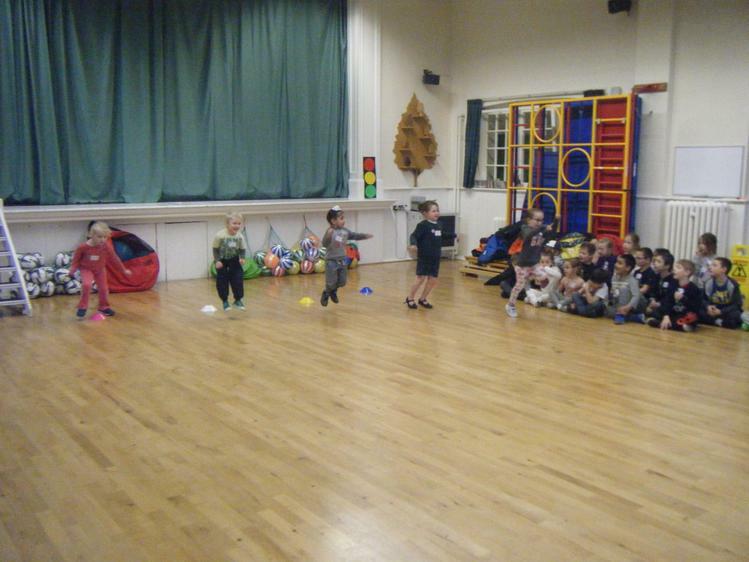 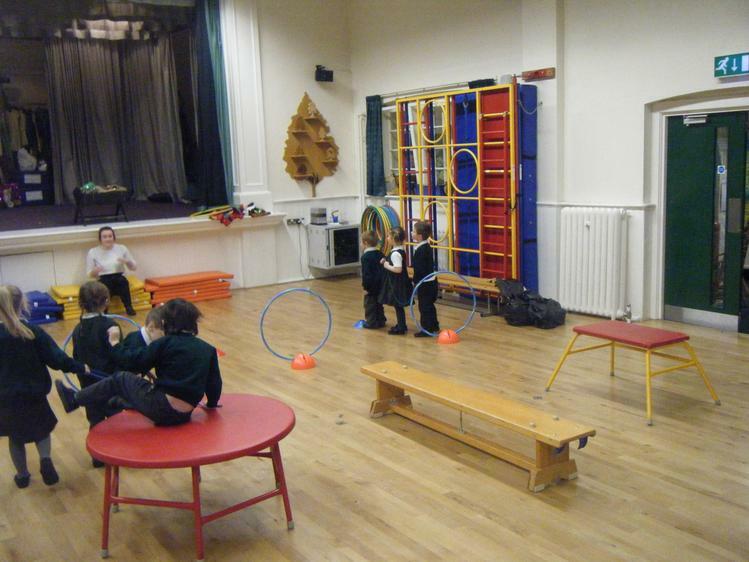 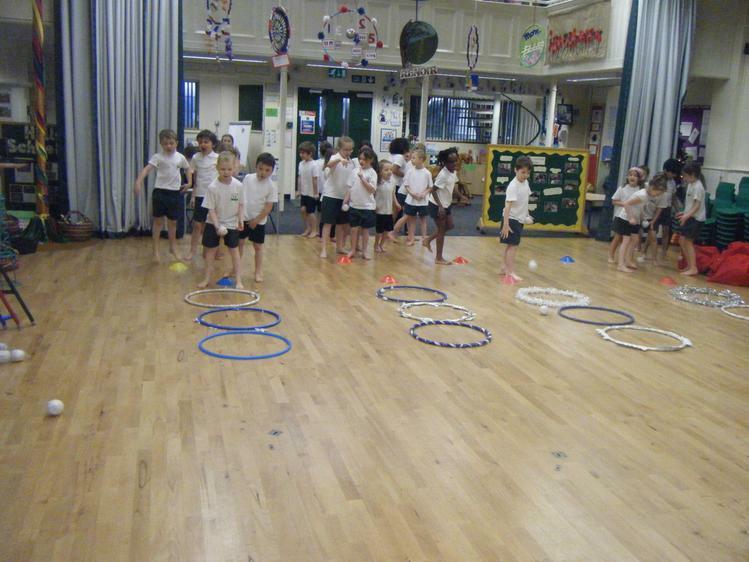 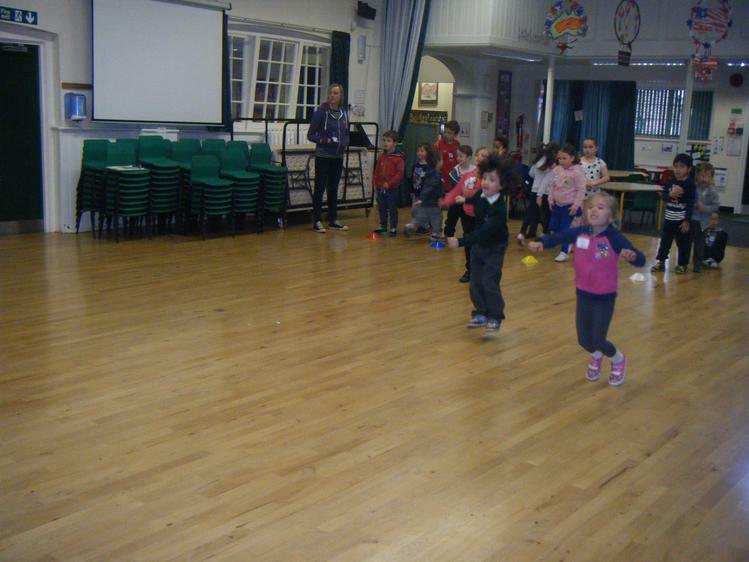 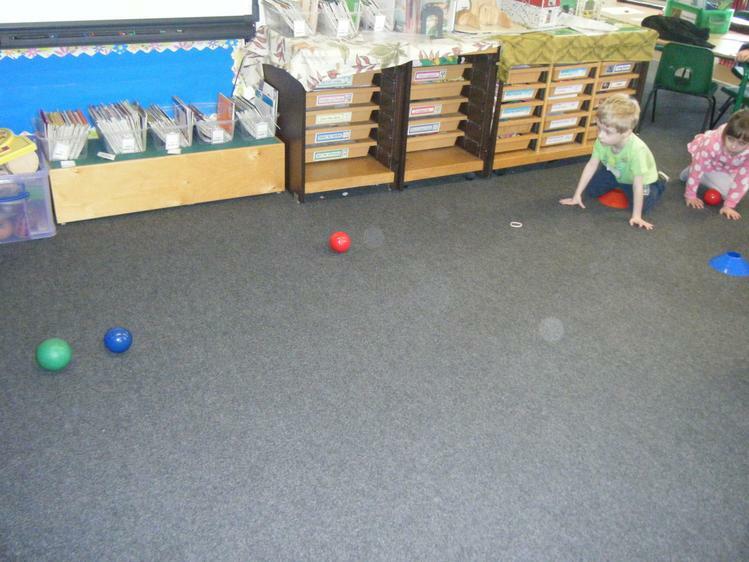 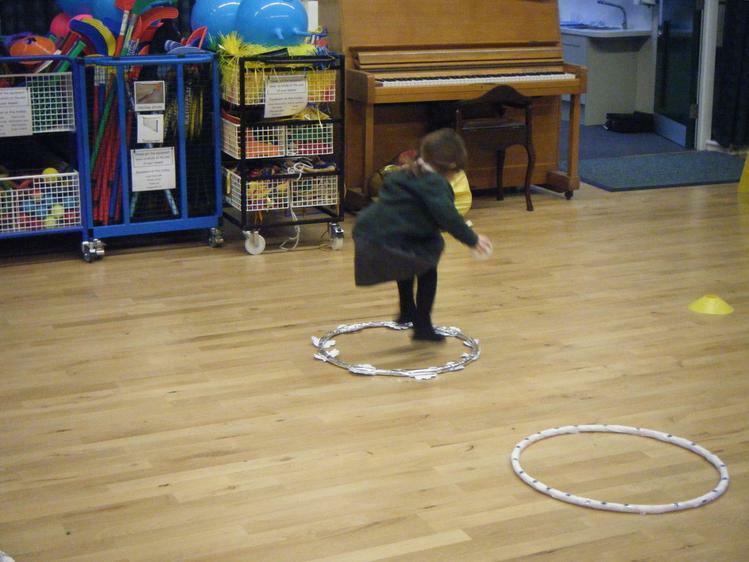 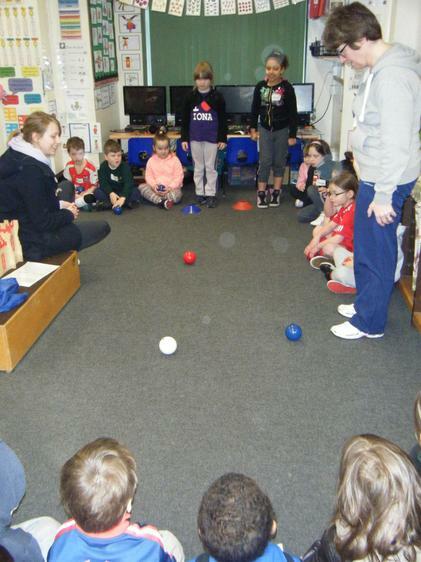 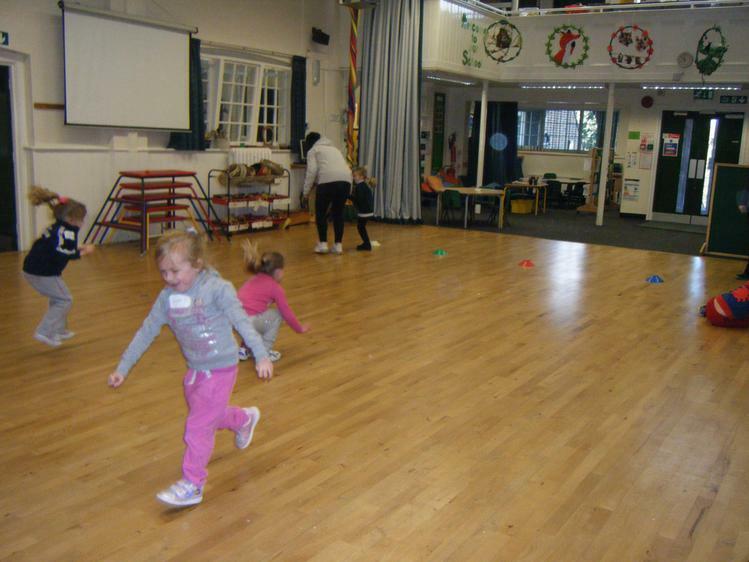 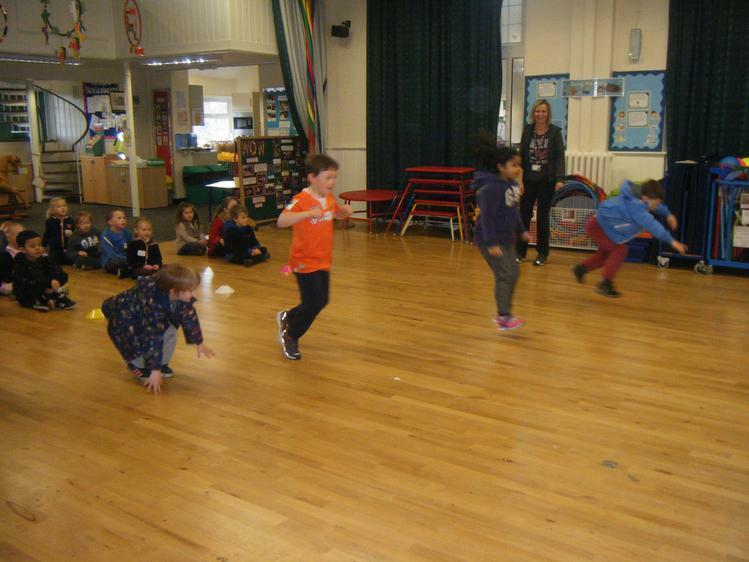 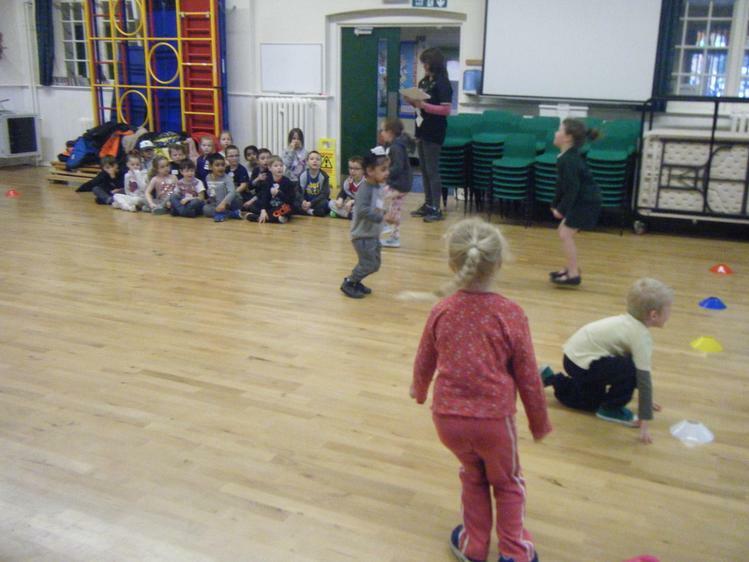 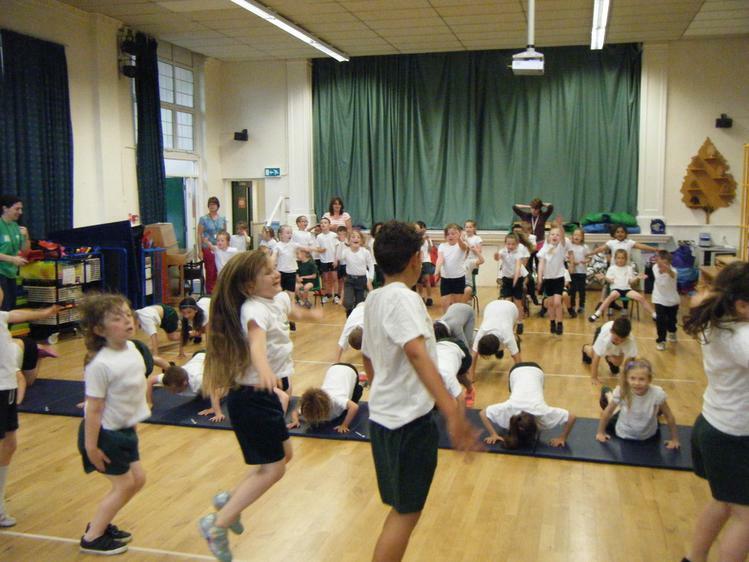 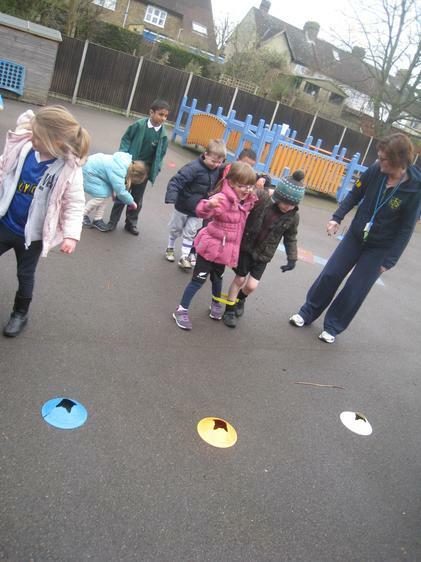 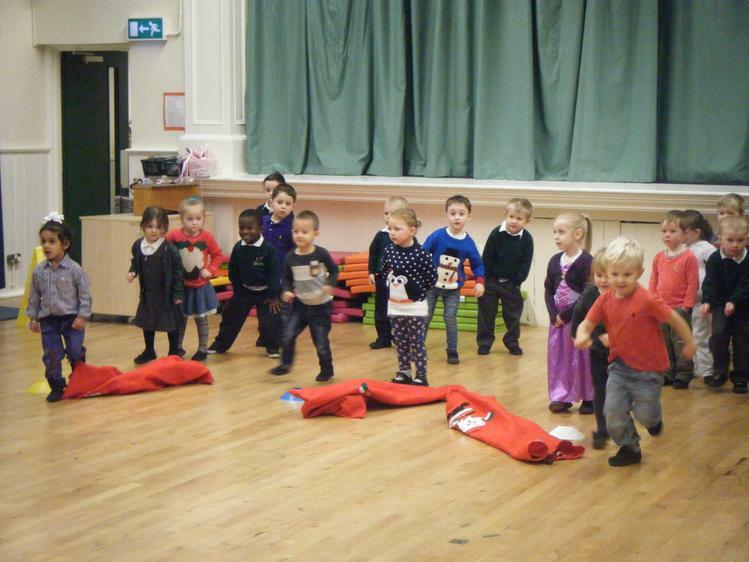 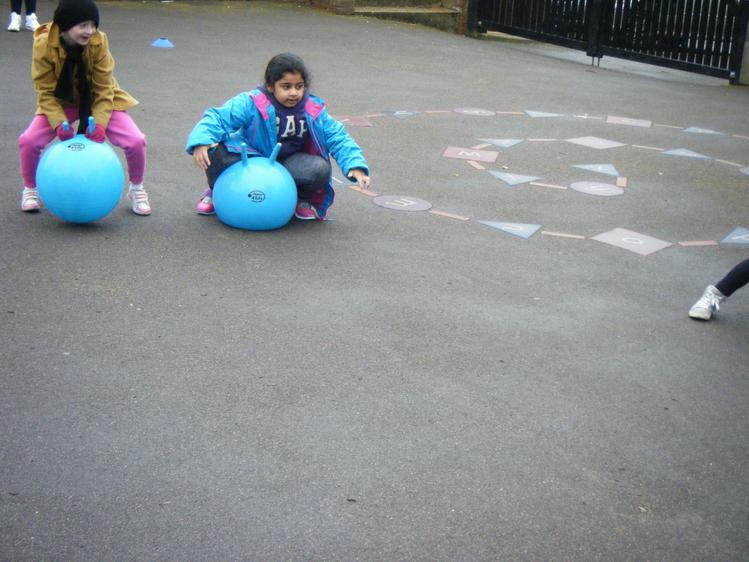 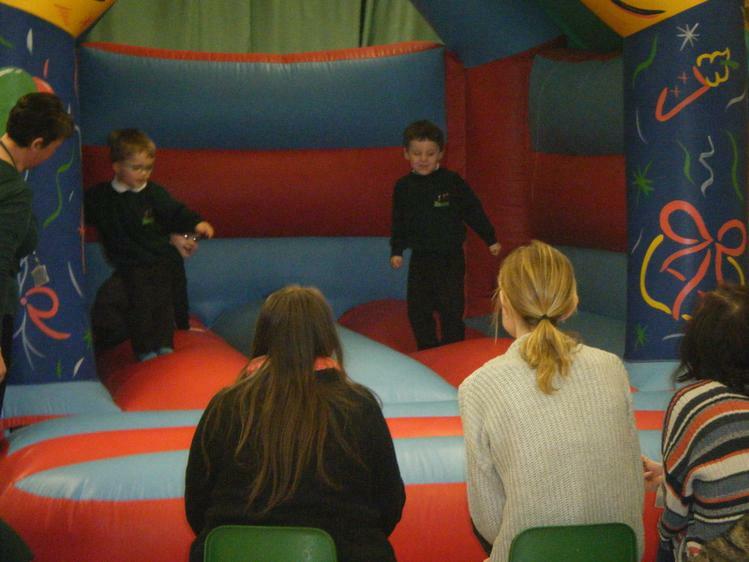 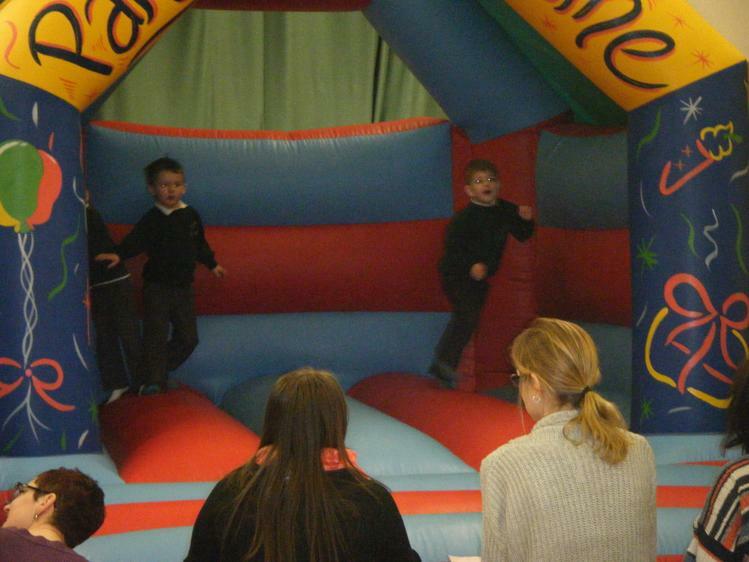 The children had great fun taking part in our Christmas Games Competition last week! 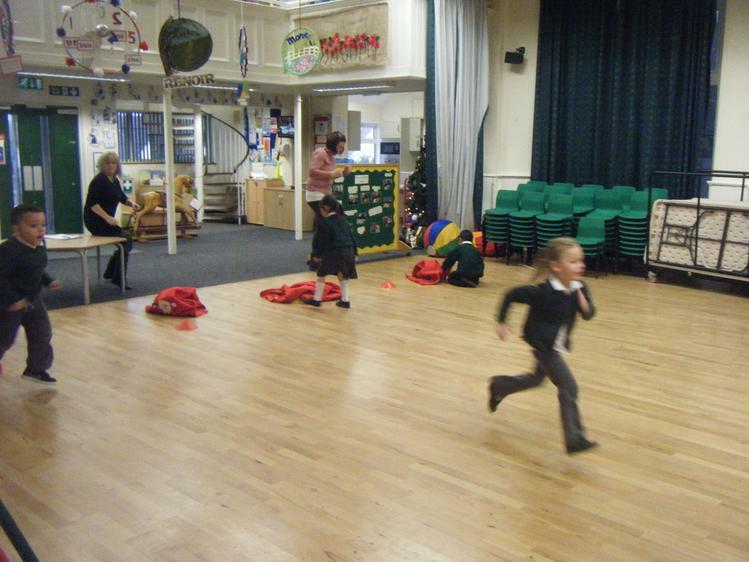 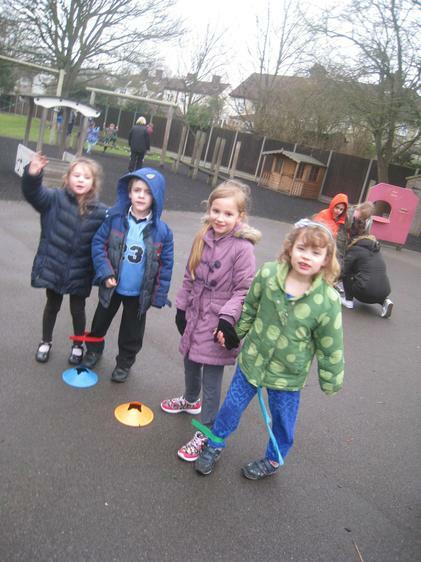 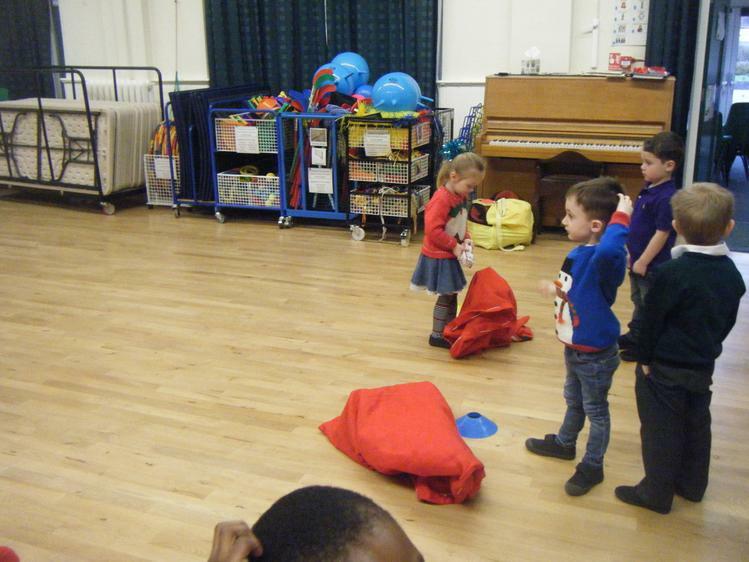 Each class was divided in to a Christmas team: Bauble, Tinsel, Holly and Cracker and competed in a stocking filling relay race, a snowball throwing challenge and a reindeer obstacle course. 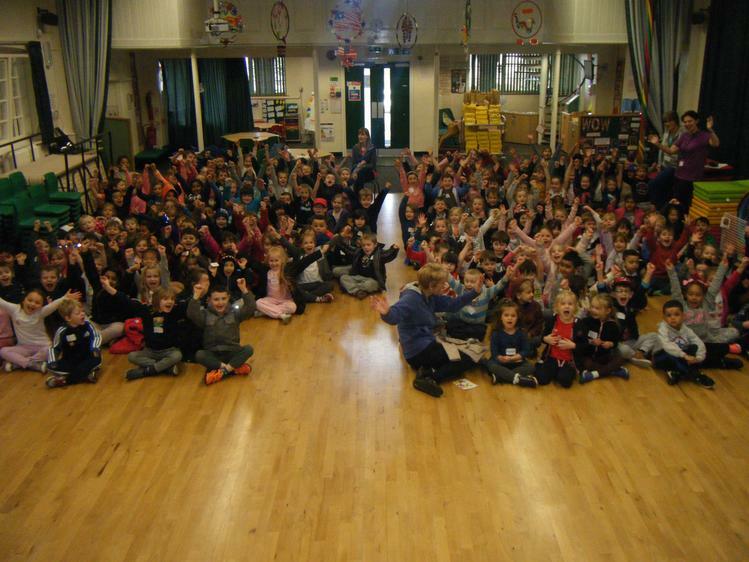 Mrs Wilson was very proud to announce that Tinsel team was the winning team across the school and presented them with a Christmassy certificate! 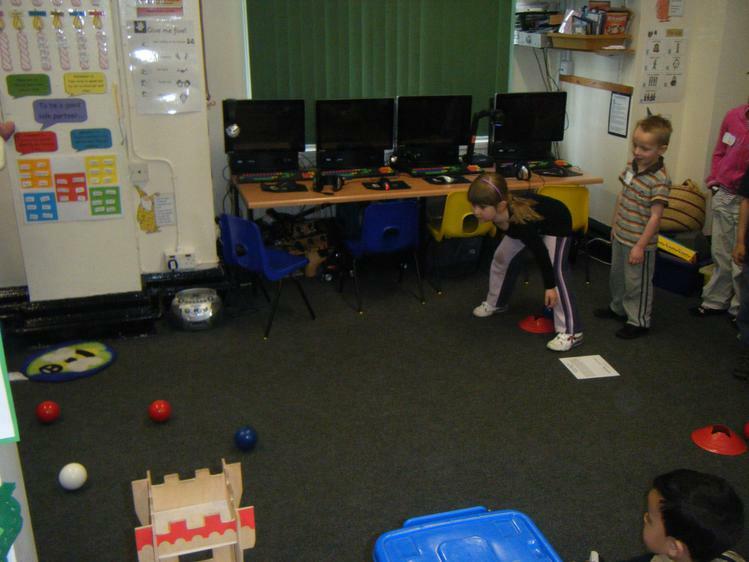 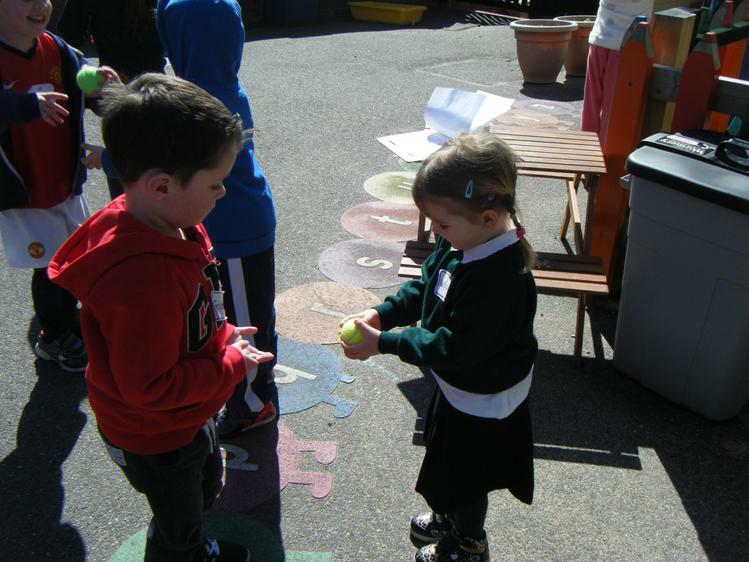 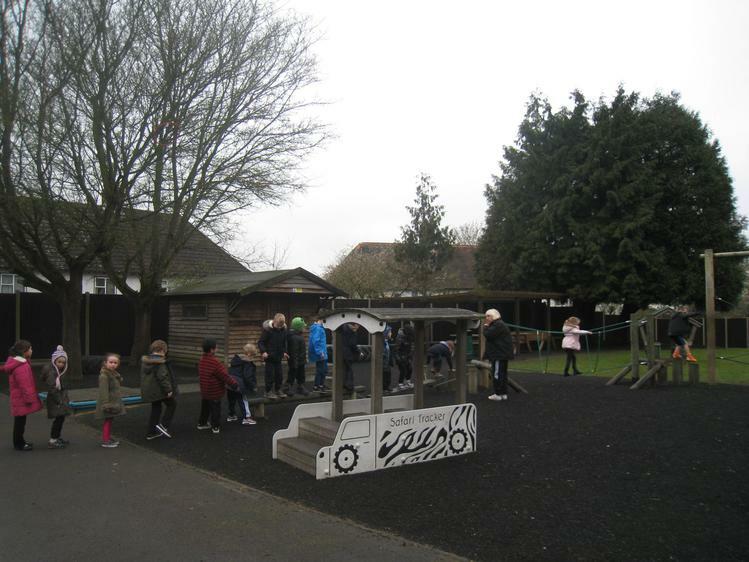 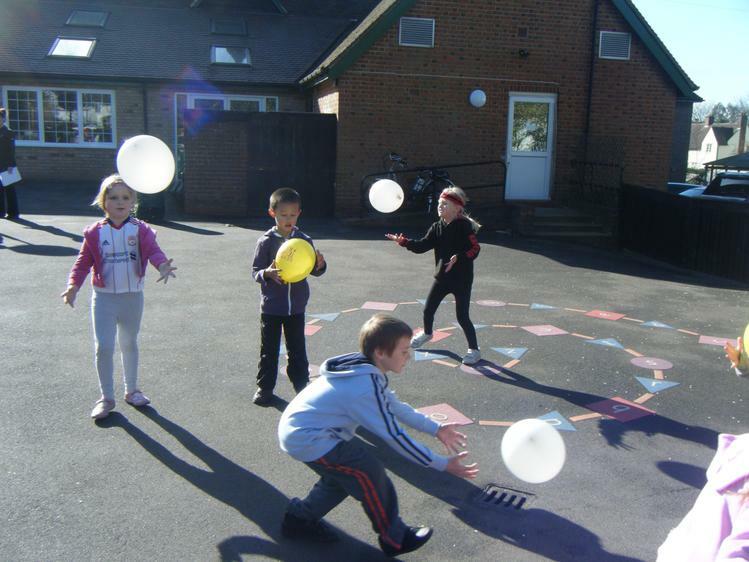 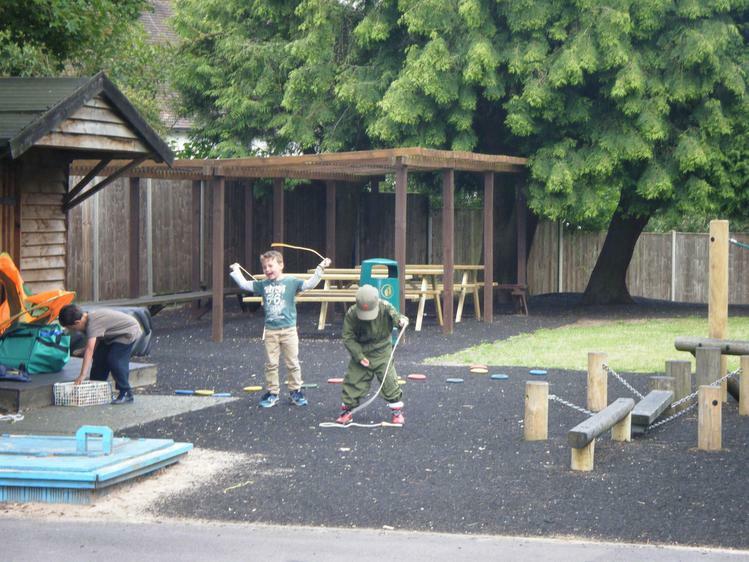 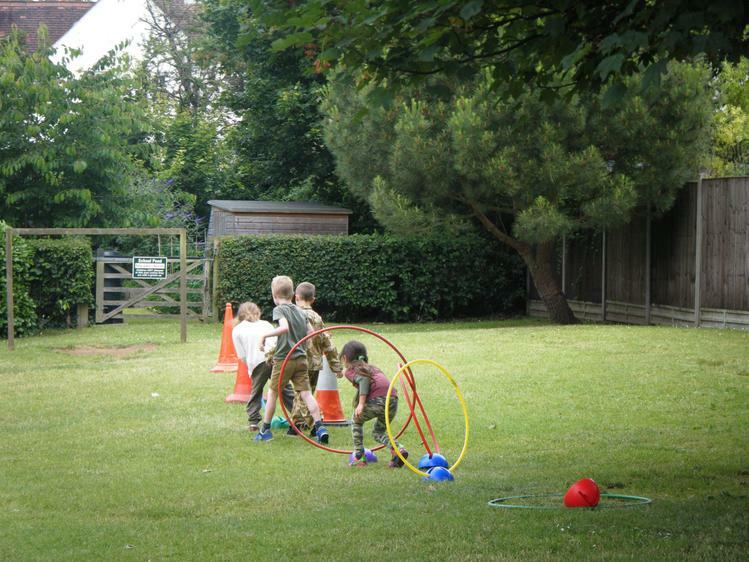 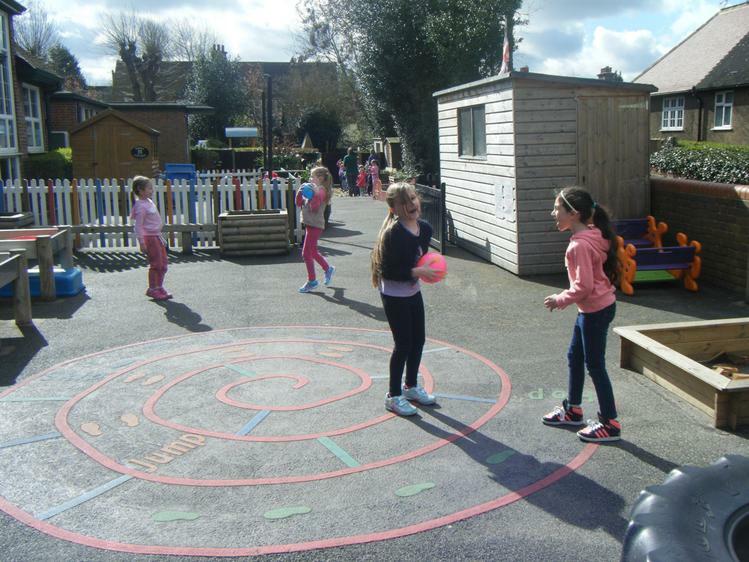 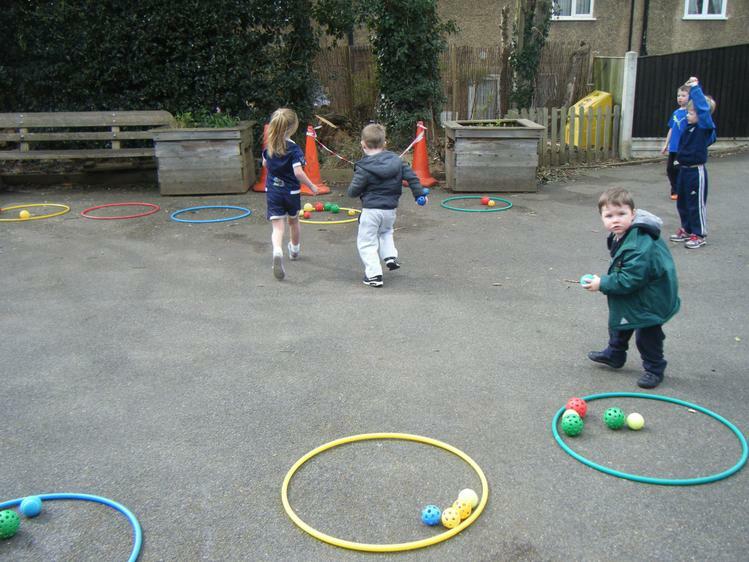 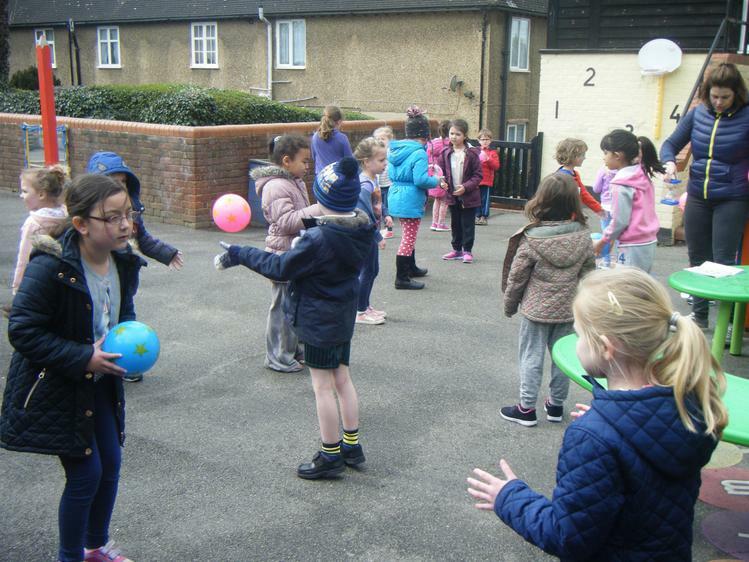 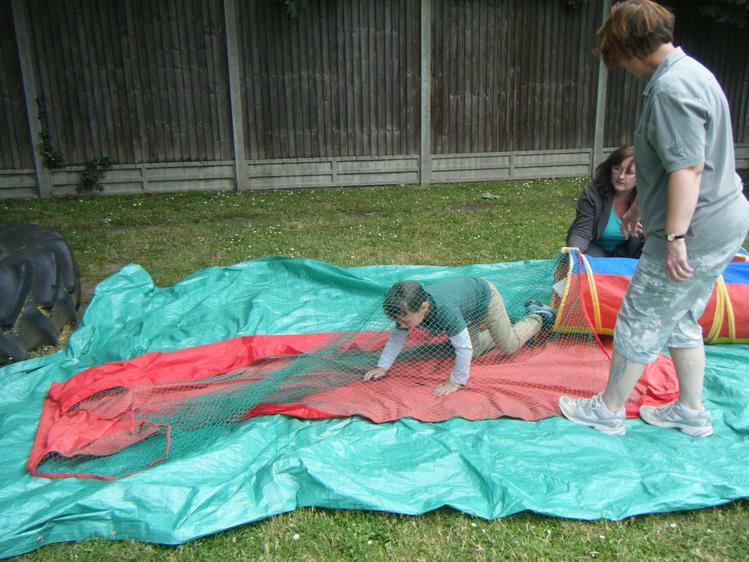 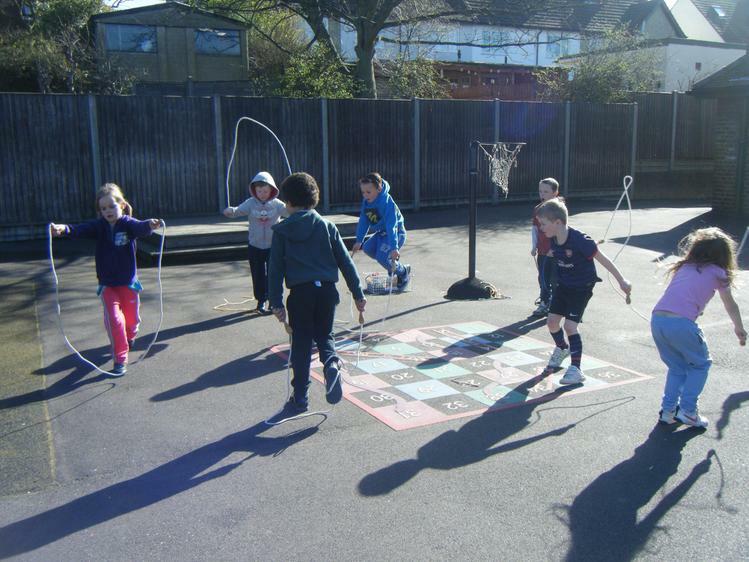 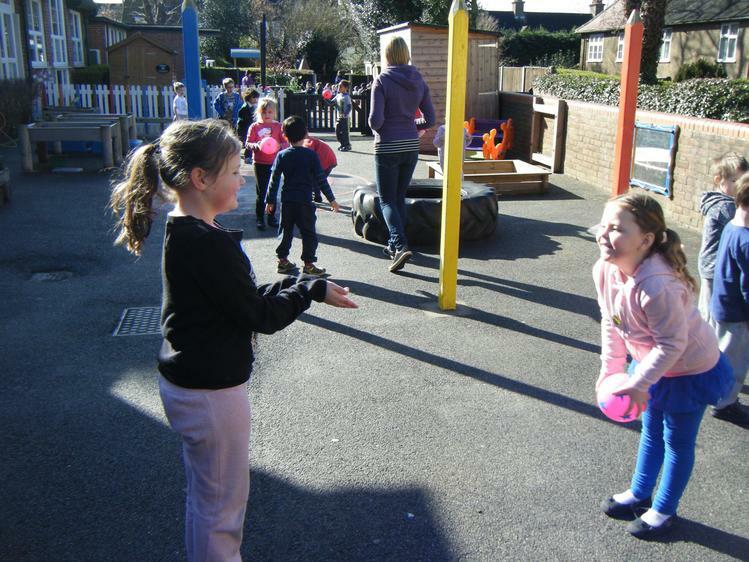 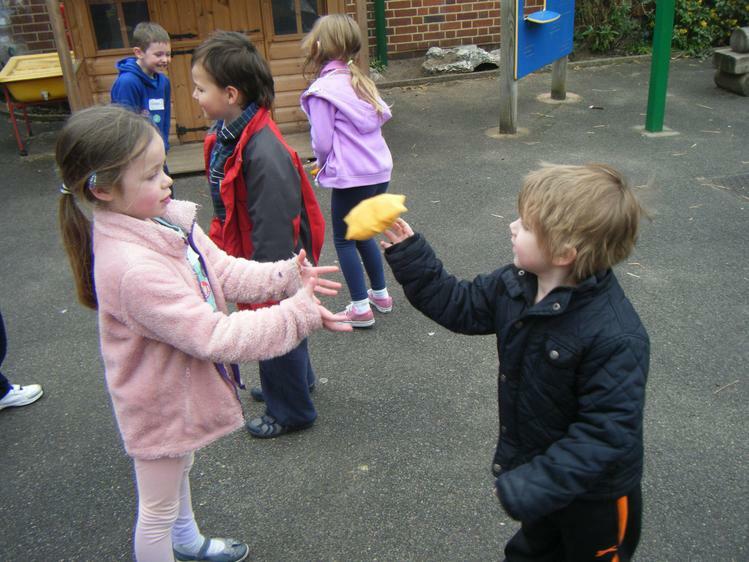 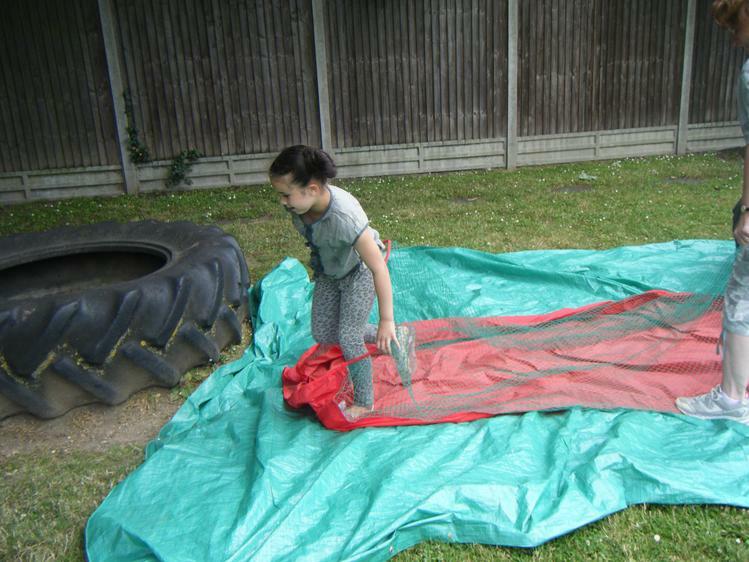 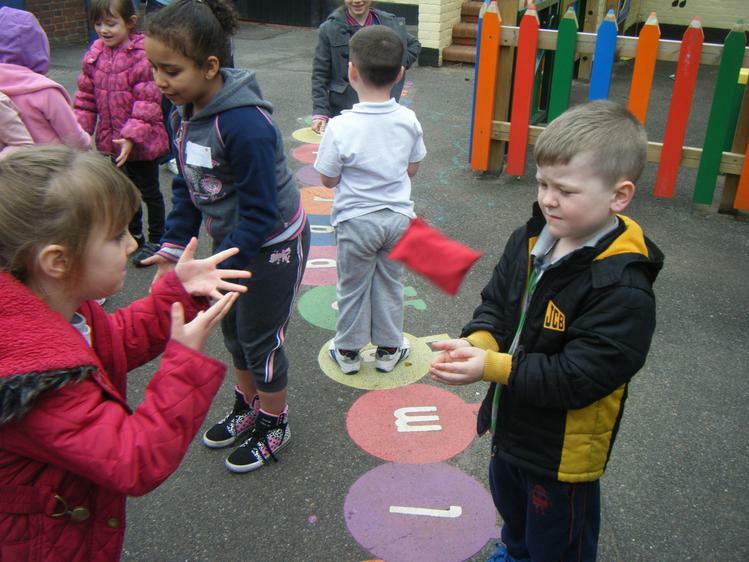 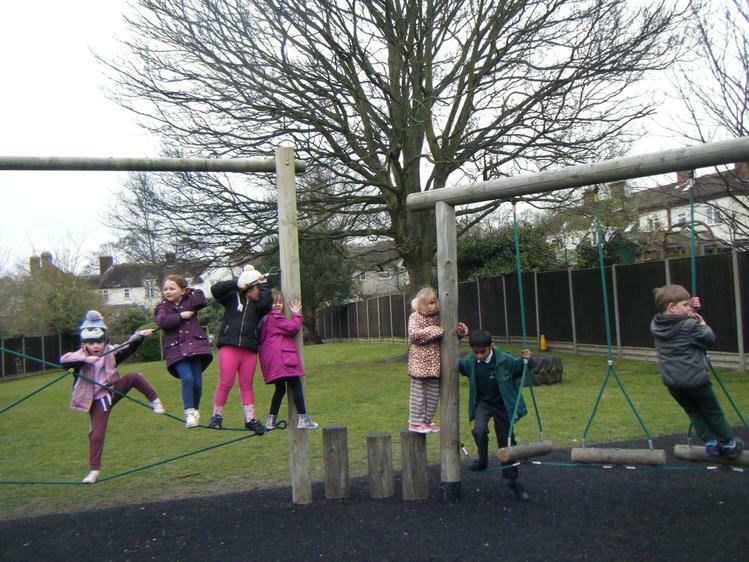 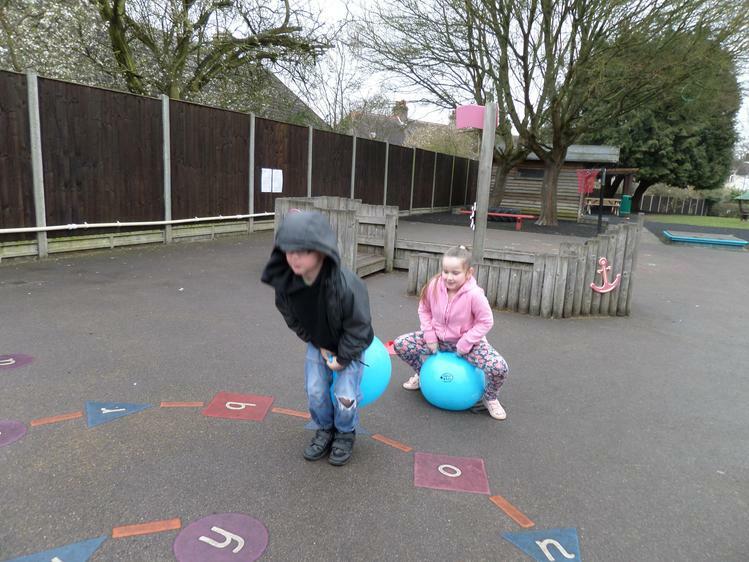 The children had fun working with their friends and it was lovely to see everyone enjoying the games. 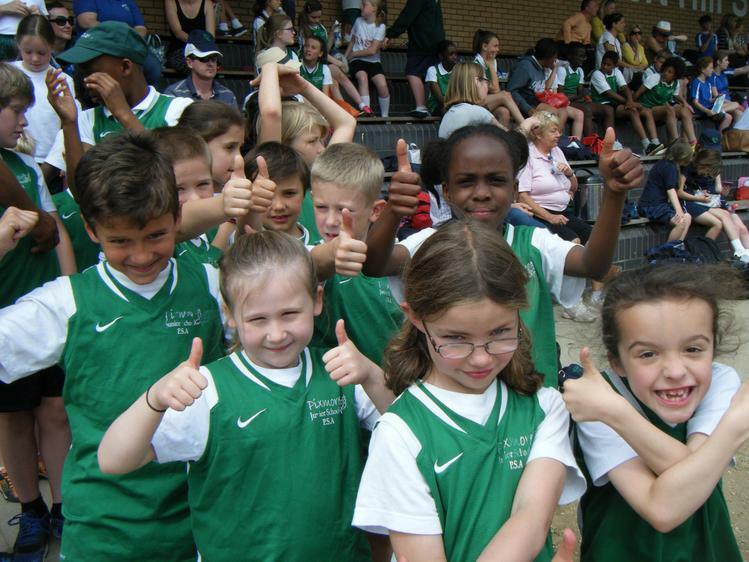 Some of our Year 2 children went with Miss Horsman to join Pixmore Junior School at the District Athletics Day at Ridlins Athletics Track in Stevenage. 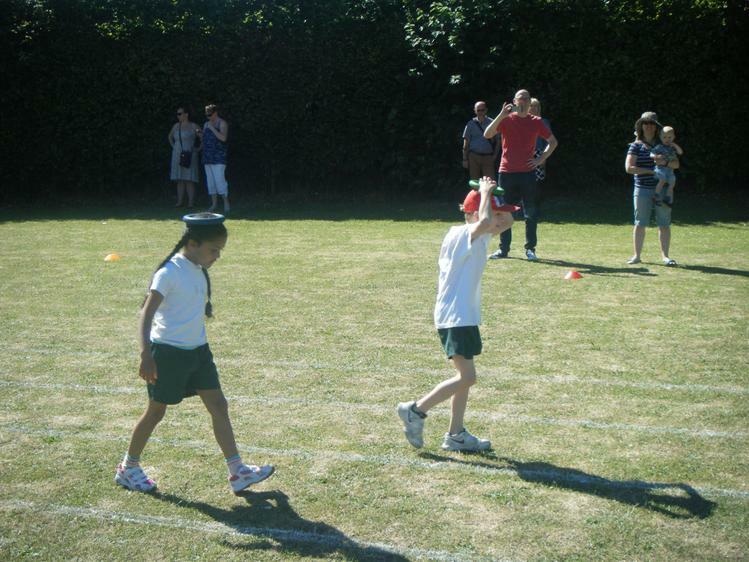 The children took part in the 200m sprint and the 800m relay and showed great sportsmanship and team work throughout. 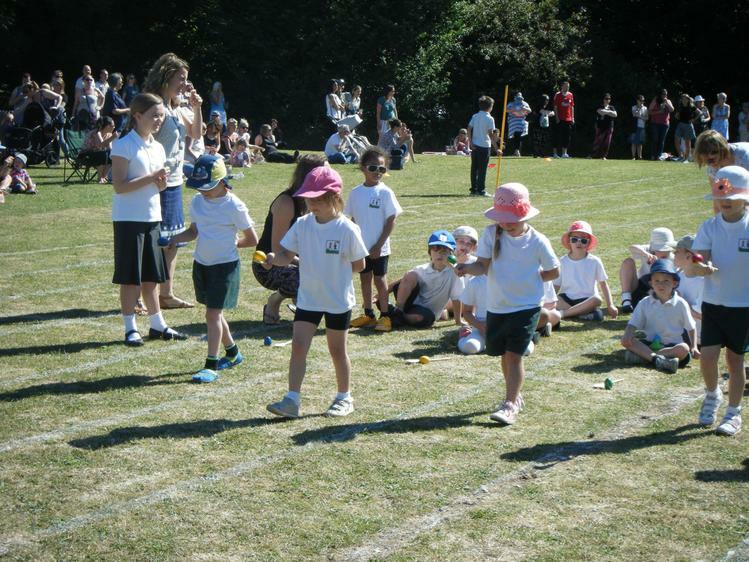 We were fortunate to have warm sunny weather all day and the children had lots of fun watching other races while they waited for their turn. 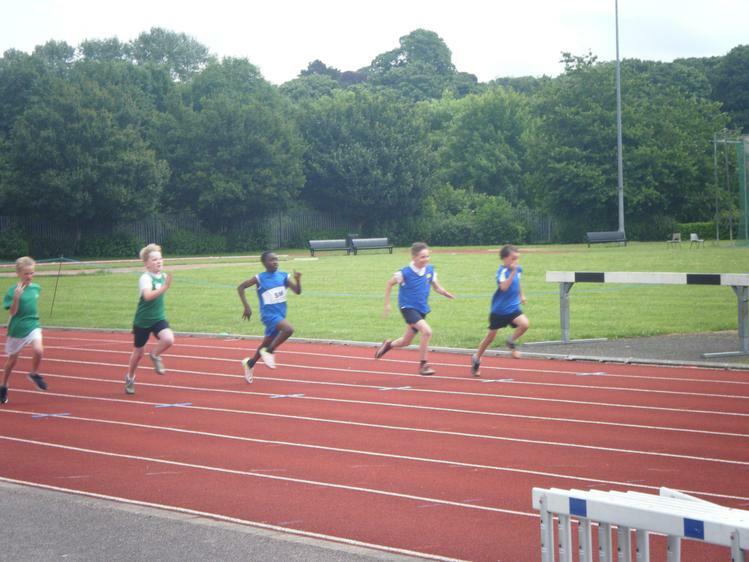 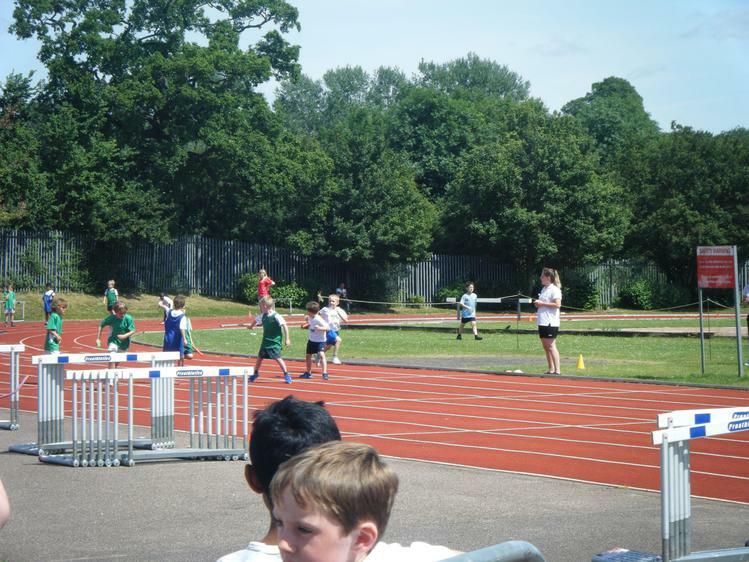 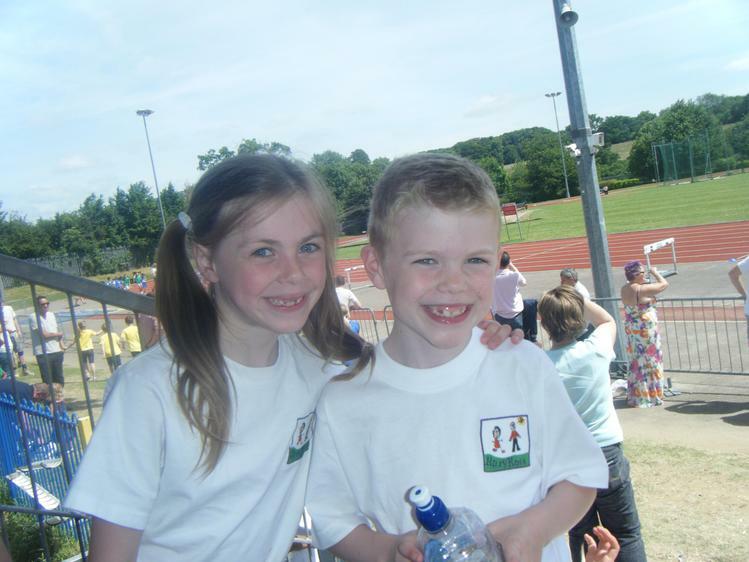 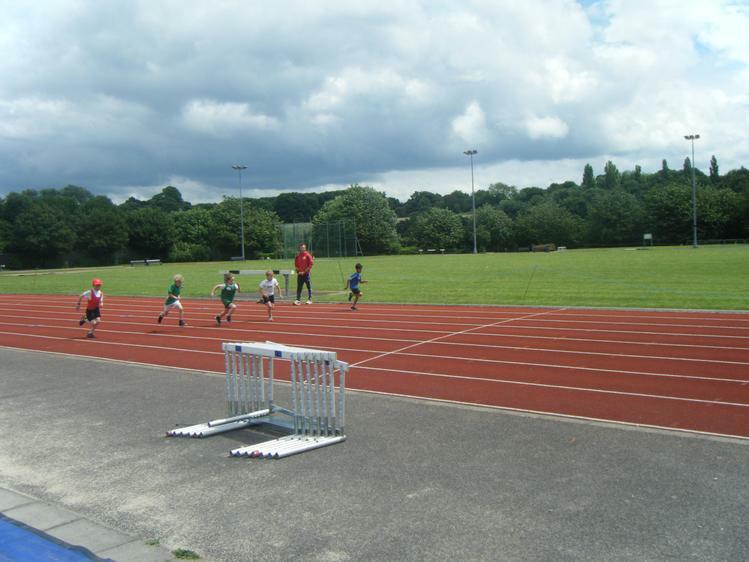 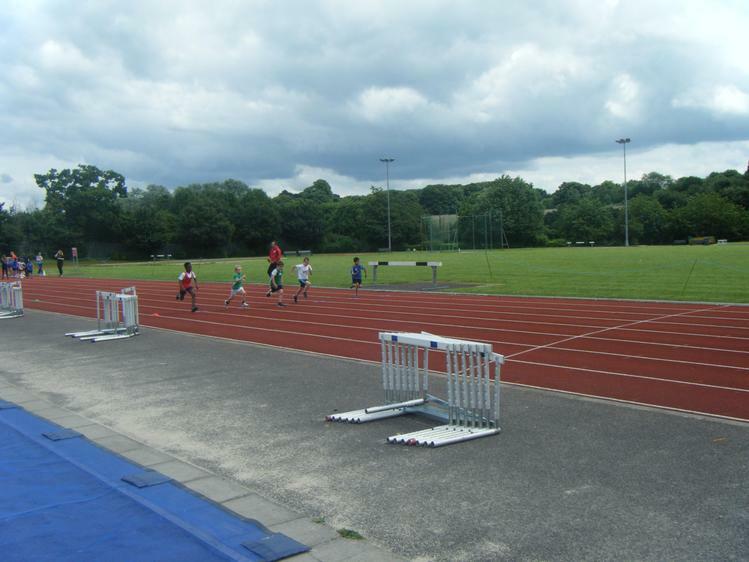 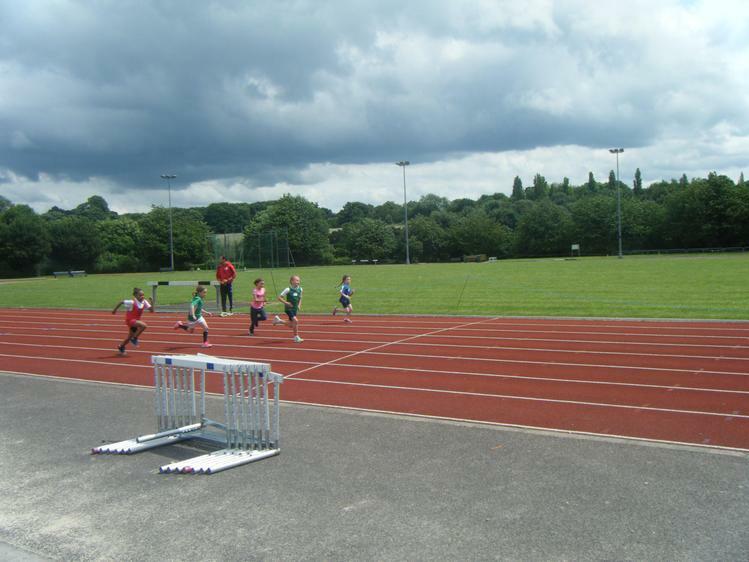 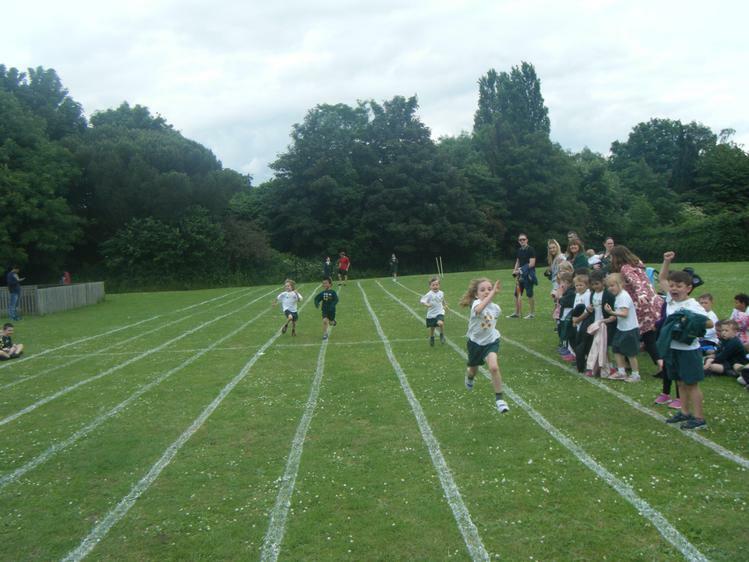 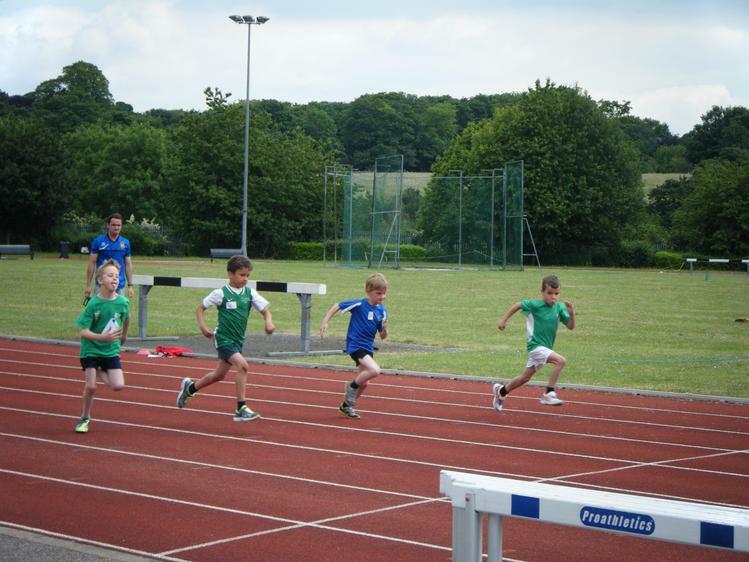 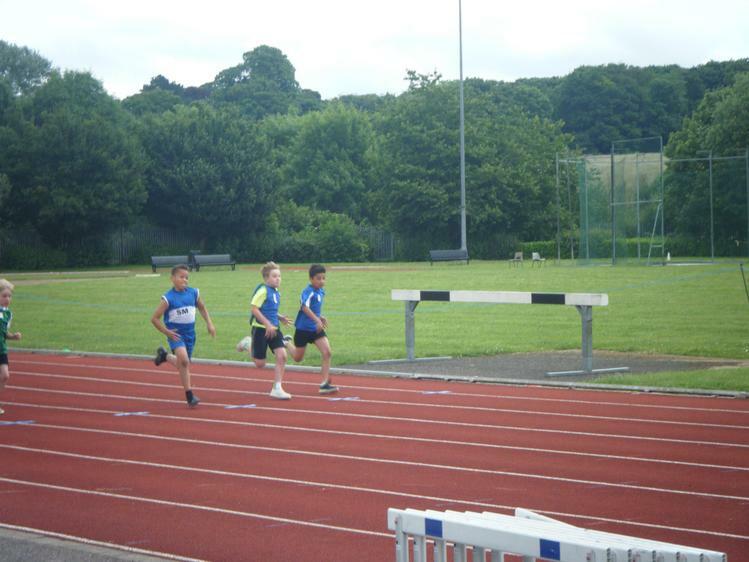 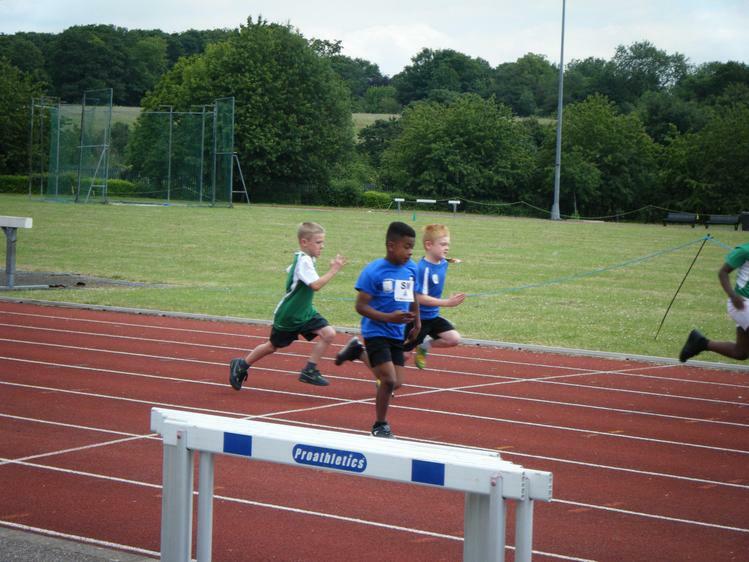 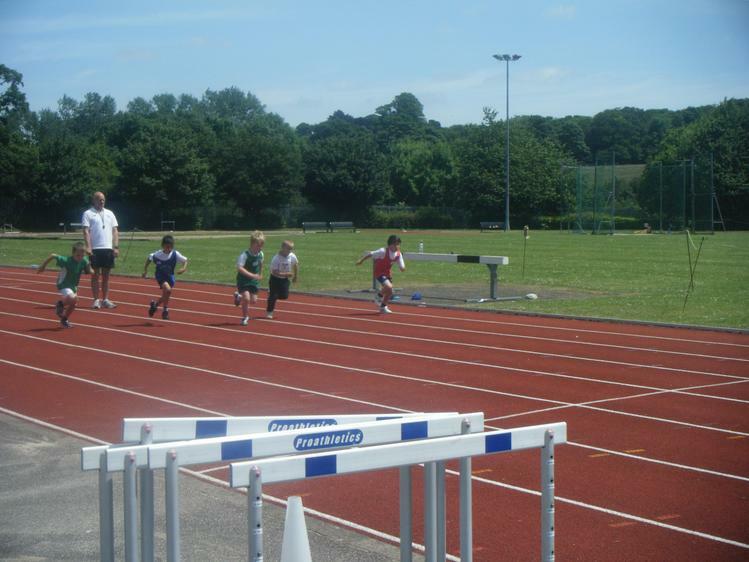 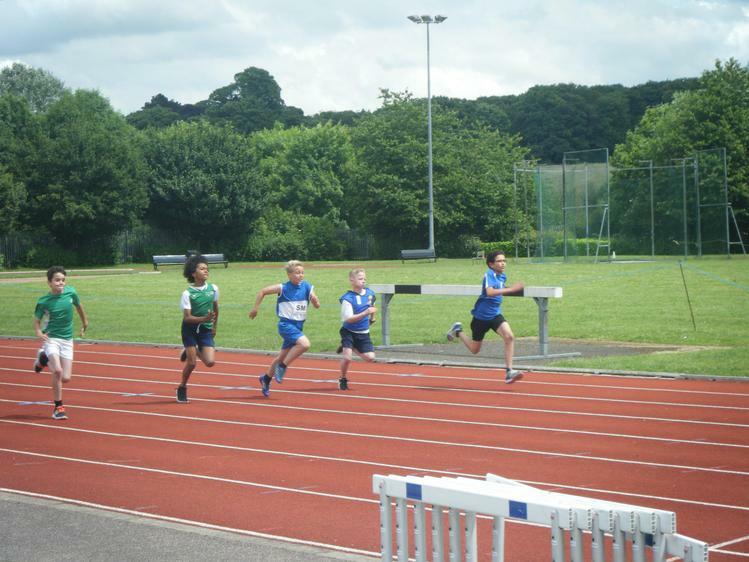 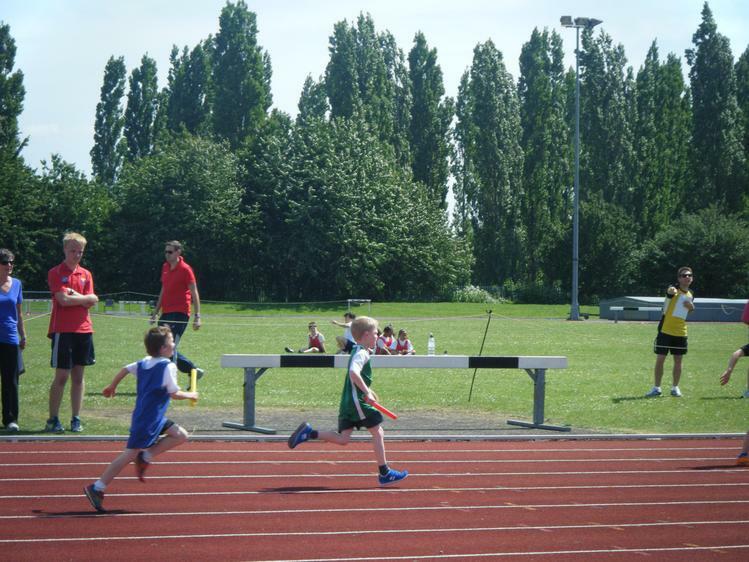 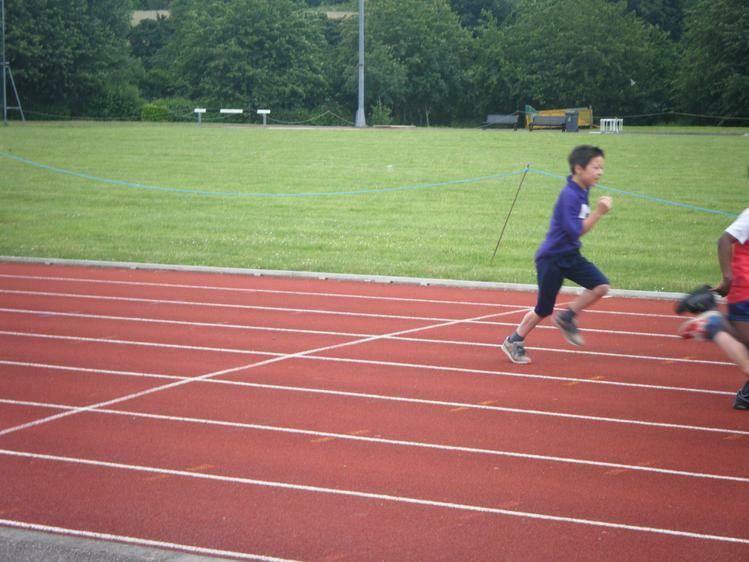 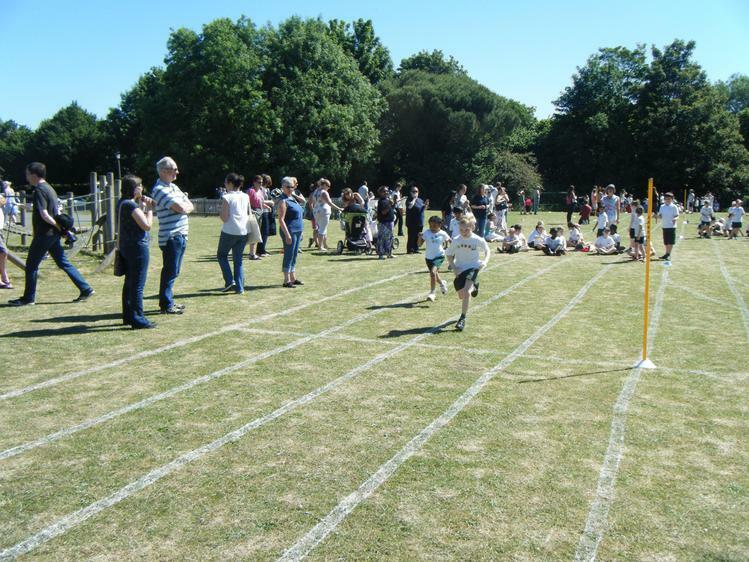 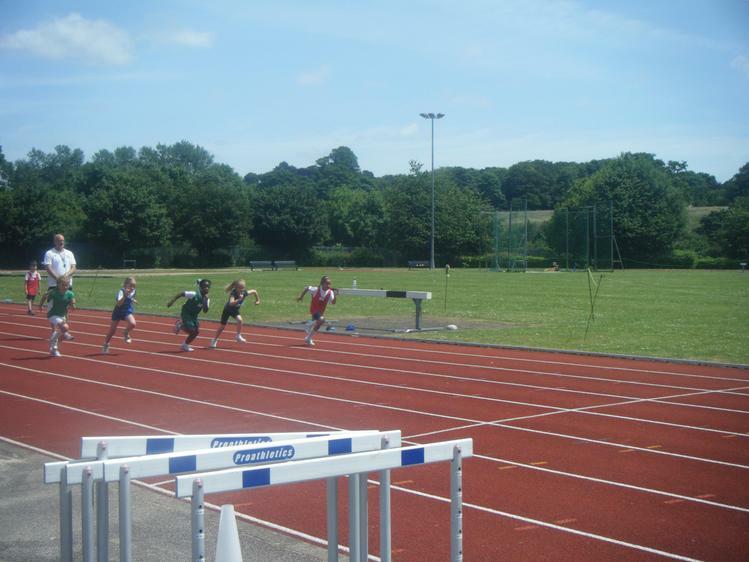 We are very proud of the children for being great ambassadors for Hillshott and we are pleased to say that Jack Watson is now the District Champion in the Year 2 Boys’ 200m Sprint! 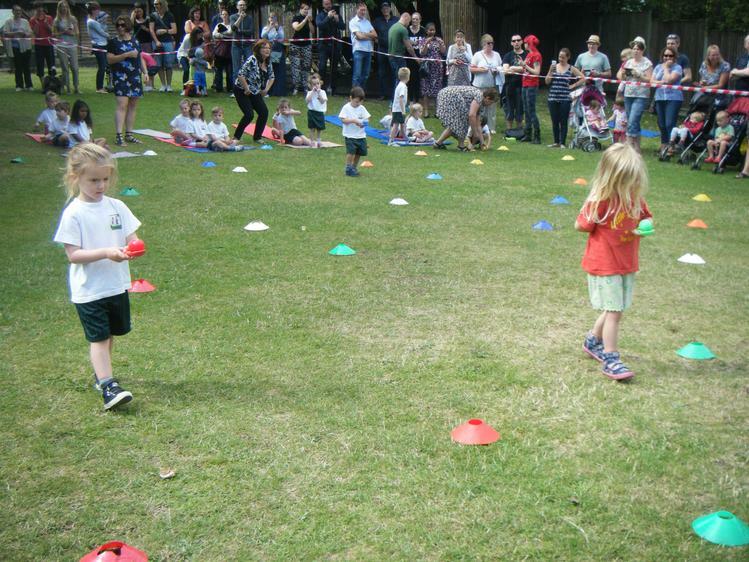 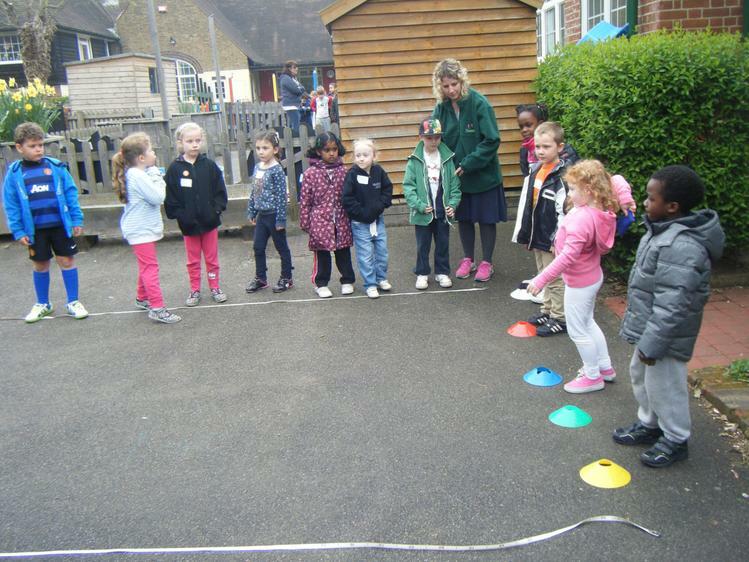 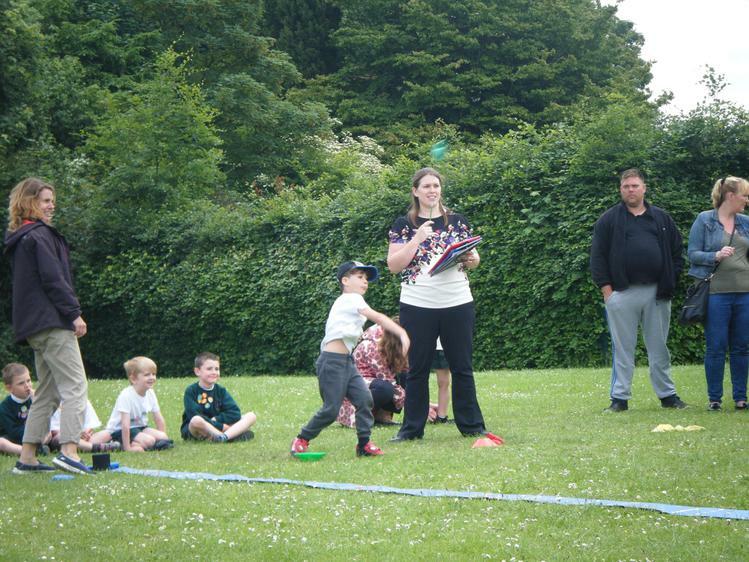 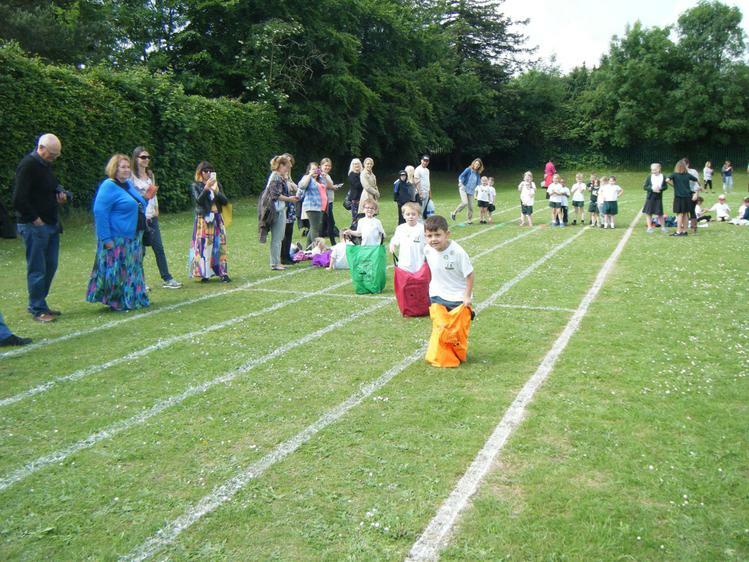 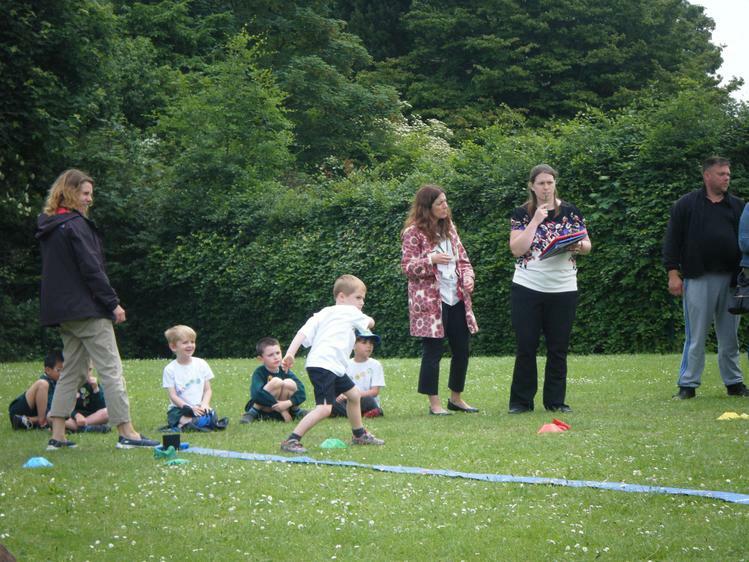 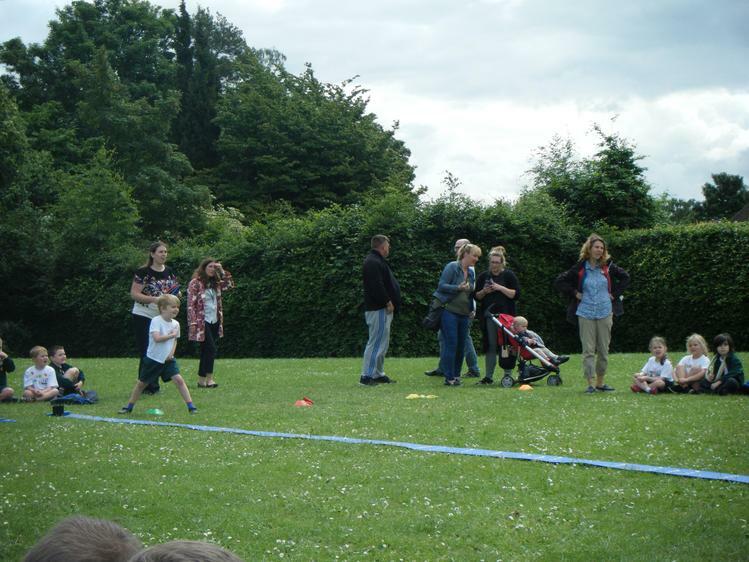 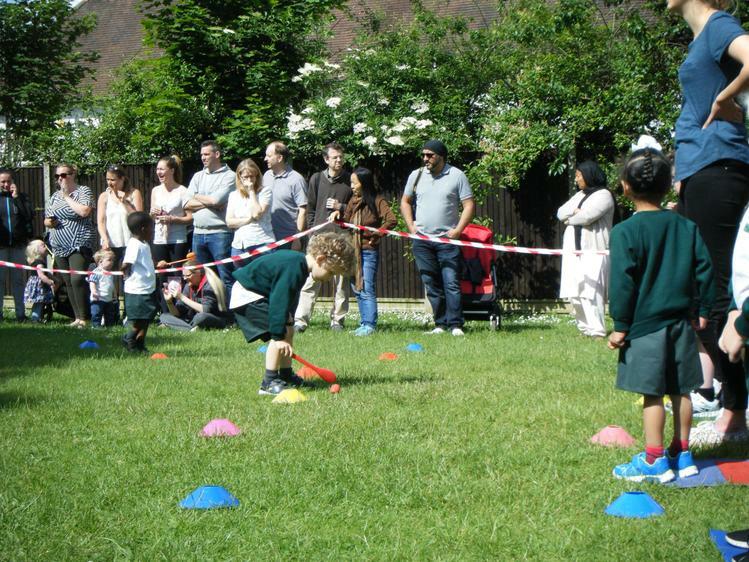 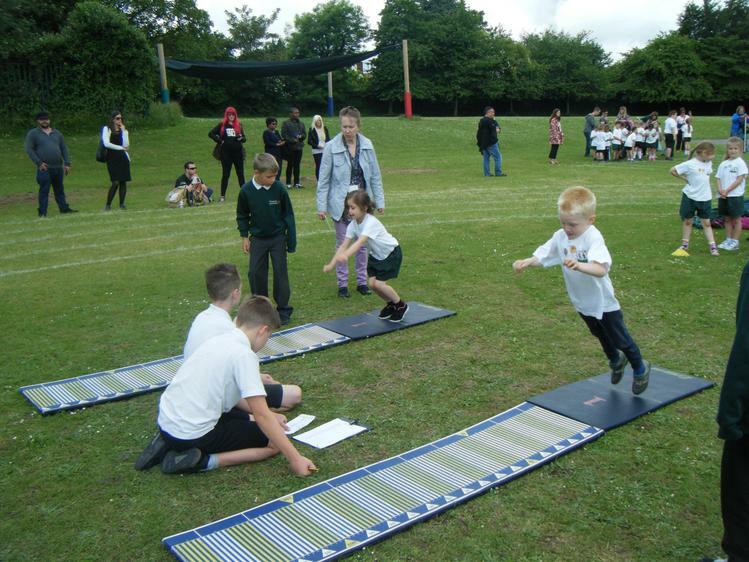 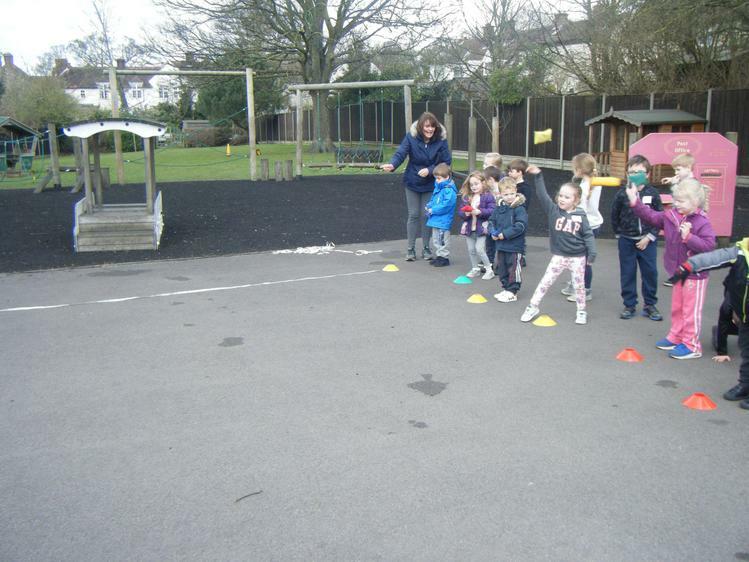 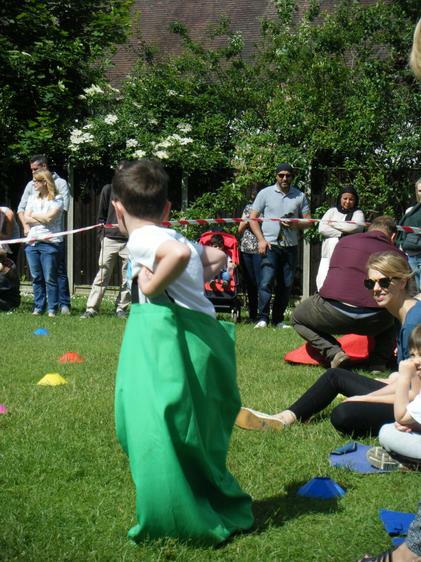 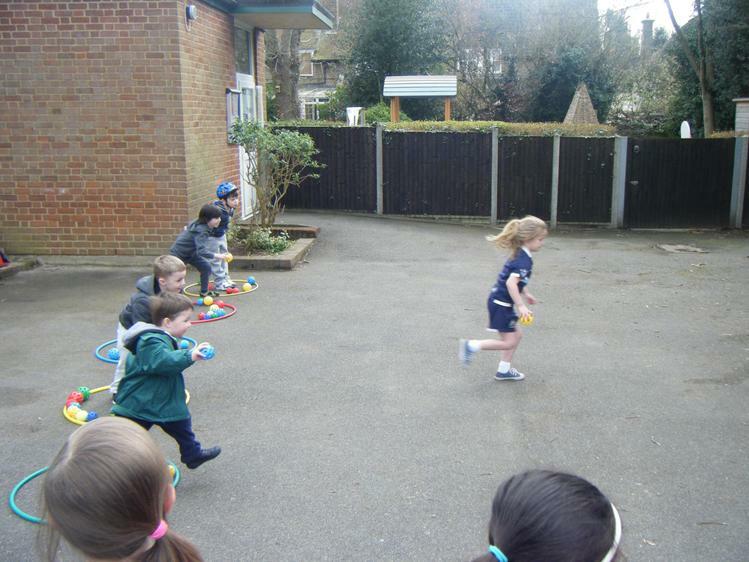 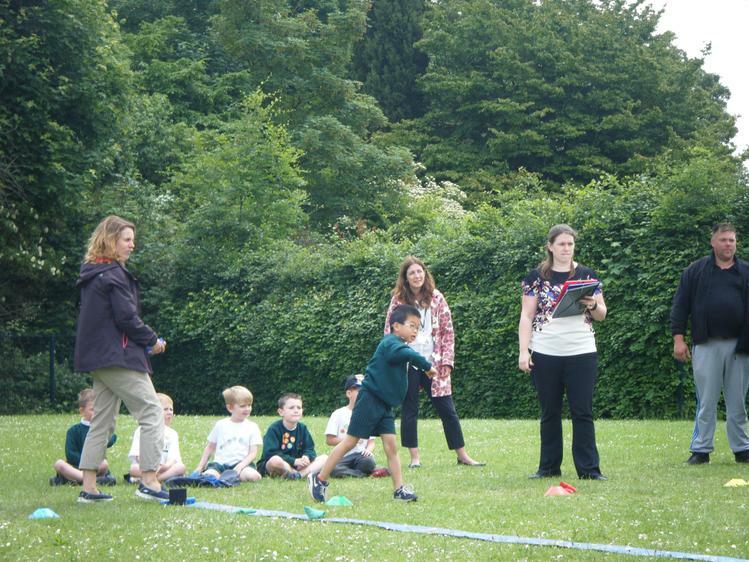 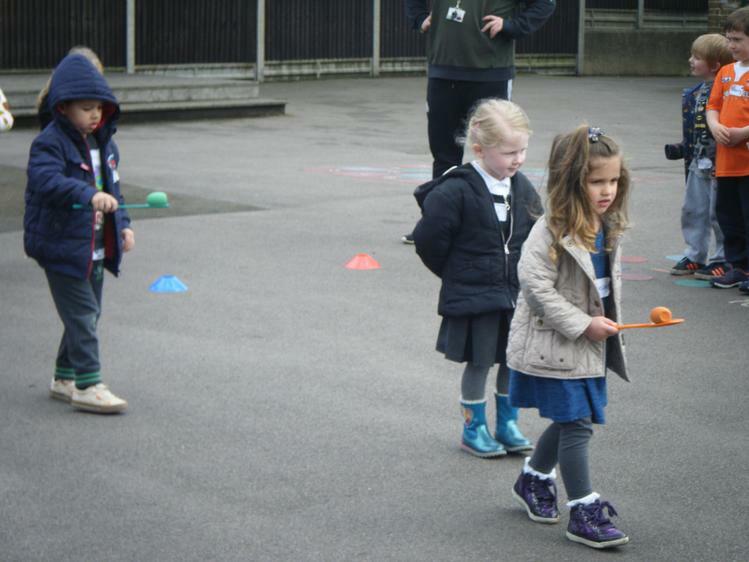 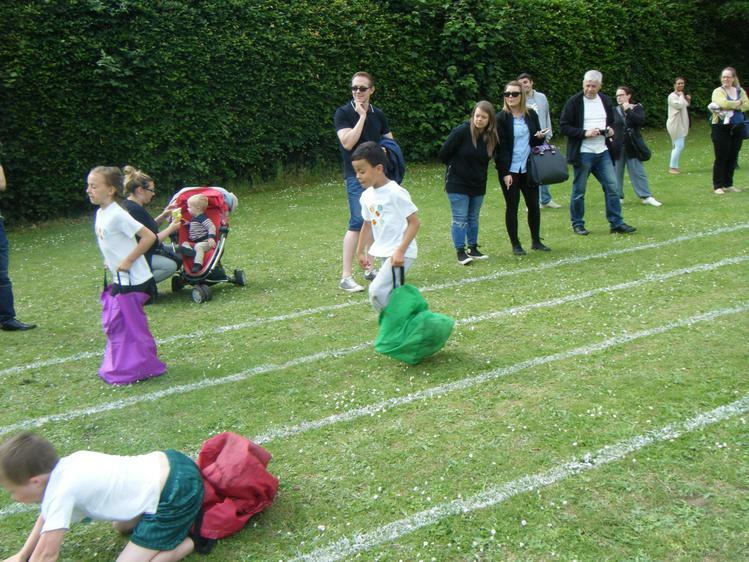 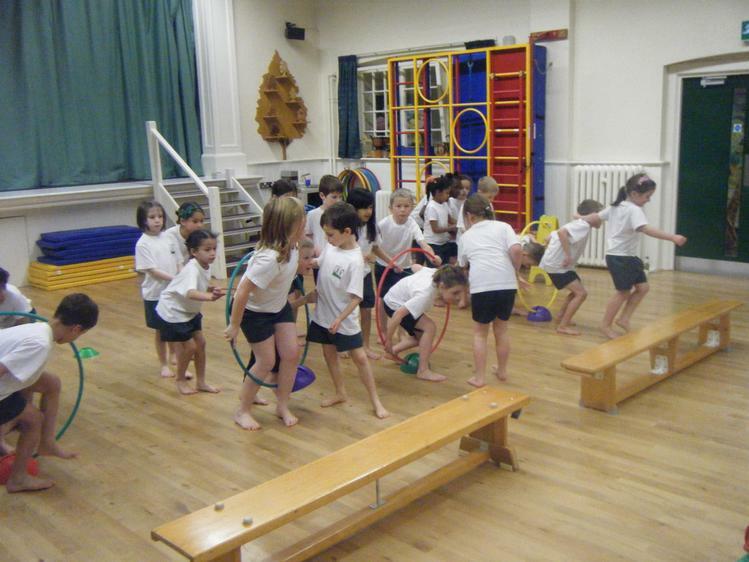 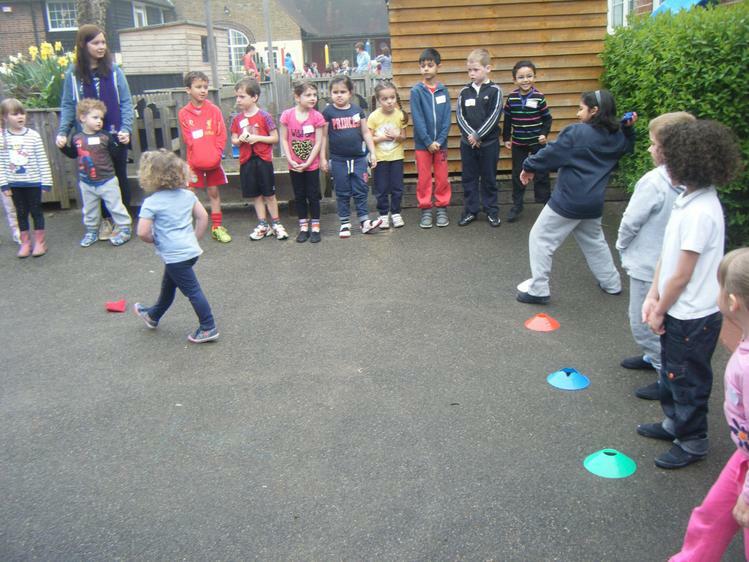 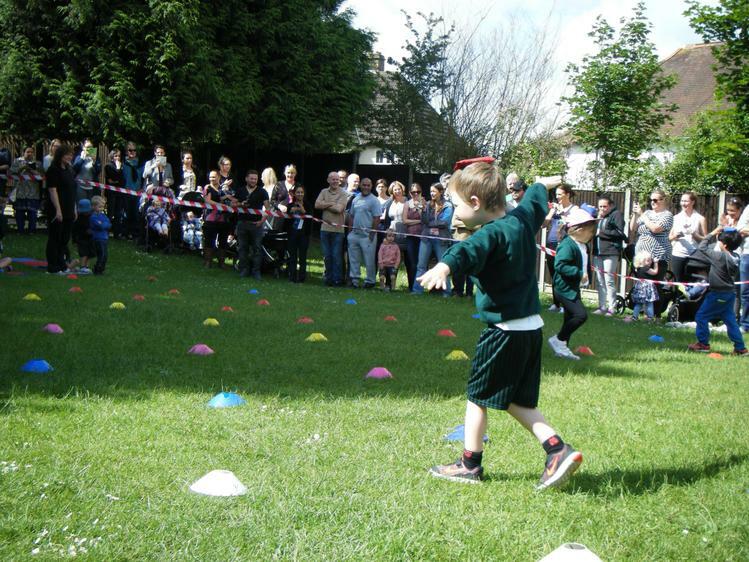 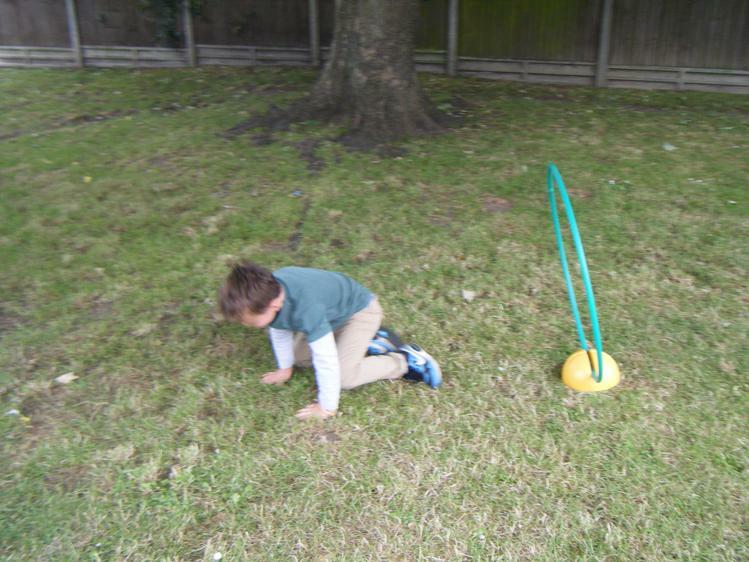 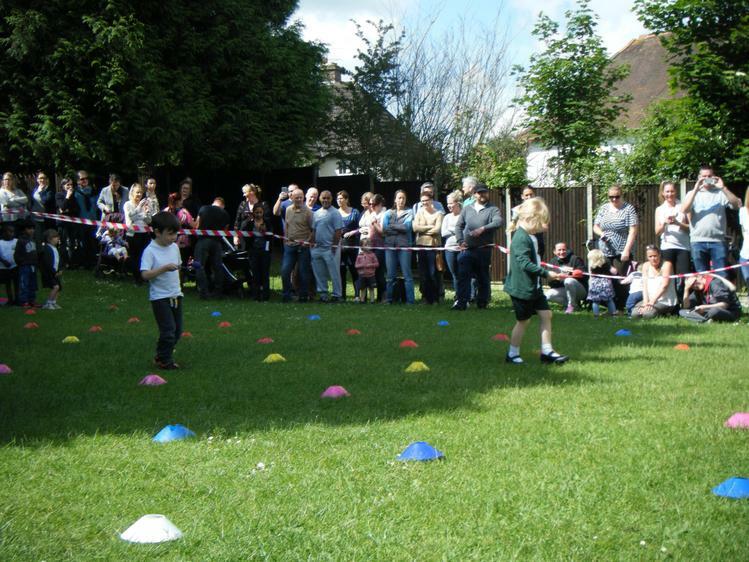 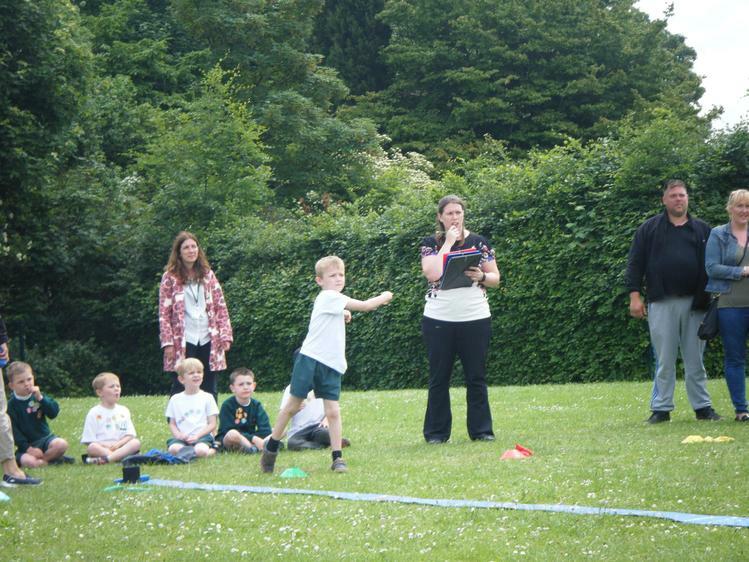 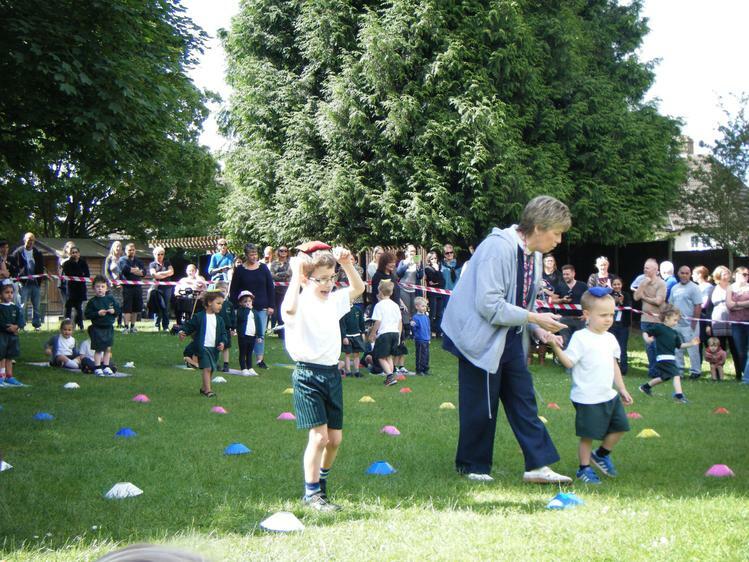 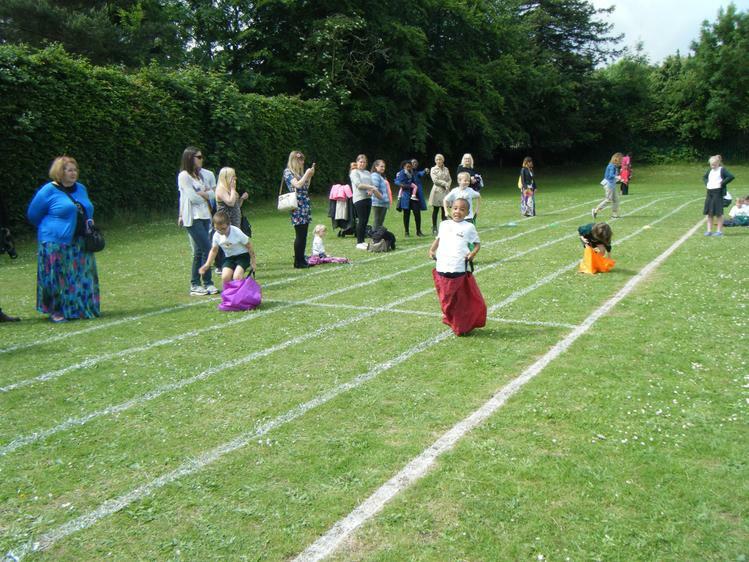 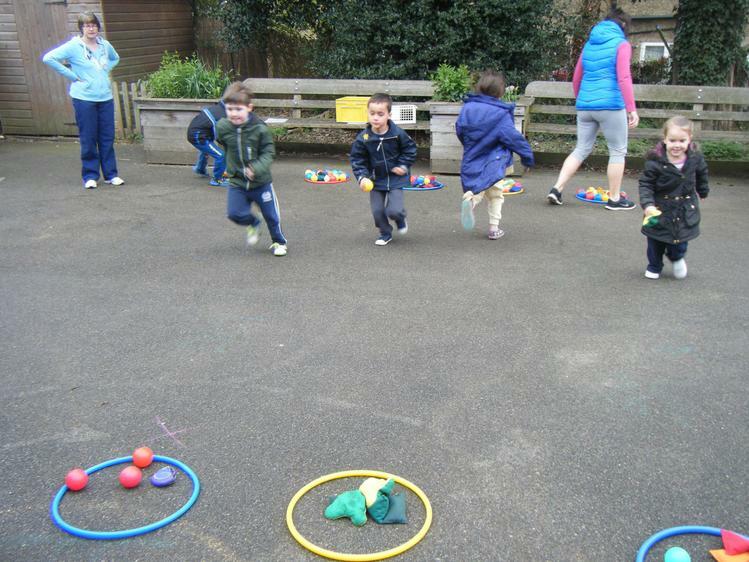 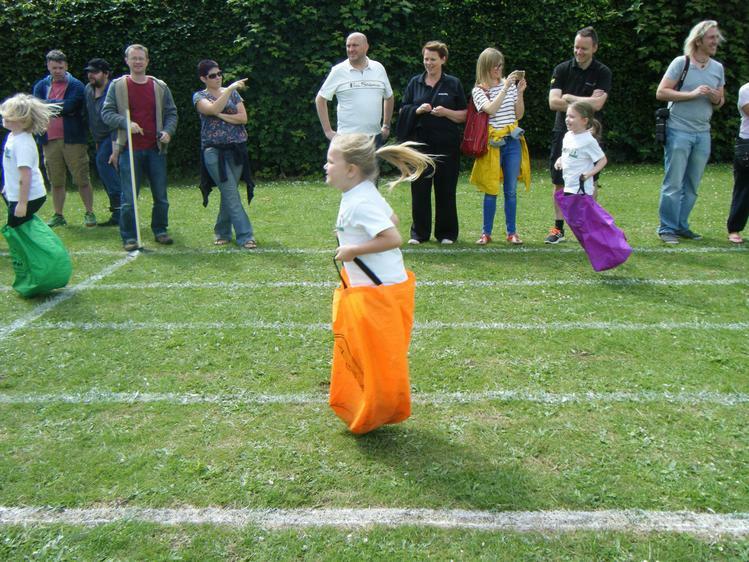 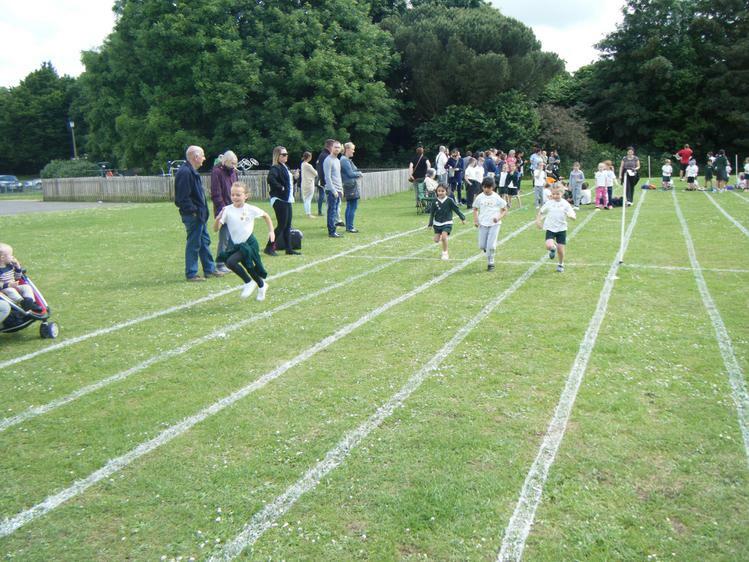 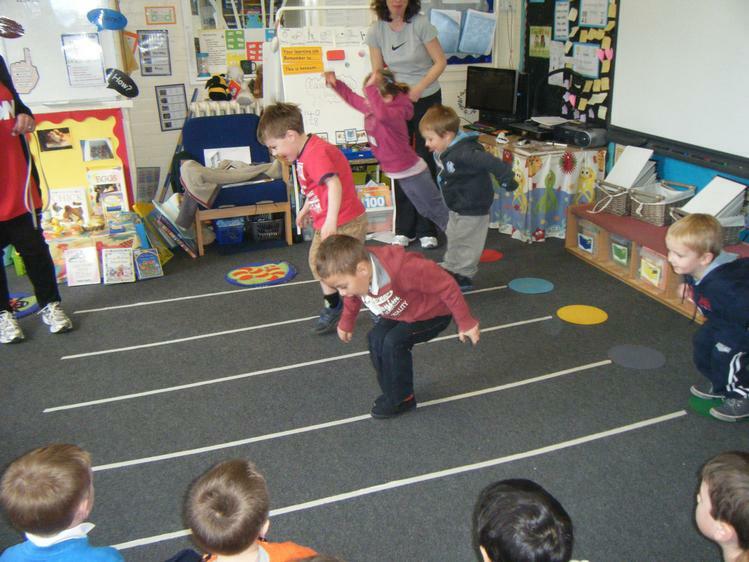 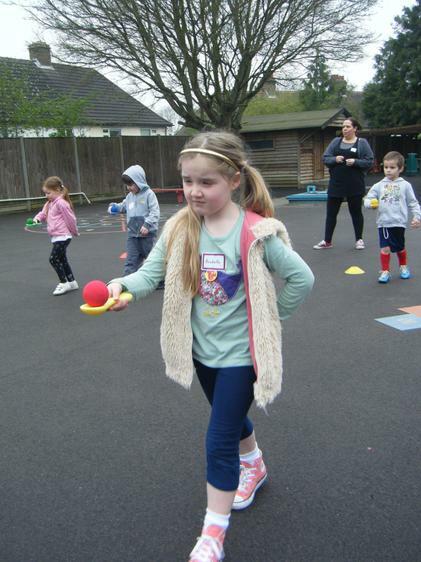 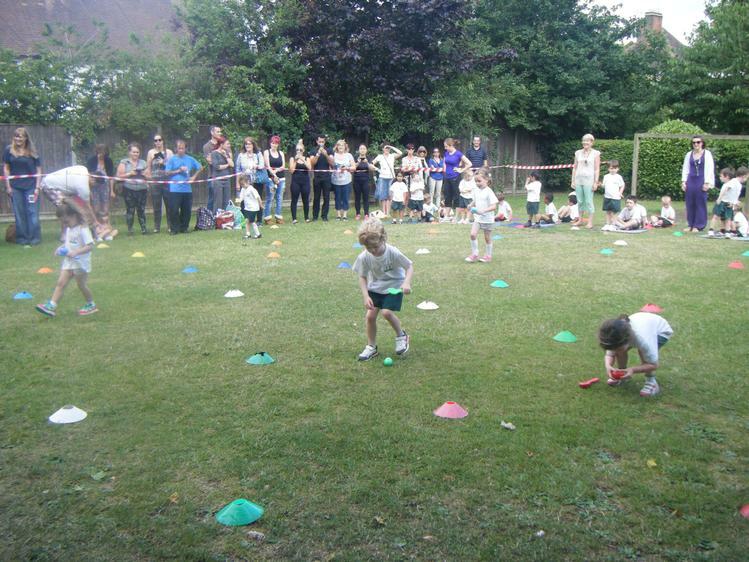 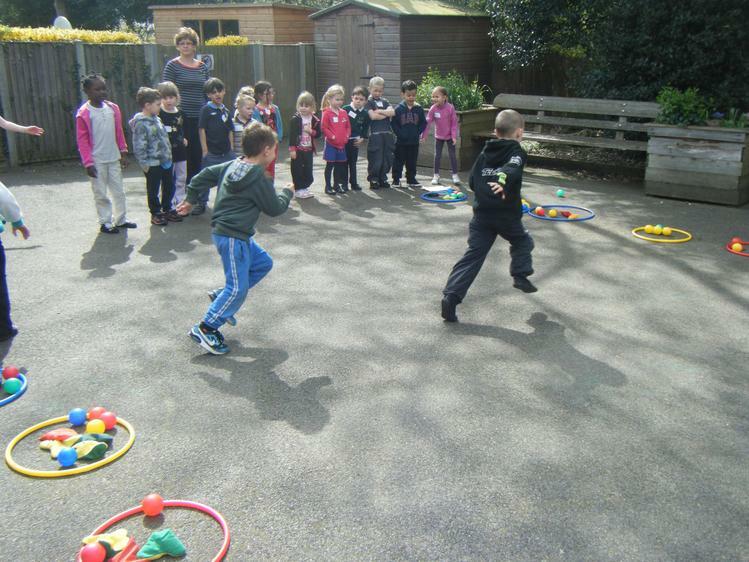 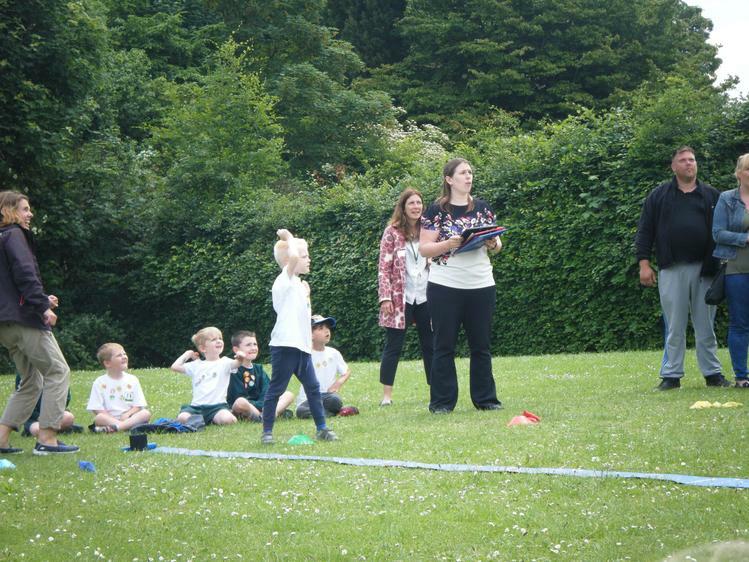 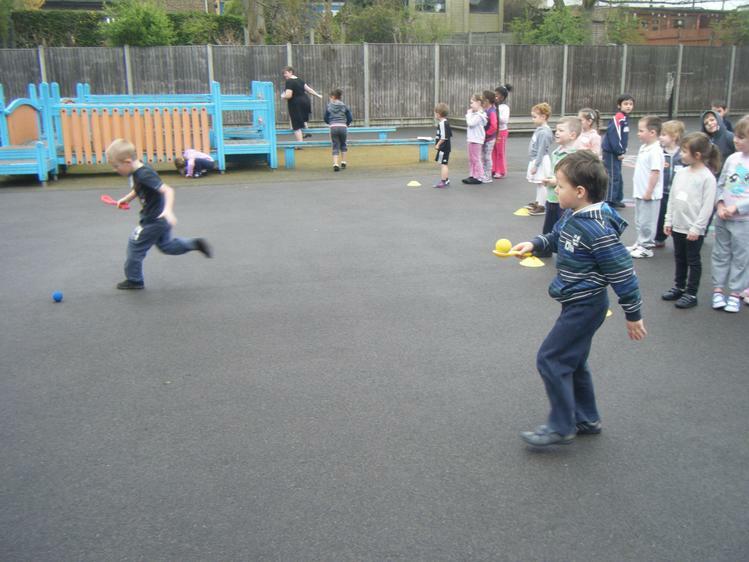 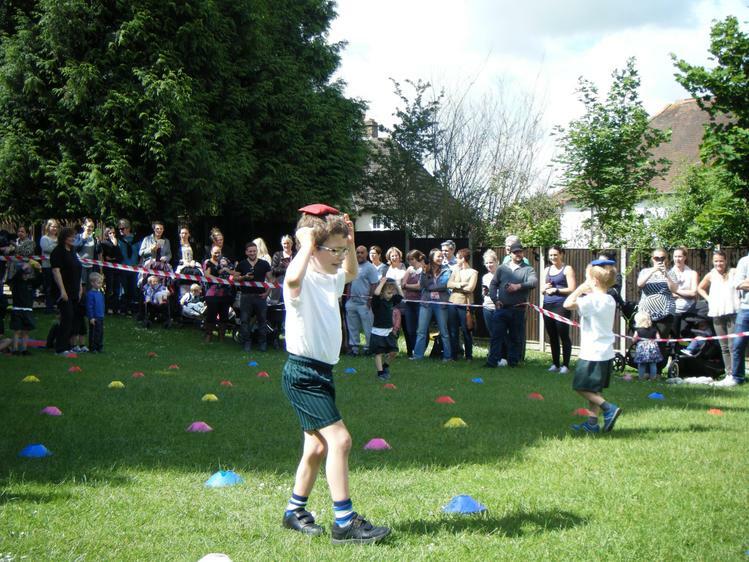 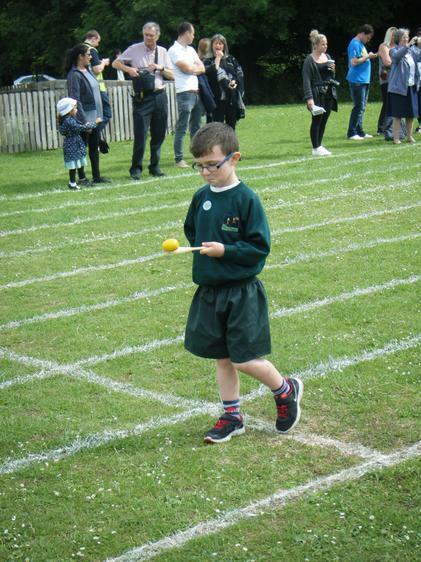 The children had a lovely time taking part in the Easter Sports Day. 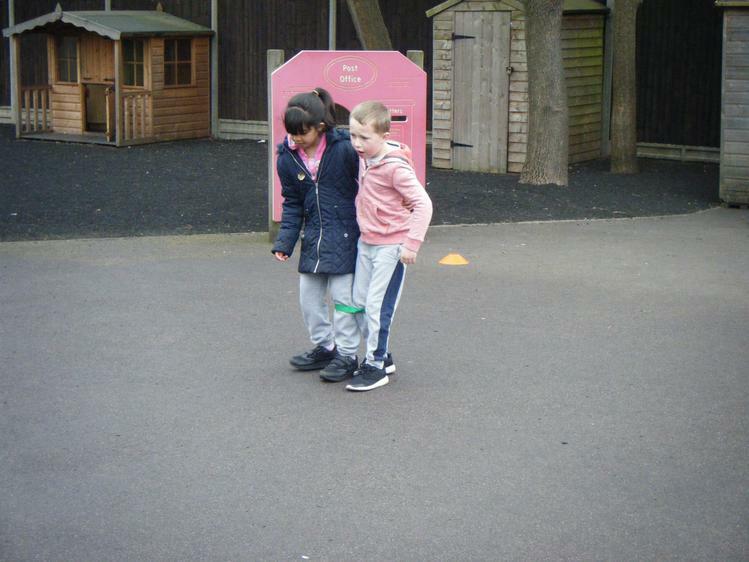 They worked in mixed year group teams throughout the day which was a great opportunity for the children to make even more friends! 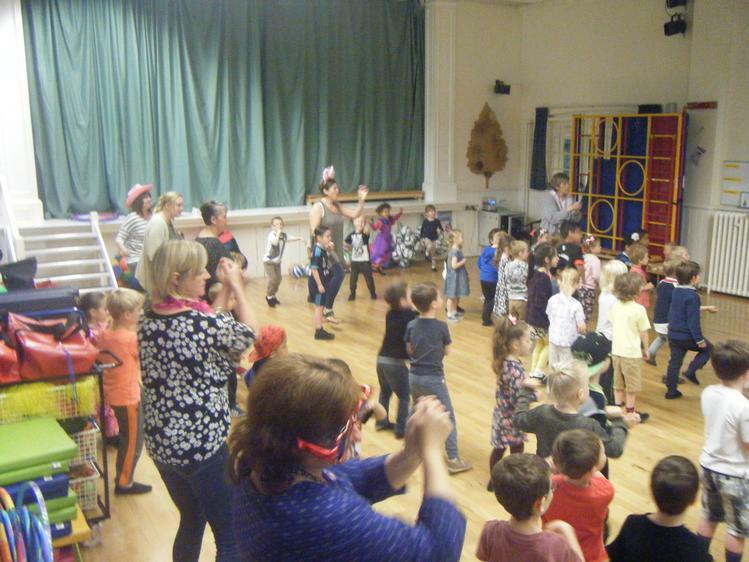 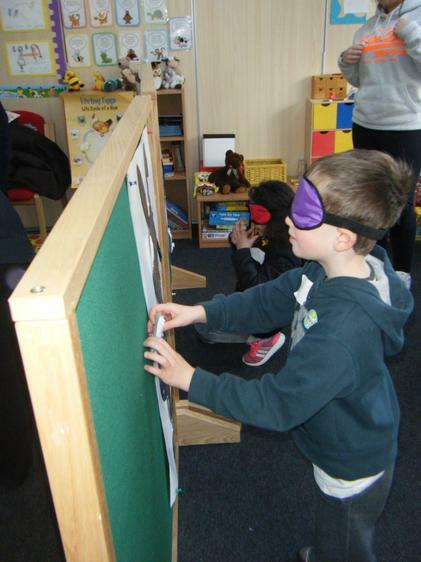 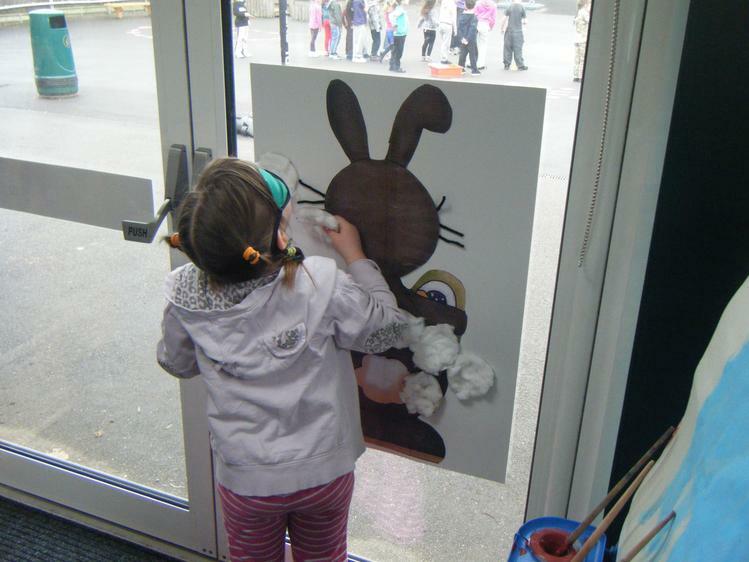 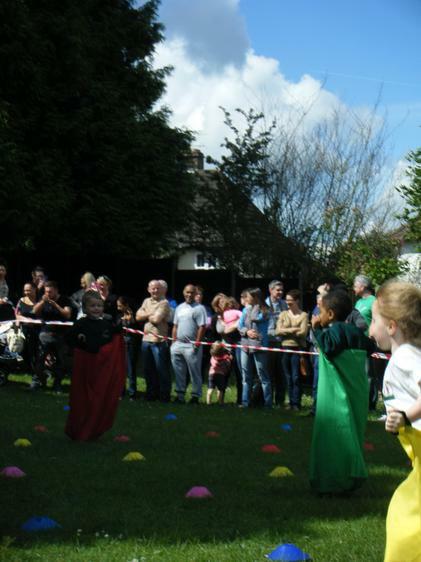 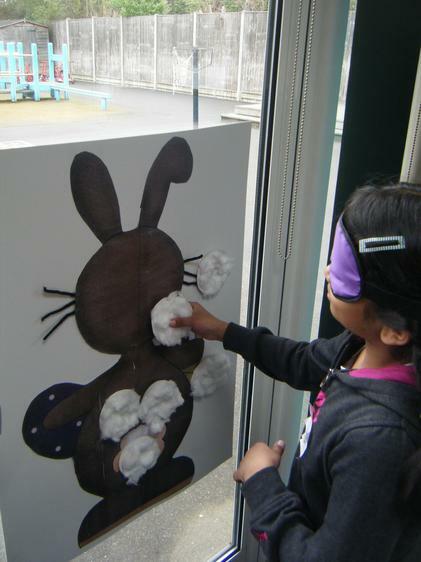 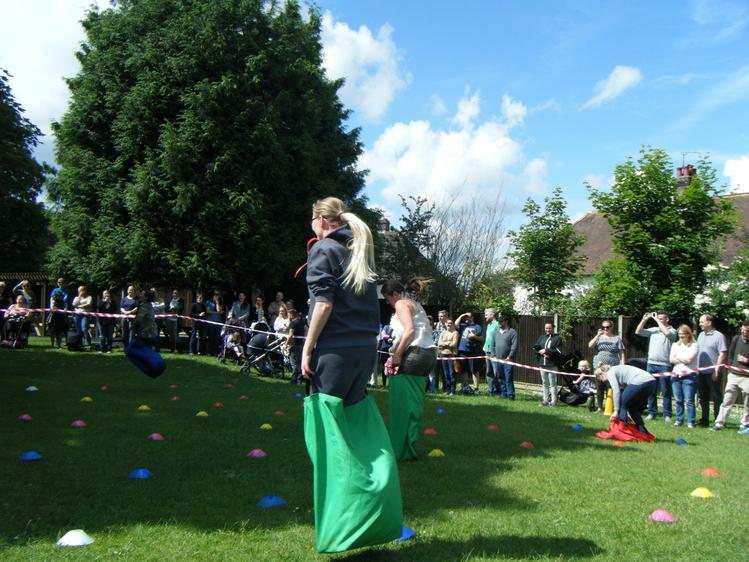 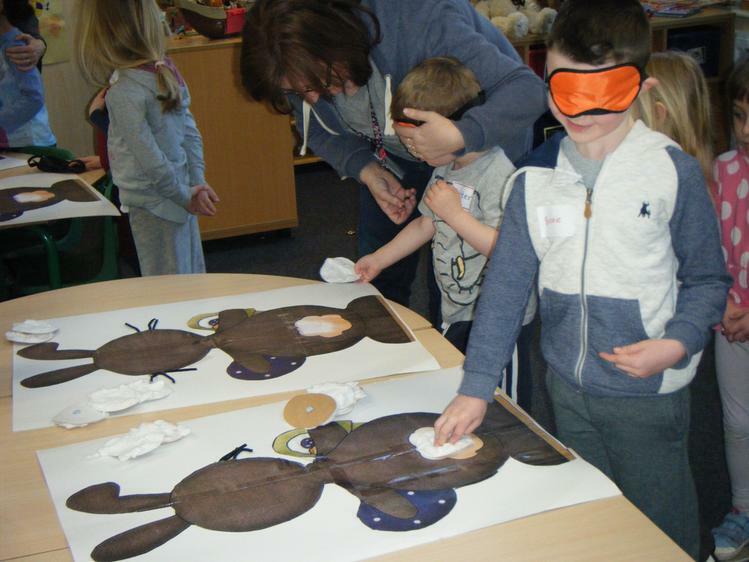 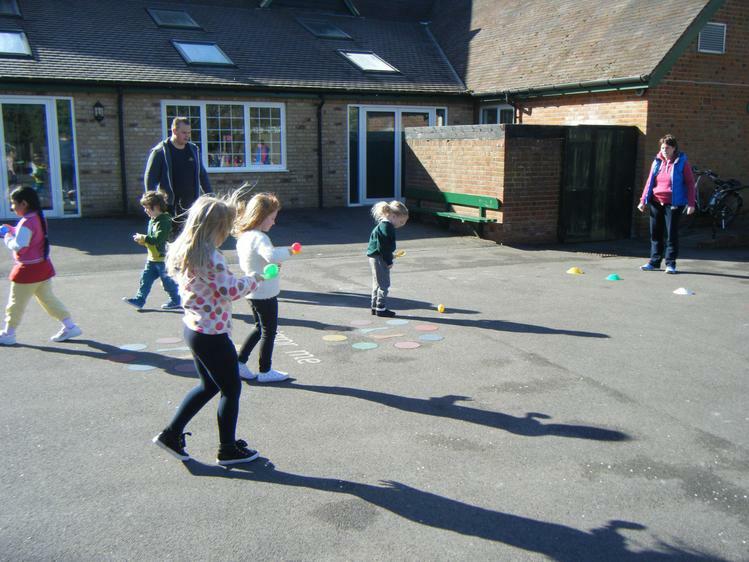 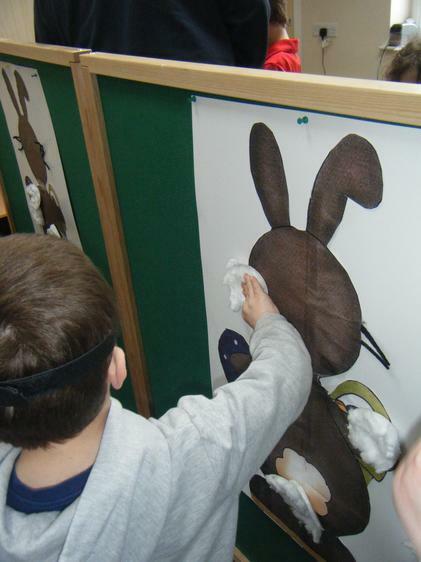 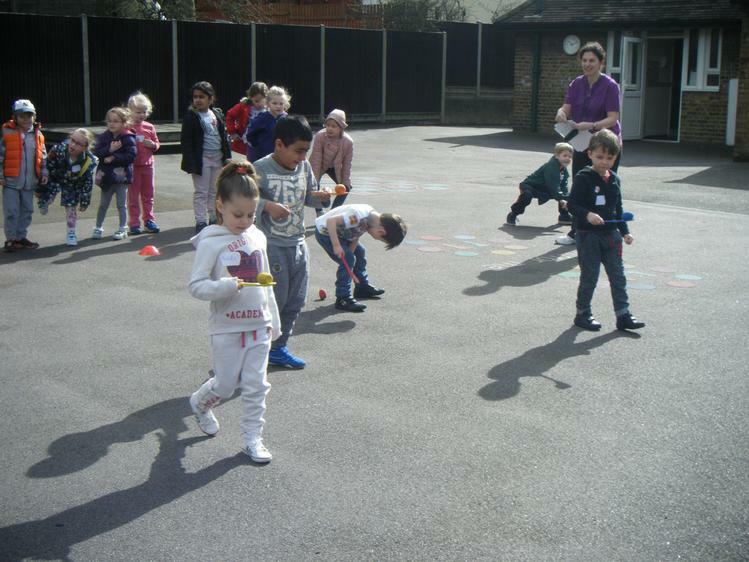 The activities were Easter themed and included pin the tail on the bunny, egg rolling, egg throwing, bunny hop races and many more! 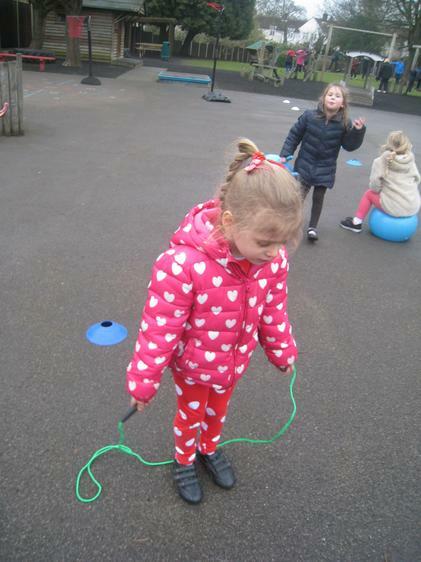 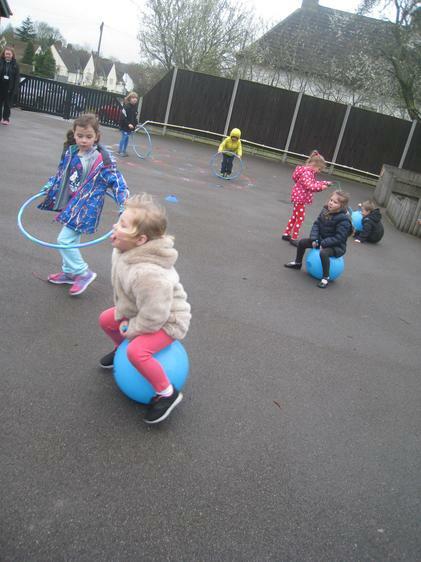 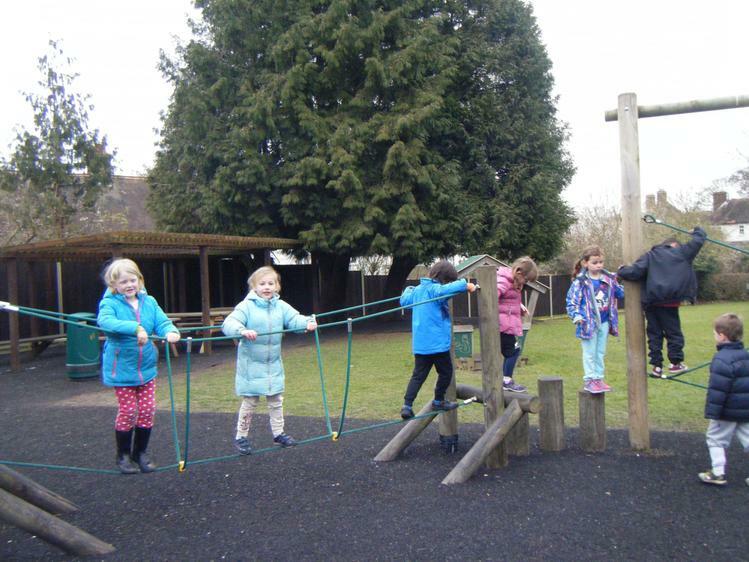 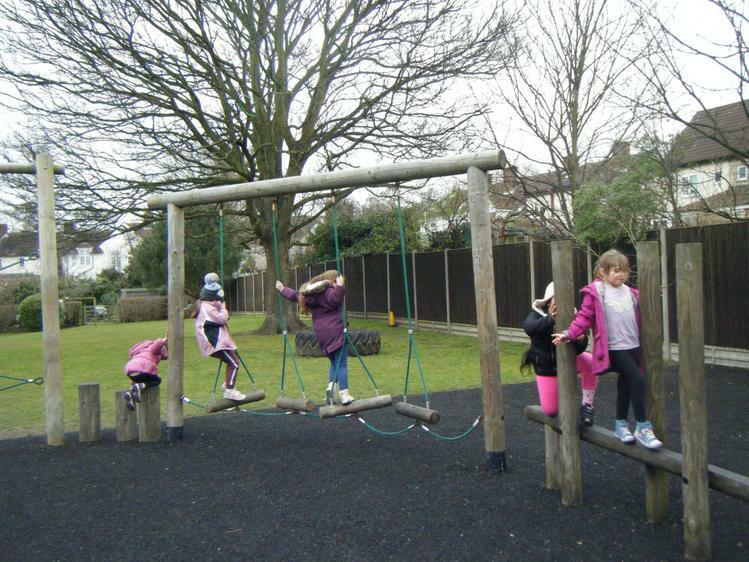 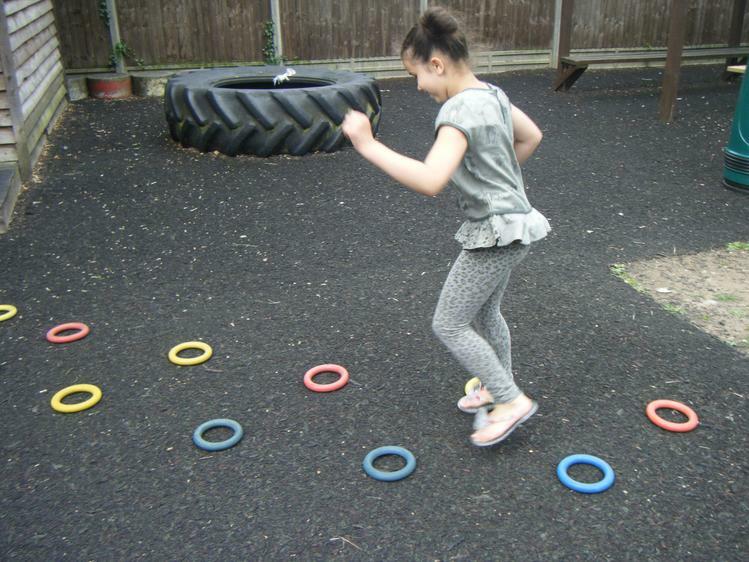 We are really proud of all of the children for taking part in every activity and trying their best, even if they found some of them tricky at first. 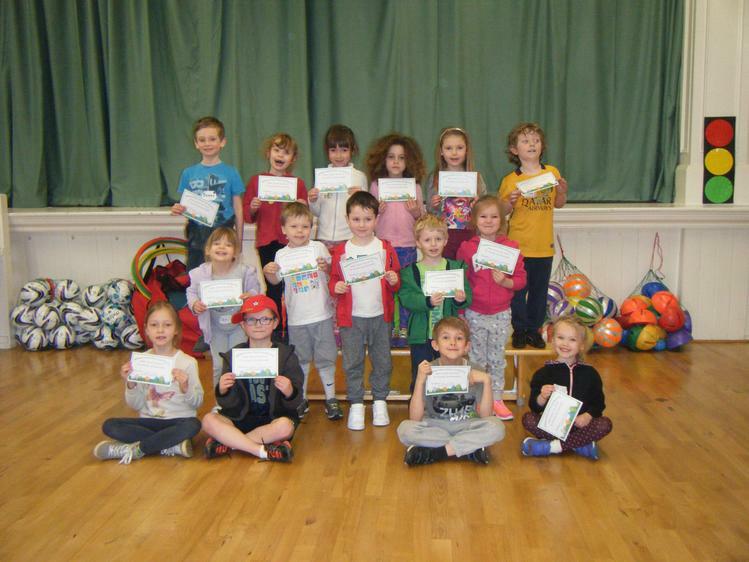 At the end of the day we were really pleased to award 16 children with certificates for showing excellent sportsmanship. 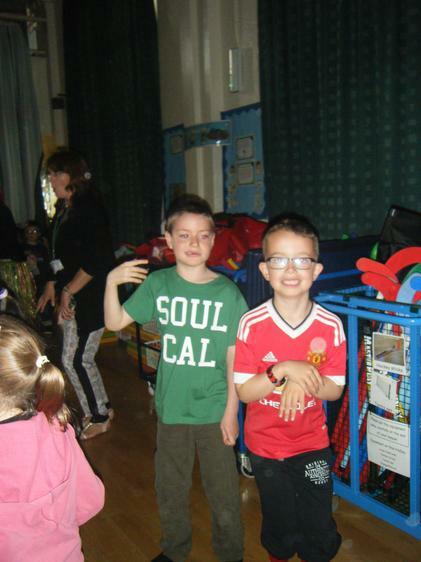 These children showed perseverance, they helped their friends and they celebrated other people’s achievements with smiles and clapping! 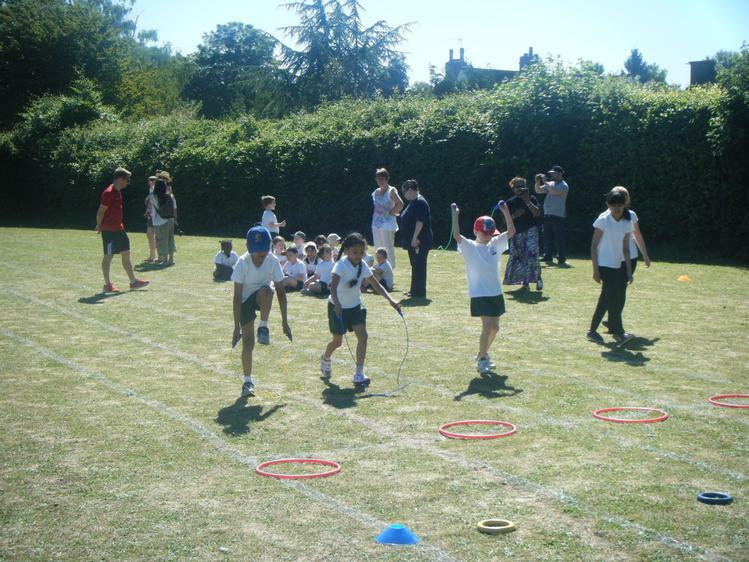 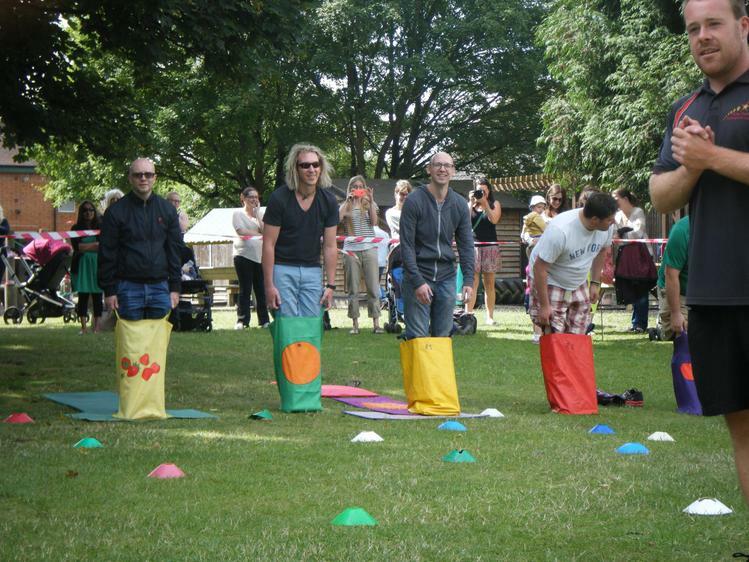 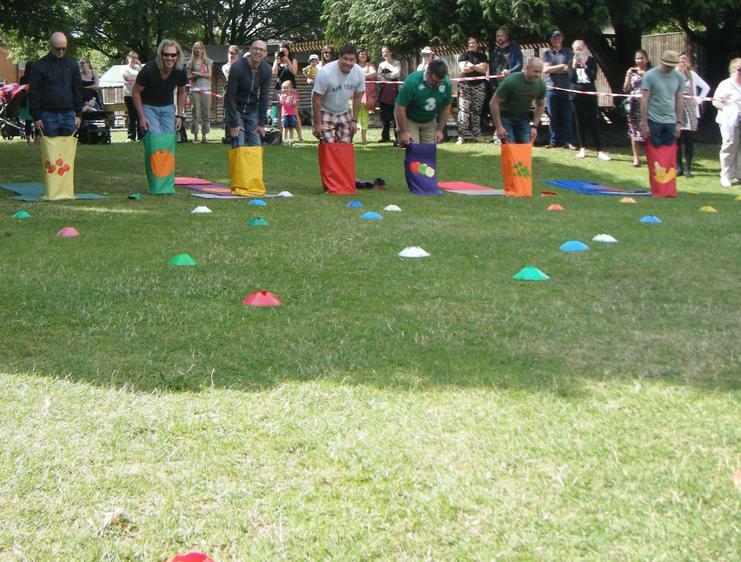 We are now very excited for our Summer Sports Day! 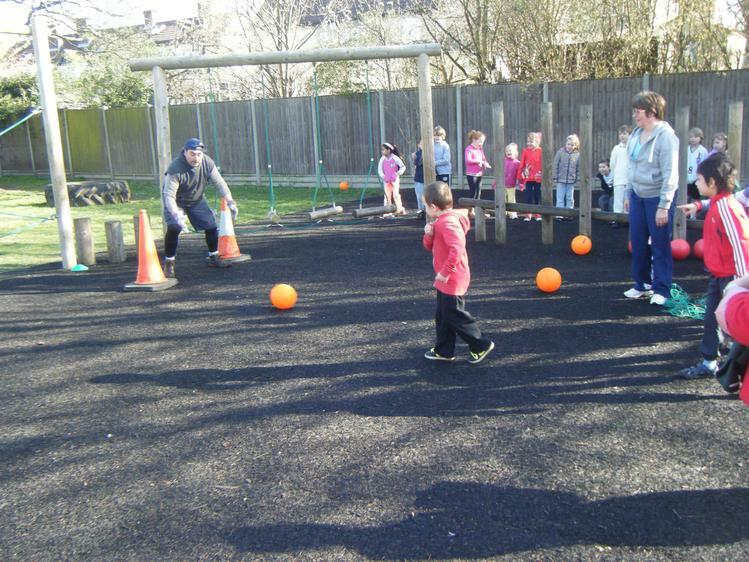 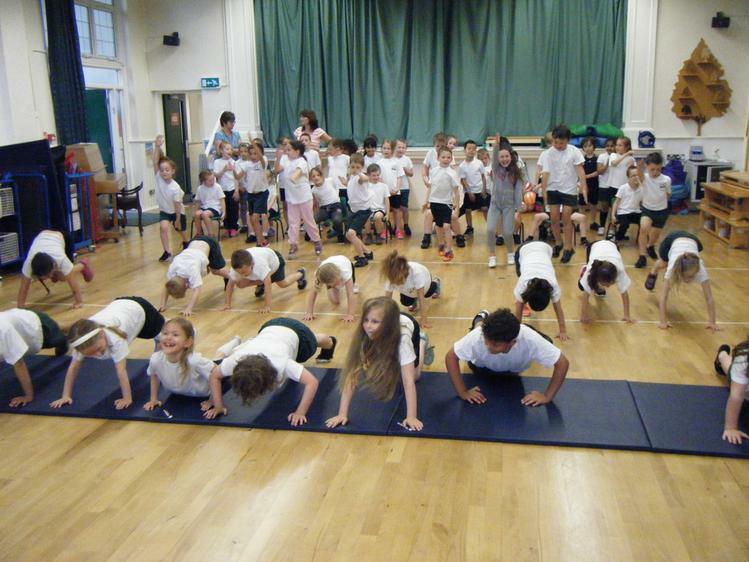 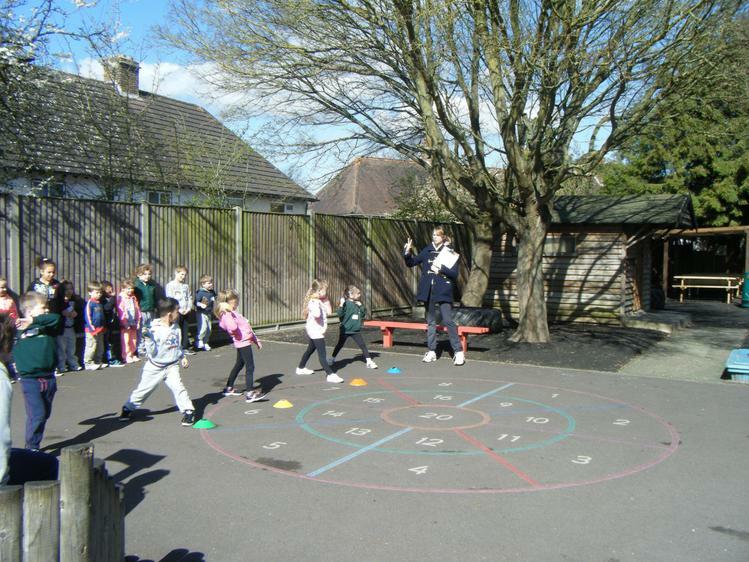 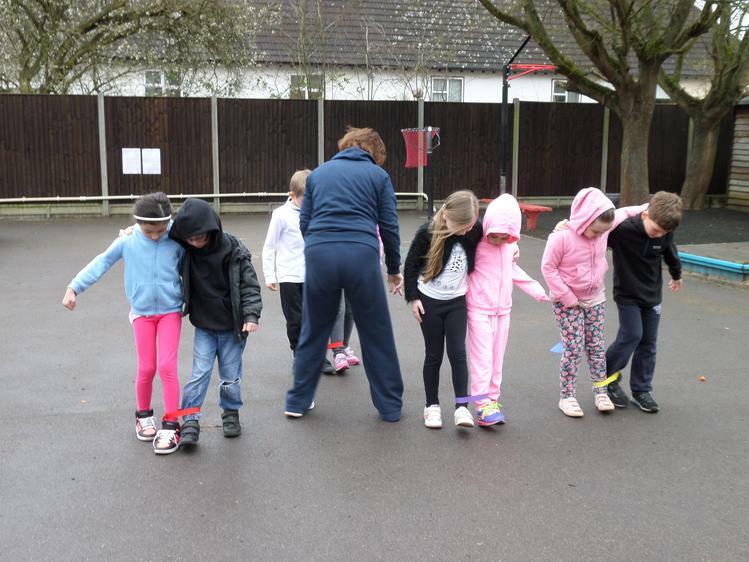 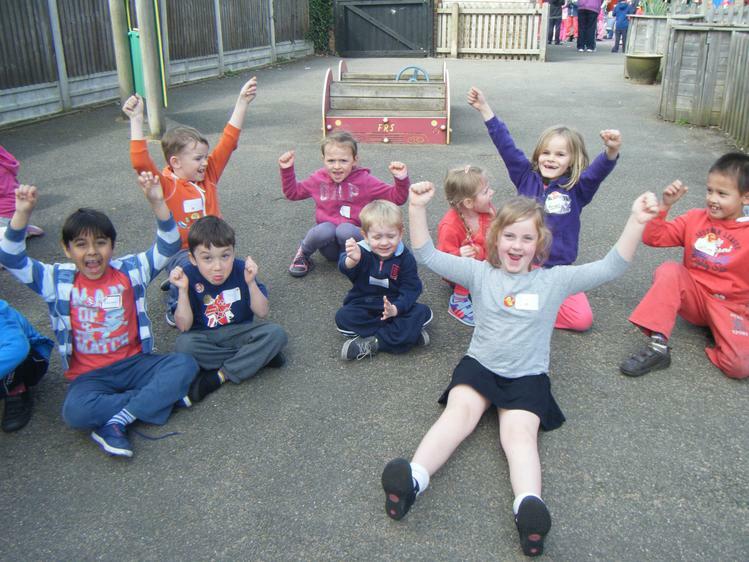 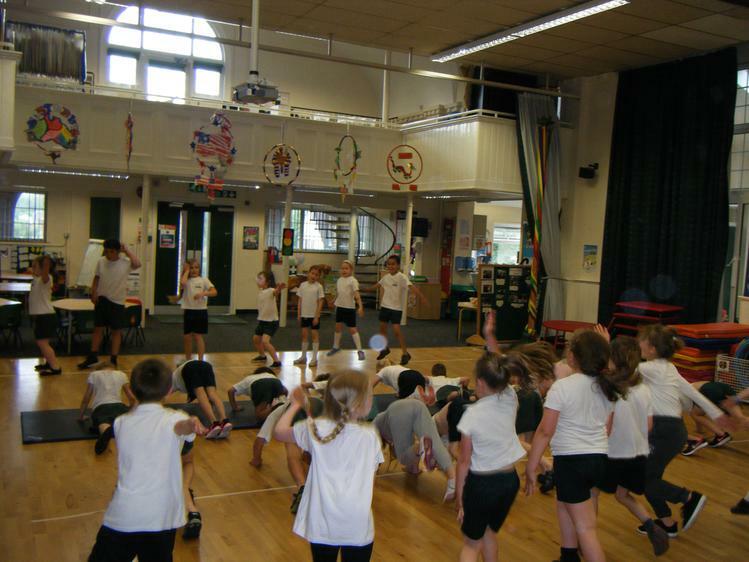 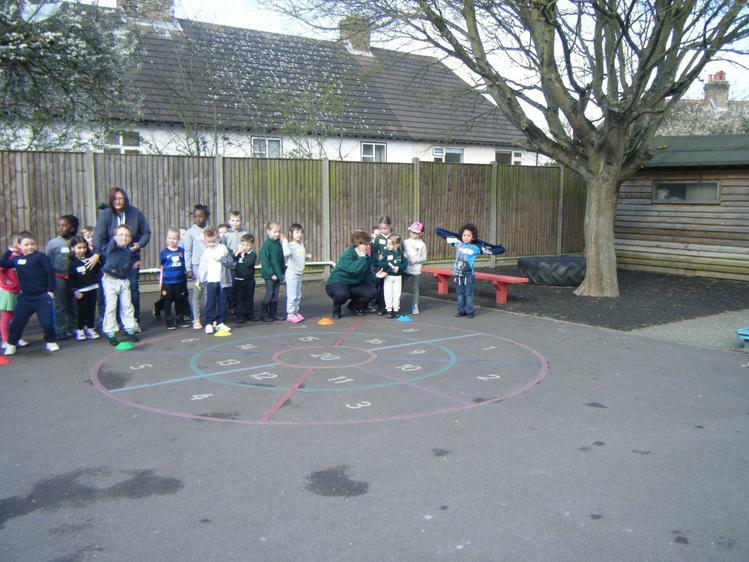 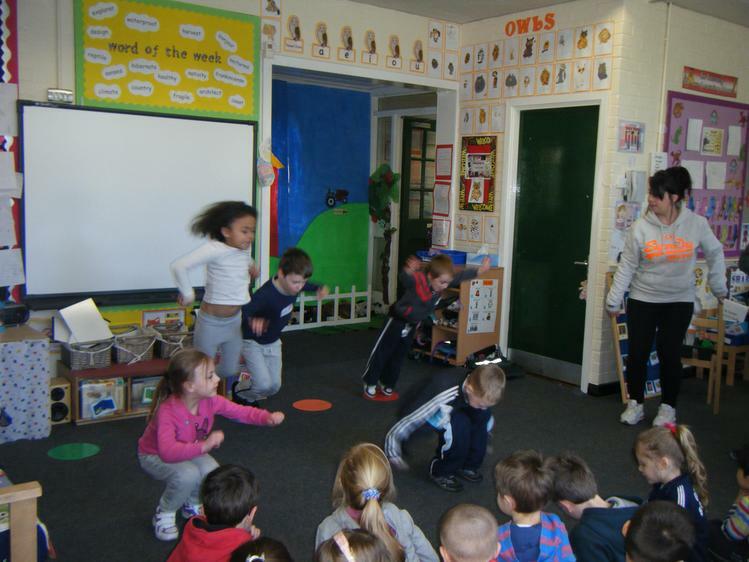 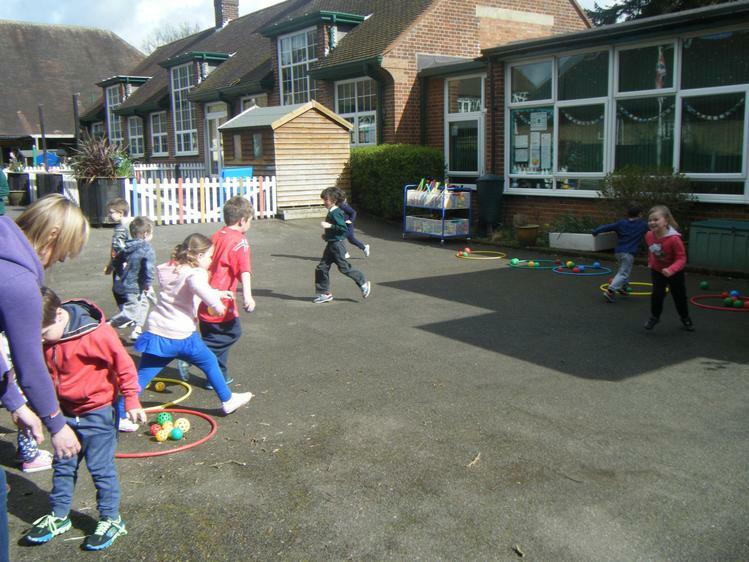 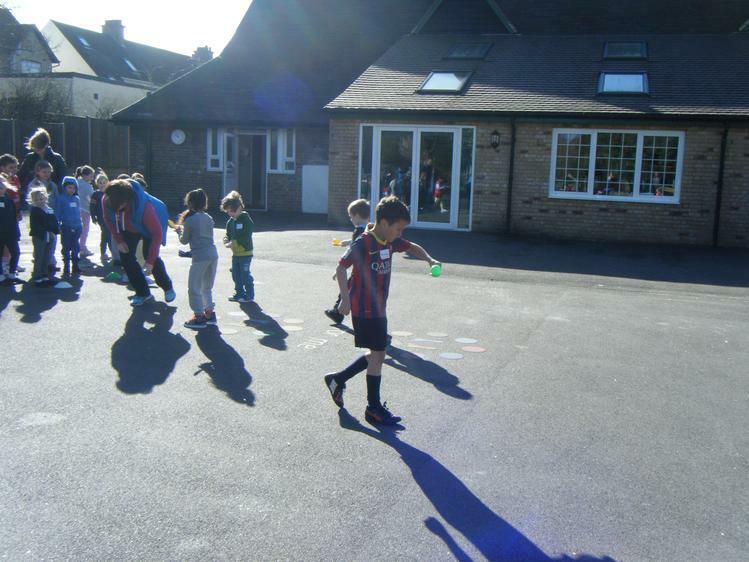 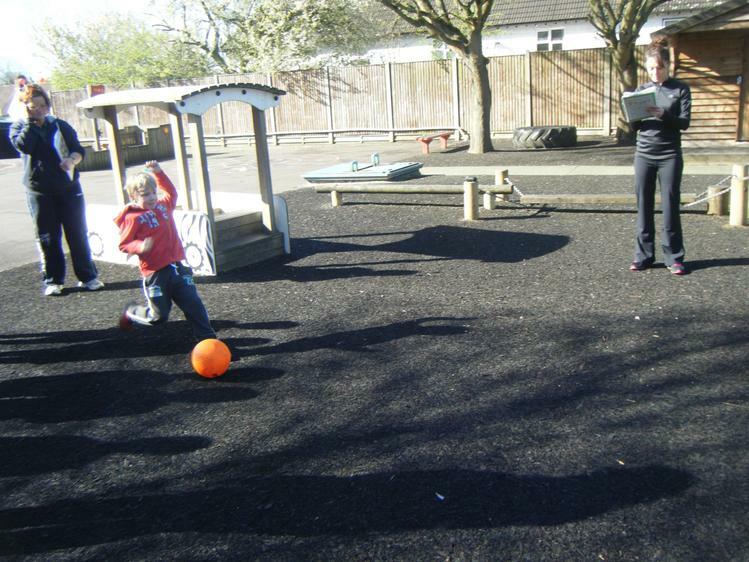 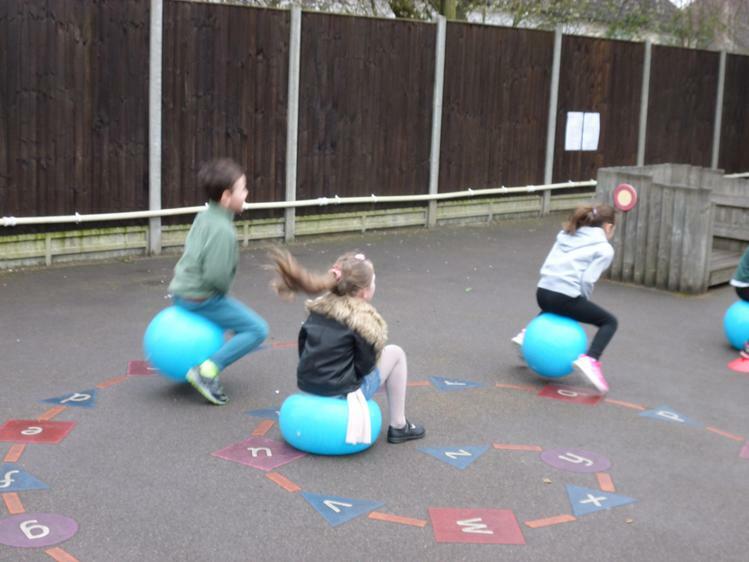 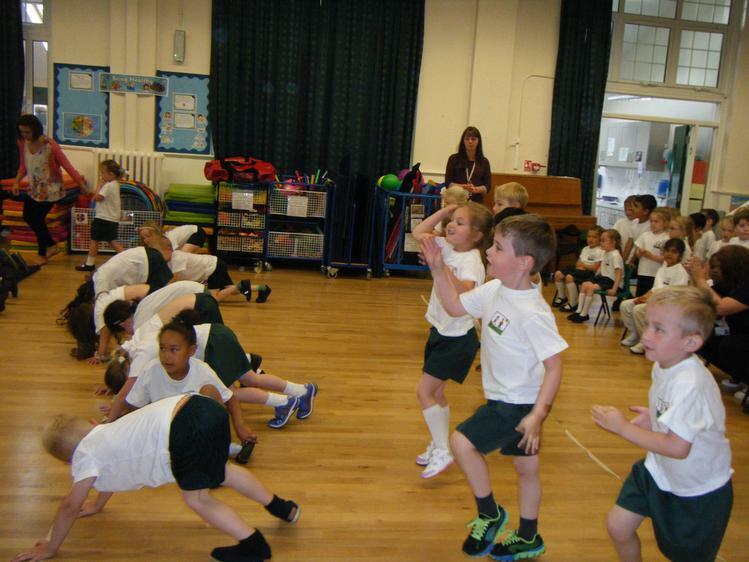 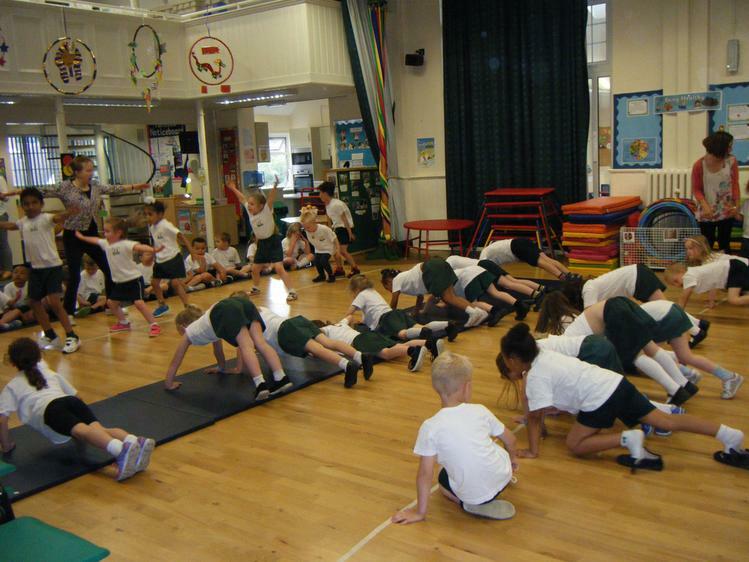 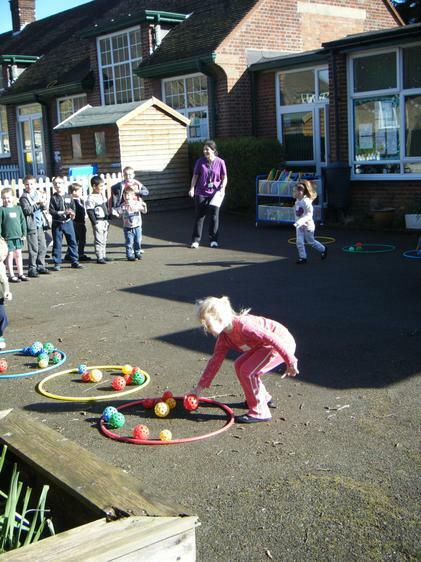 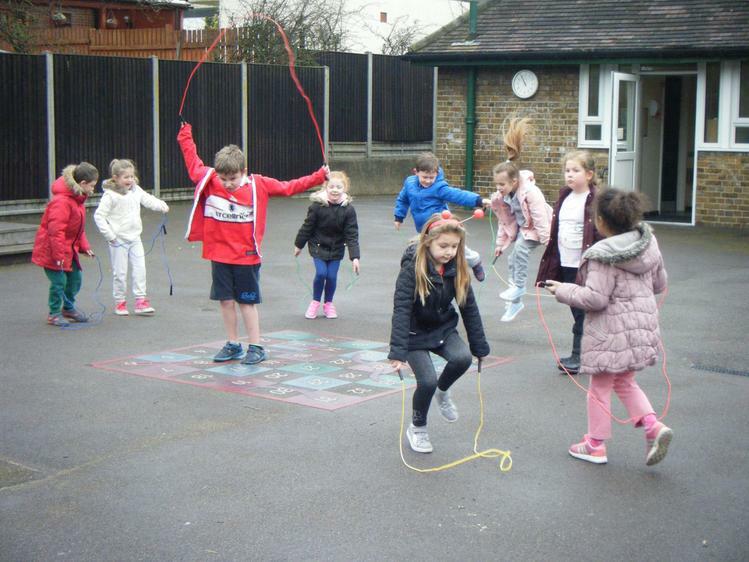 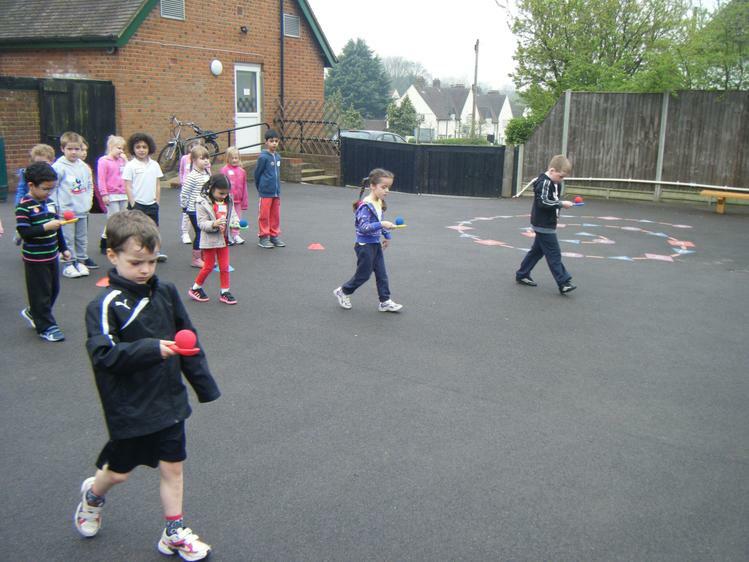 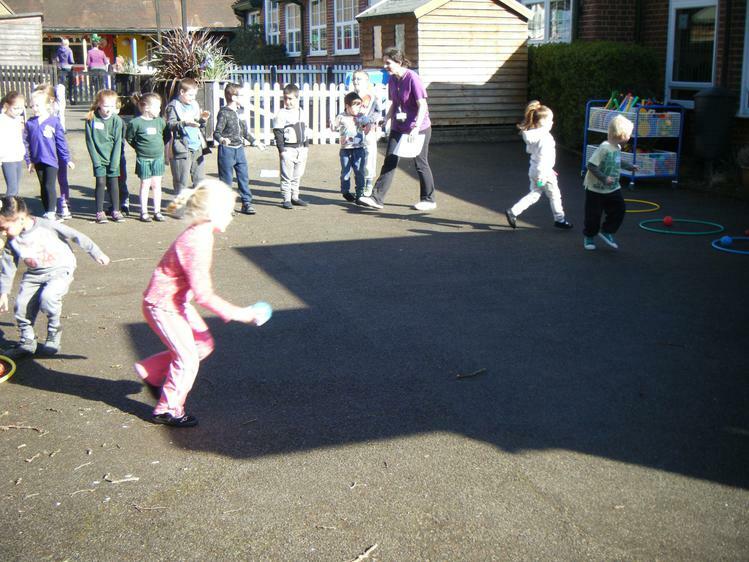 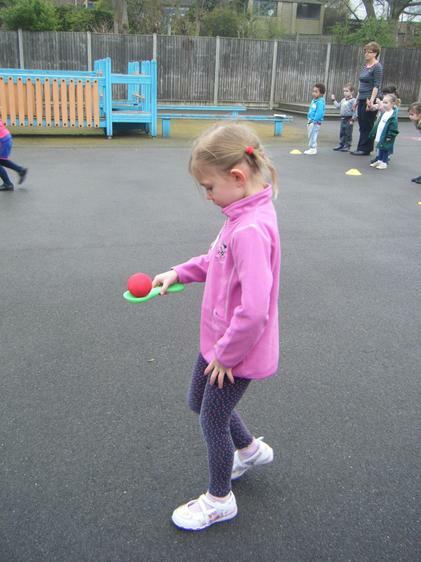 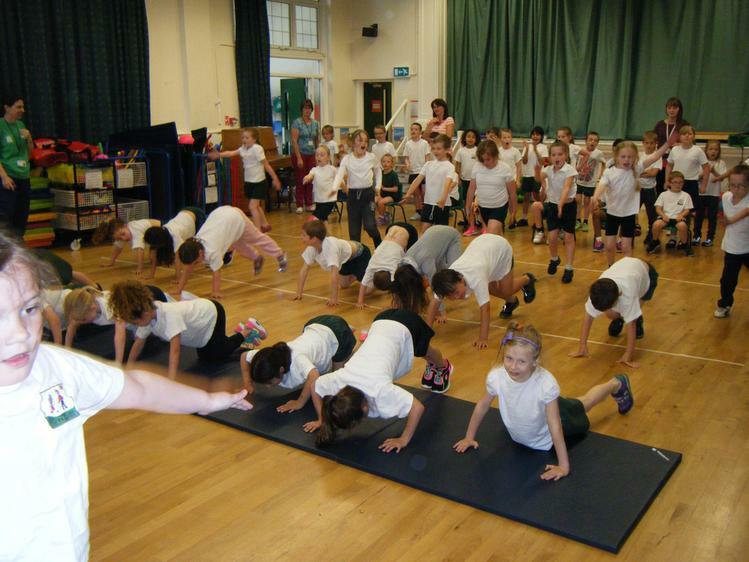 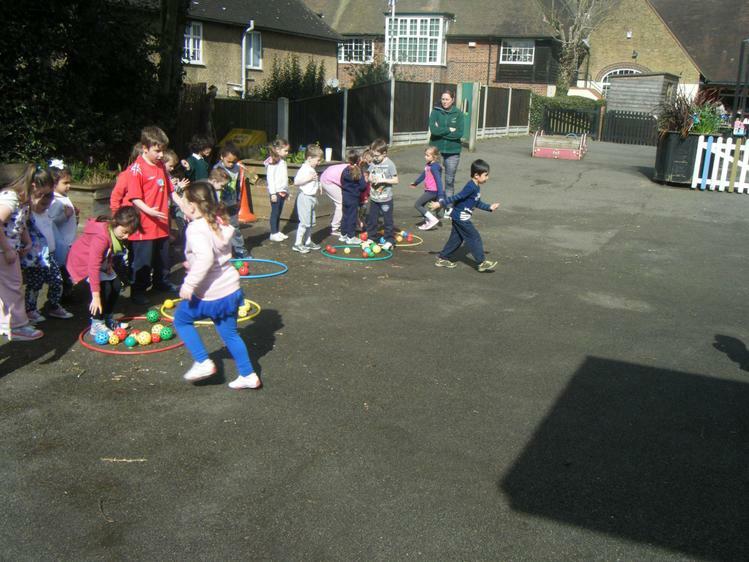 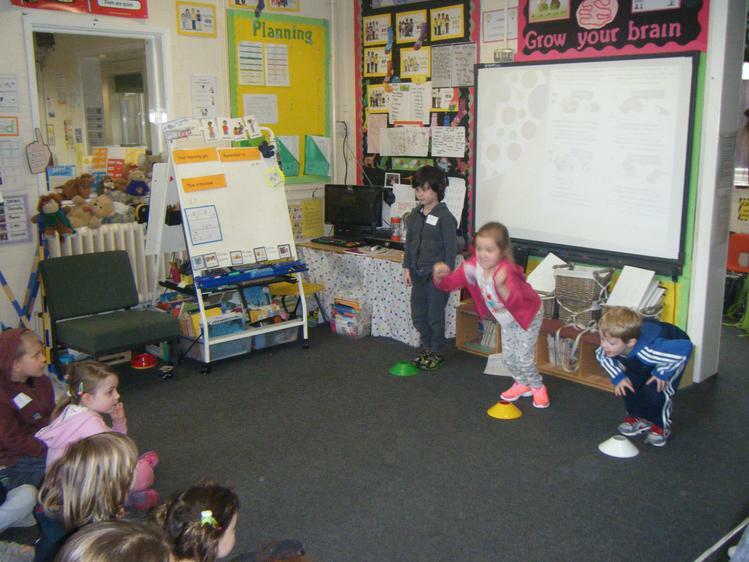 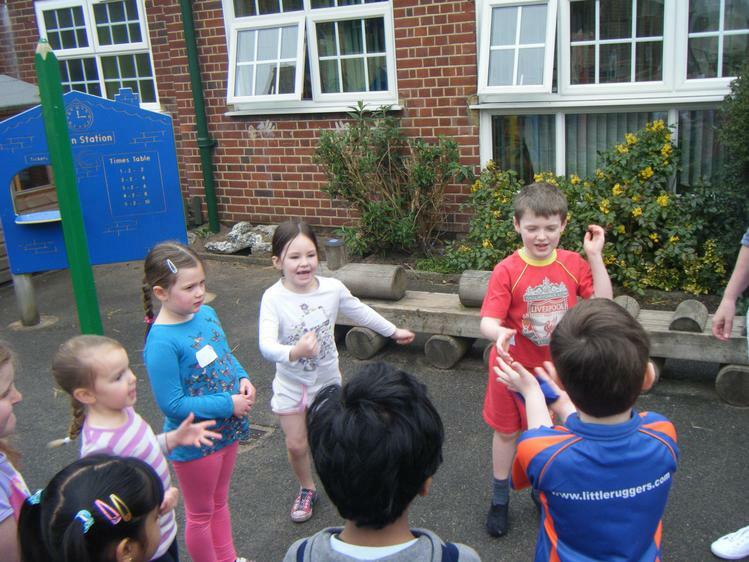 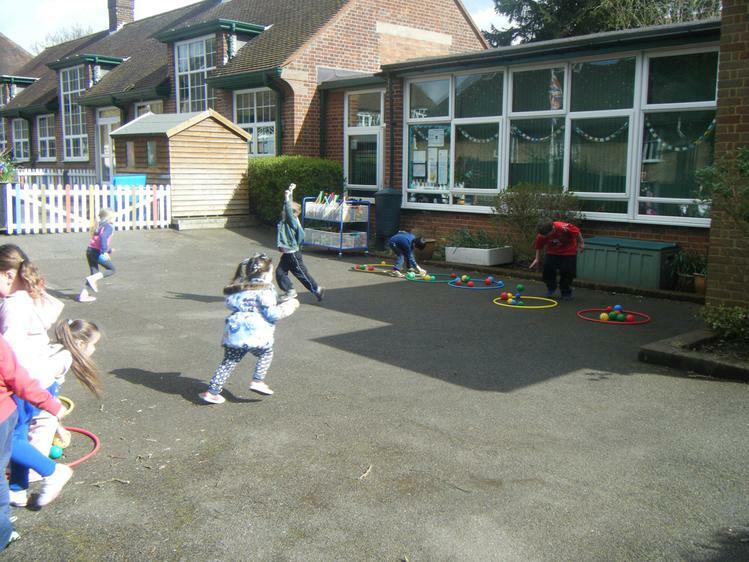 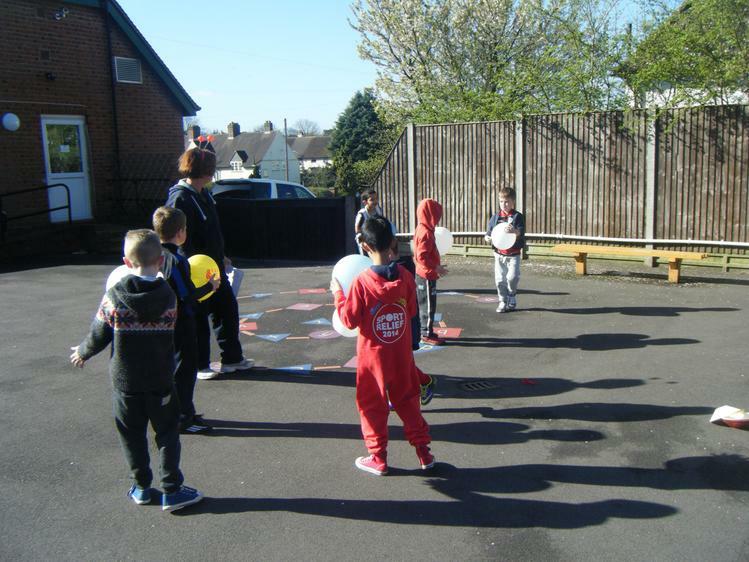 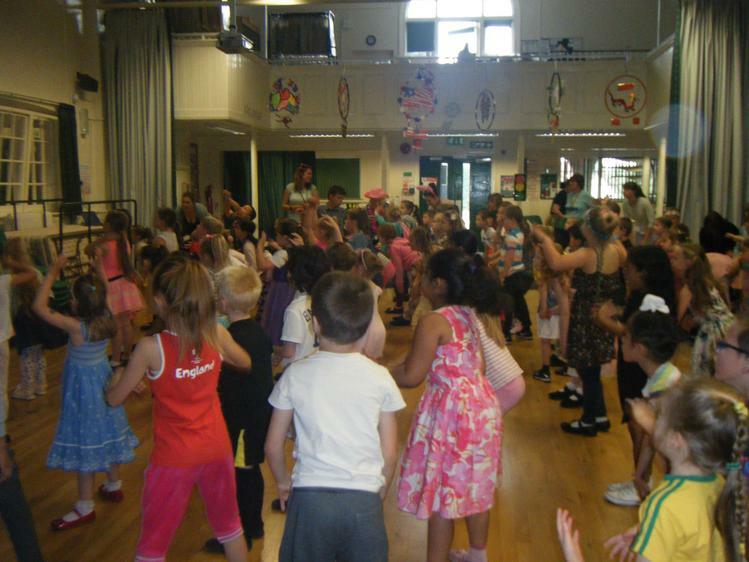 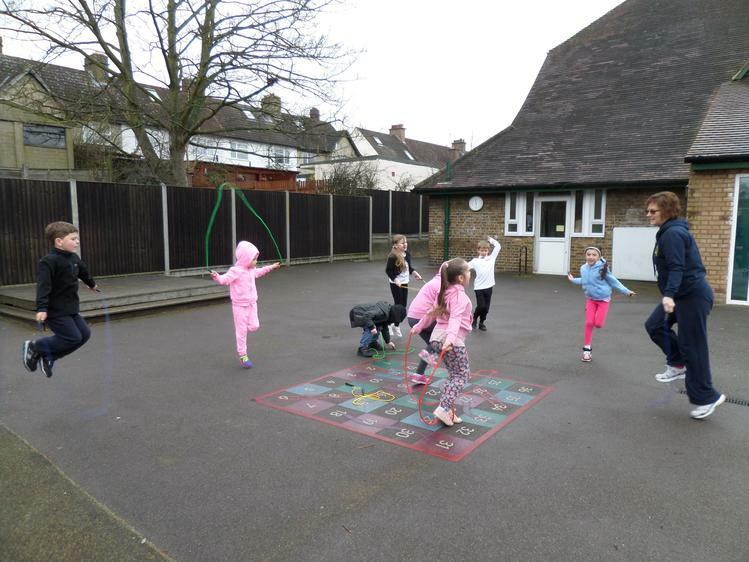 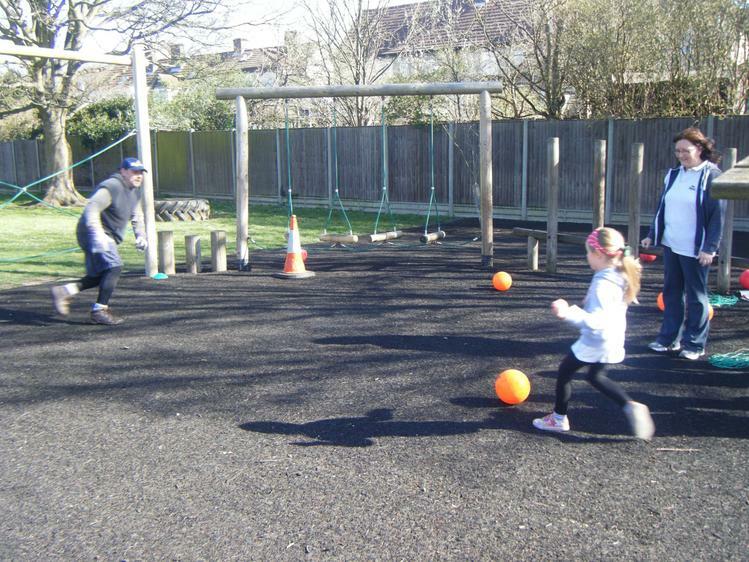 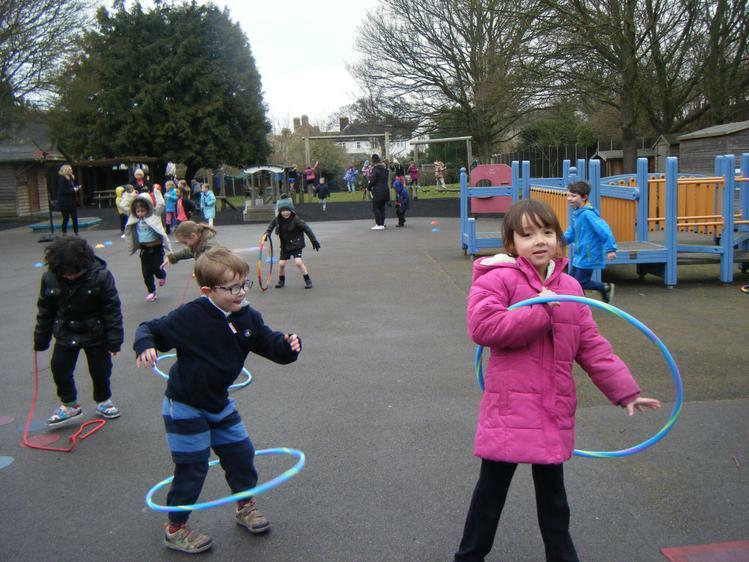 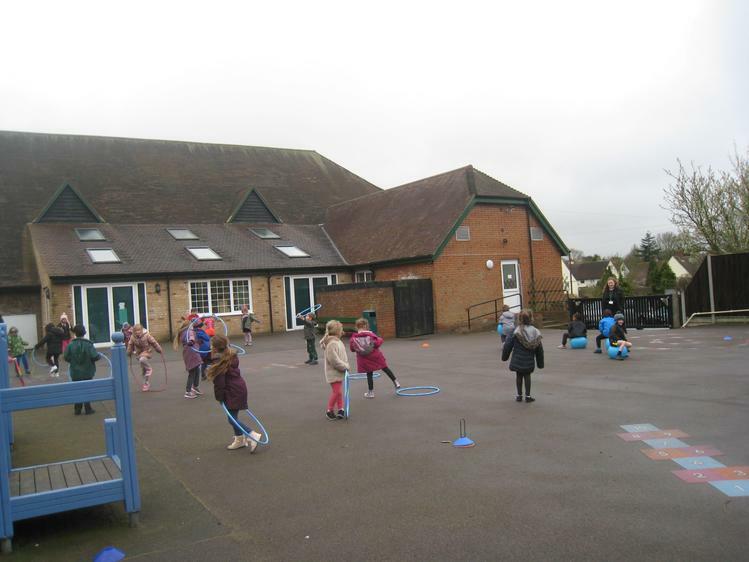 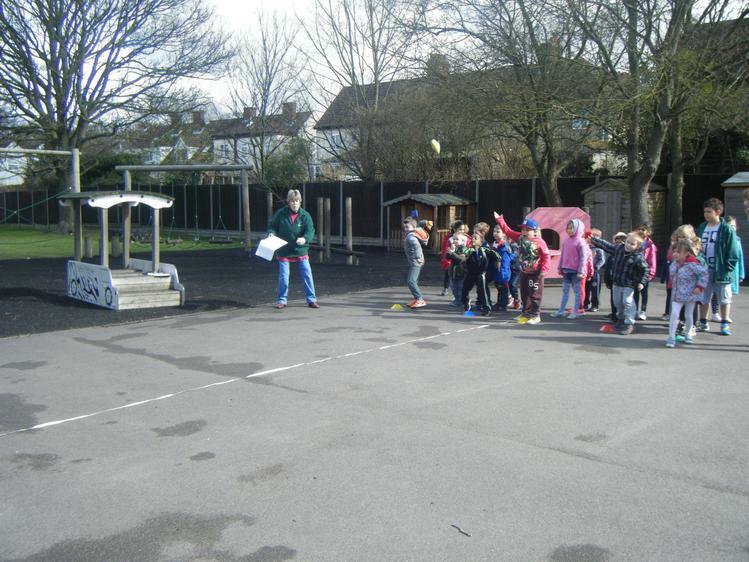 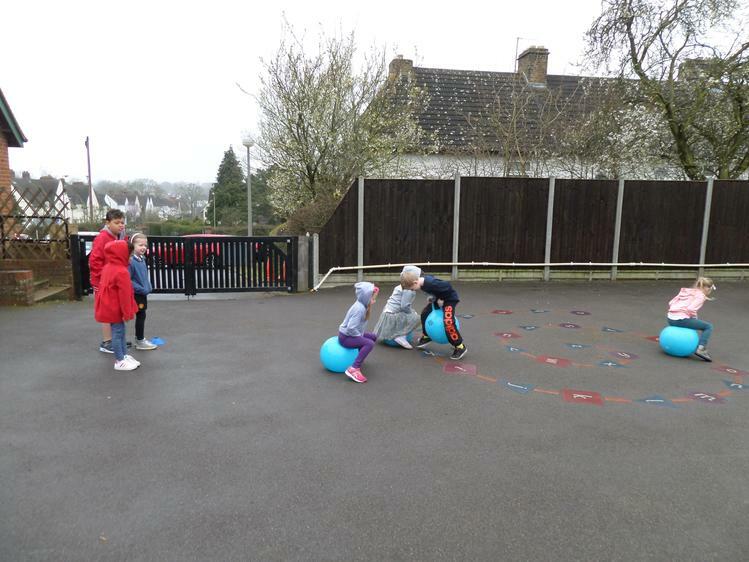 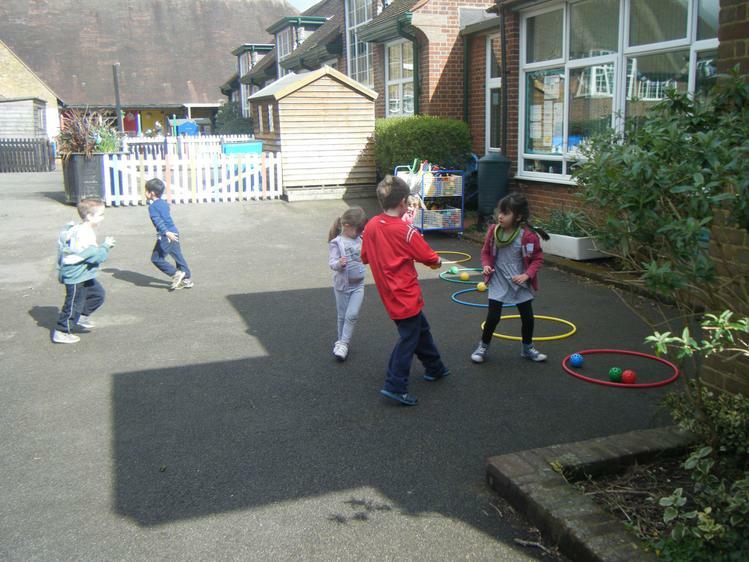 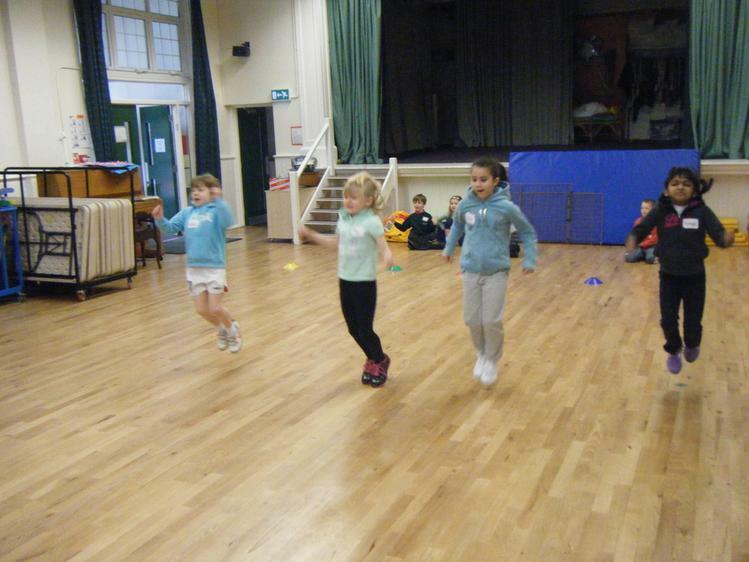 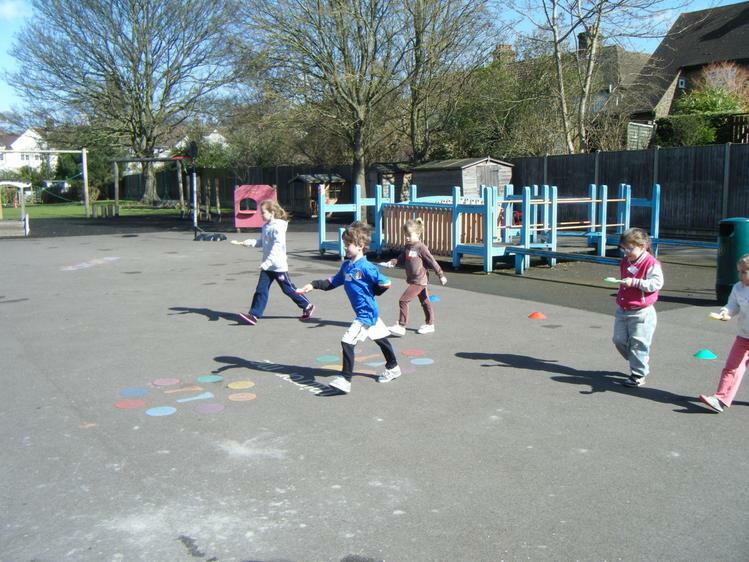 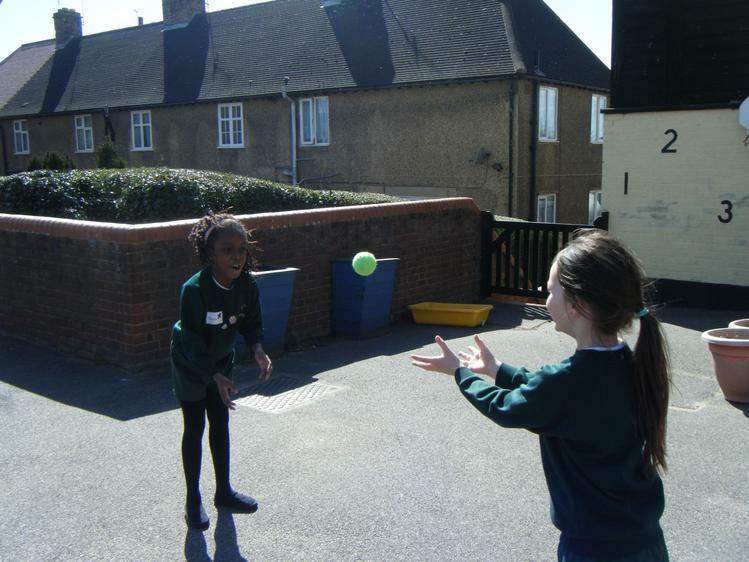 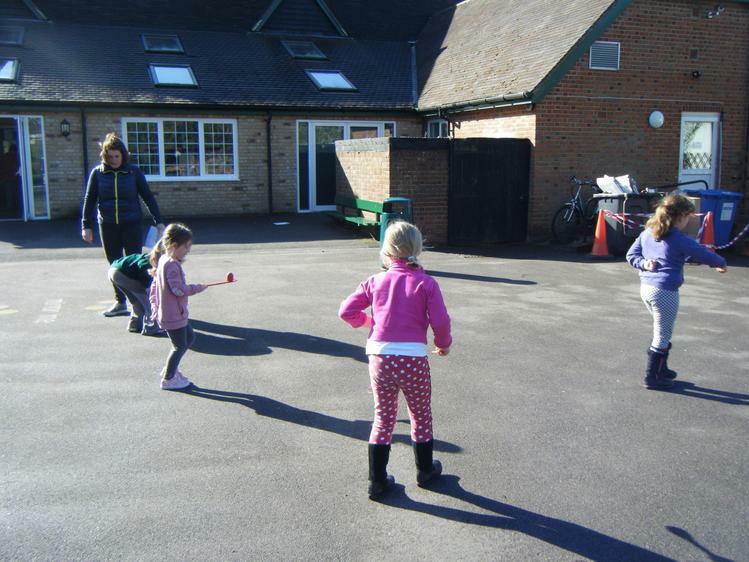 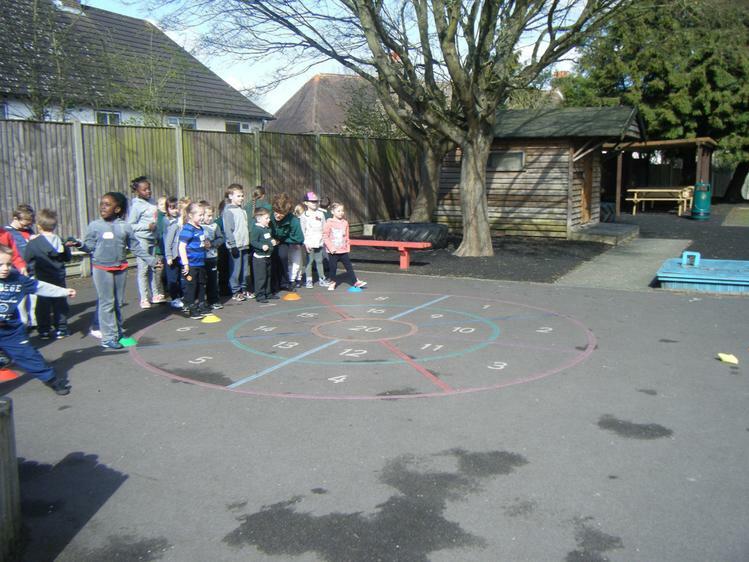 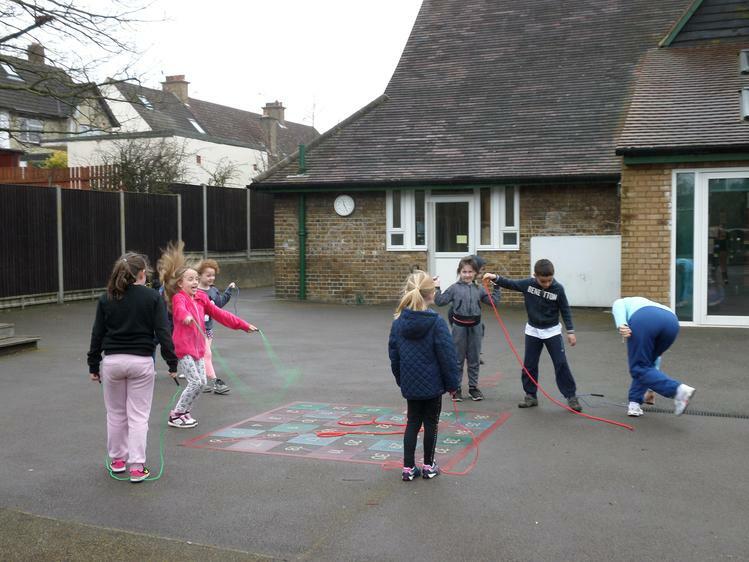 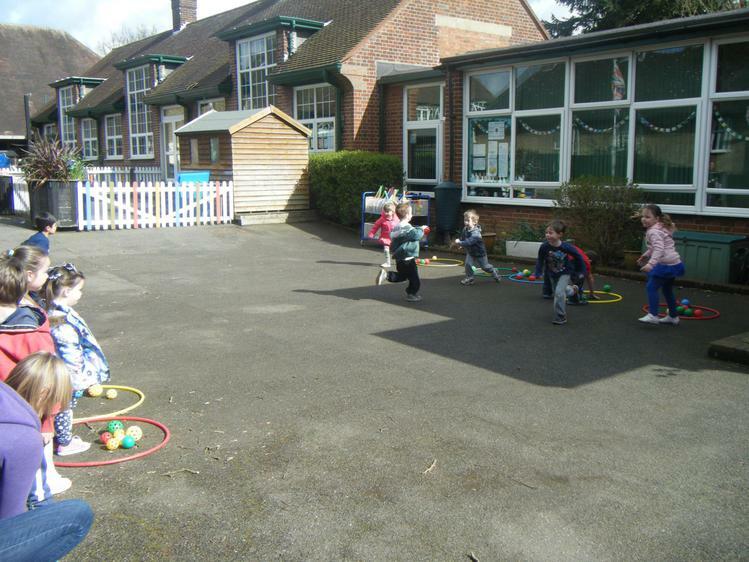 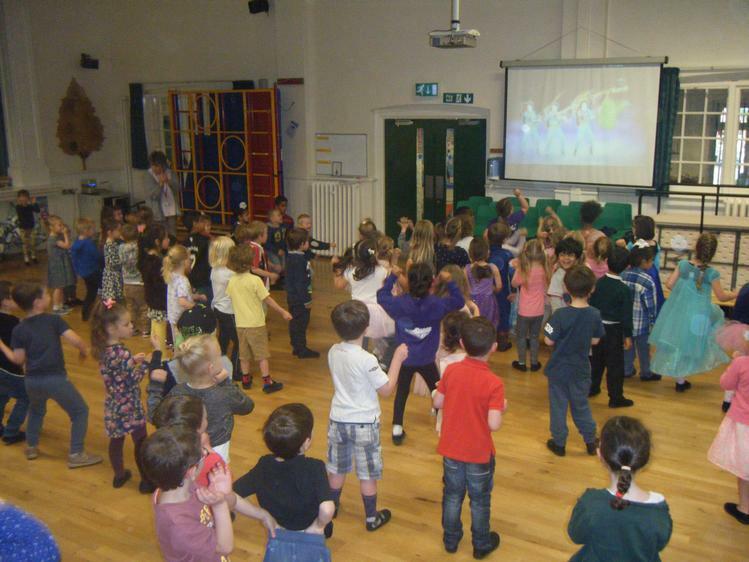 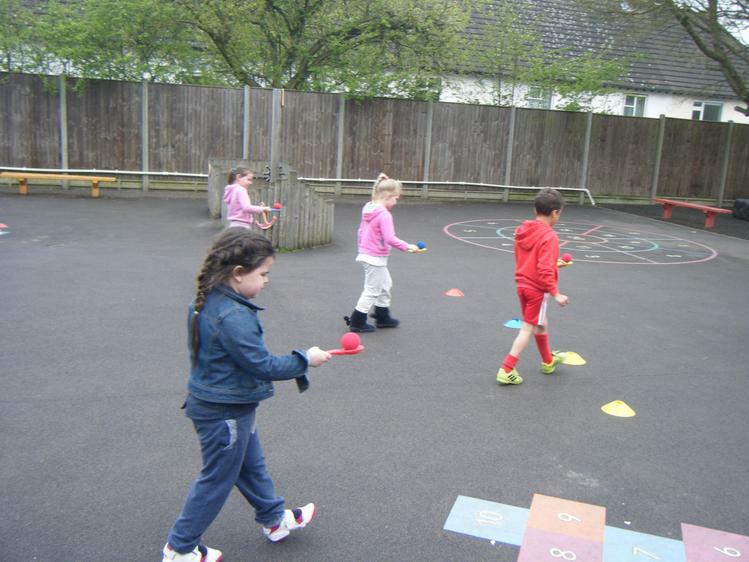 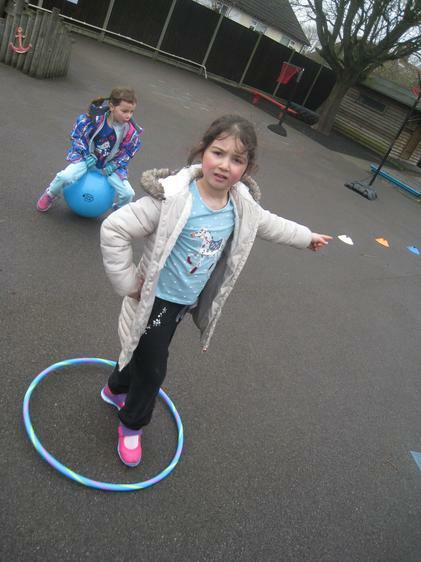 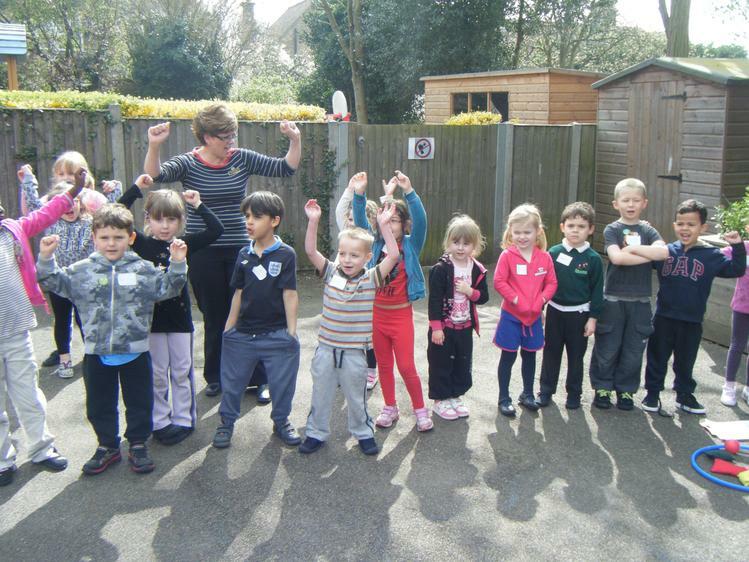 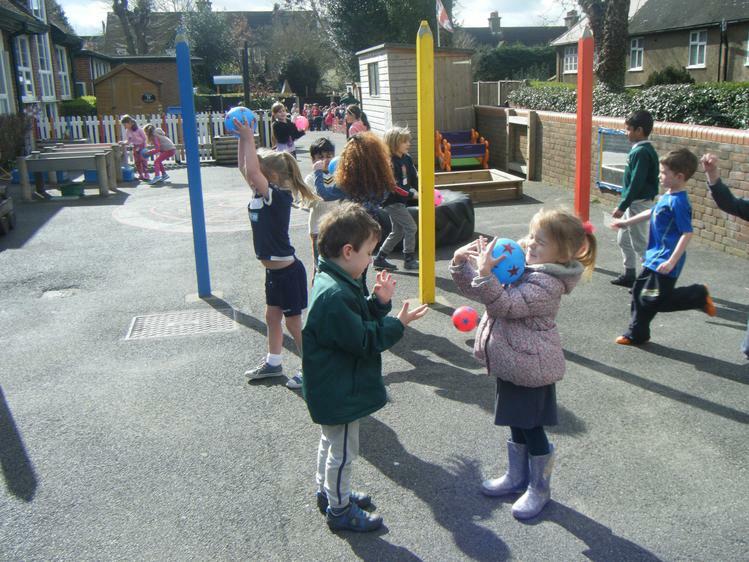 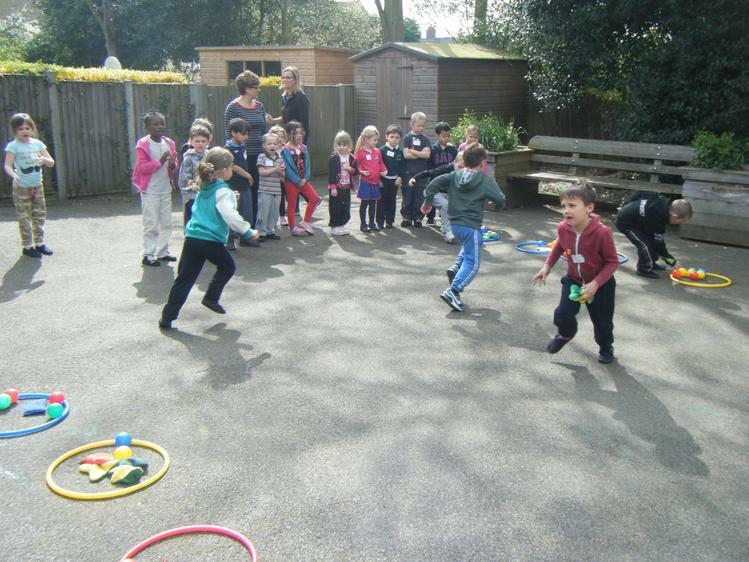 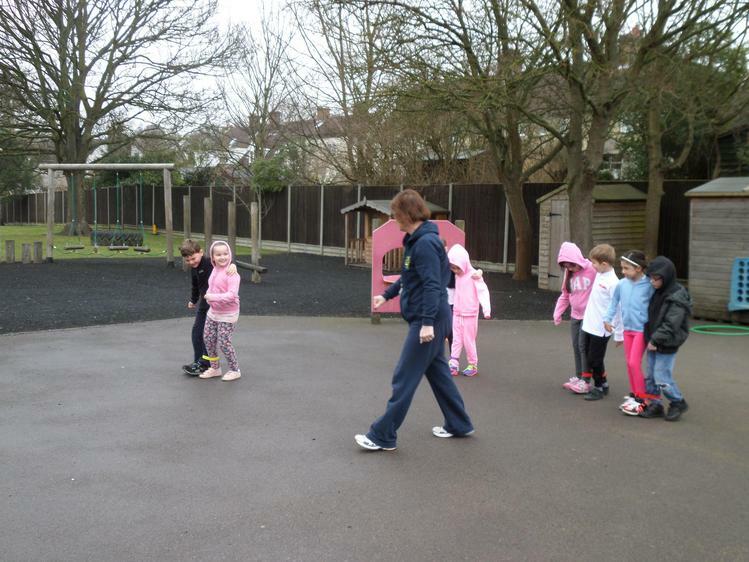 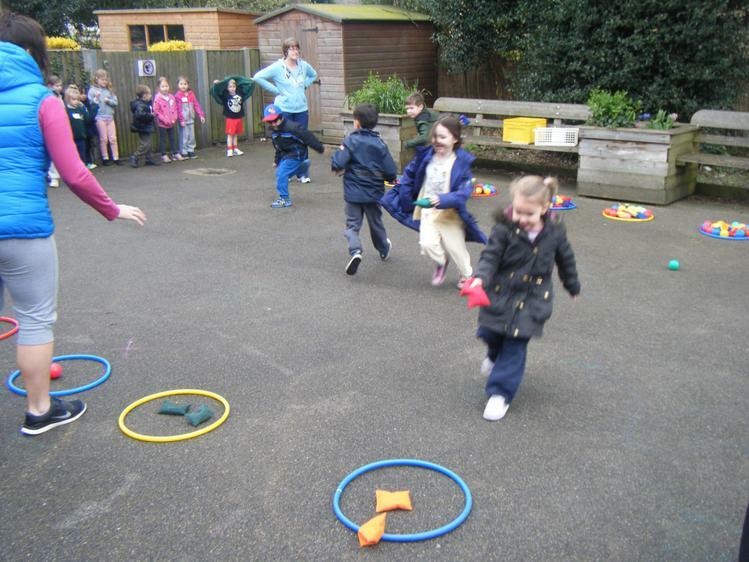 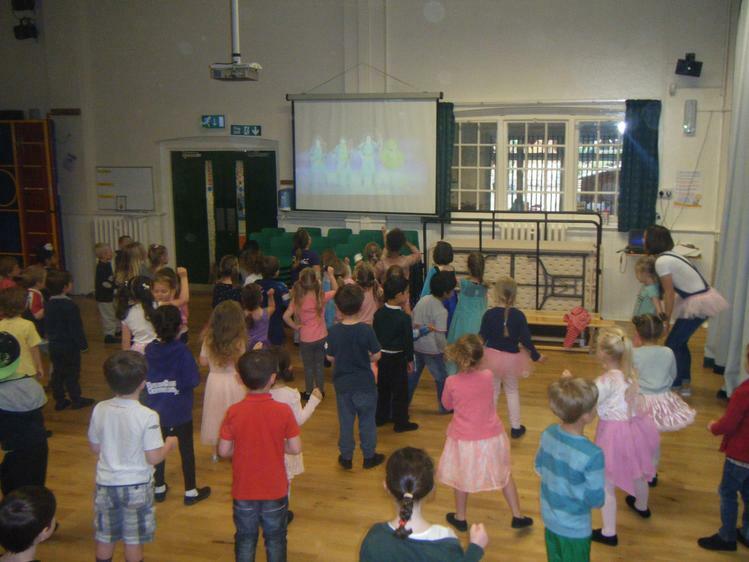 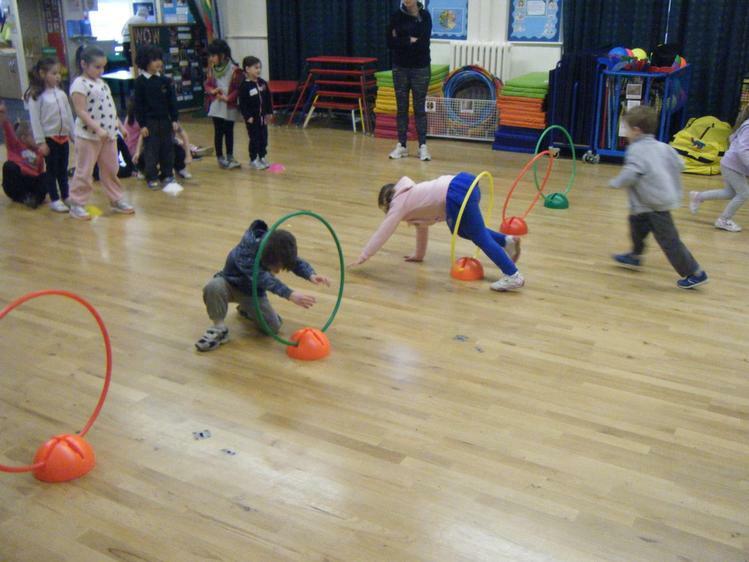 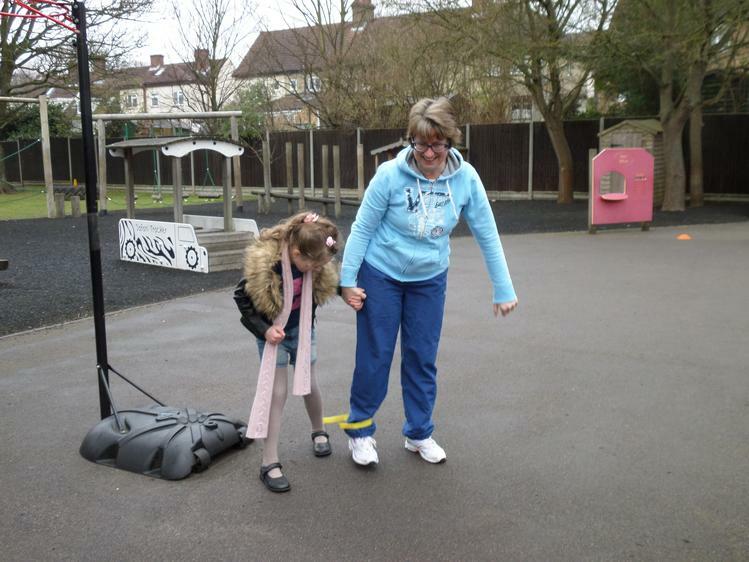 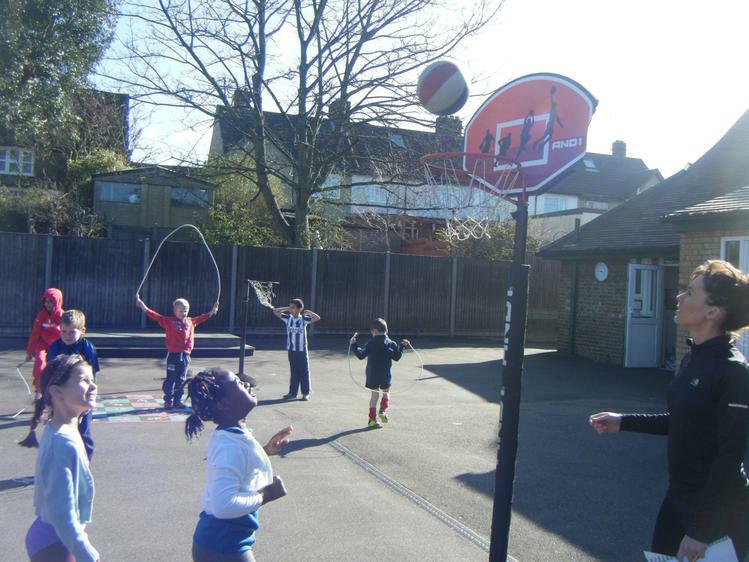 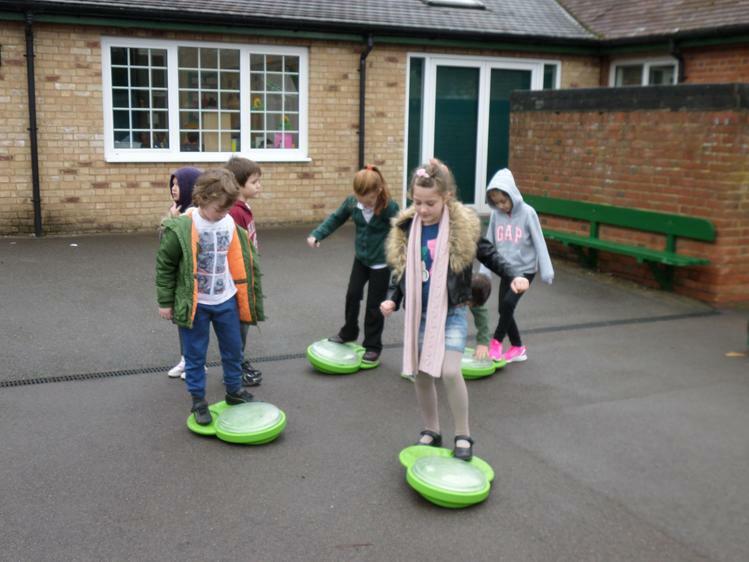 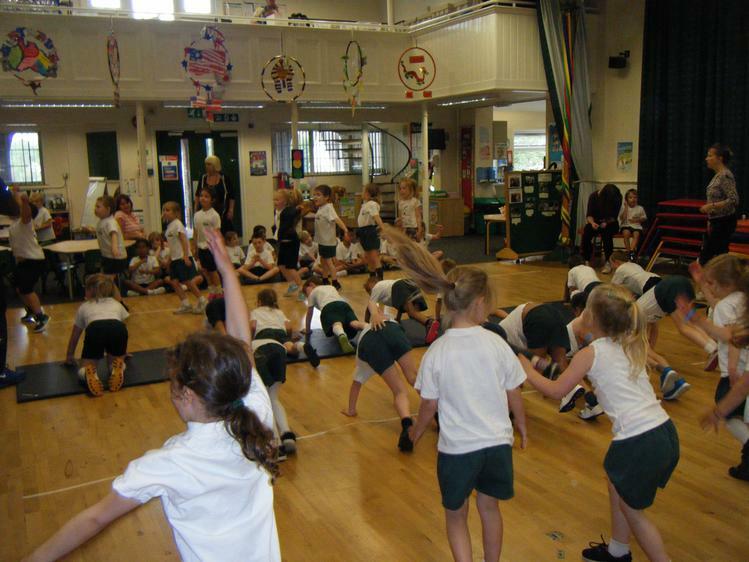 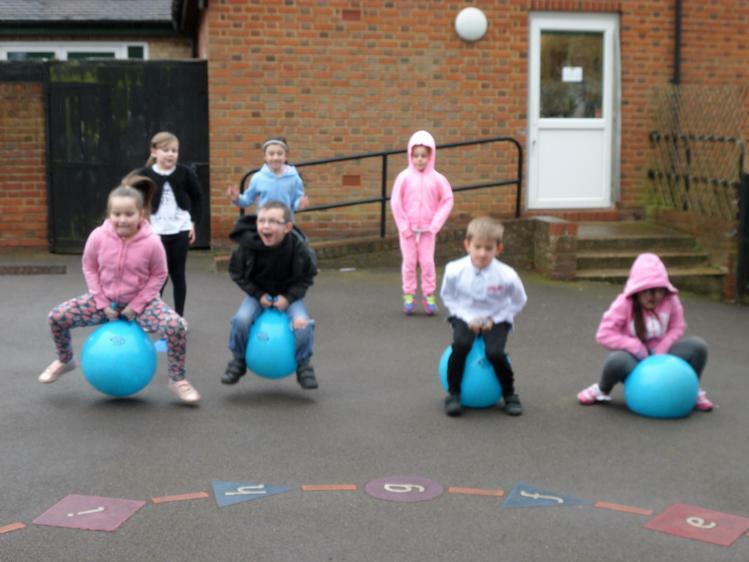 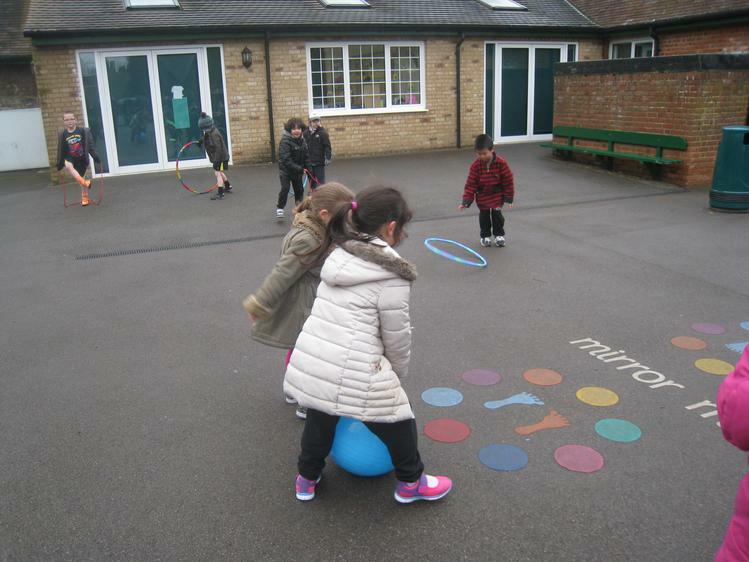 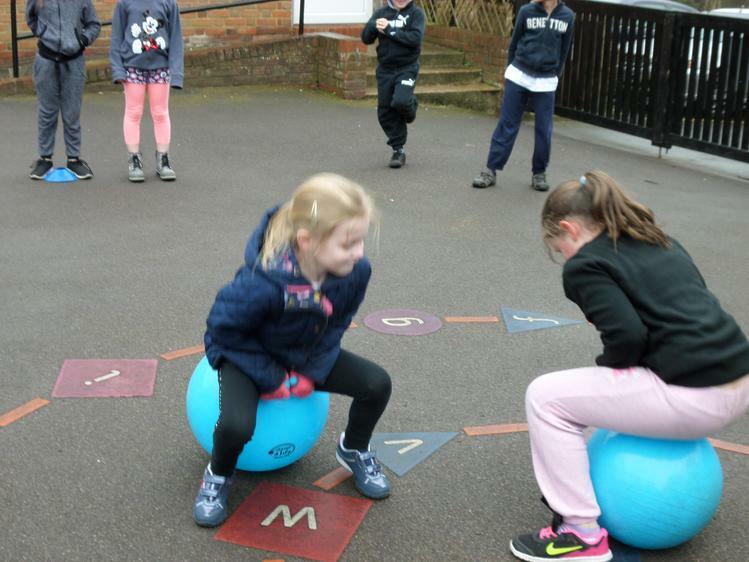 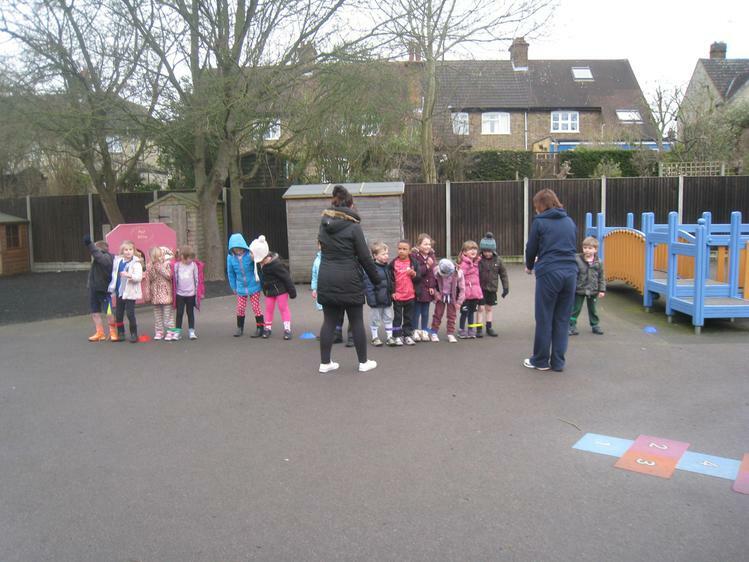 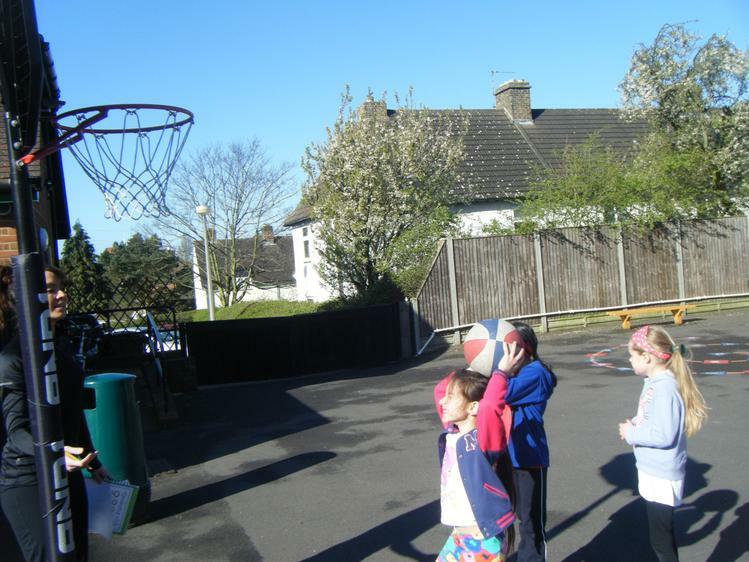 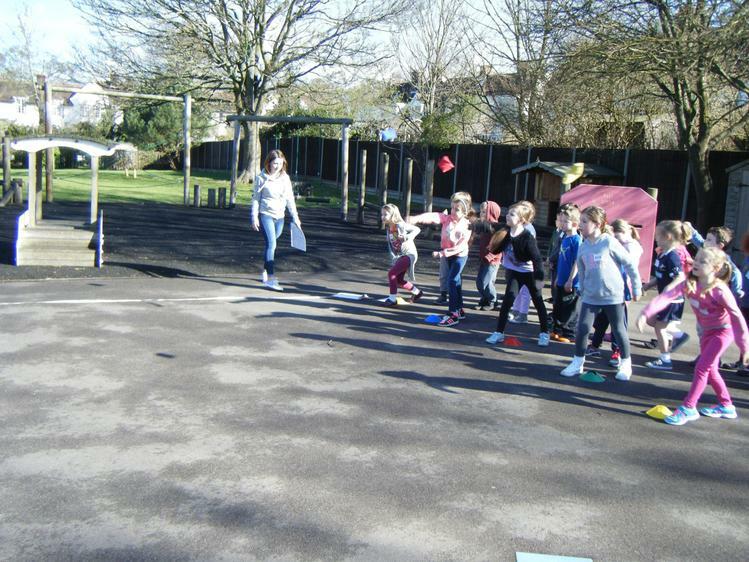 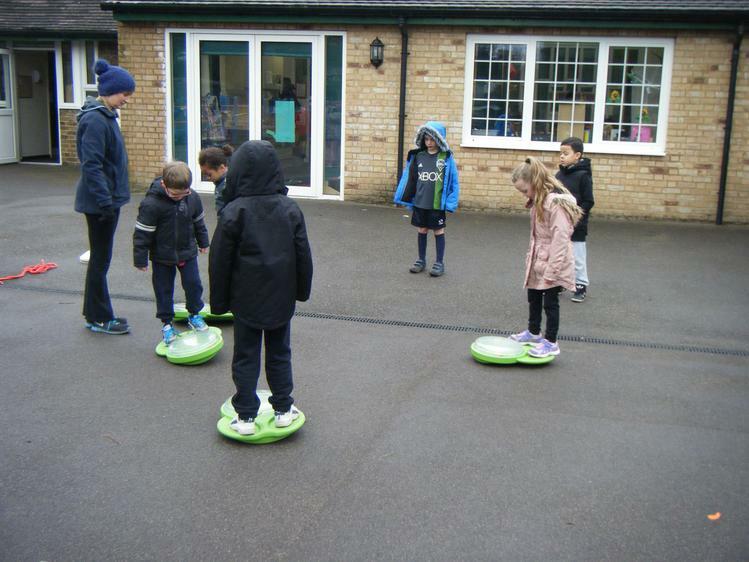 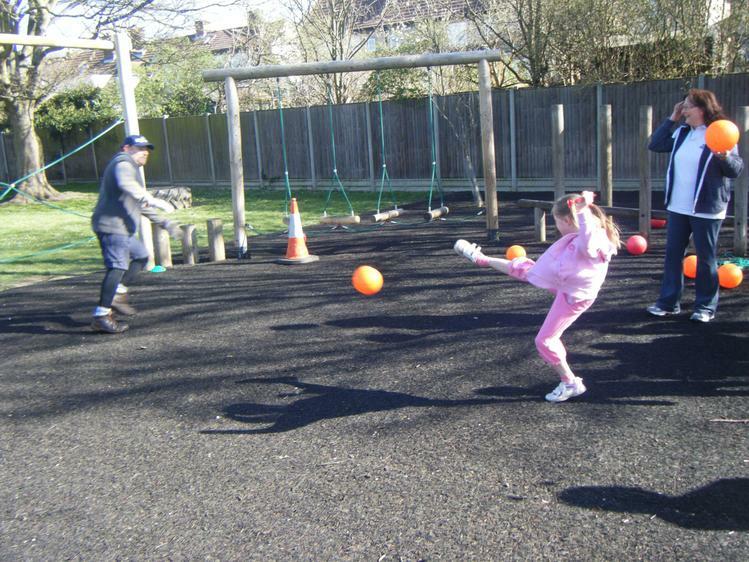 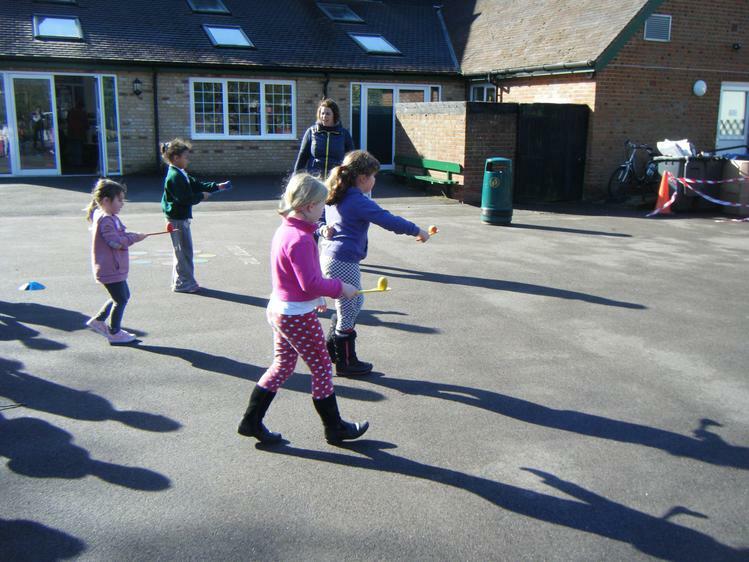 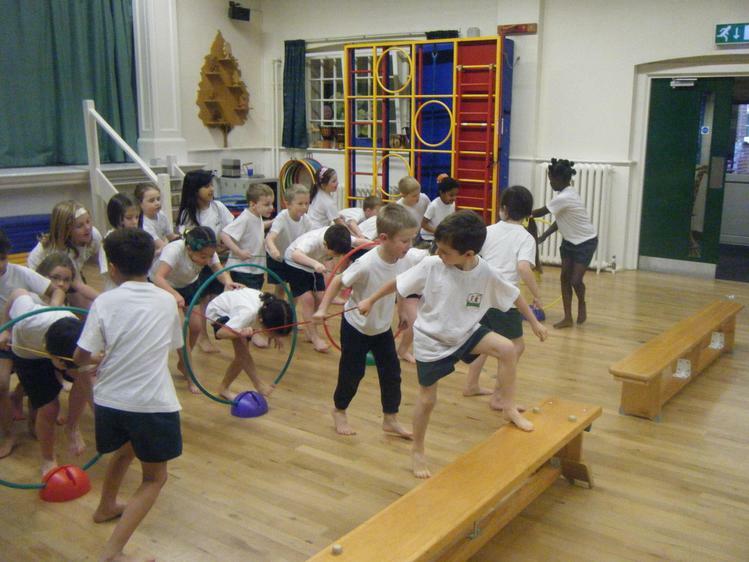 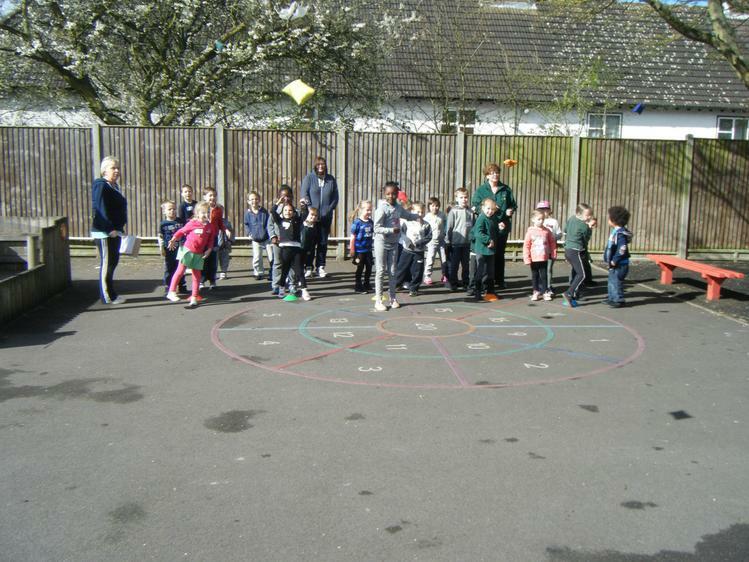 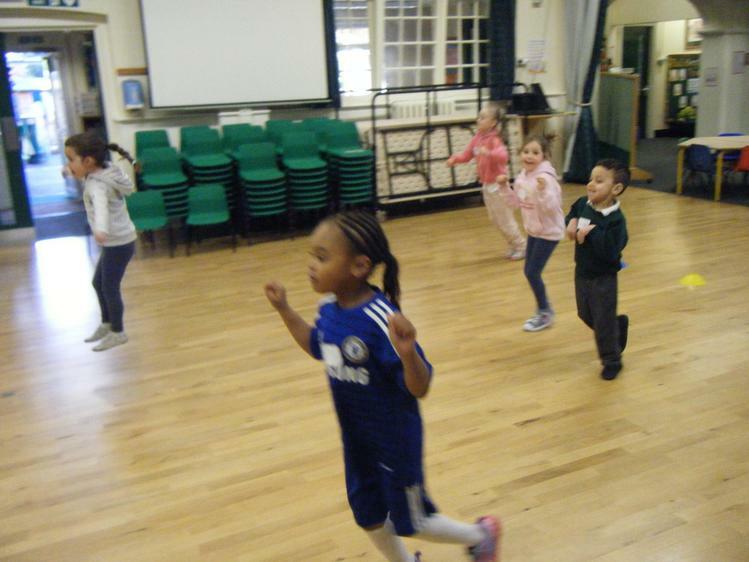 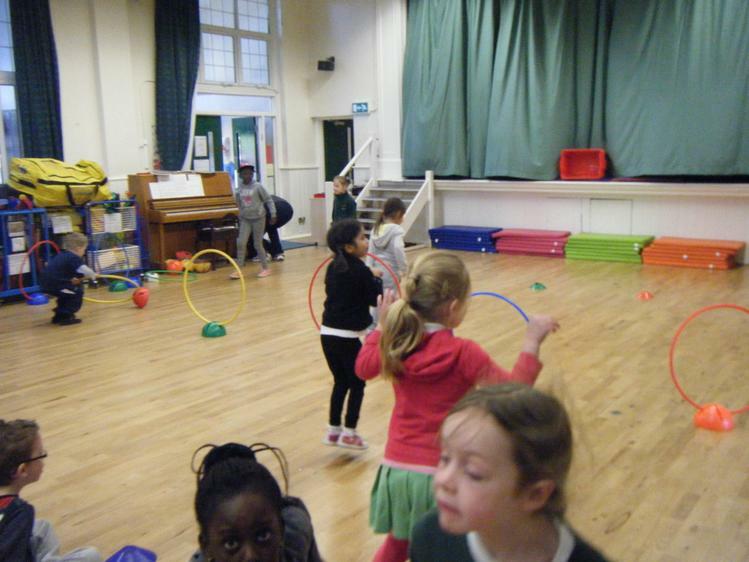 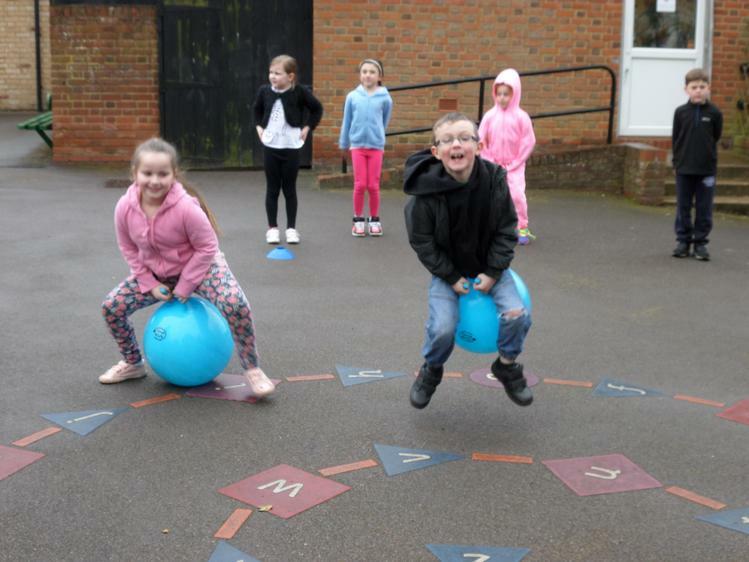 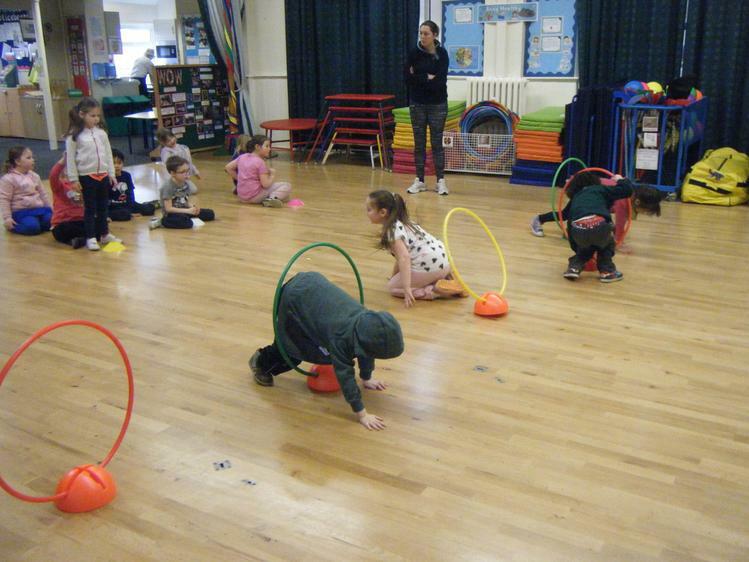 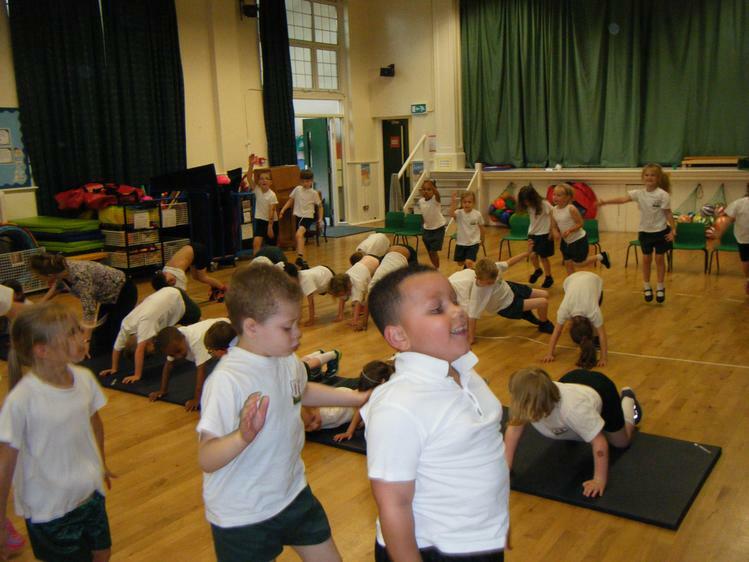 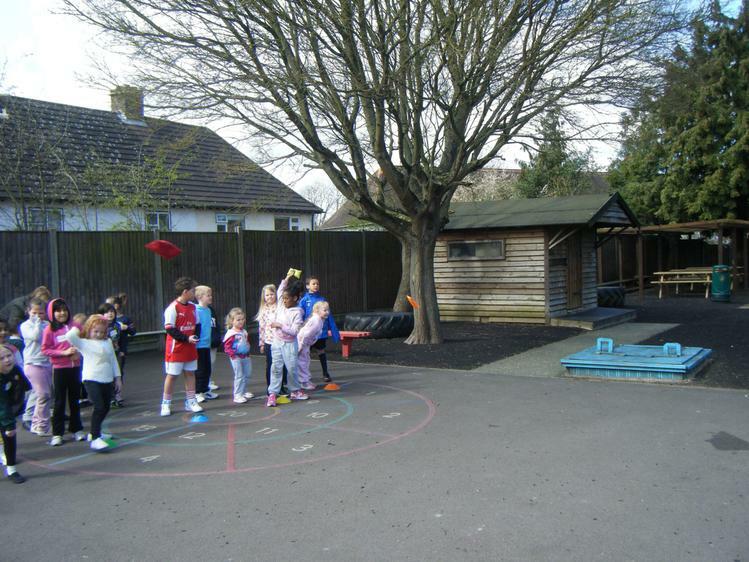 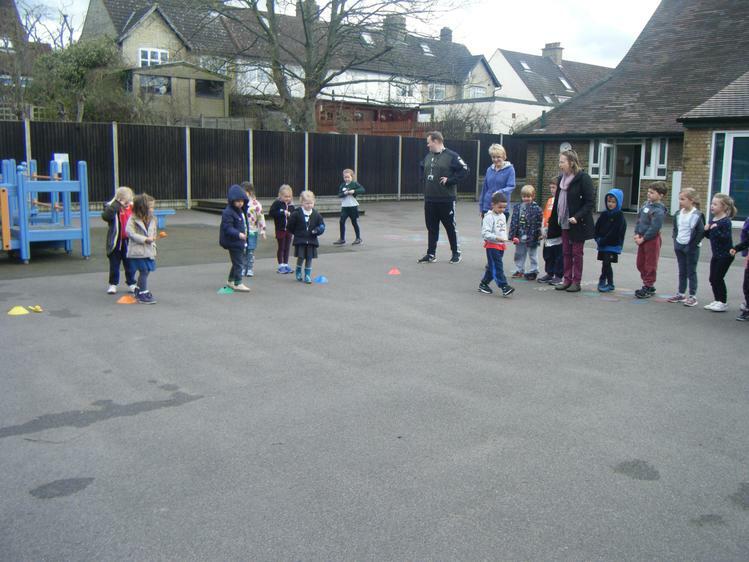 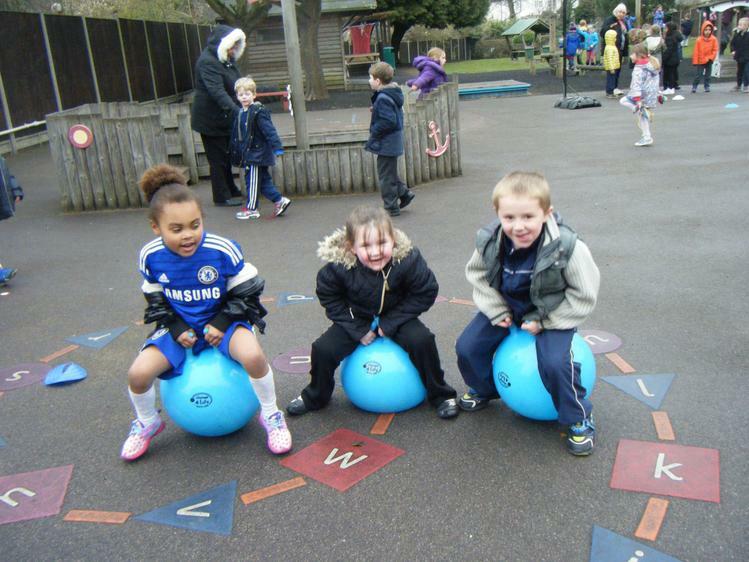 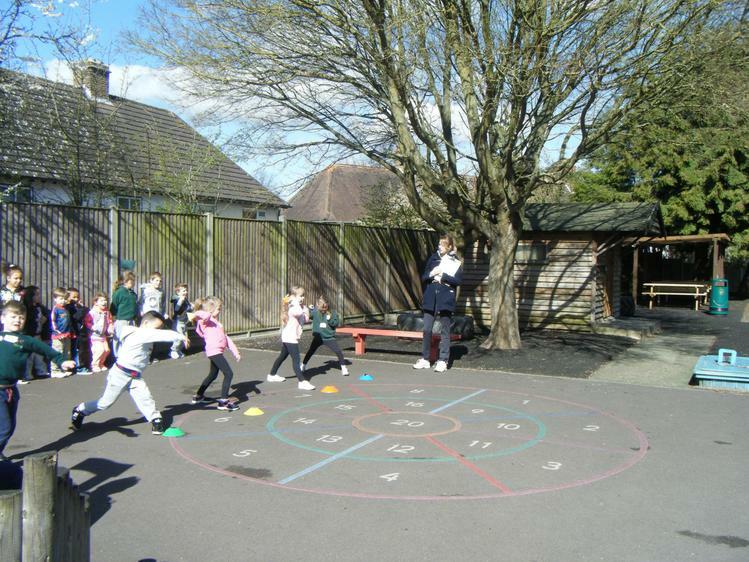 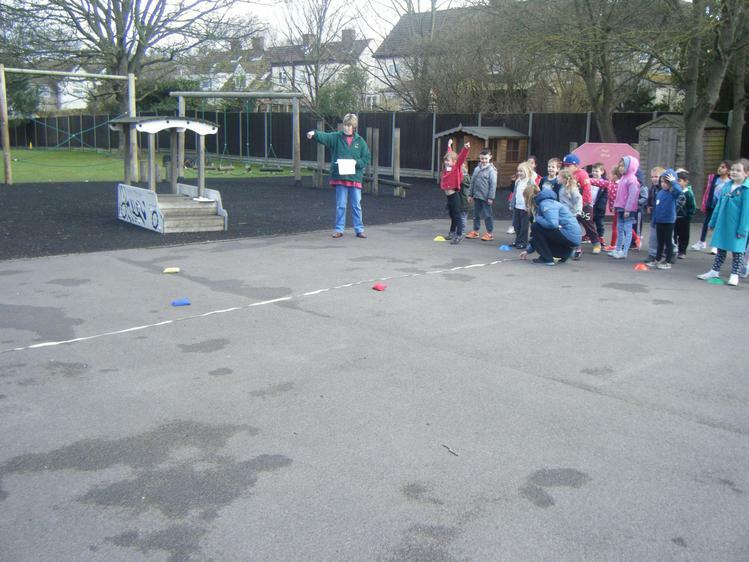 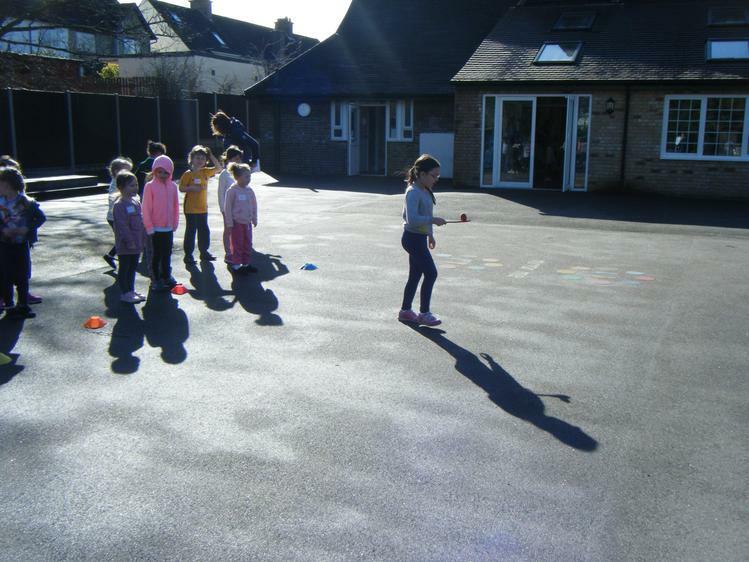 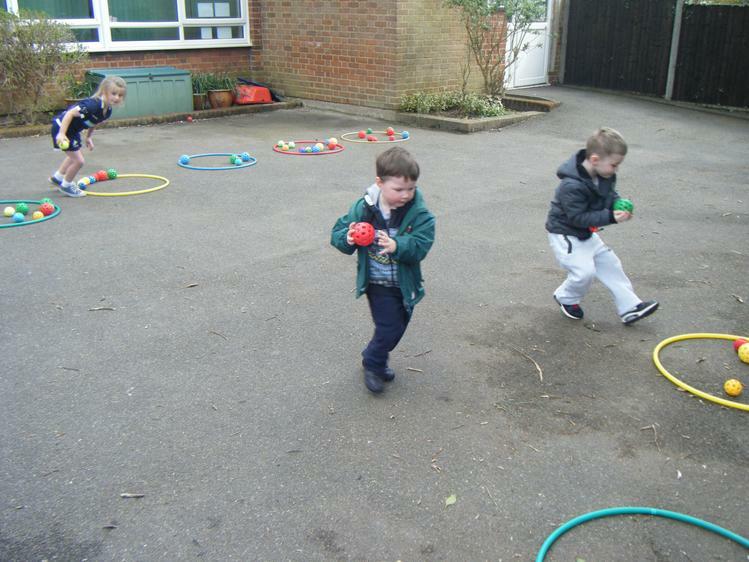 The children had a fantastic time taking part in different activities to raise money for Sport Relief. 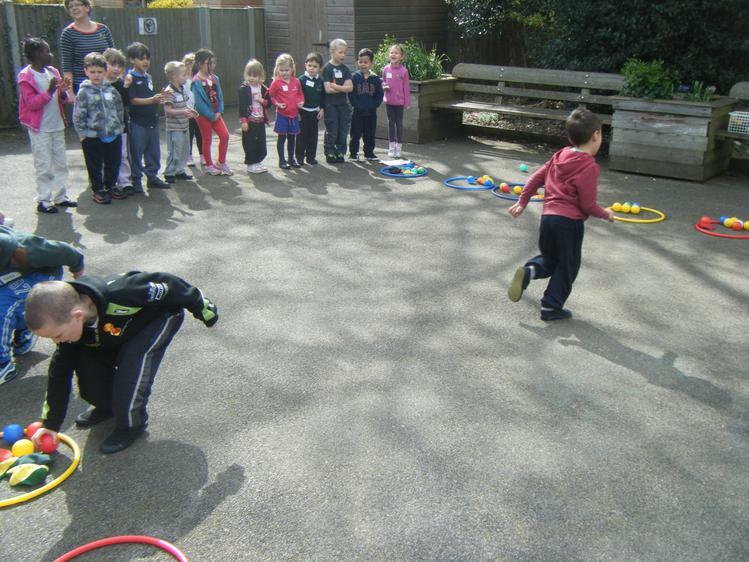 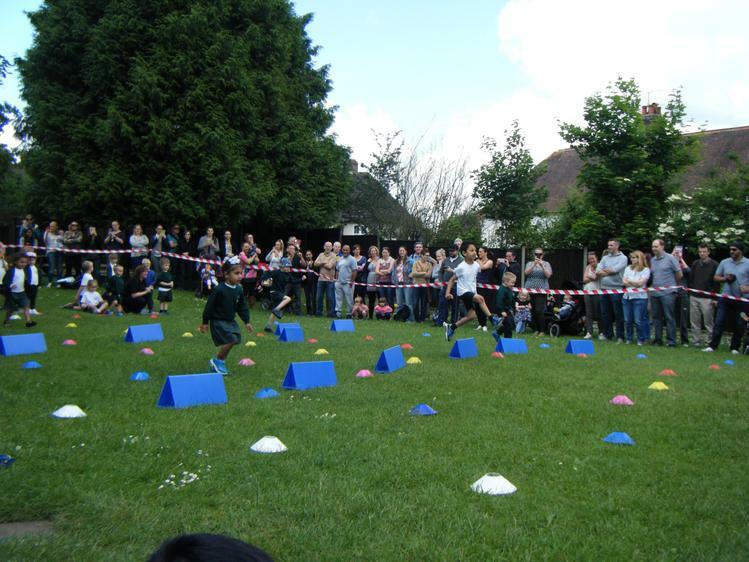 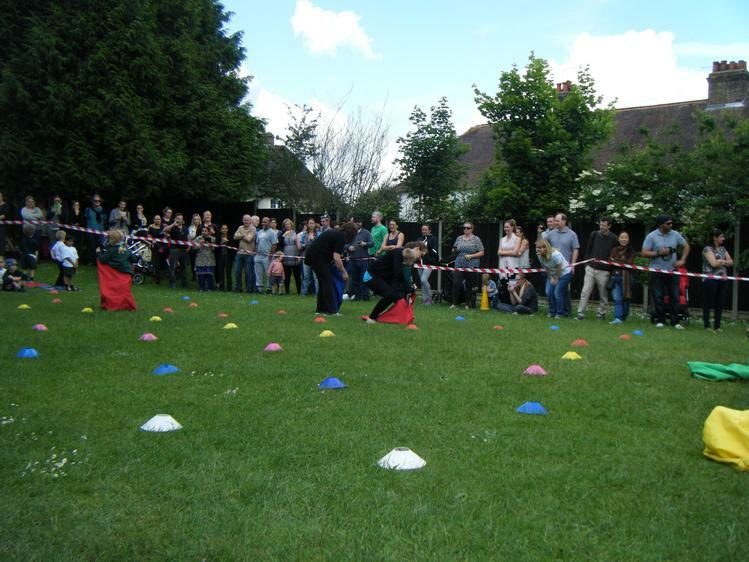 They took part in scooter races, skipping, basketball, balloon games and even a penalty shoot-out against Mr Wilson! 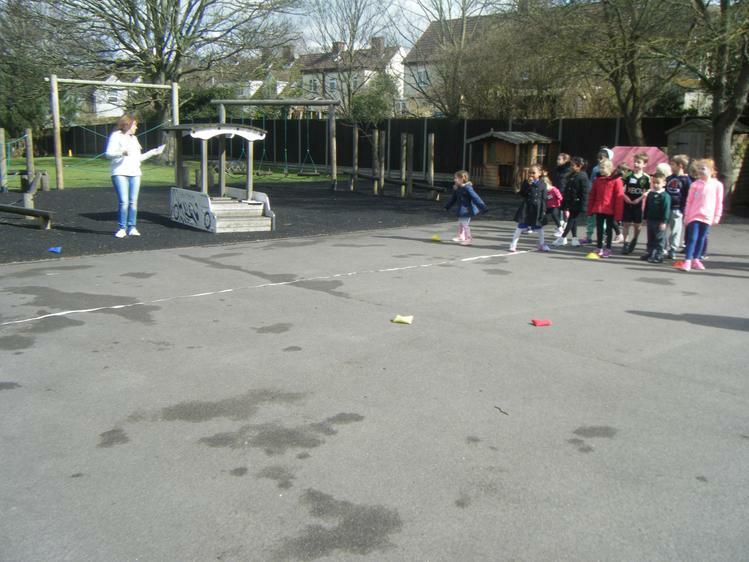 The children had lots of fun and we were very proud to give out lots of awards for good sportsmanship at the end of the day. 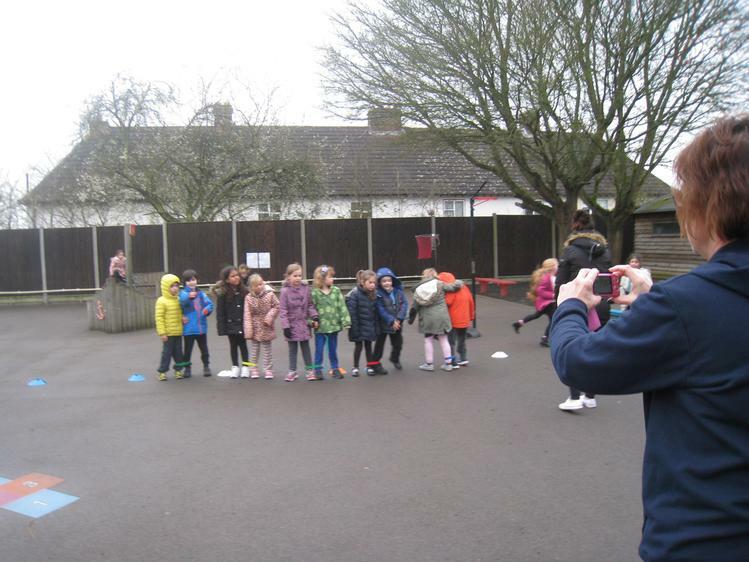 We would like to say a big ‘Thank You!’ to the School Council for all of their activity ideas and to Mr Wilson for being a great goalie! 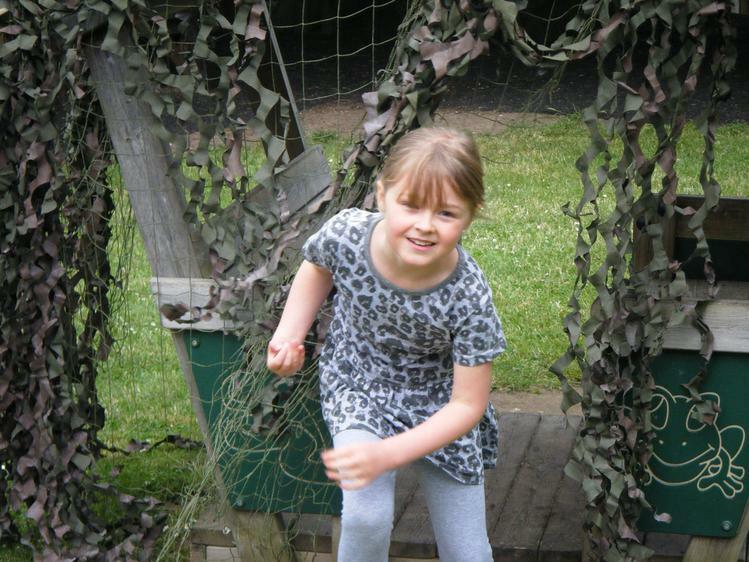 We had a great time taking part in Camo Day raising money for the SSAFA. 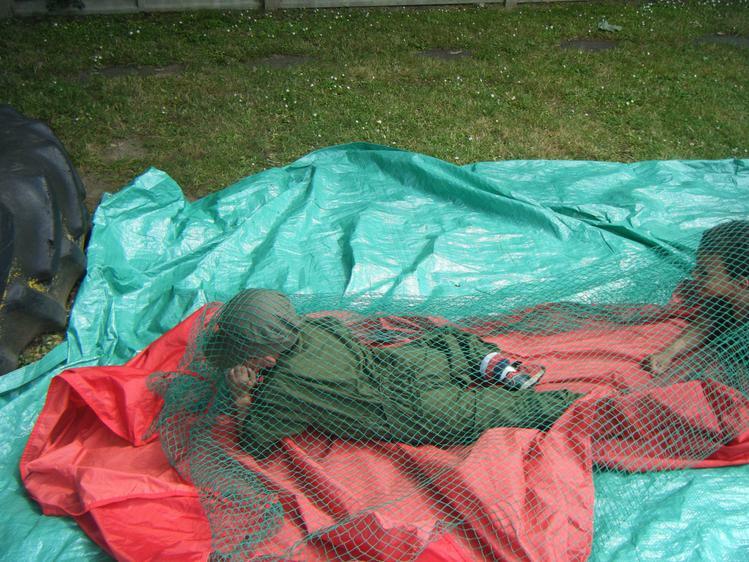 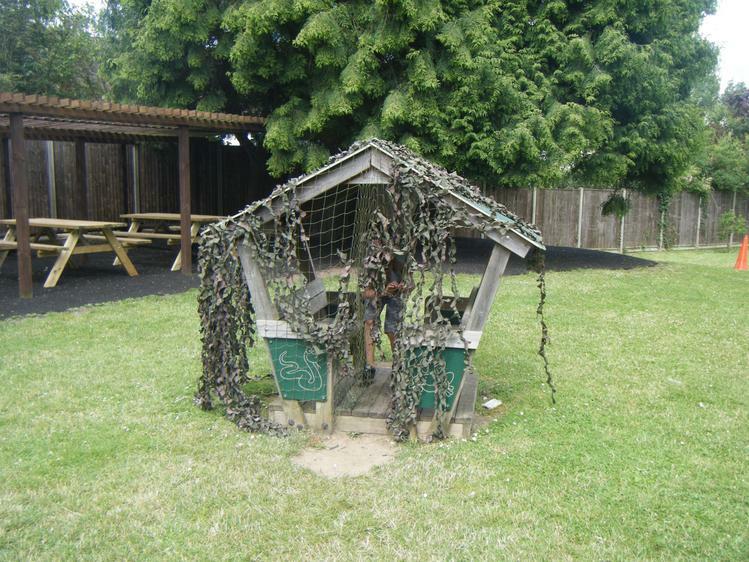 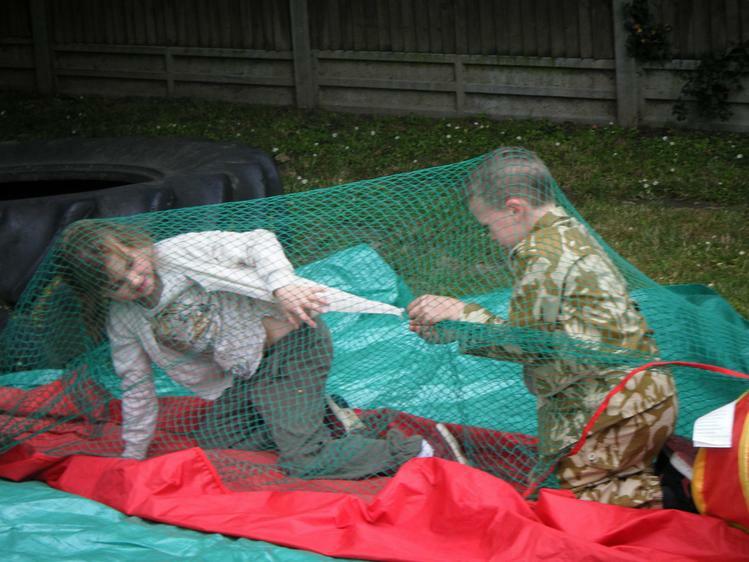 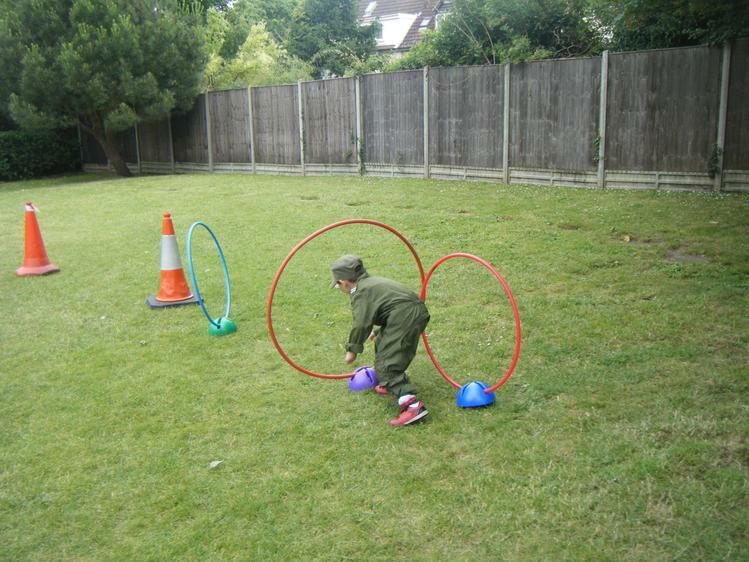 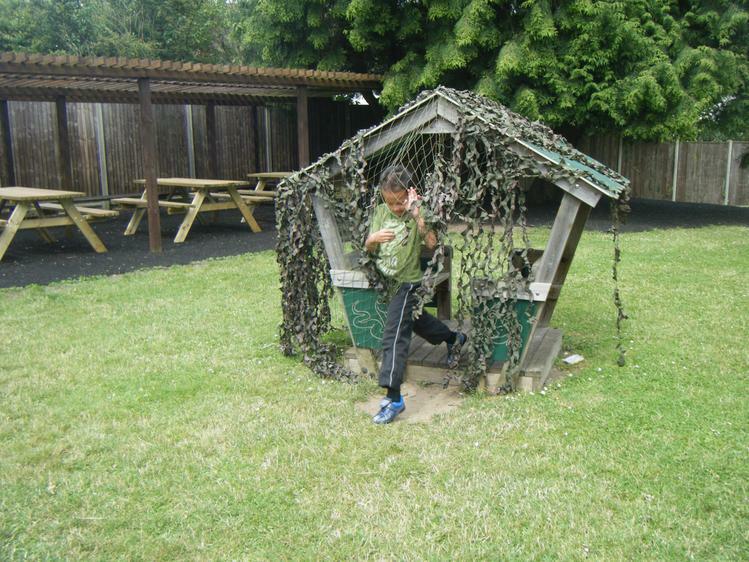 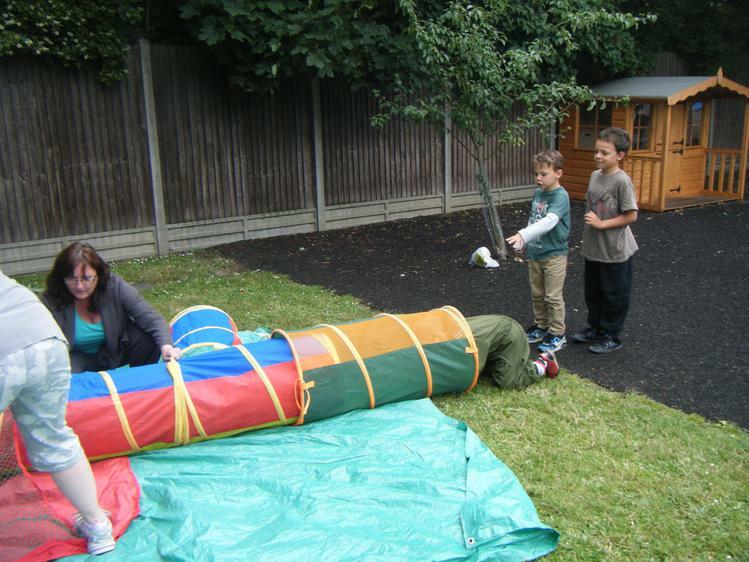 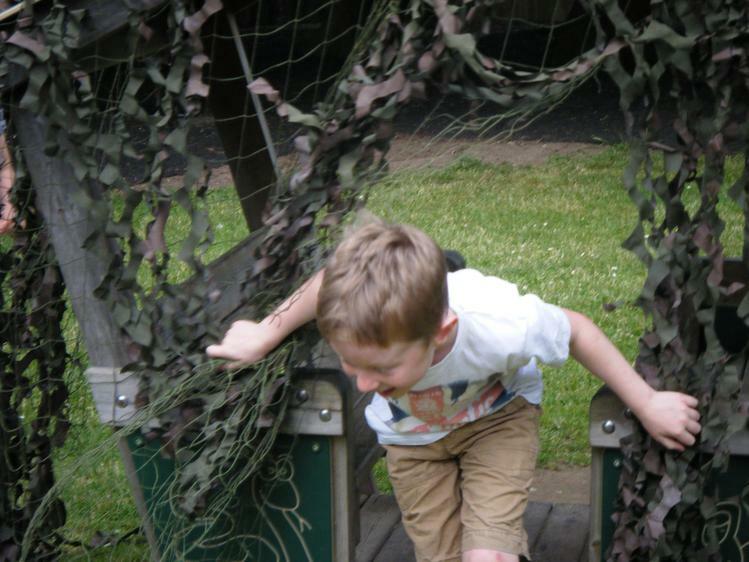 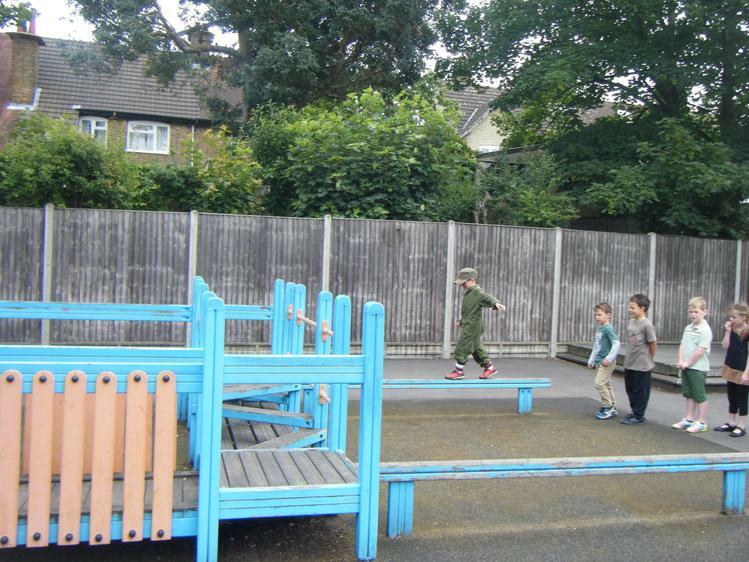 The children looked fantastic in their army colours and had lots of fun completing the Hillshott army assault course! 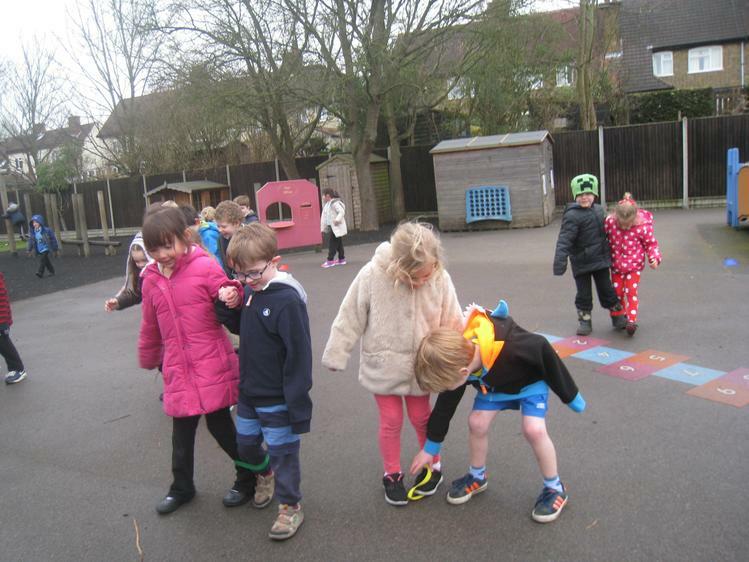 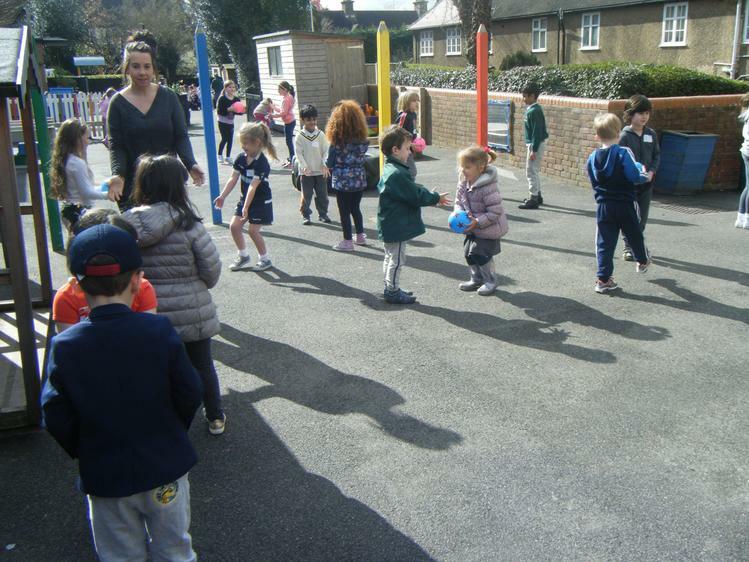 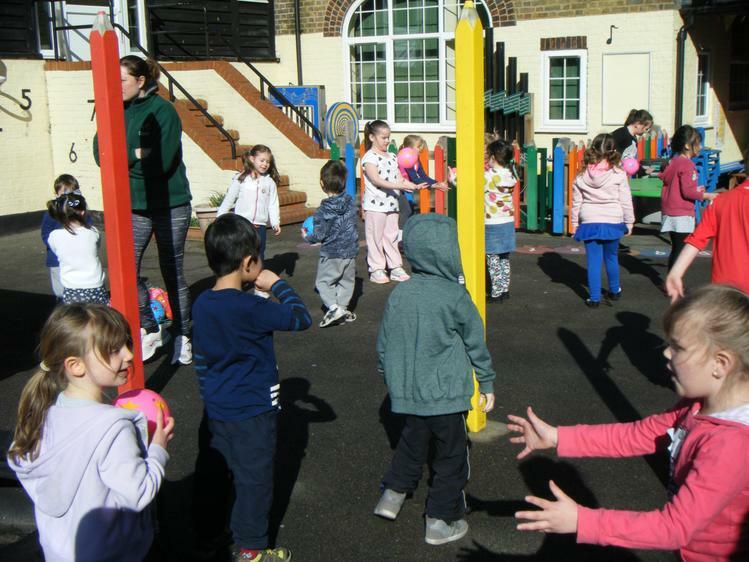 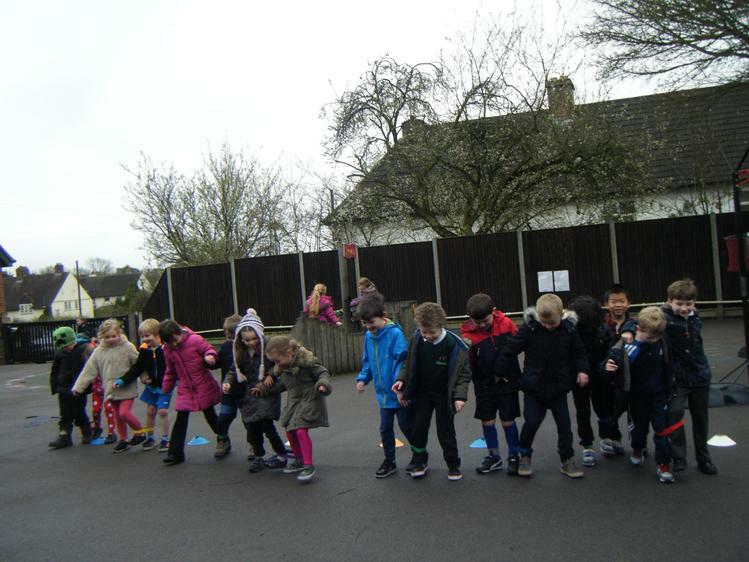 The sound of stamping feet and chanting could be heard as everyone marched around the school in lines and the grown-ups had lots of fun using whistles to give instructions! 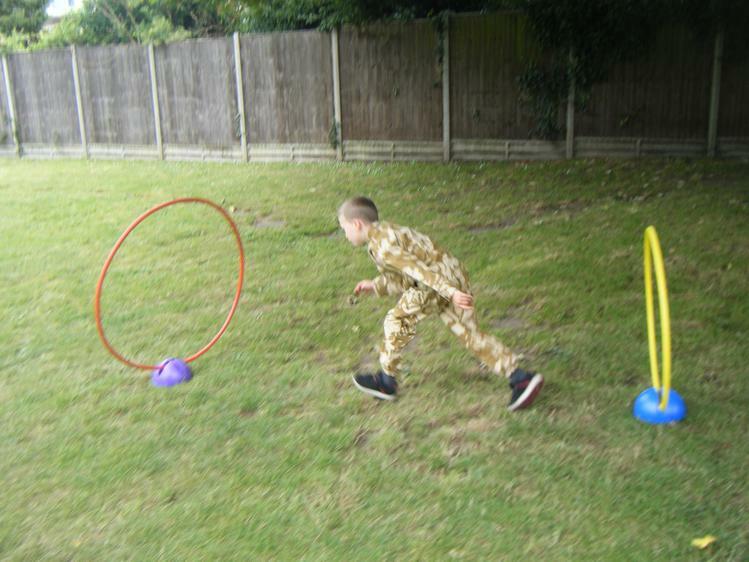 In total we raised £204 for the Armed Forces and their families, thank you to everyone who kindly donated money!